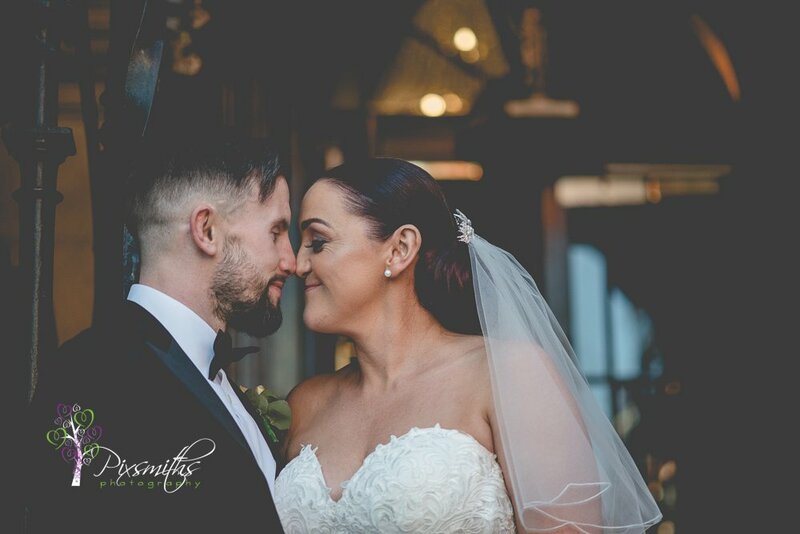 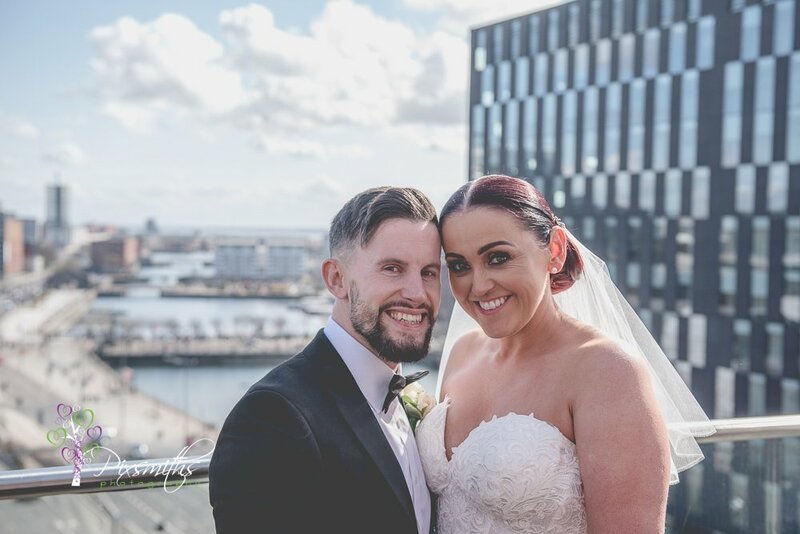 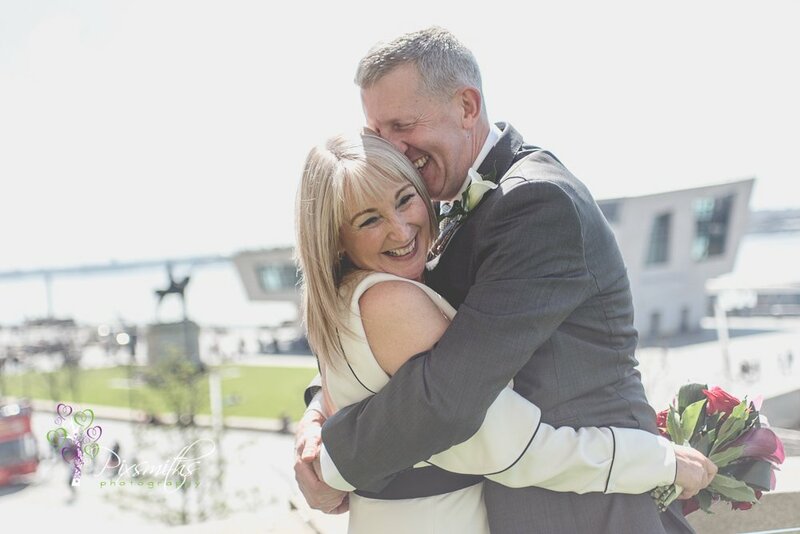 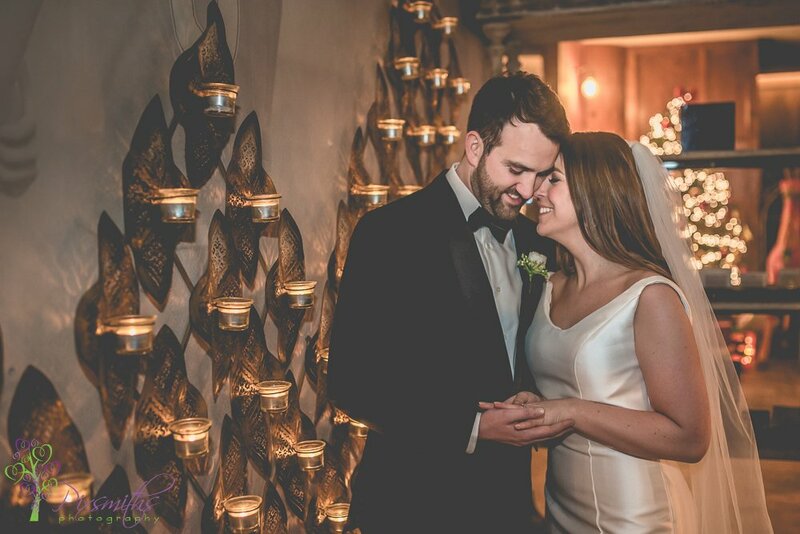 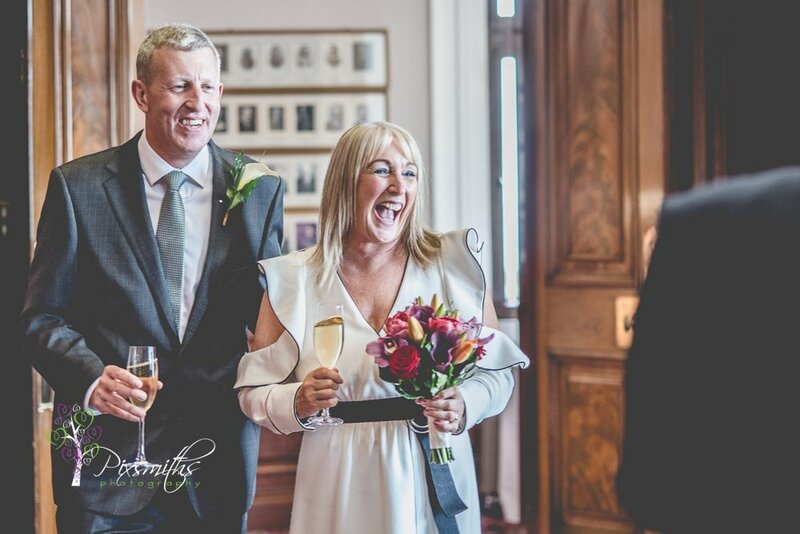 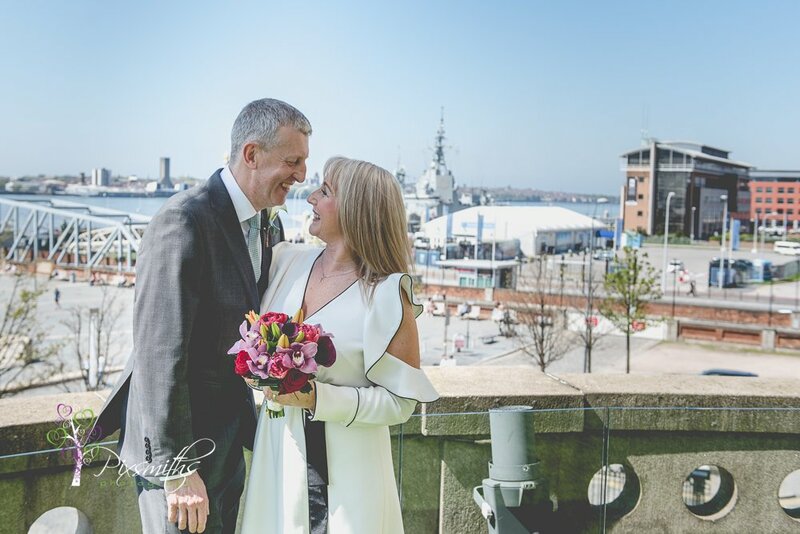 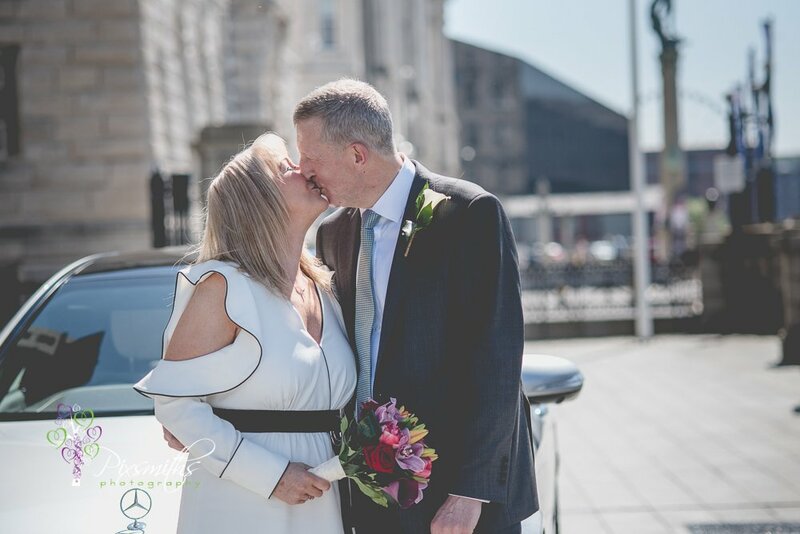 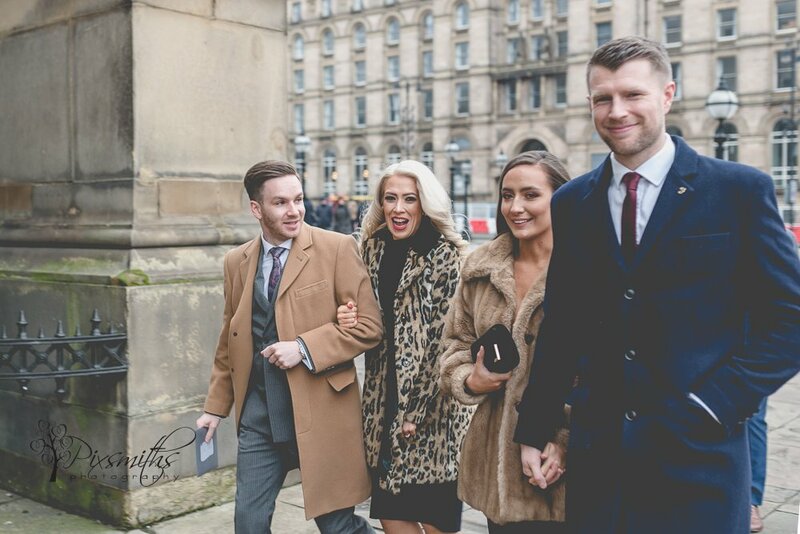 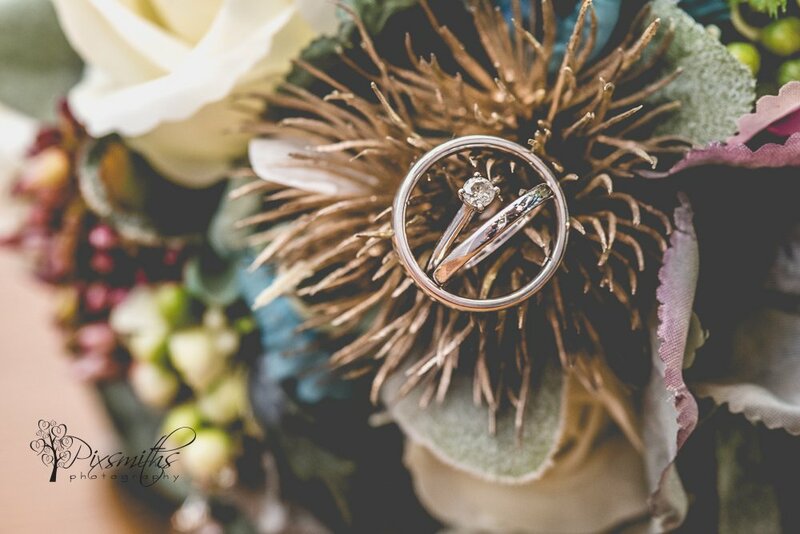 As Liverpool wedding photographers it was a delight to start our 2019 wedding season in Liverpool with Claire and Jamie for their winter Liverpool wedding. 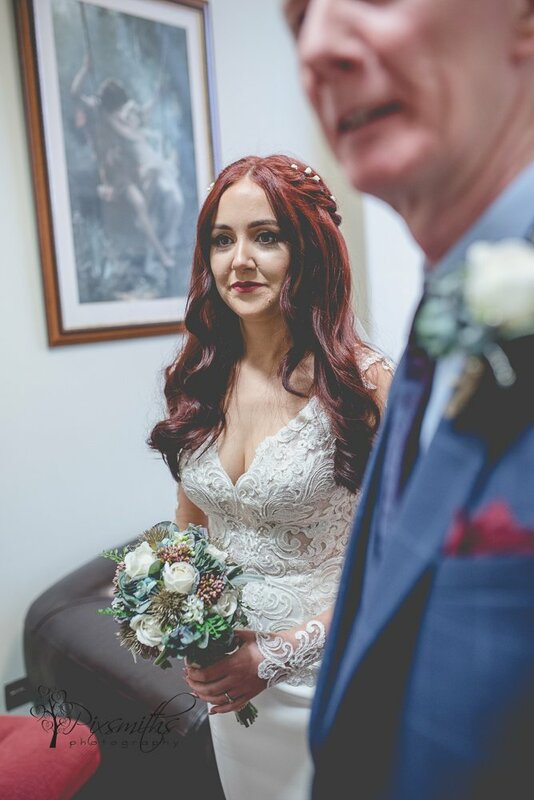 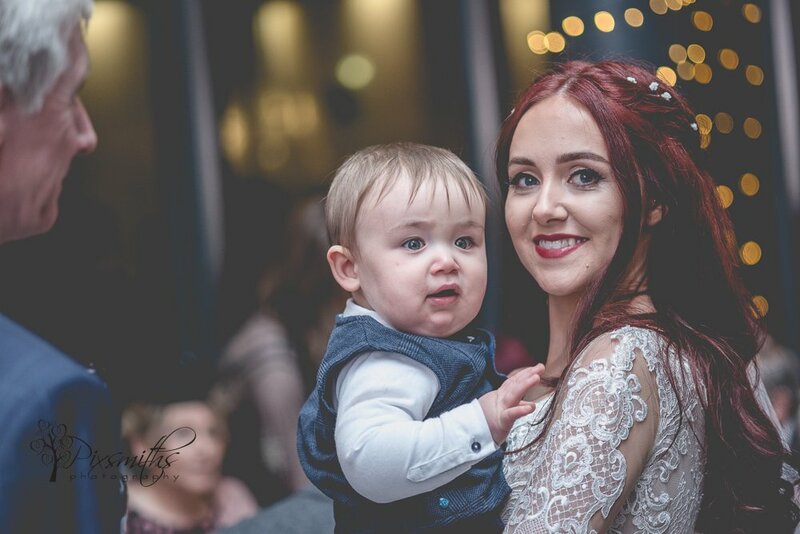 Claire looked absolutely stunning her red hair beautifully braided and adorned with diamante pins and combs. 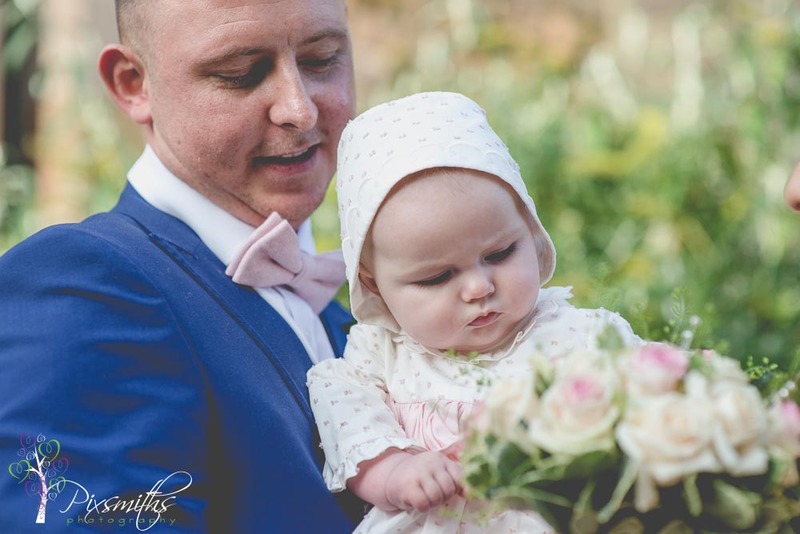 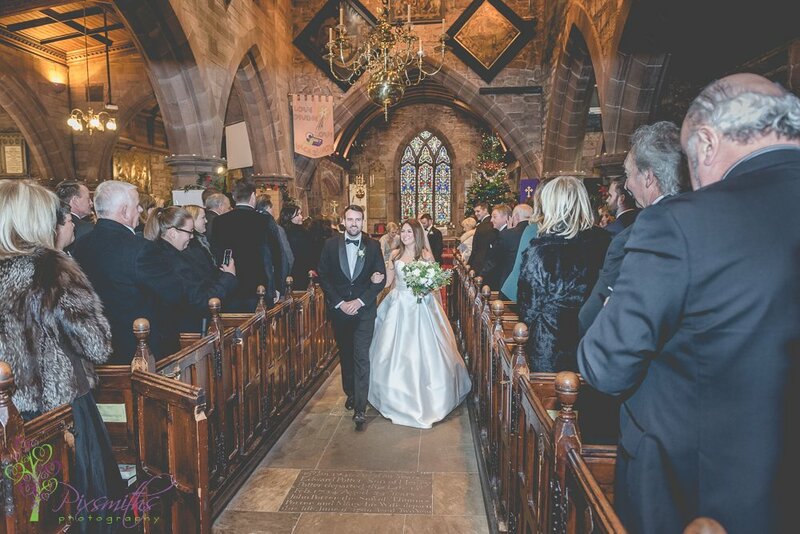 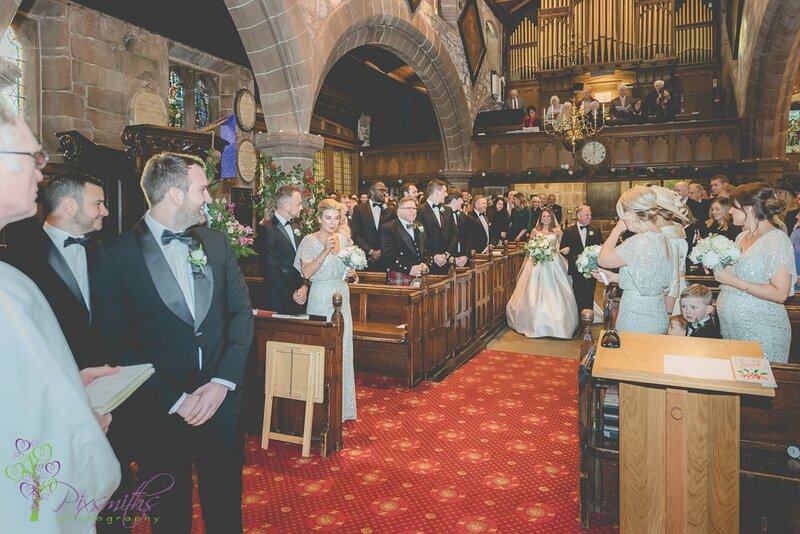 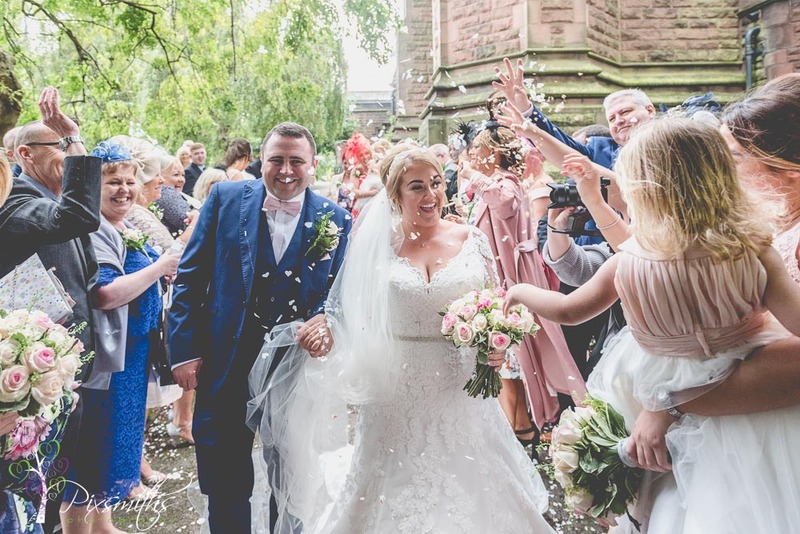 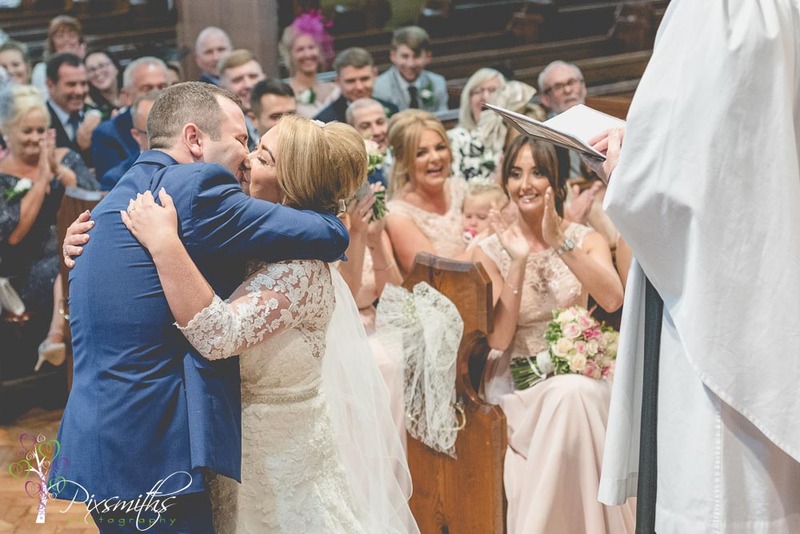 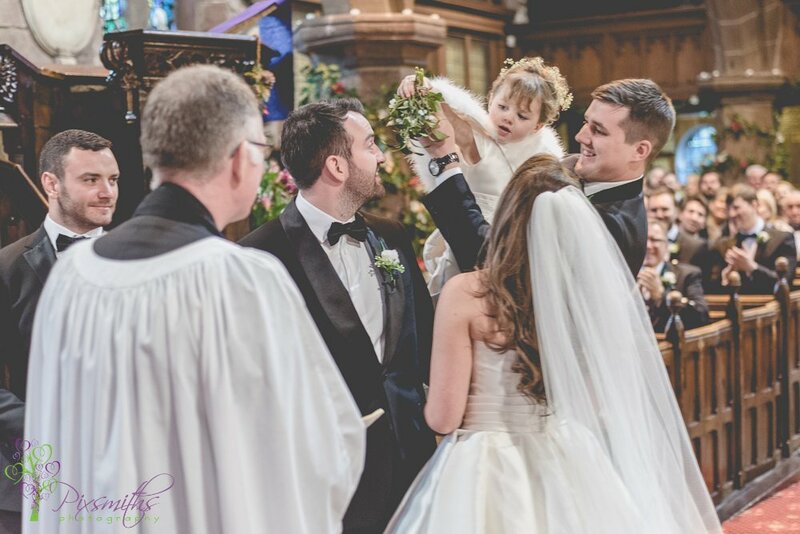 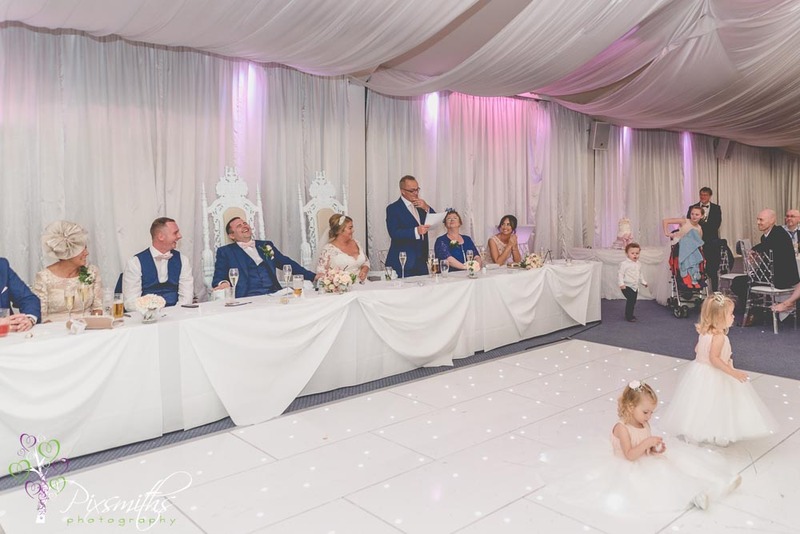 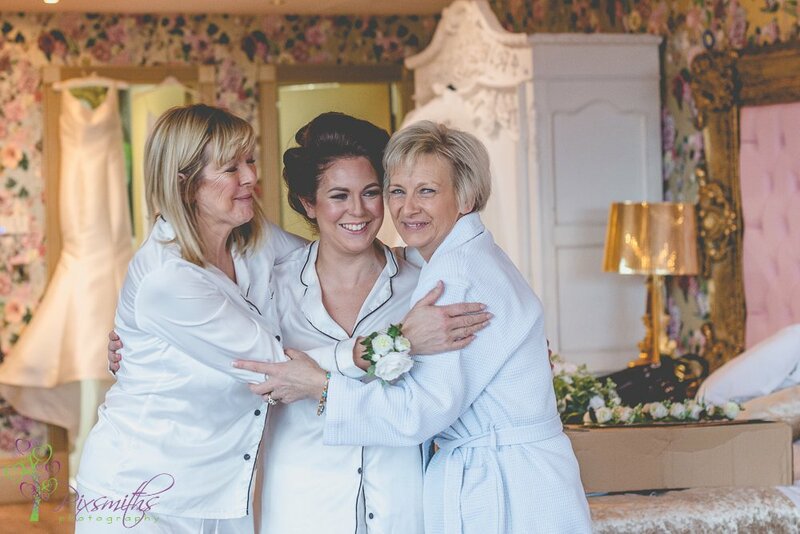 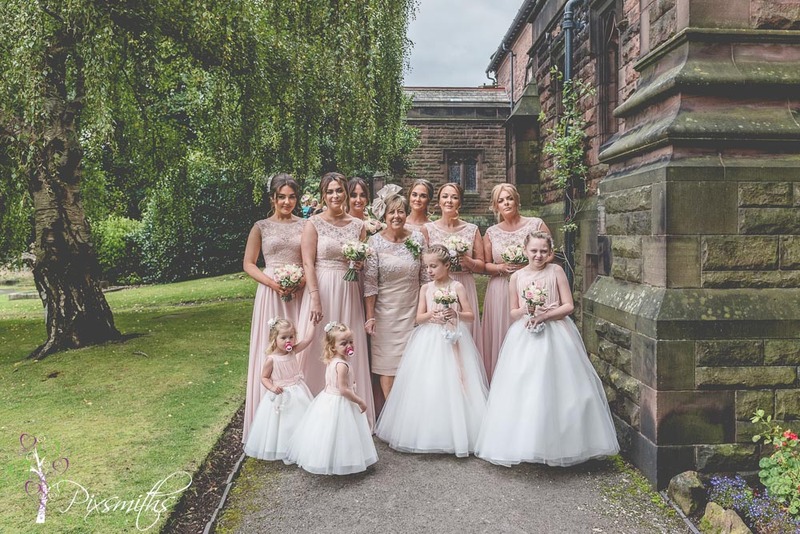 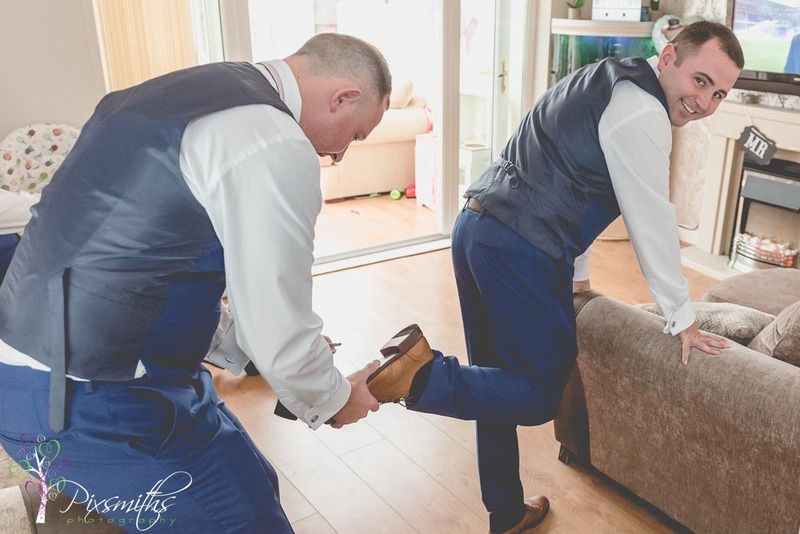 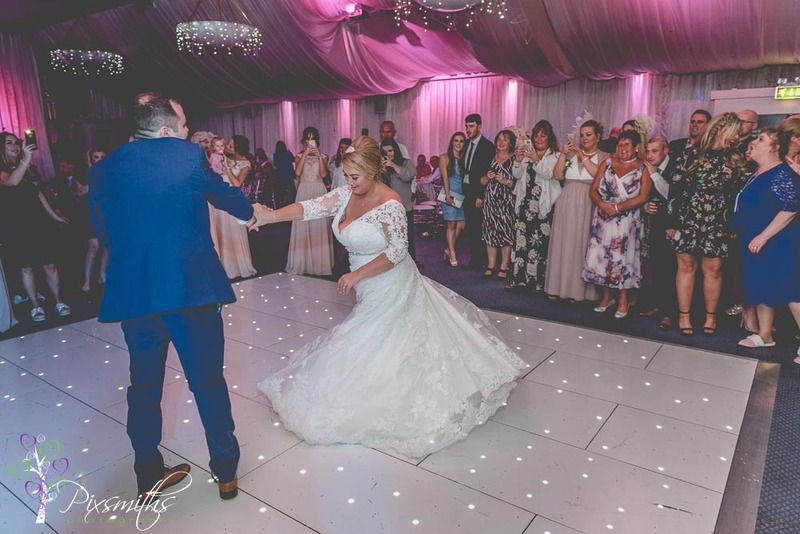 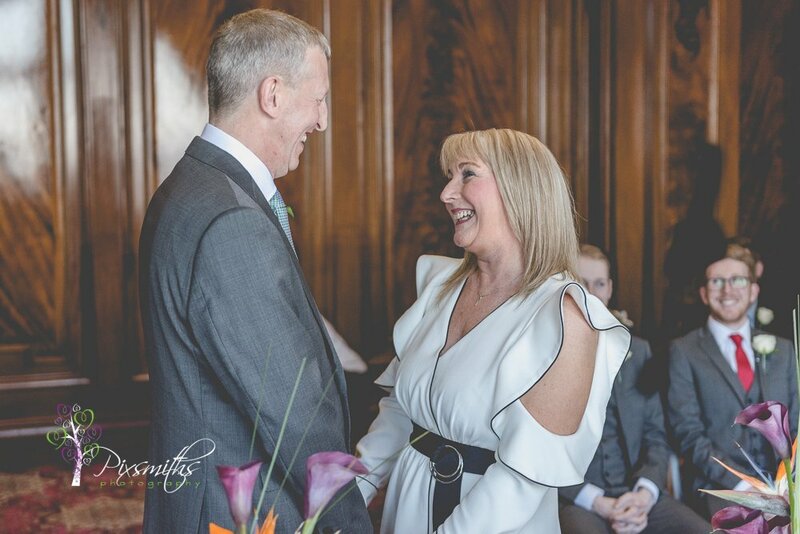 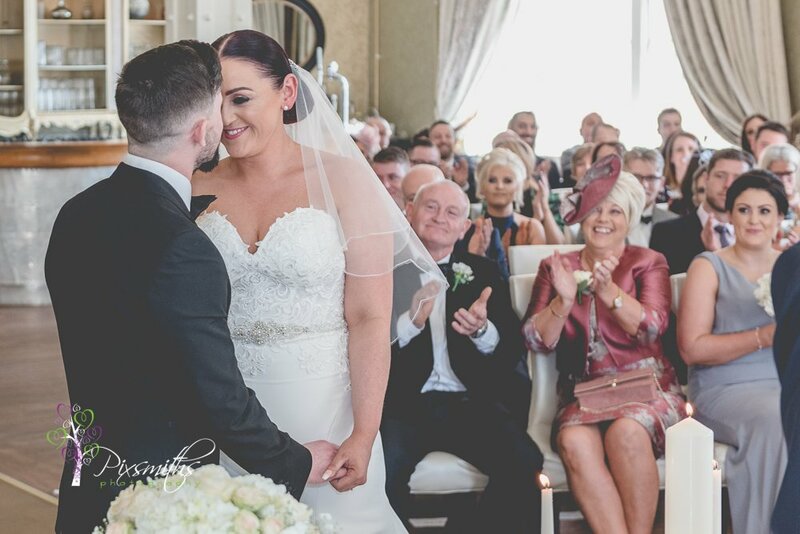 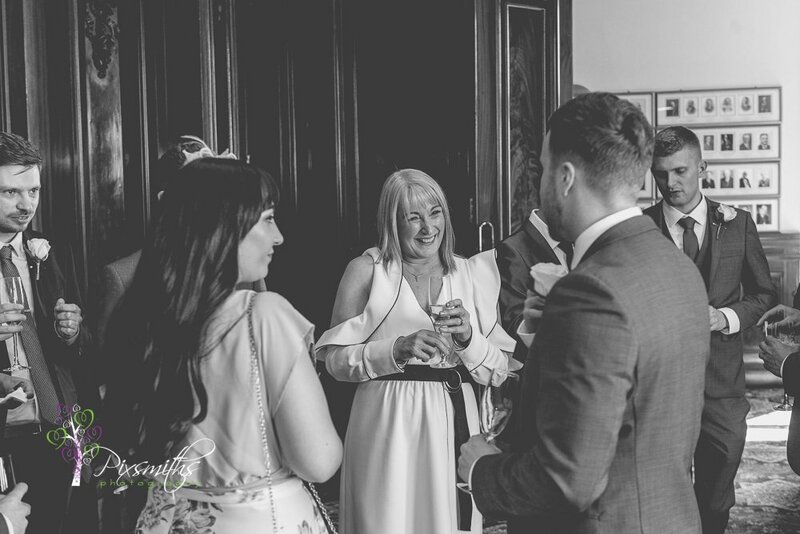 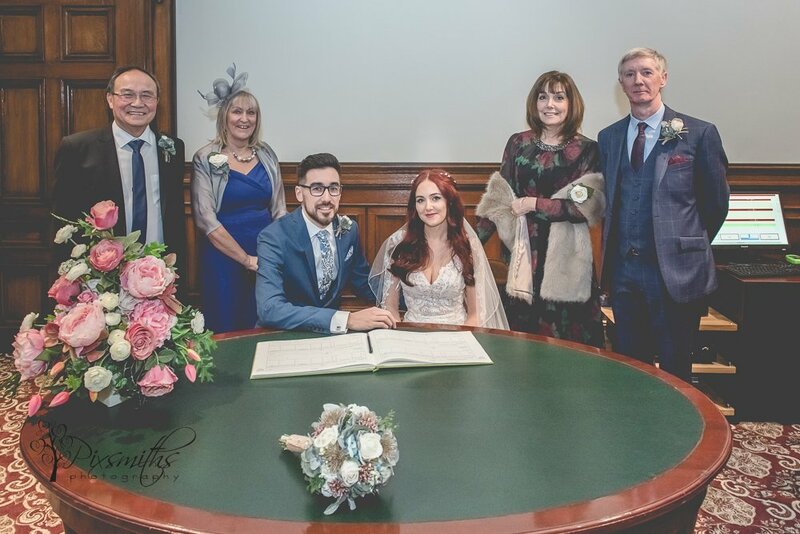 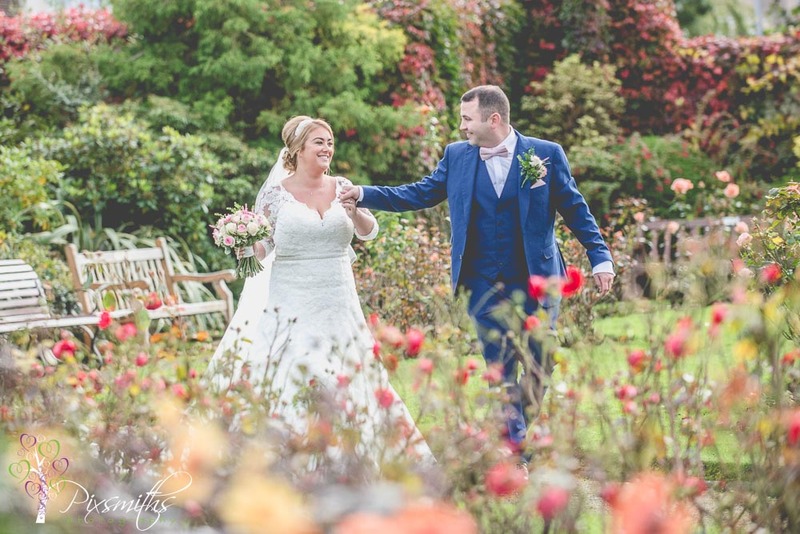 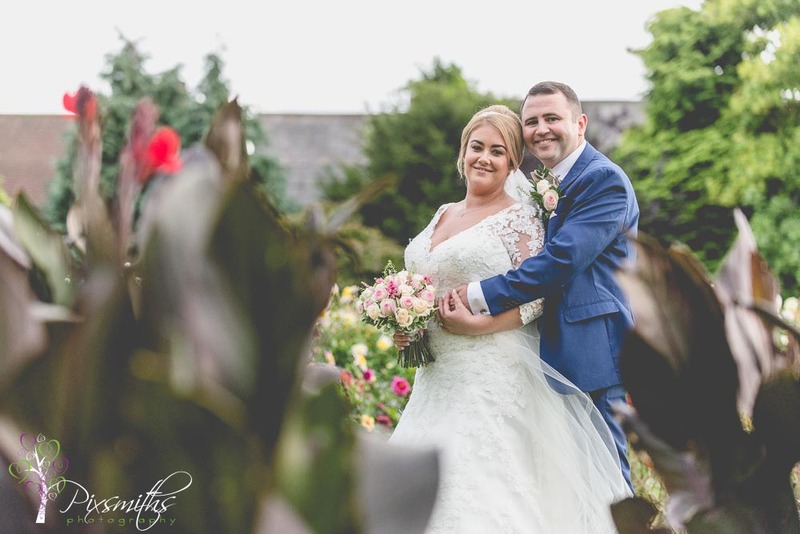 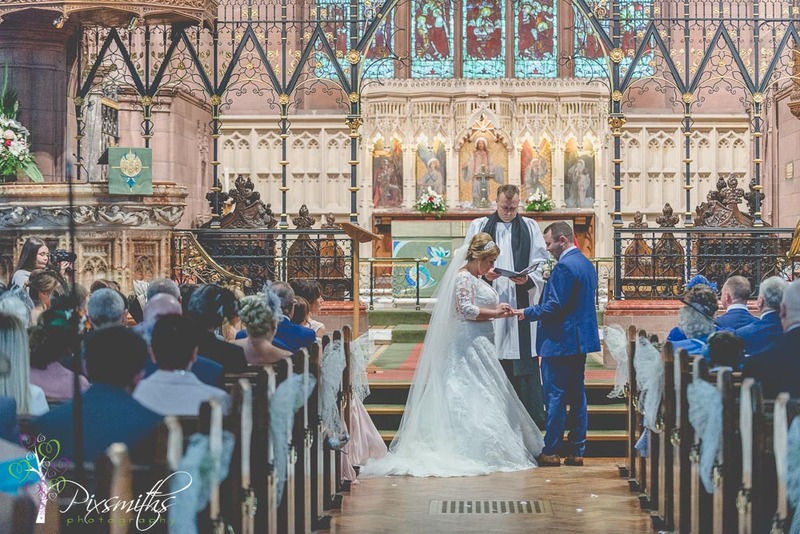 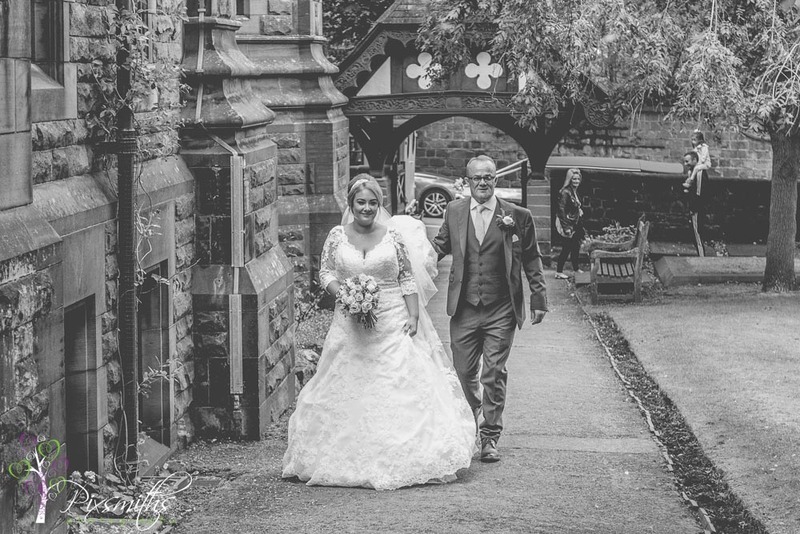 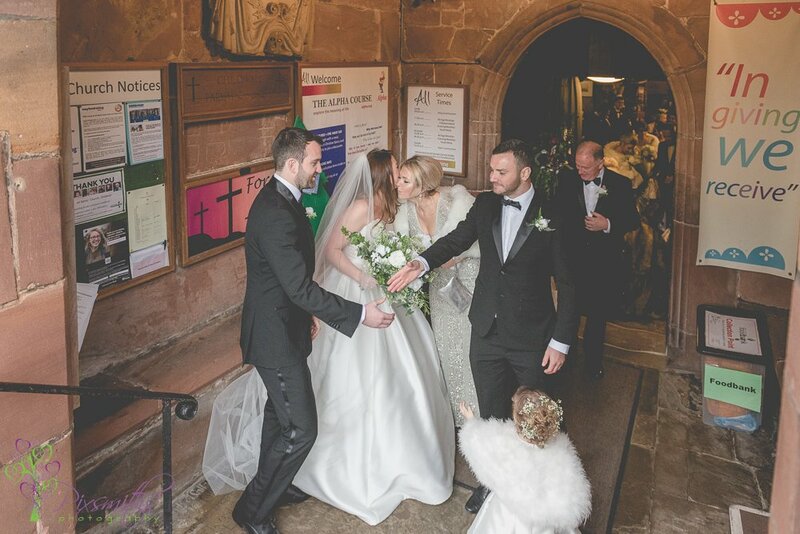 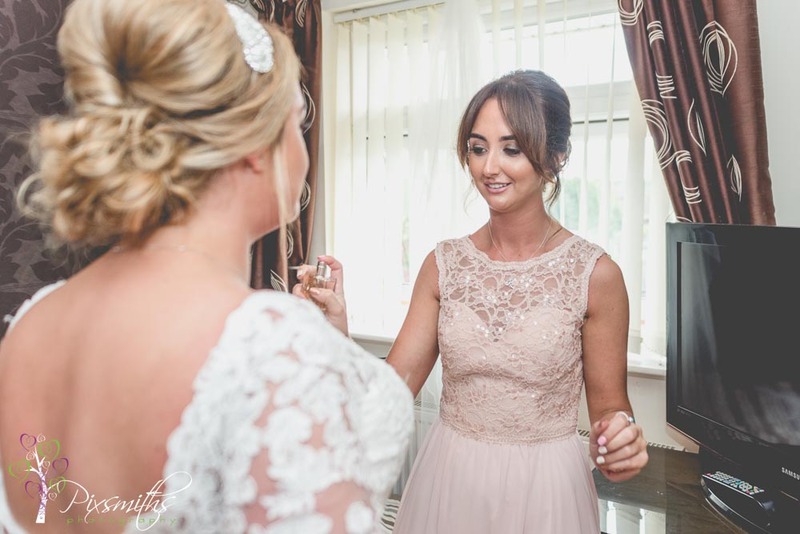 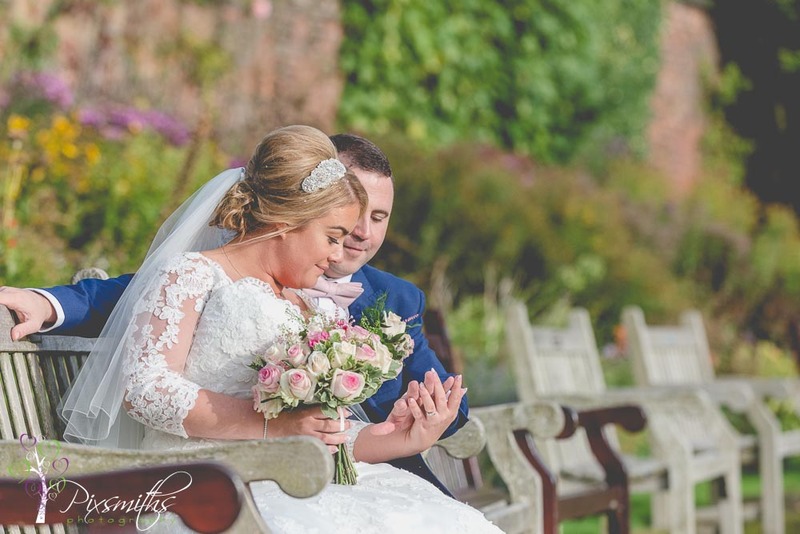 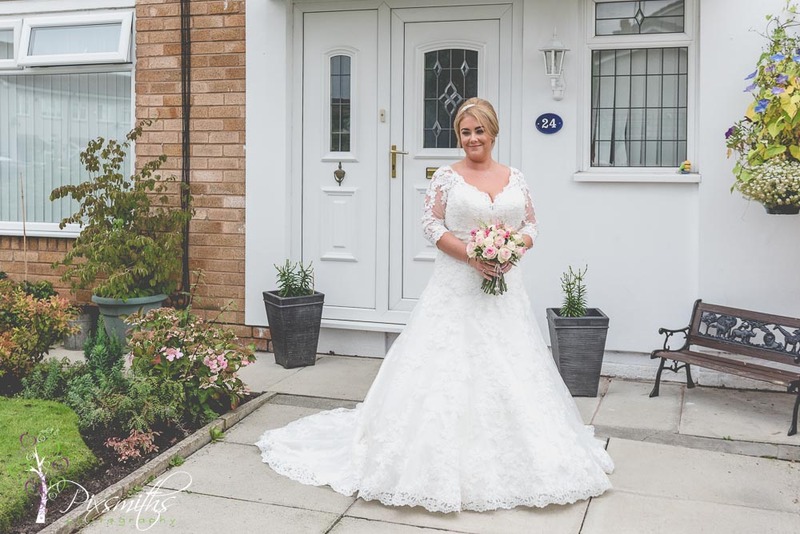 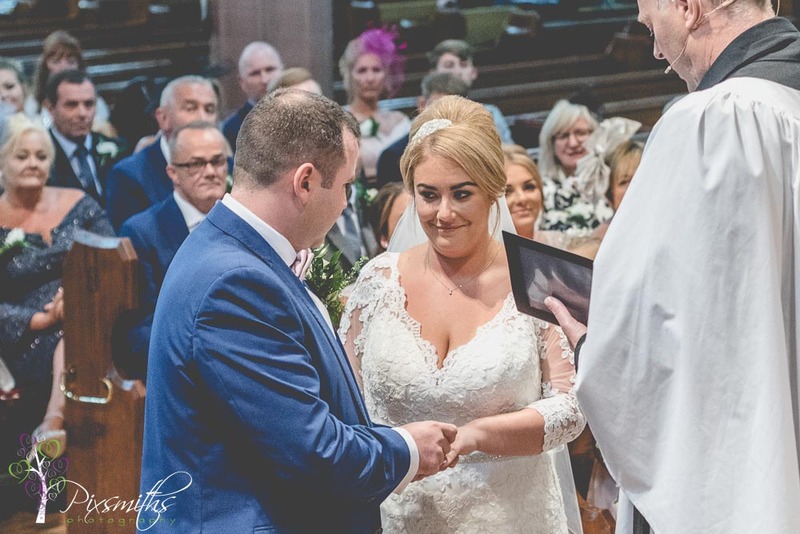 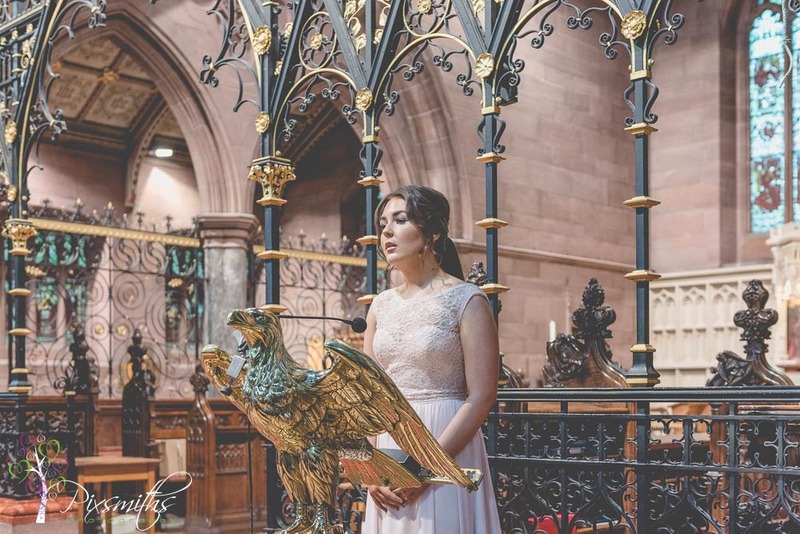 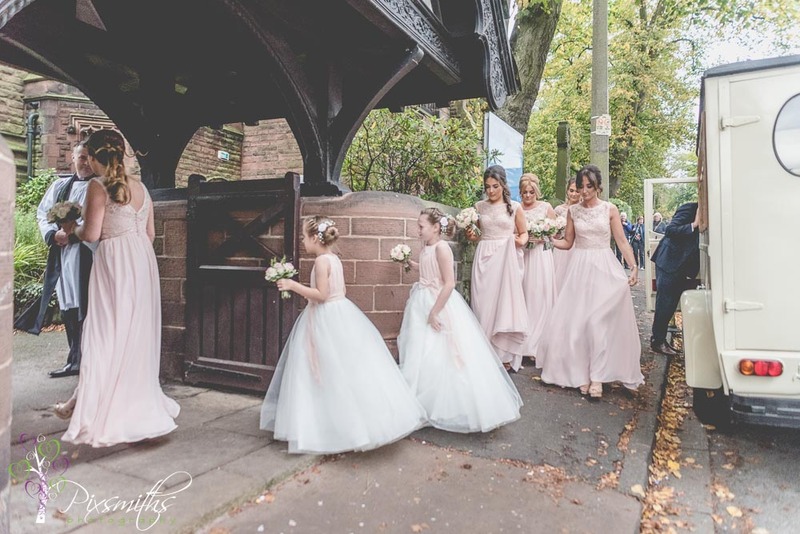 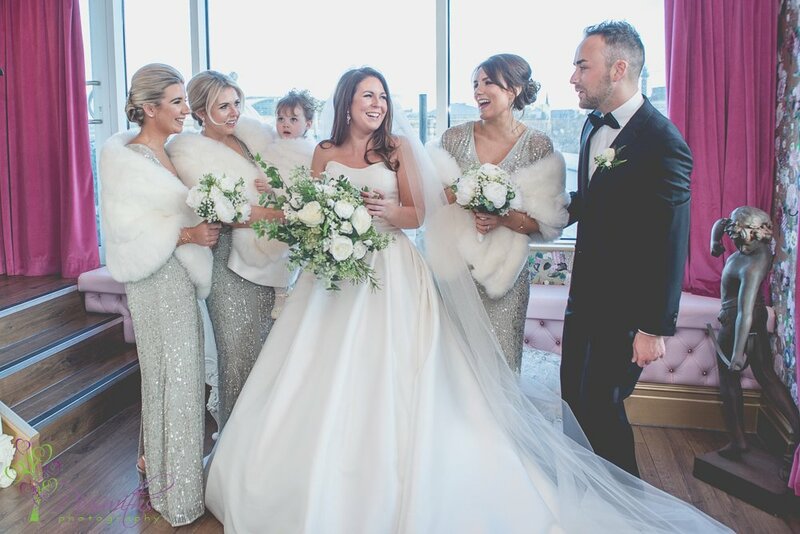 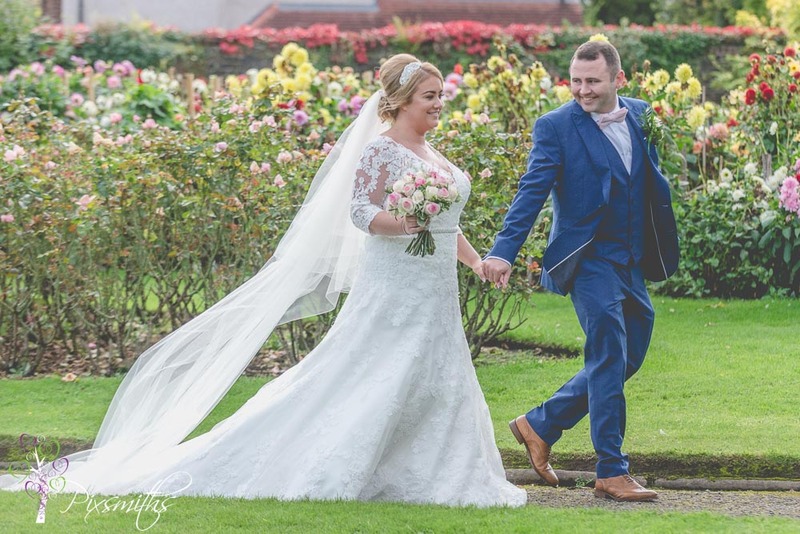 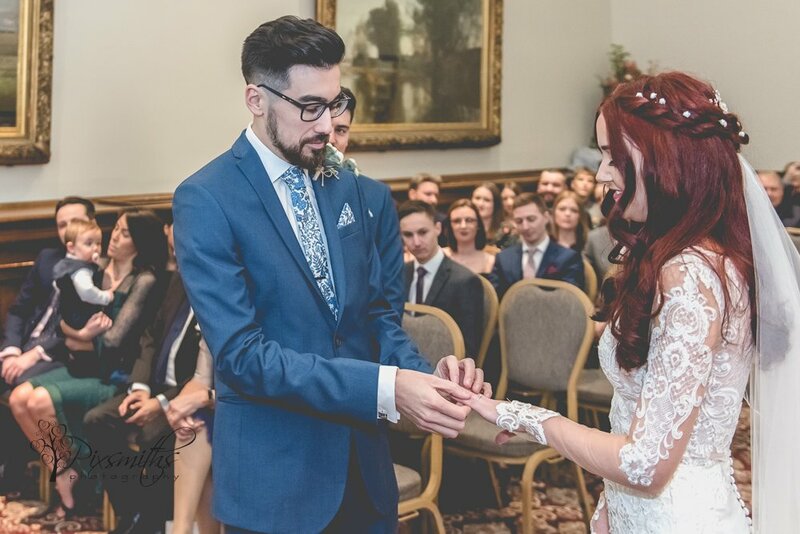 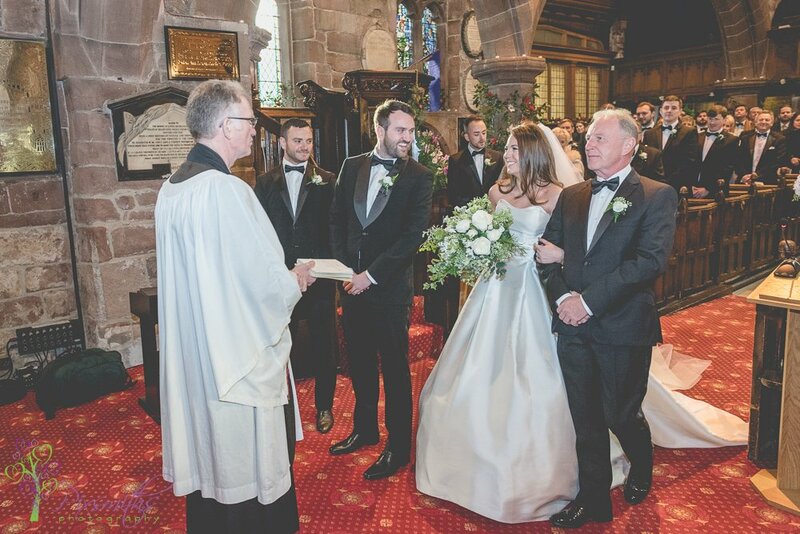 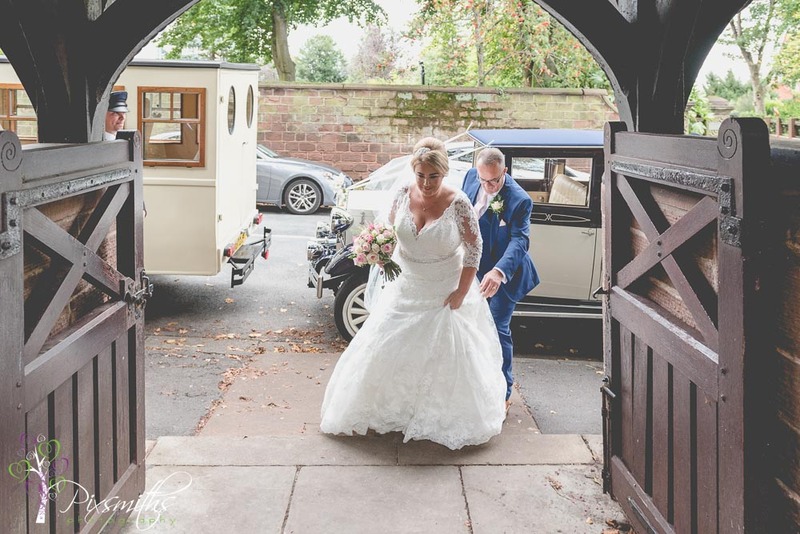 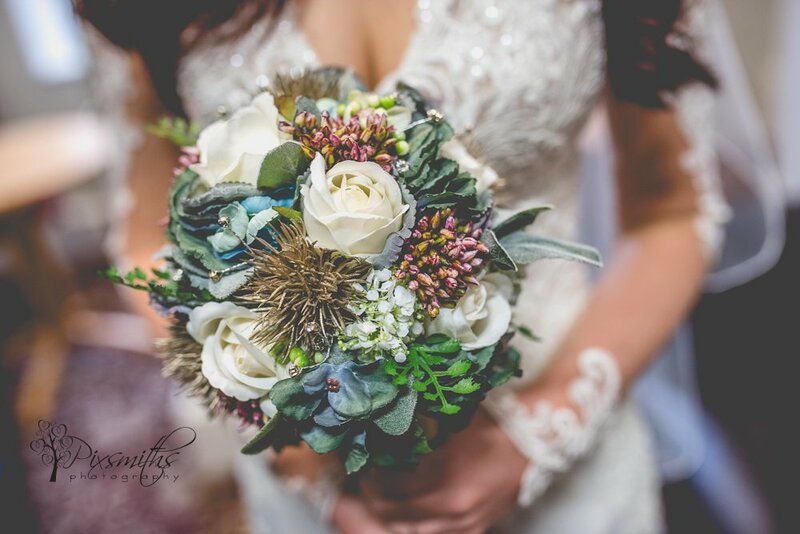 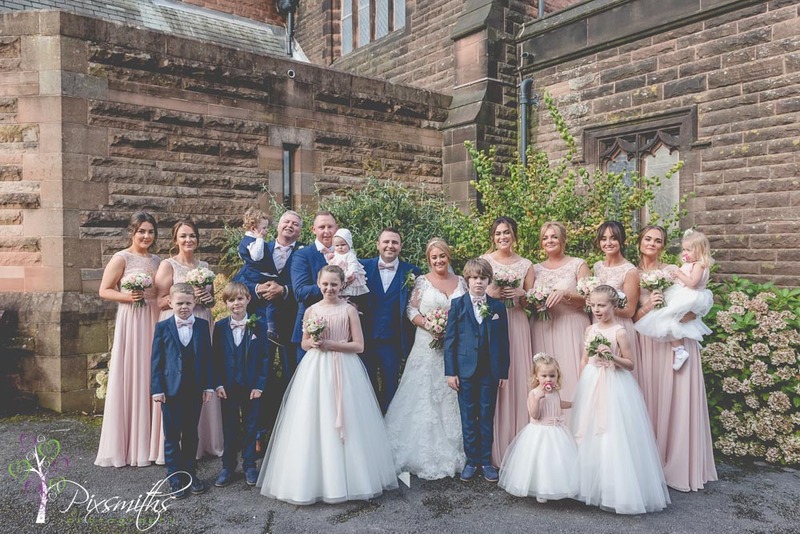 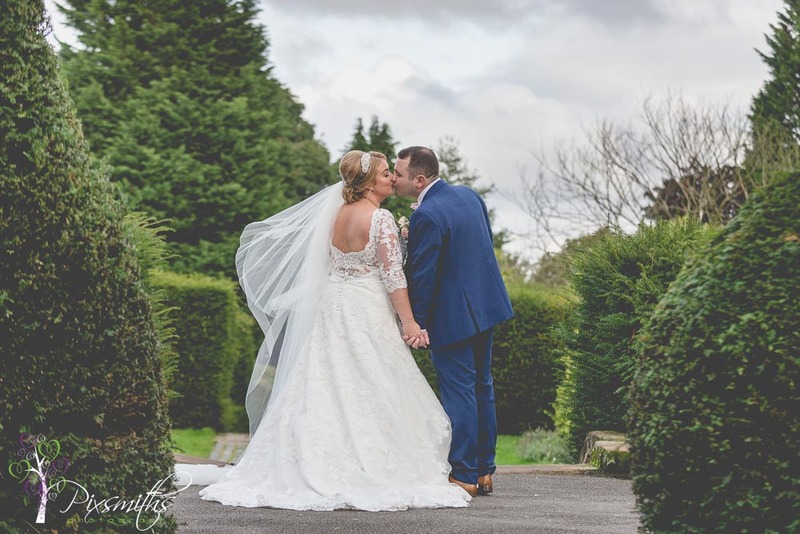 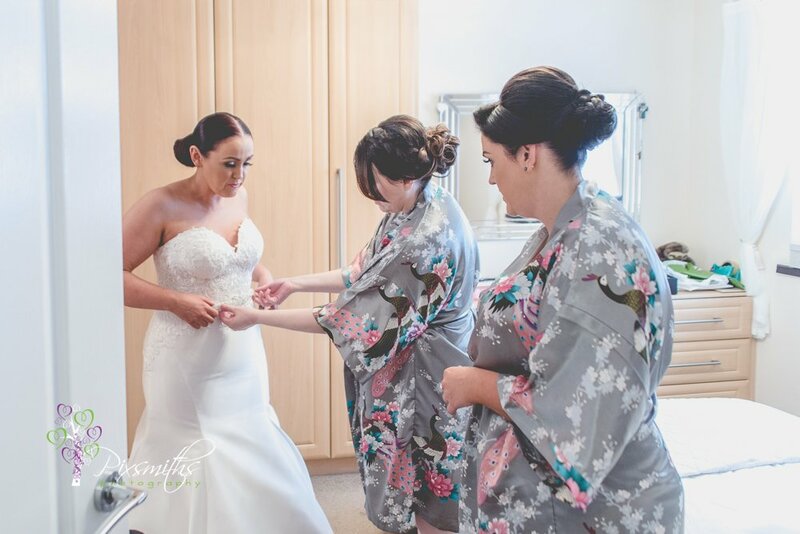 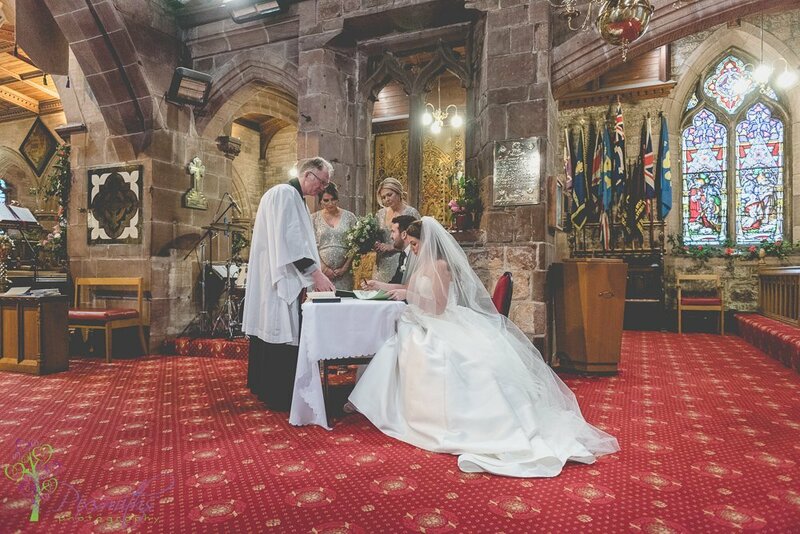 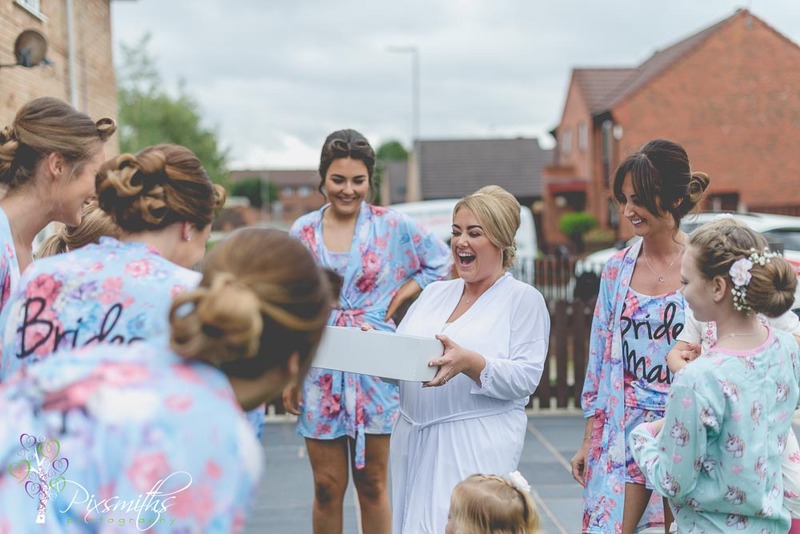 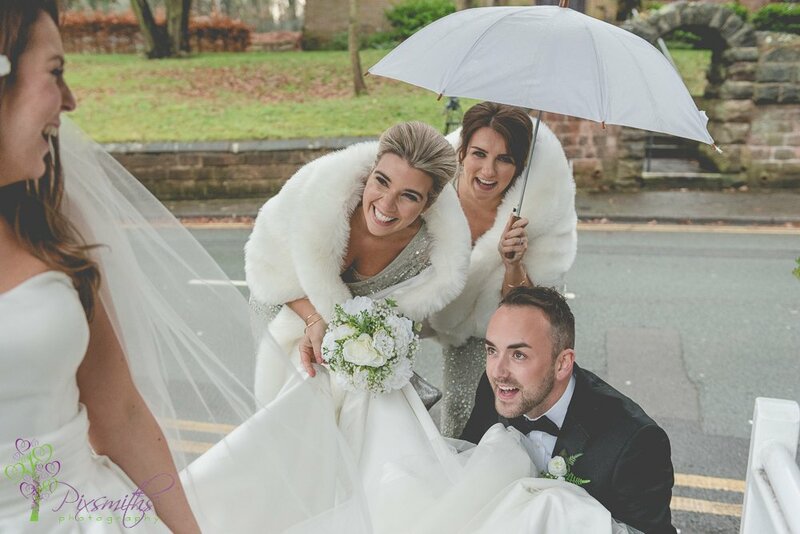 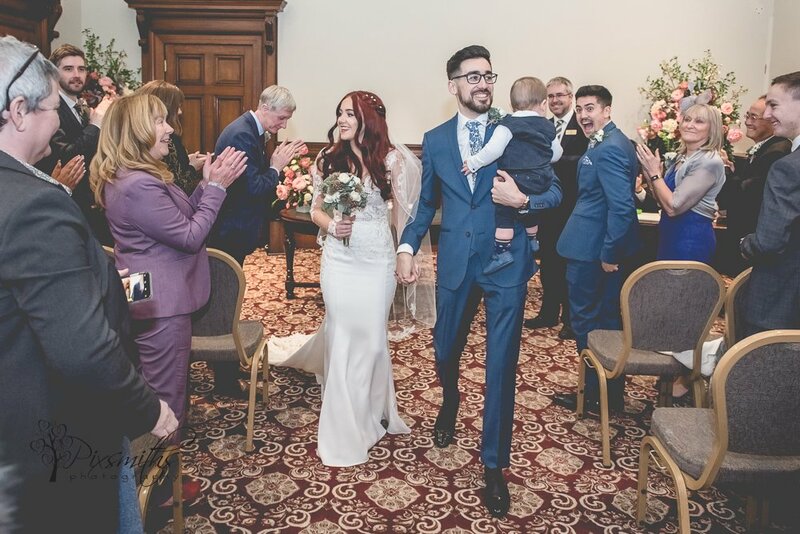 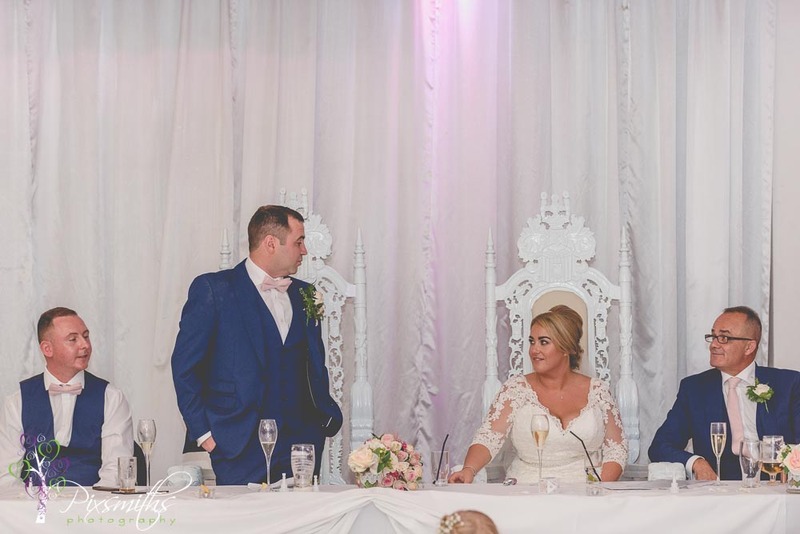 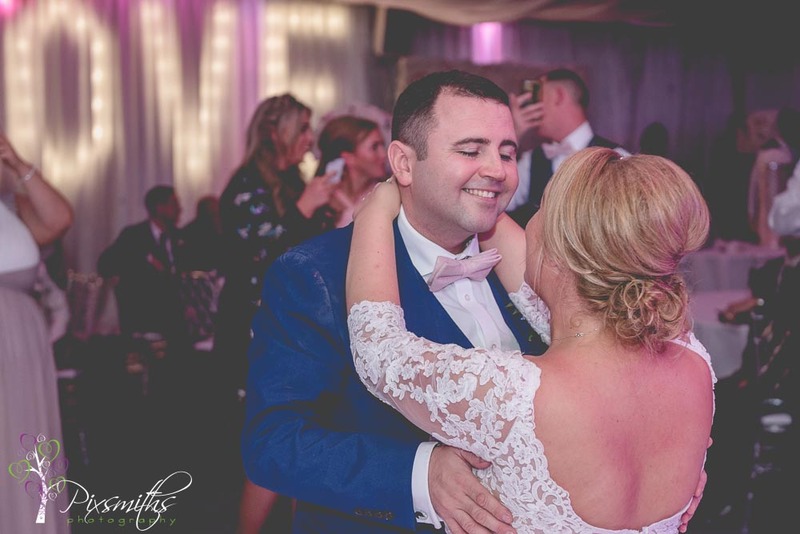 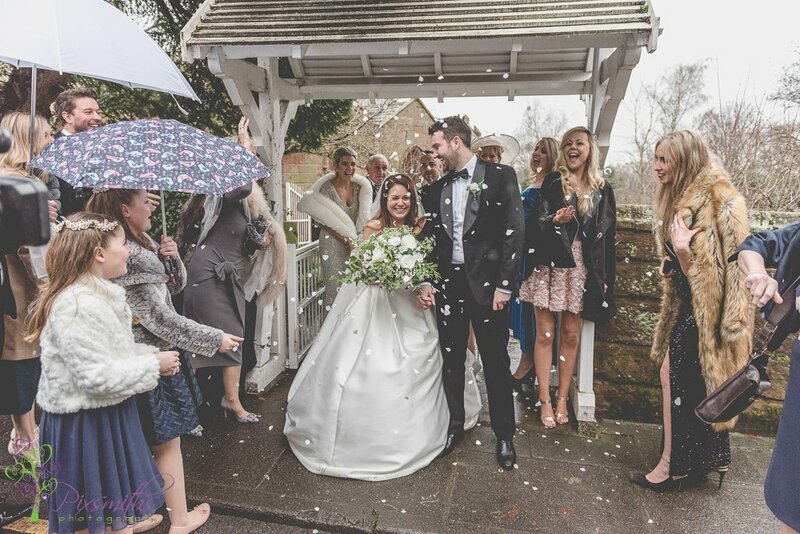 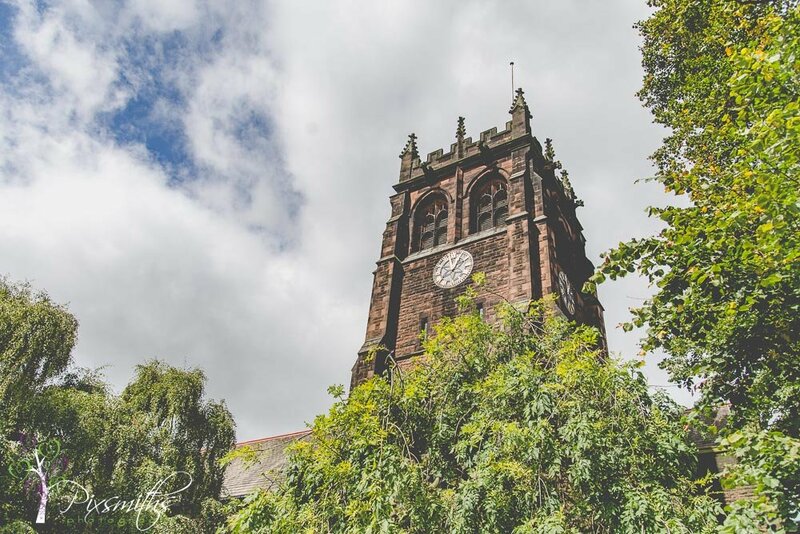 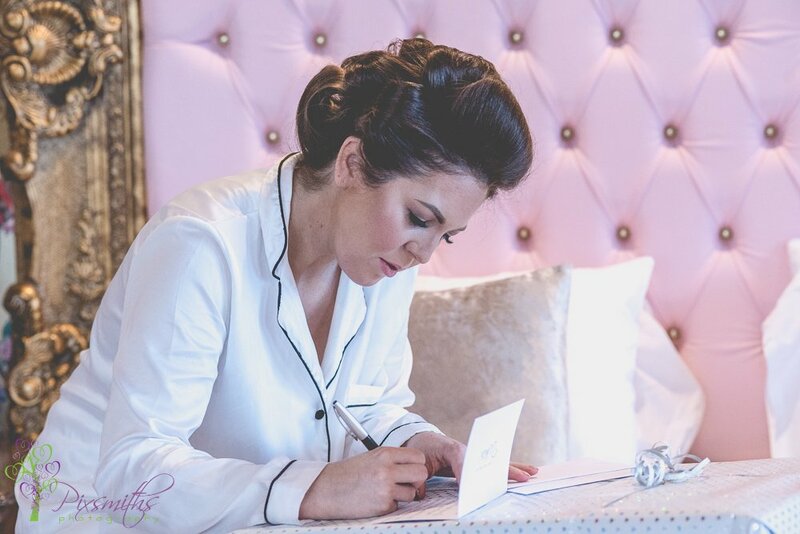 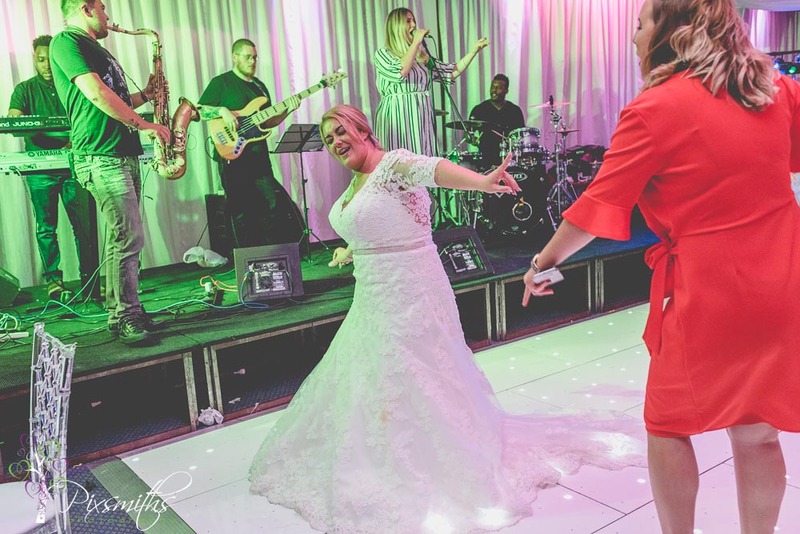 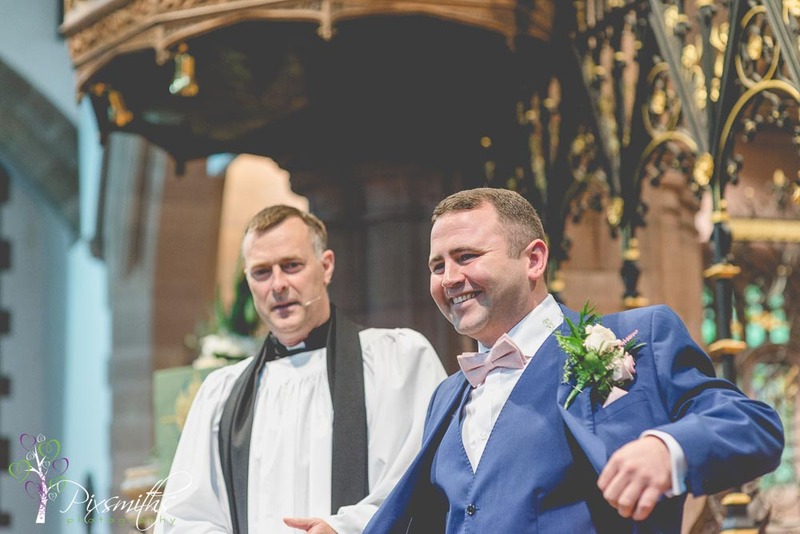 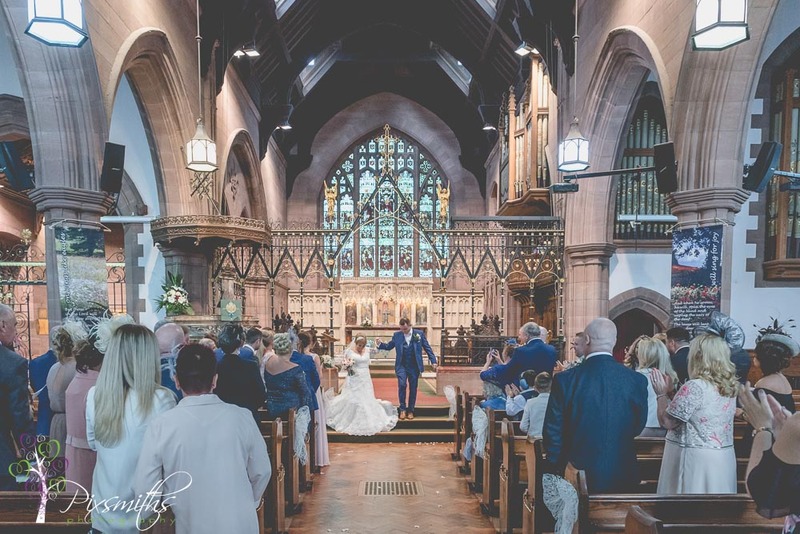 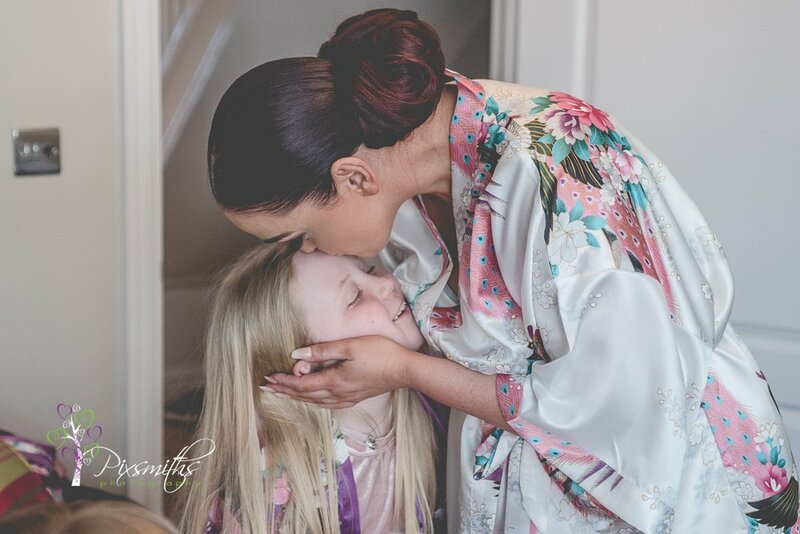 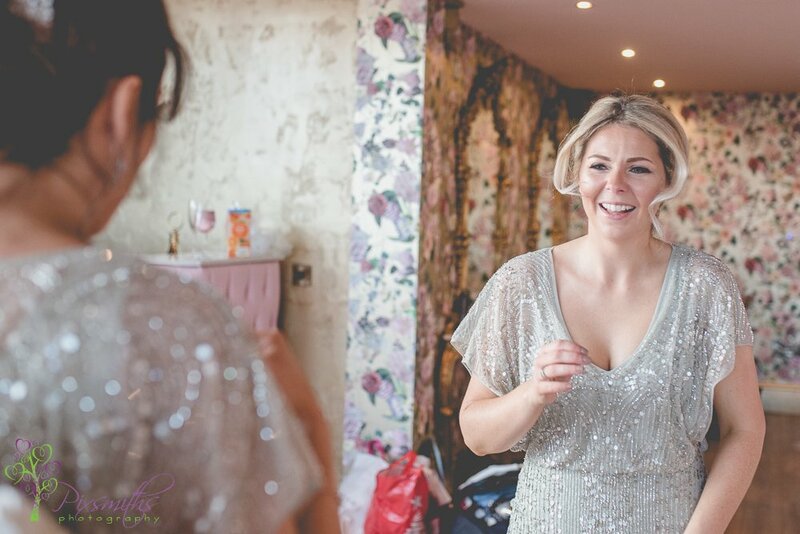 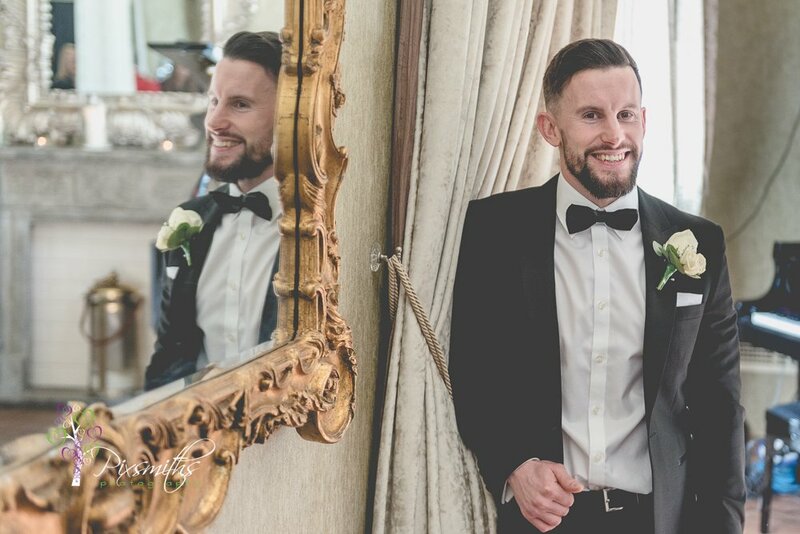 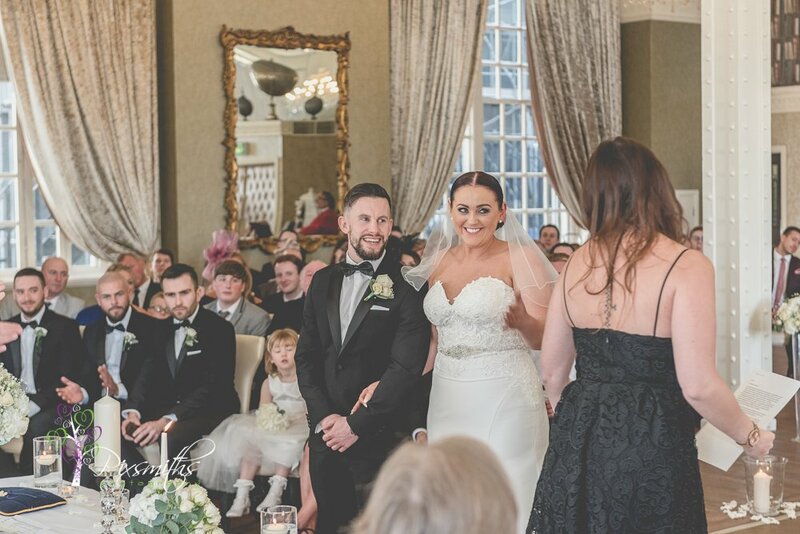 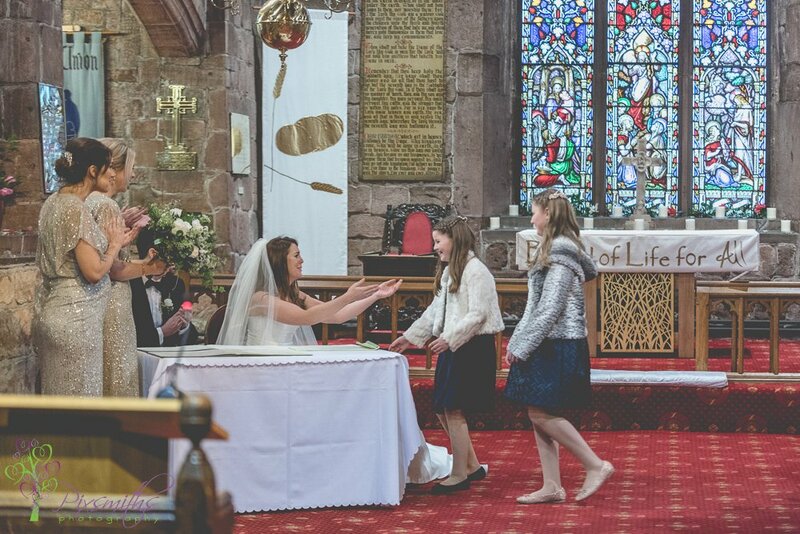 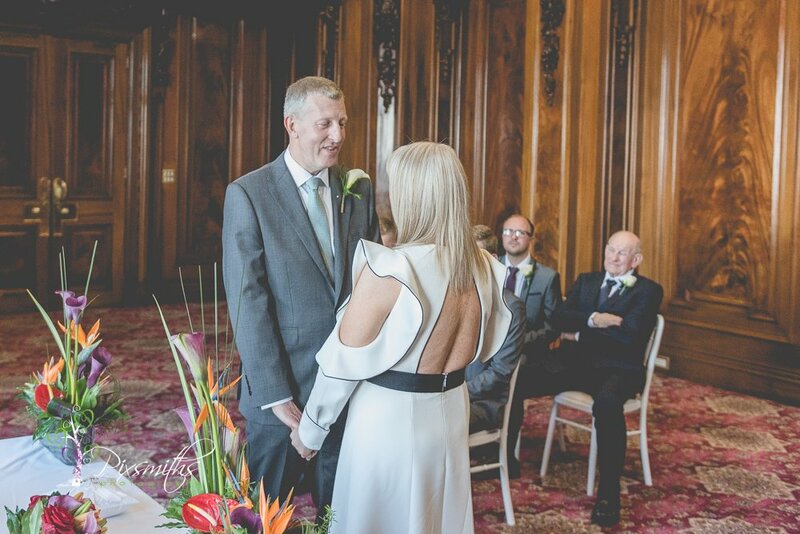 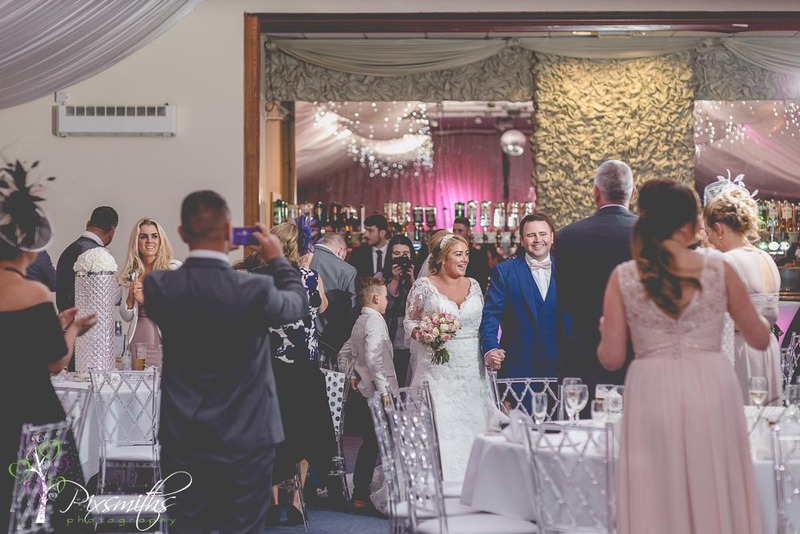 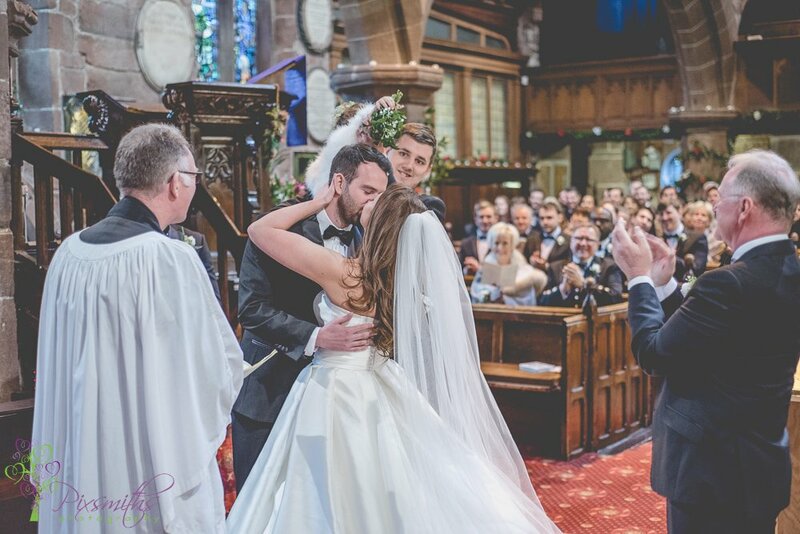 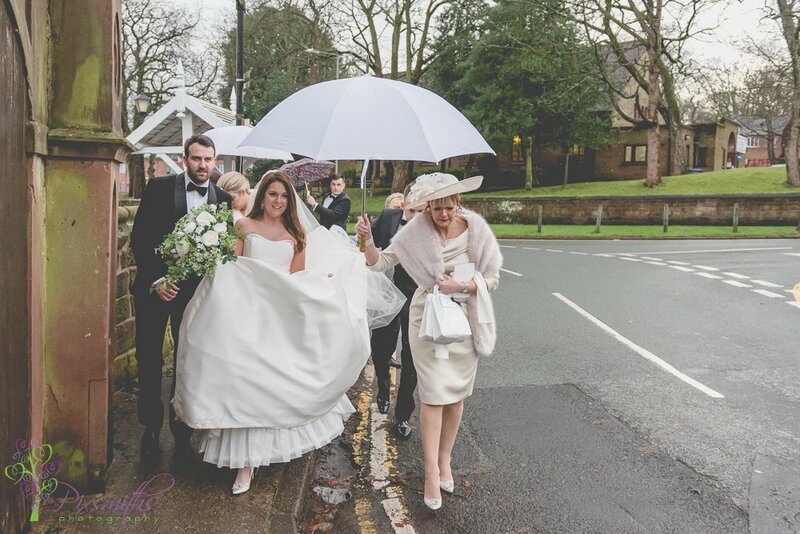 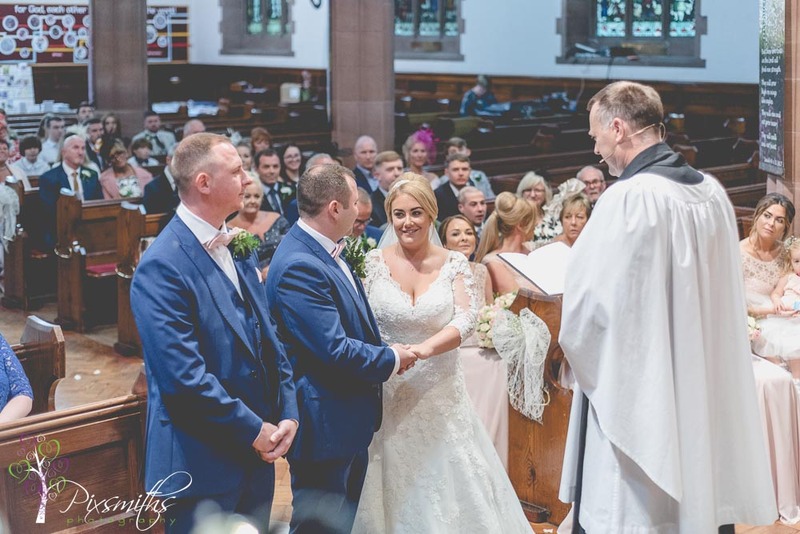 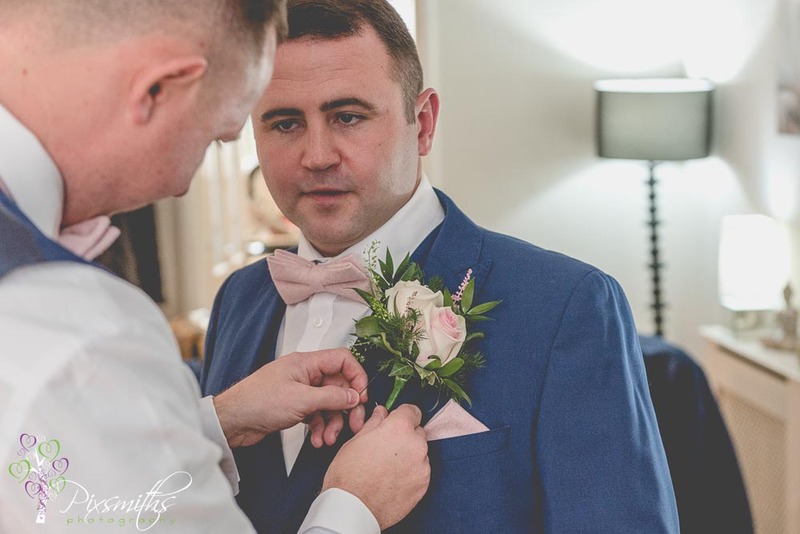 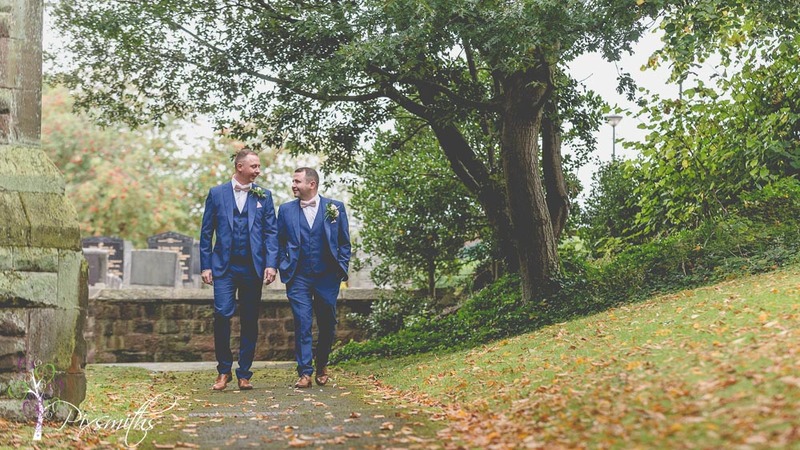 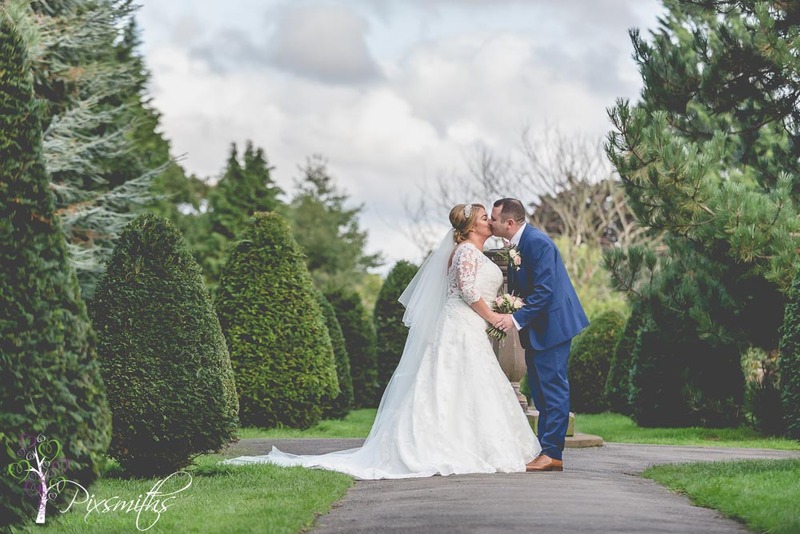 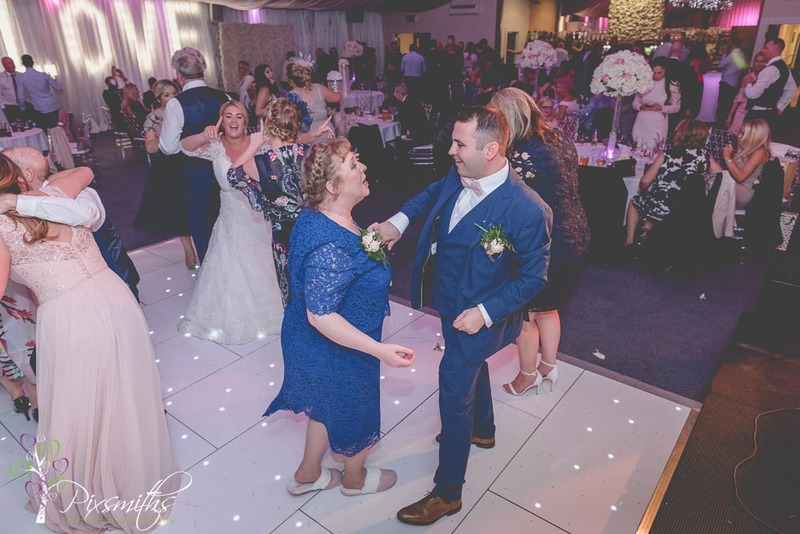 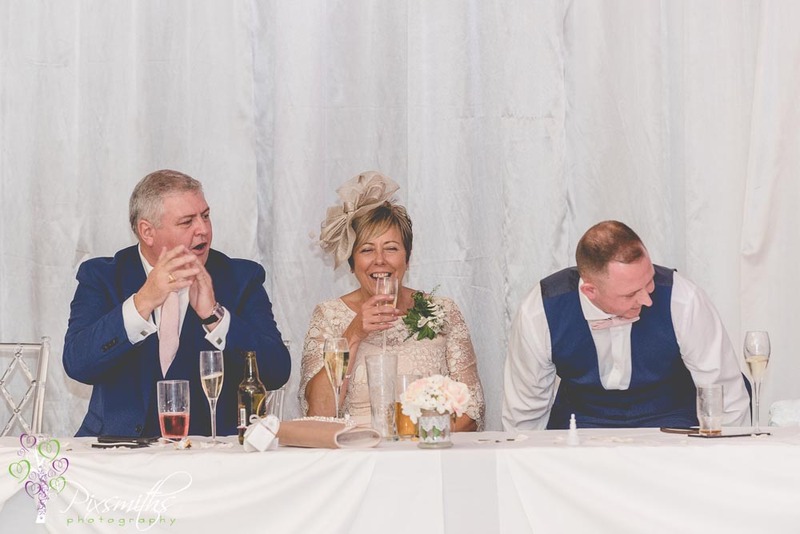 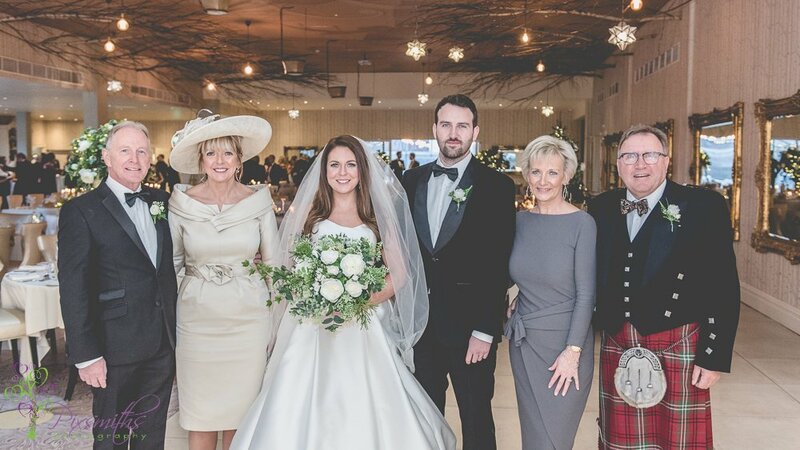 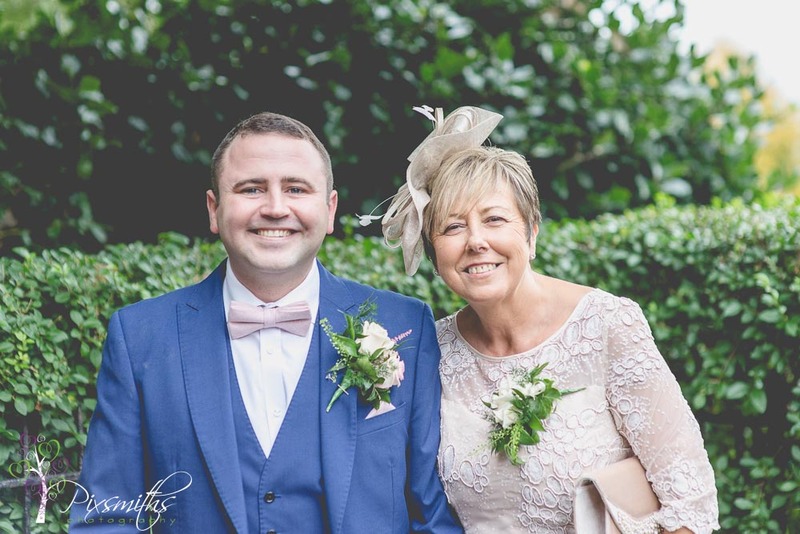 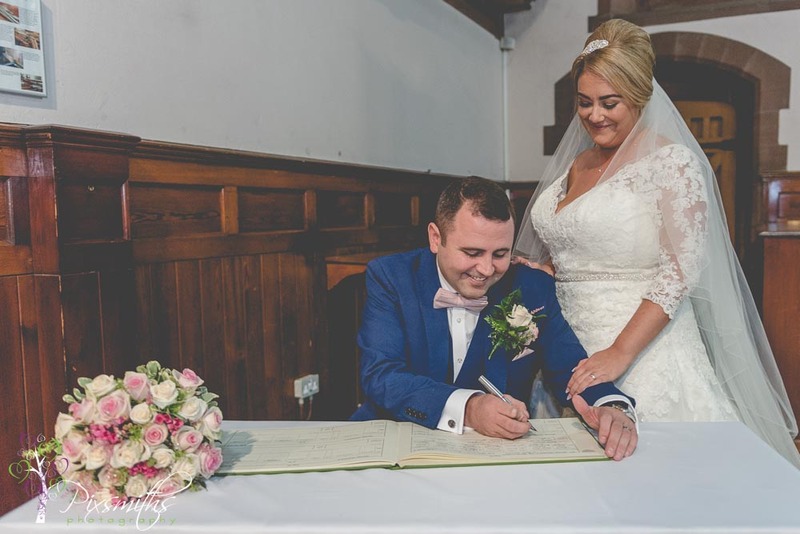 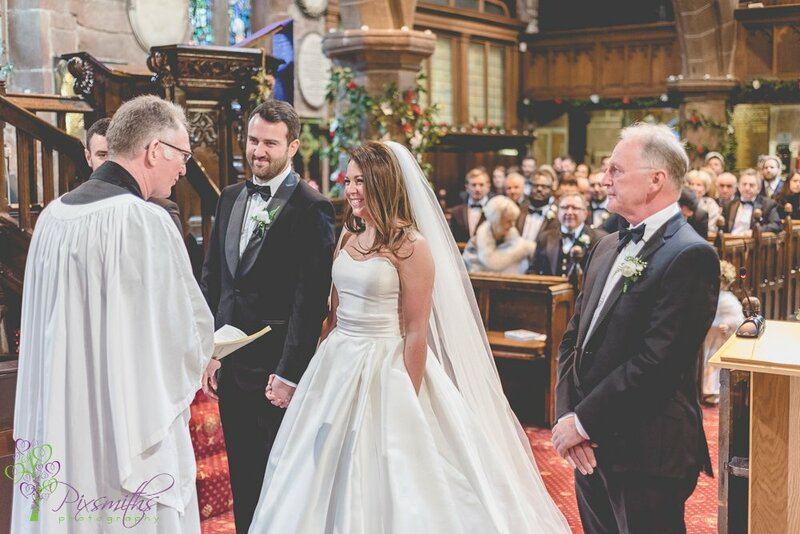 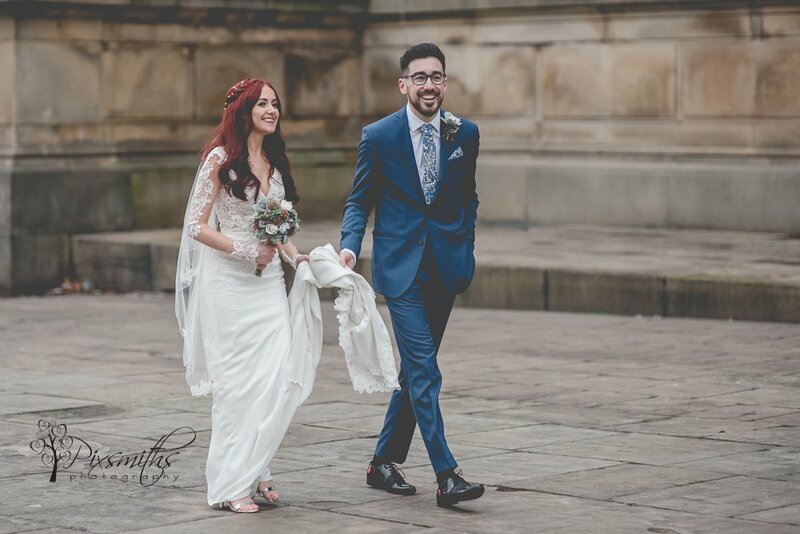 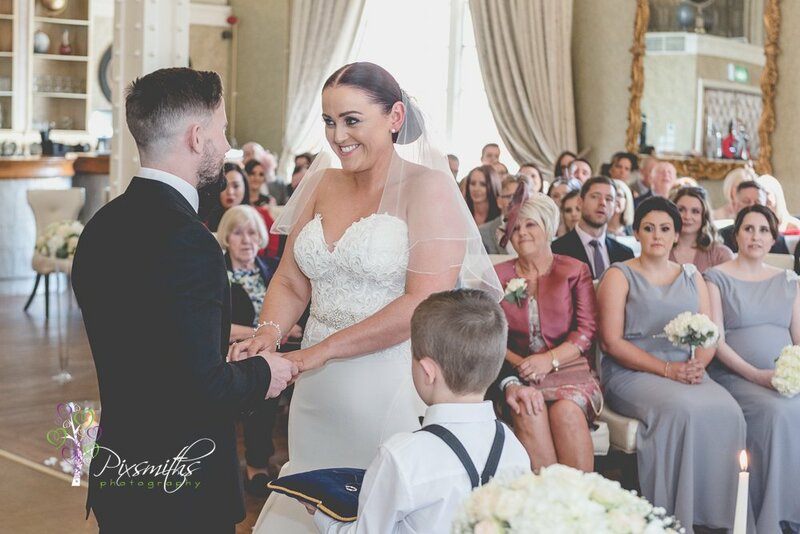 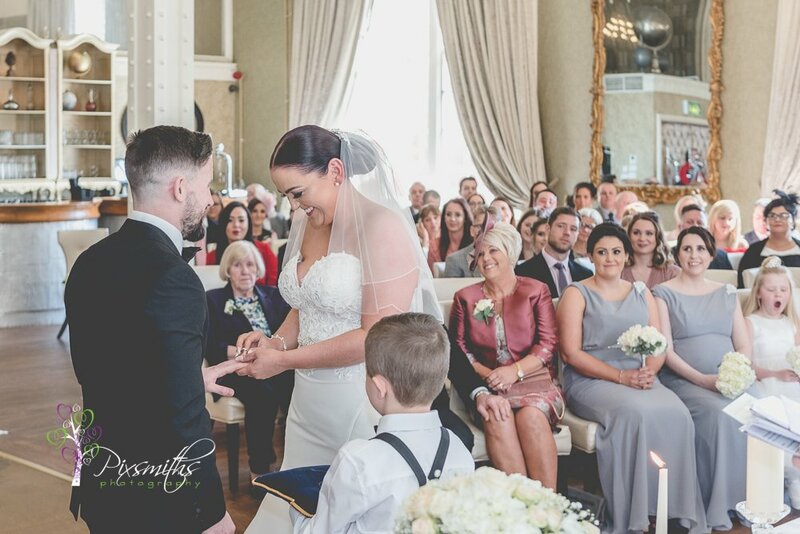 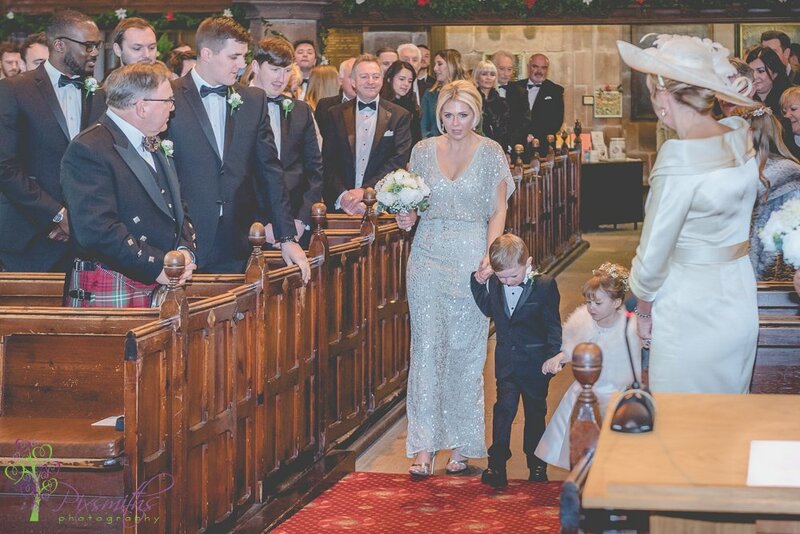 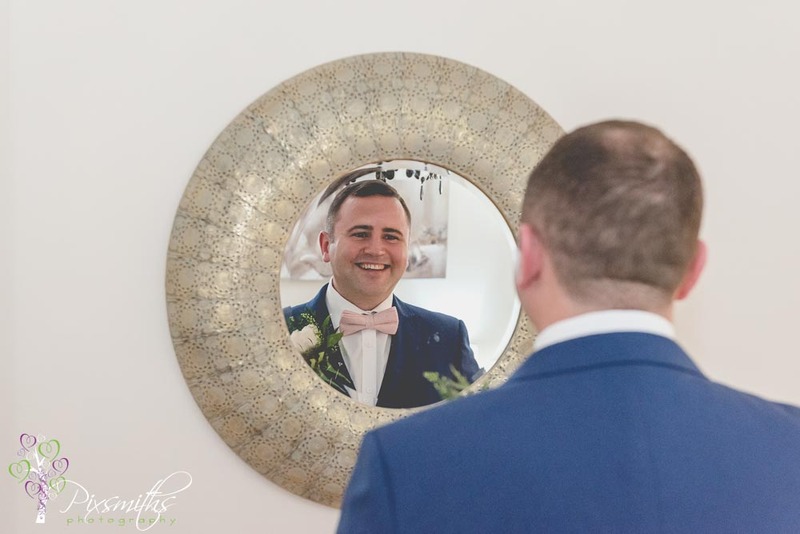 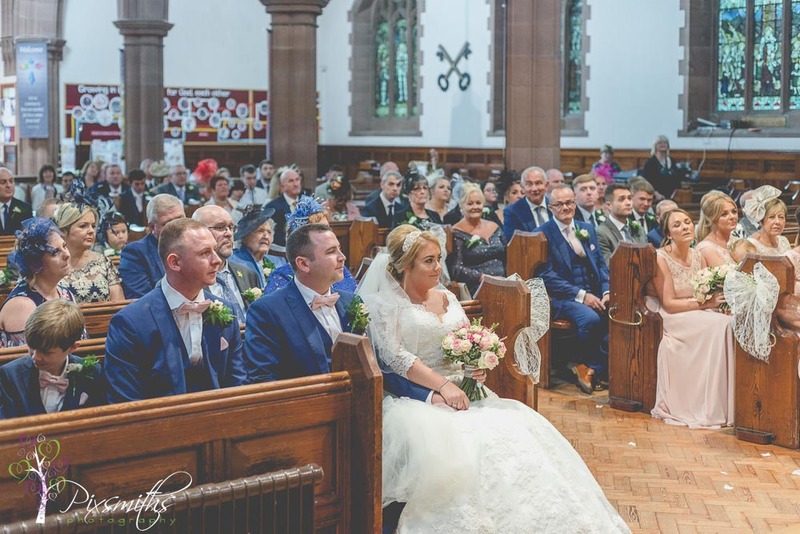 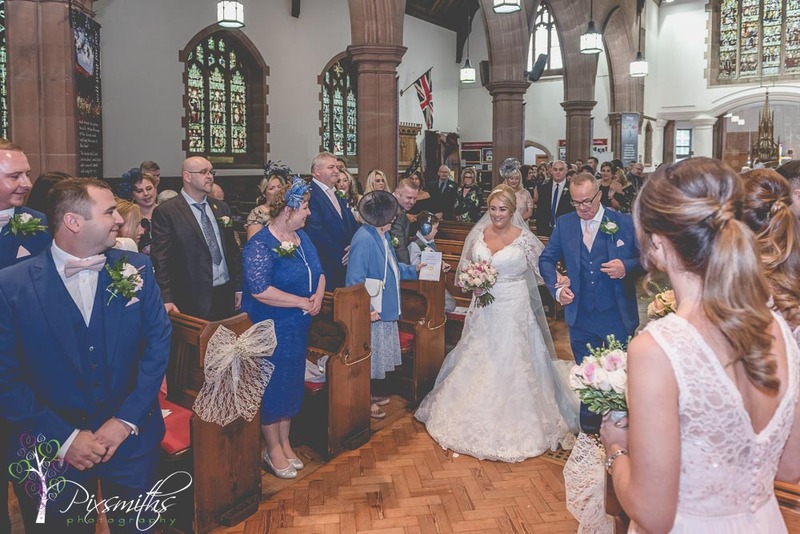 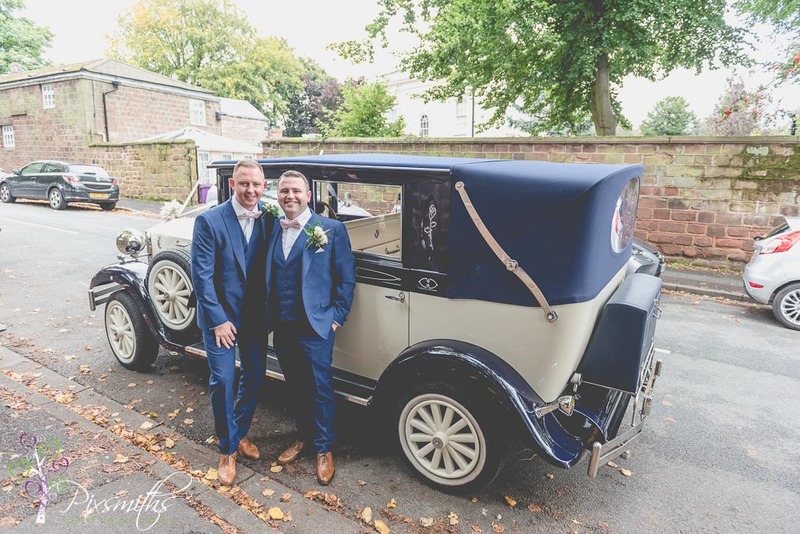 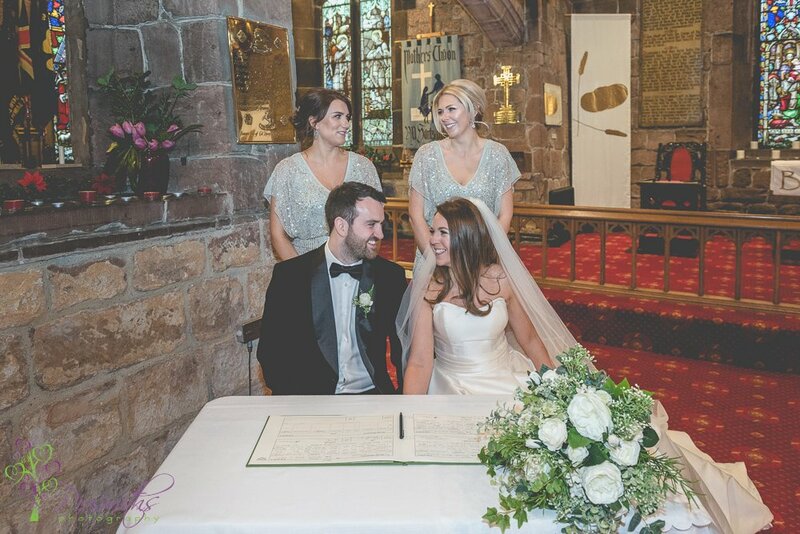 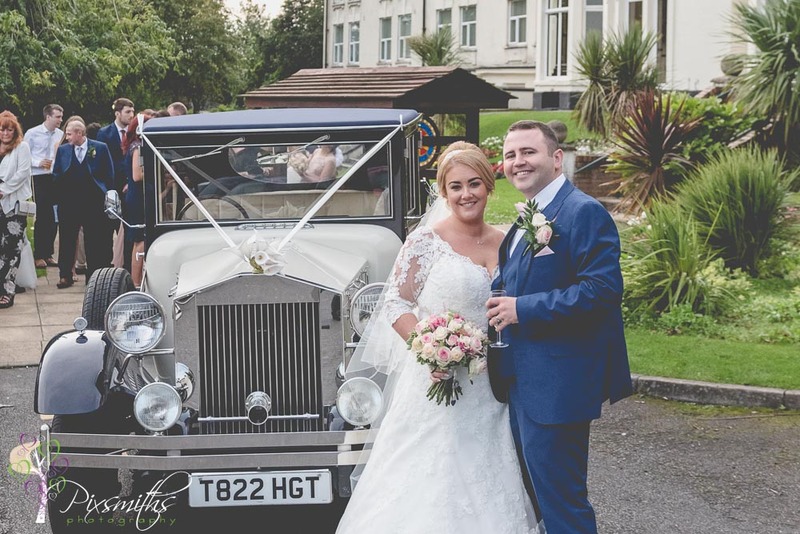 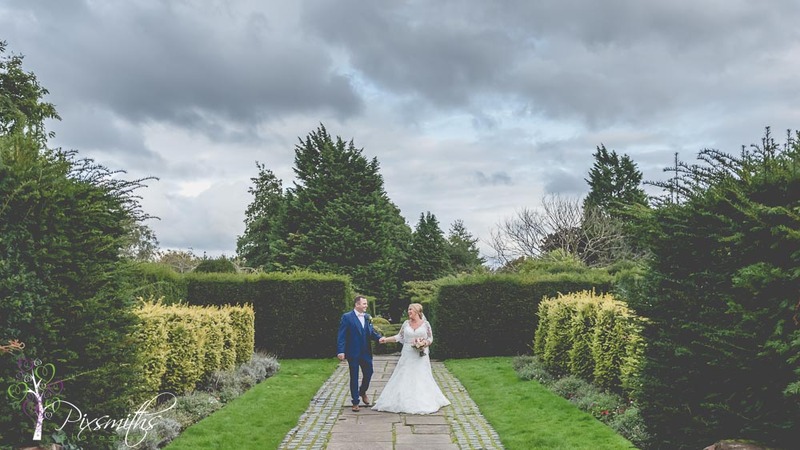 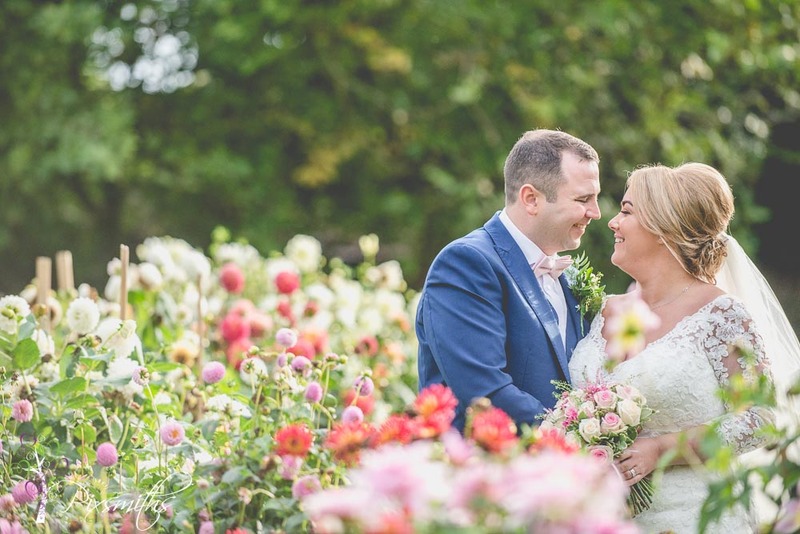 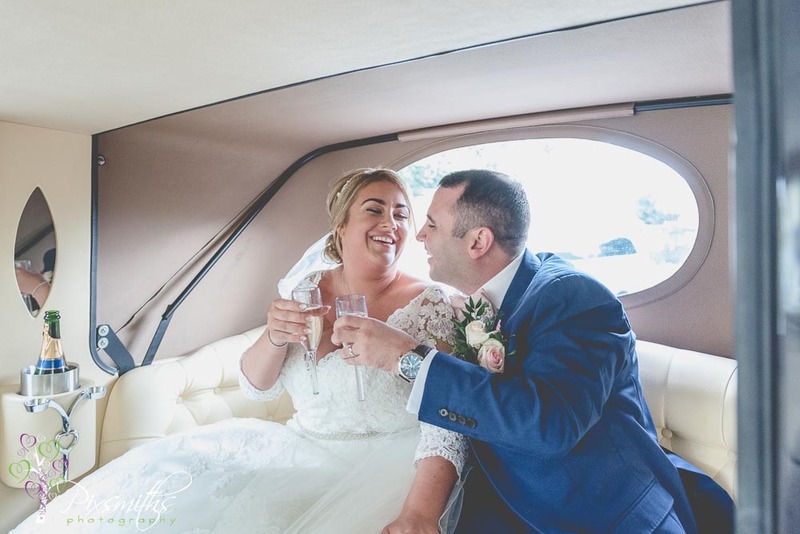 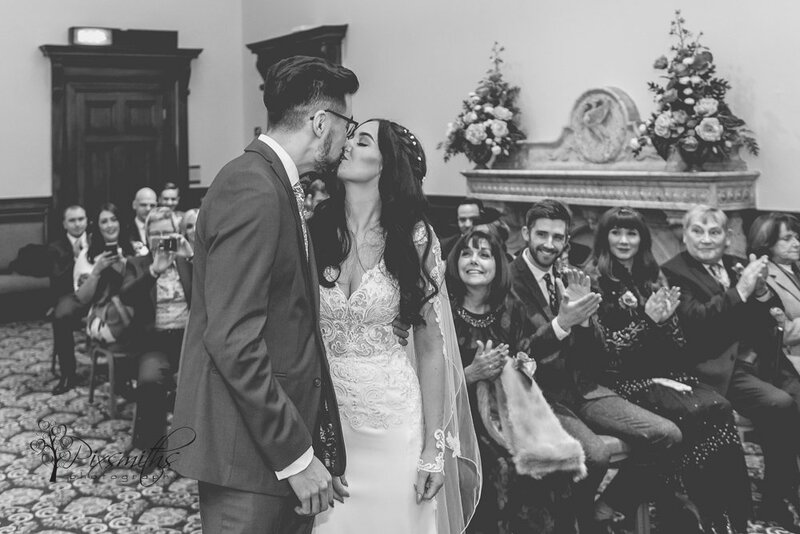 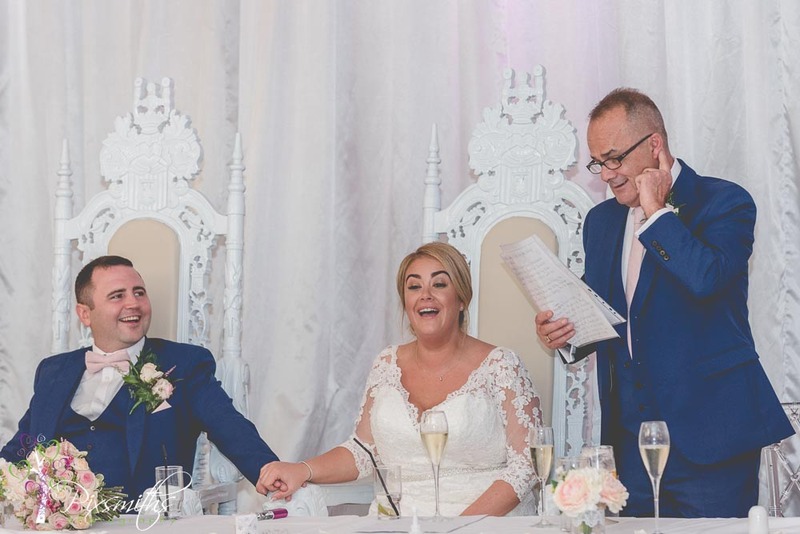 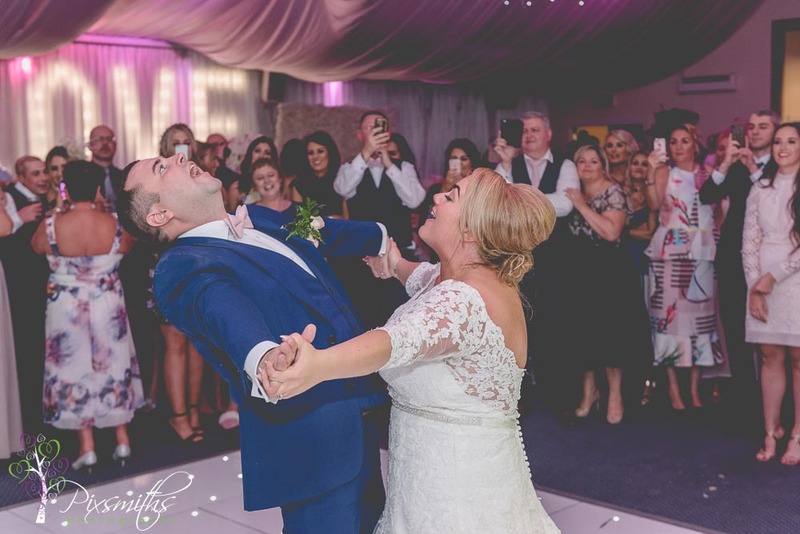 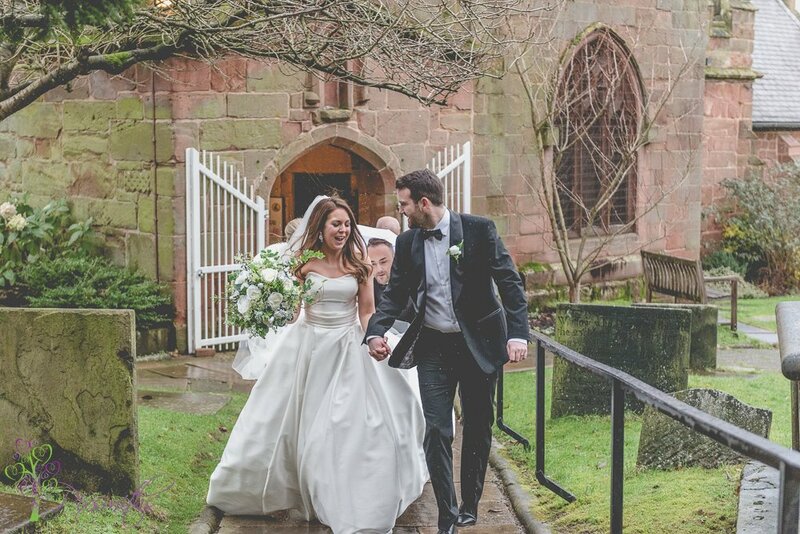 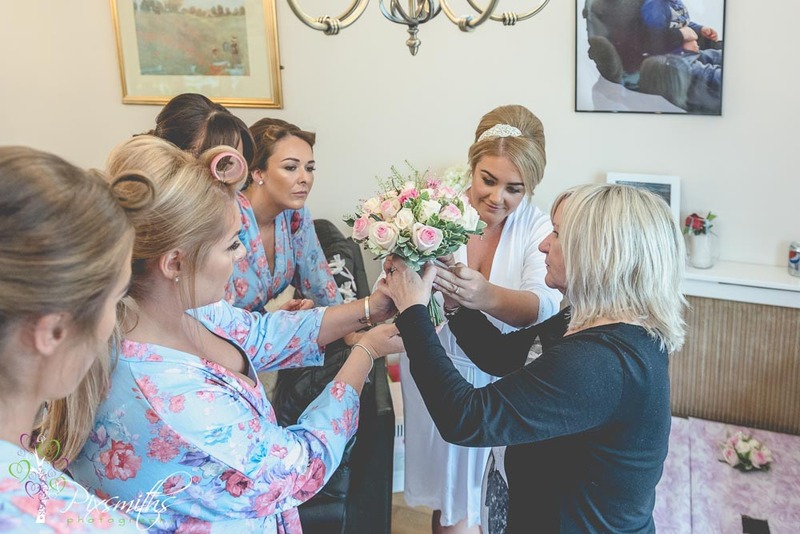 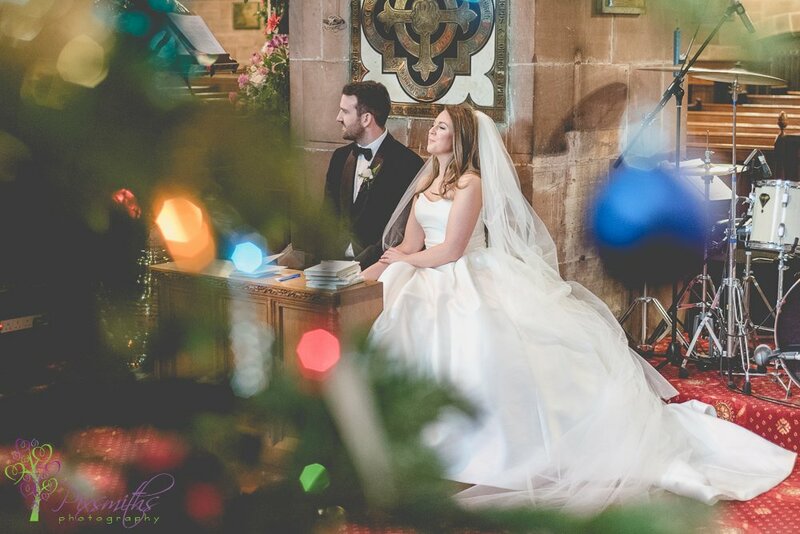 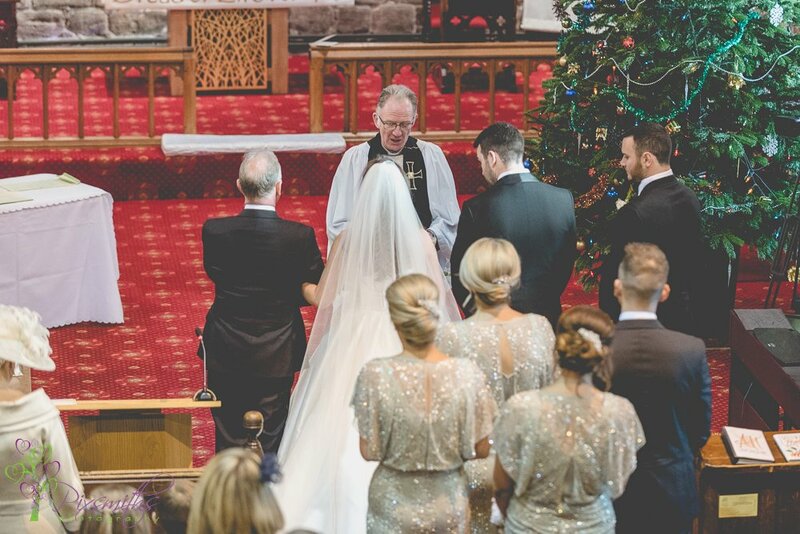 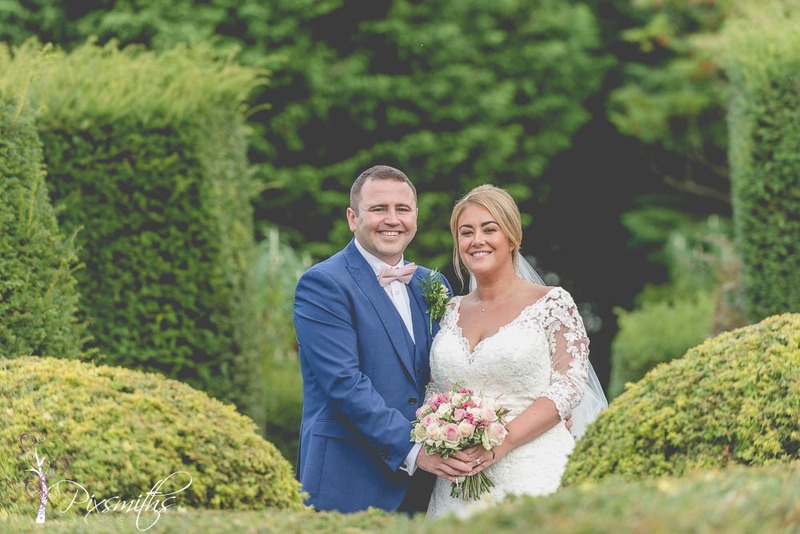 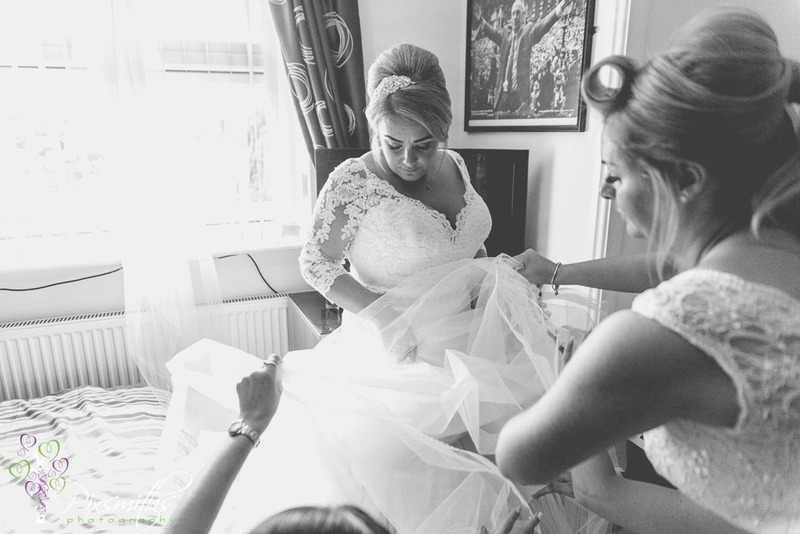 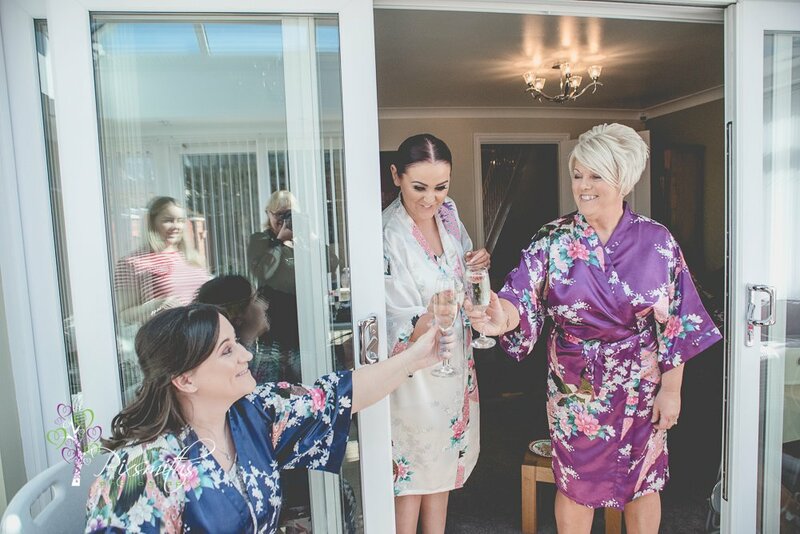 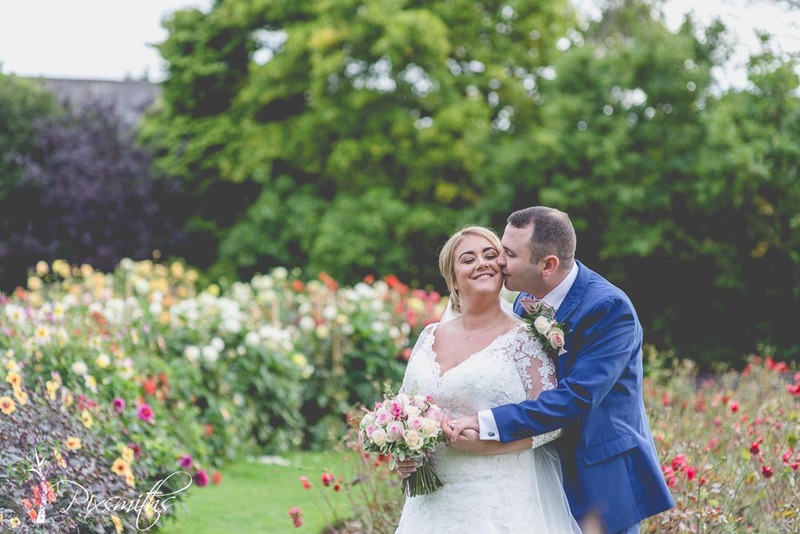 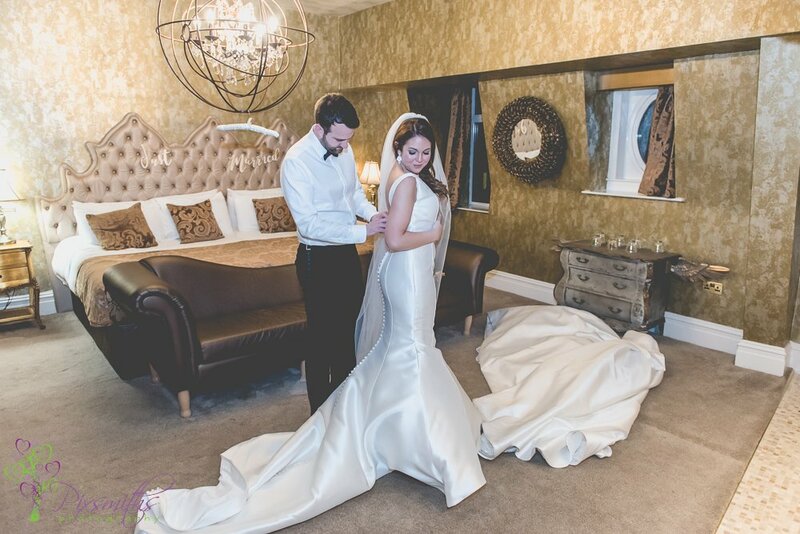 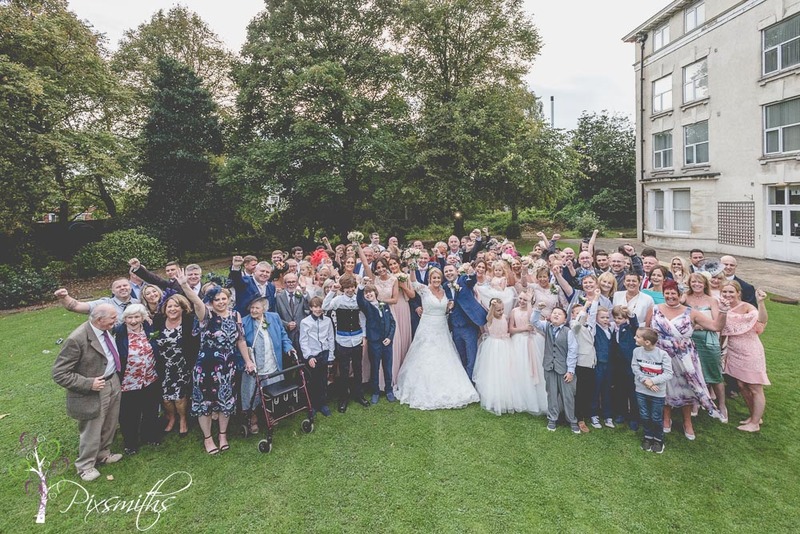 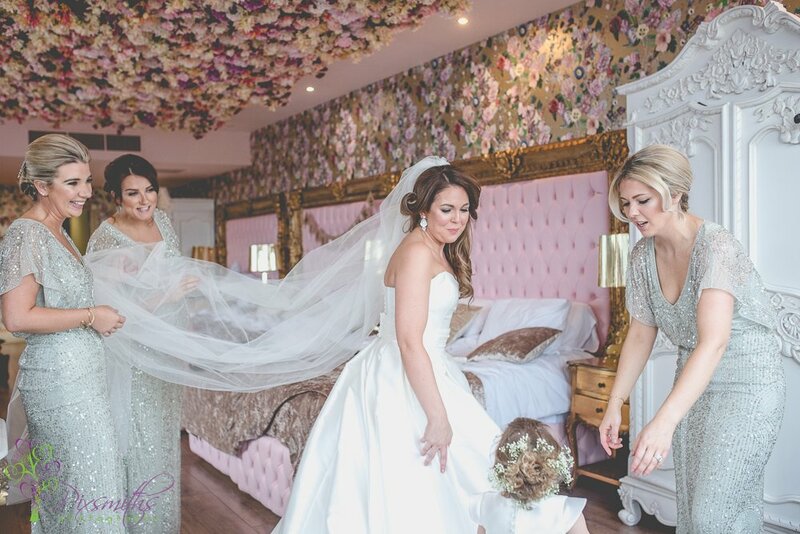 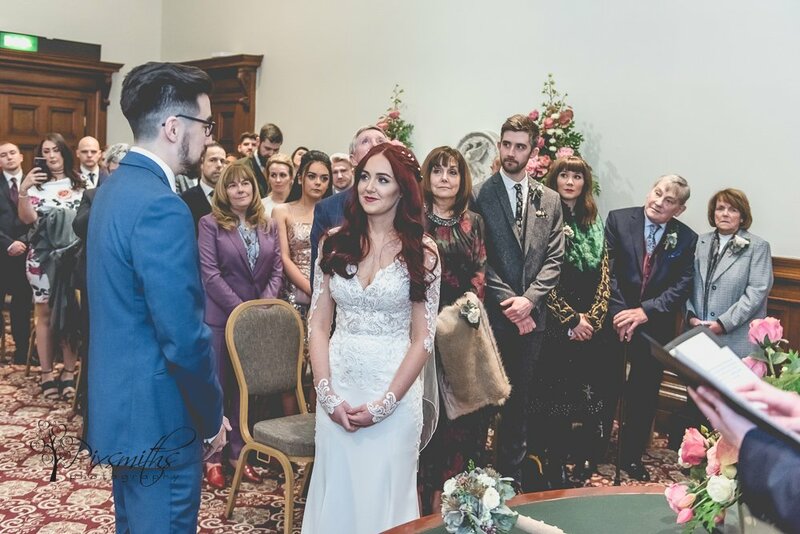 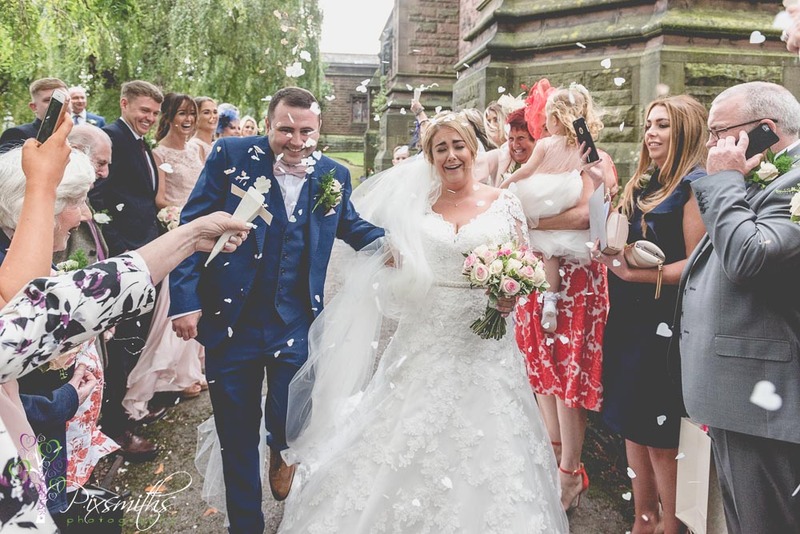 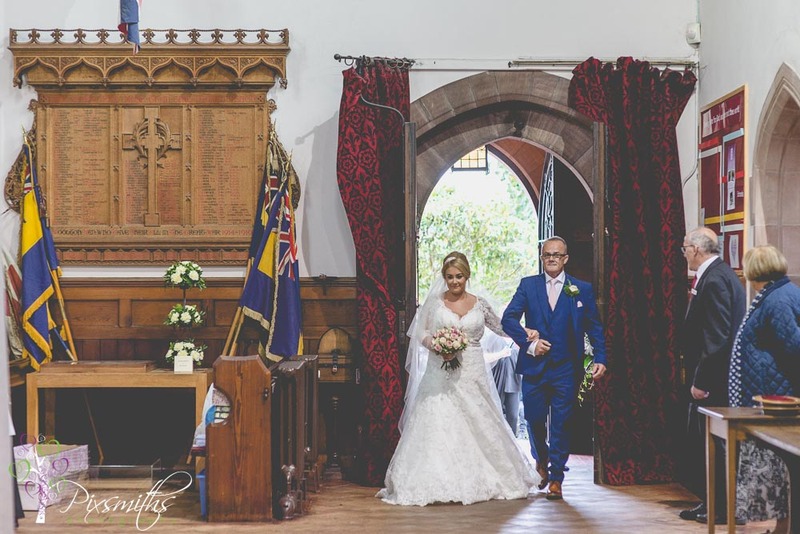 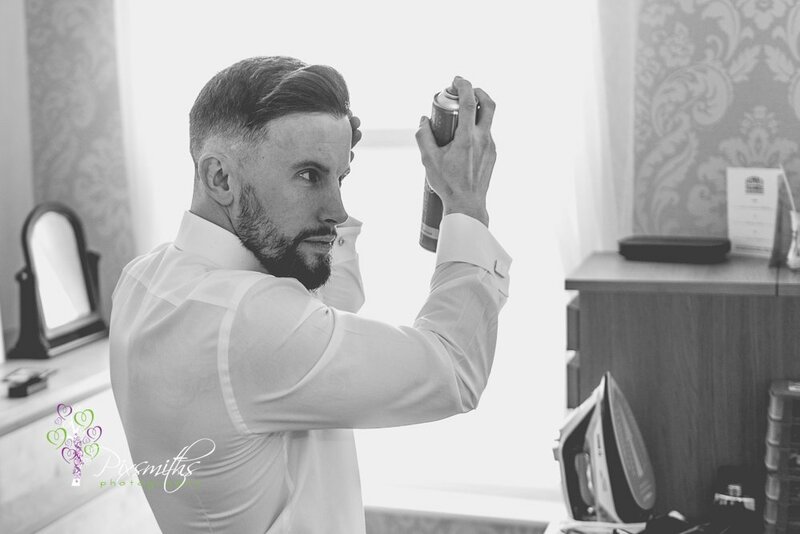 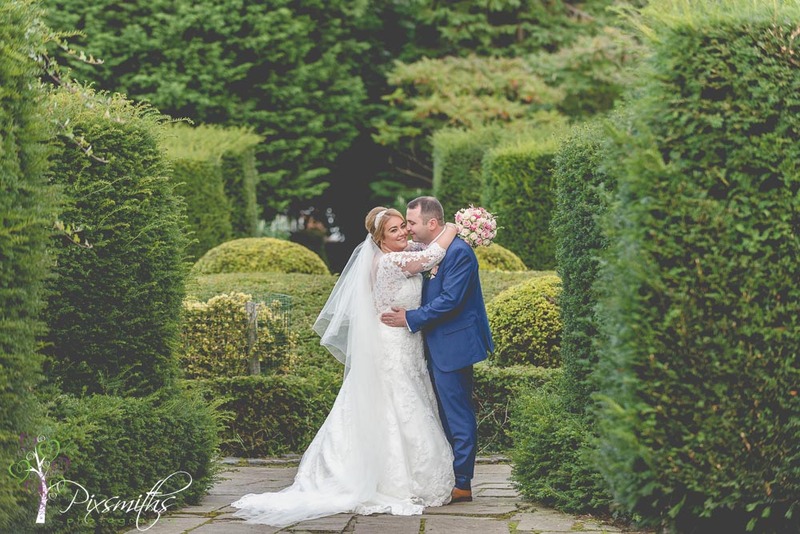 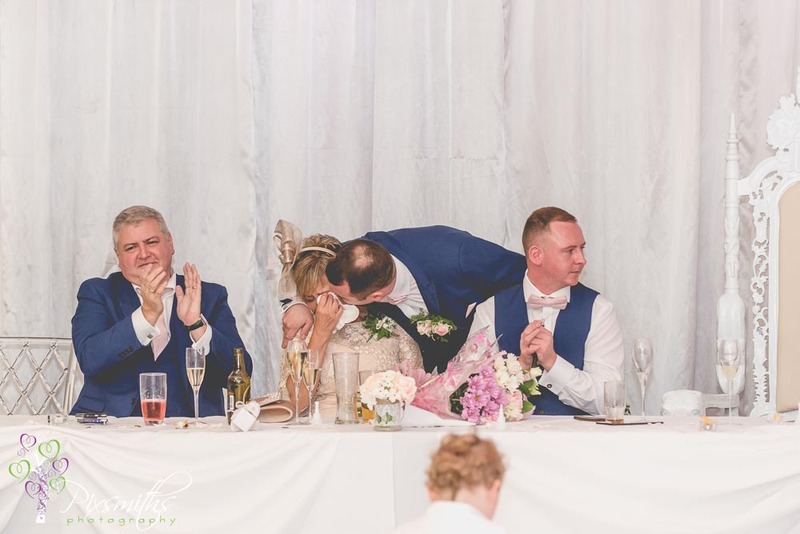 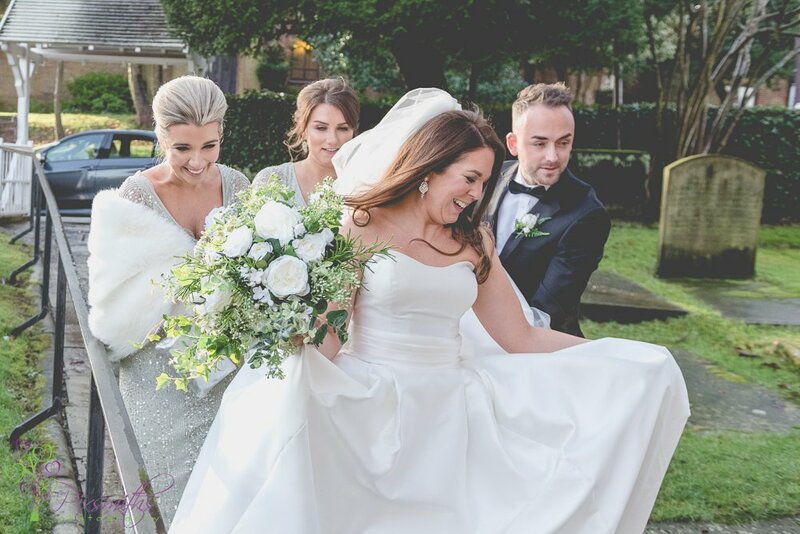 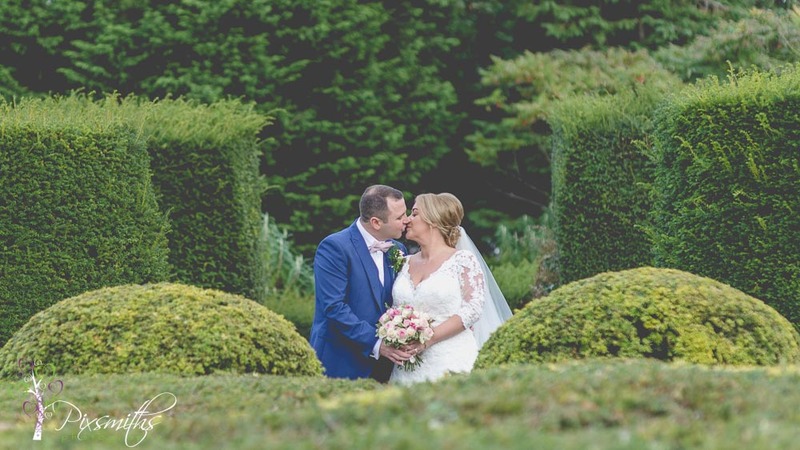 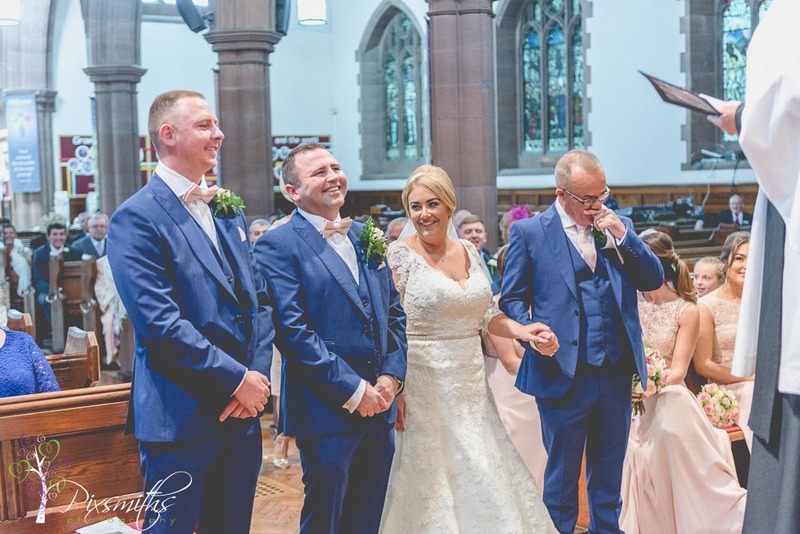 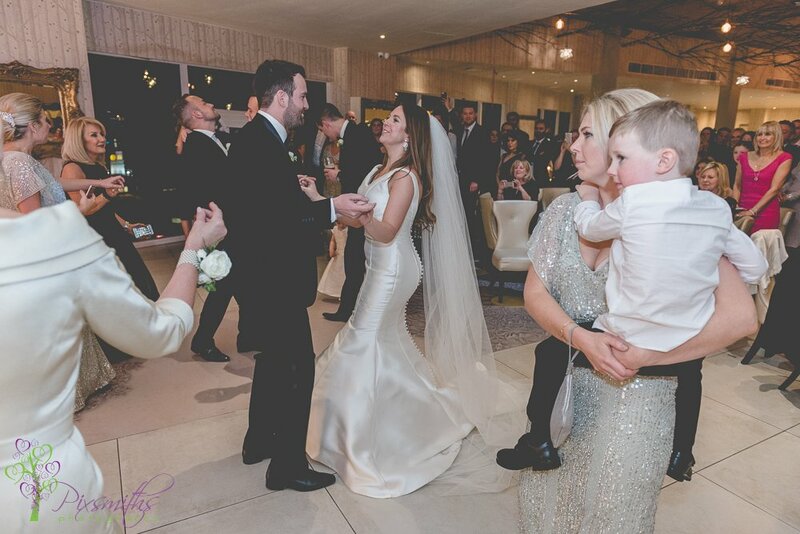 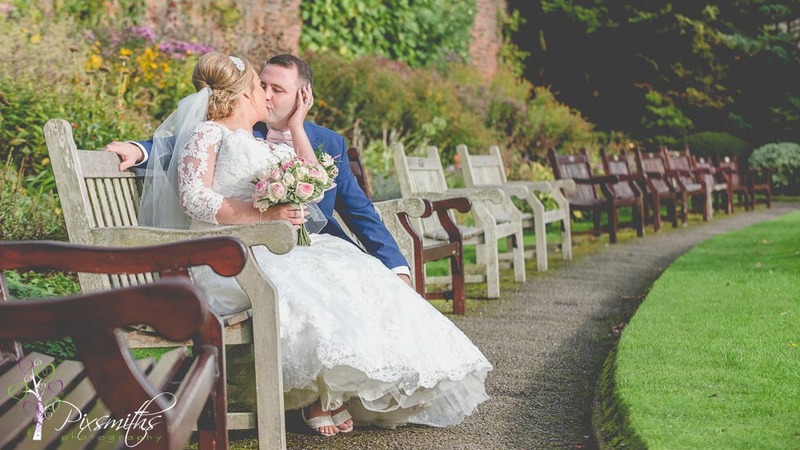 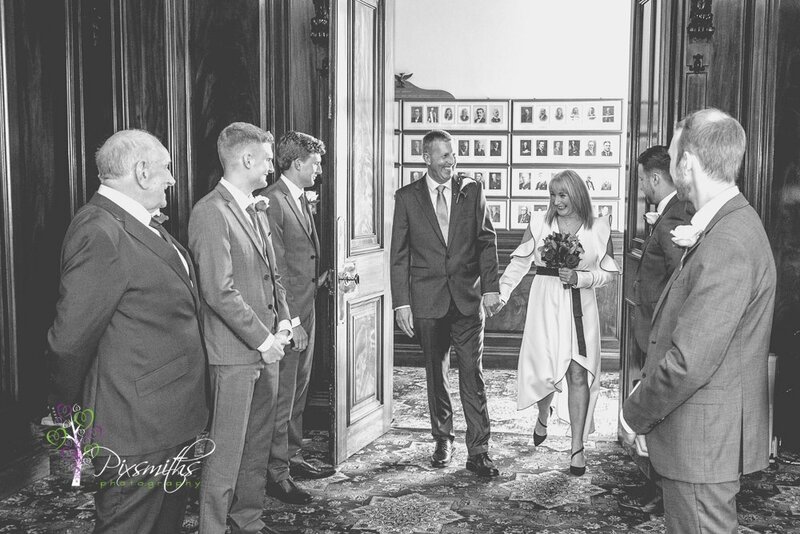 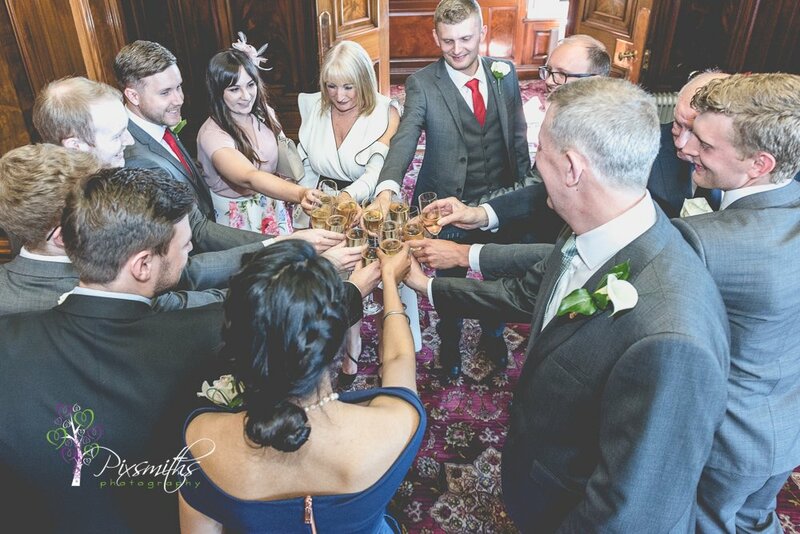 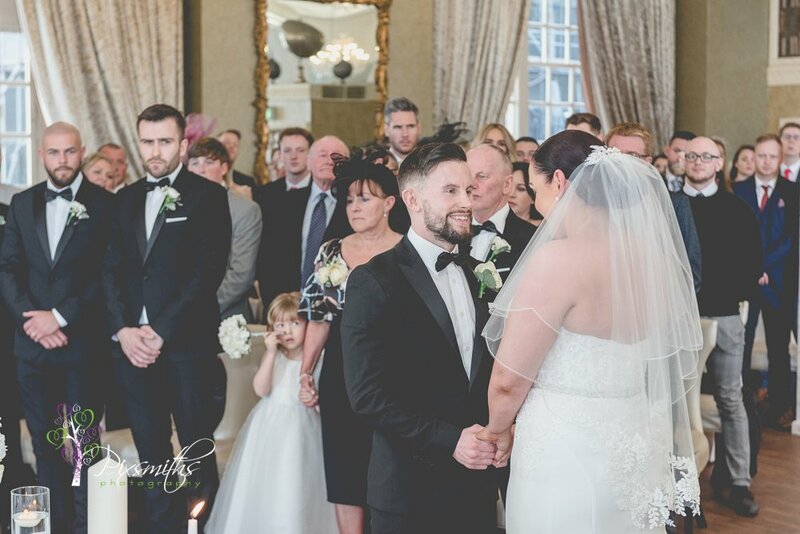 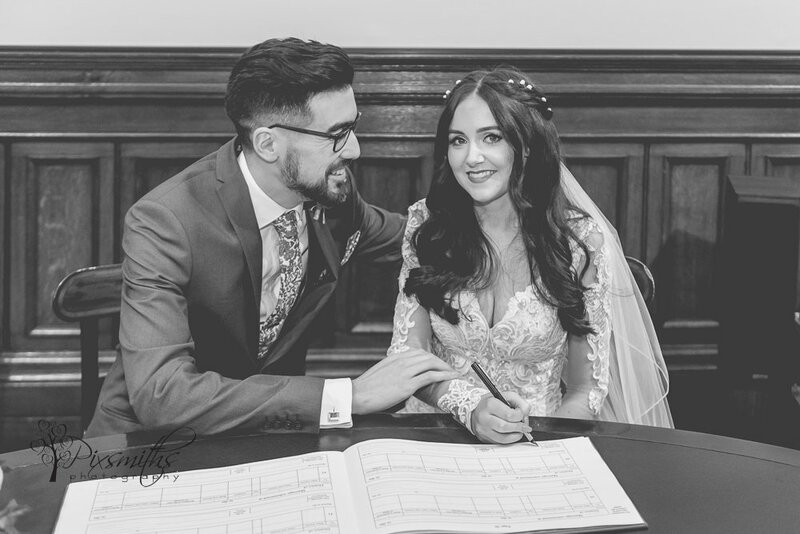 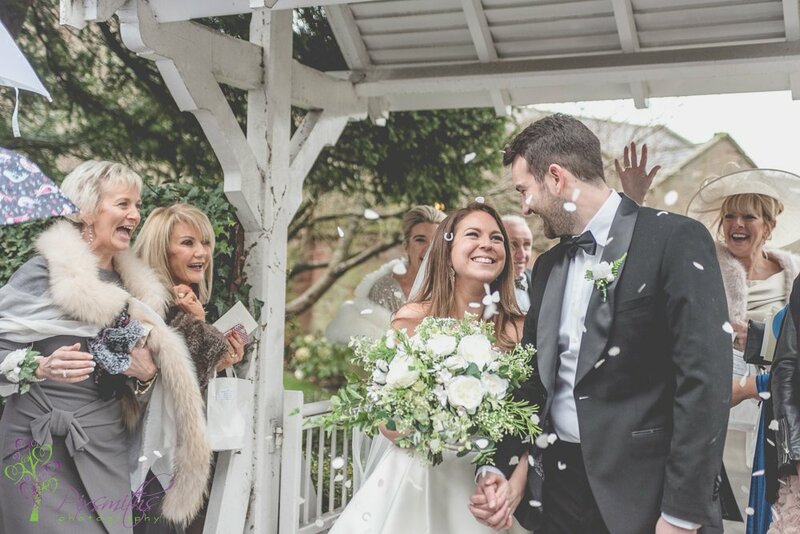 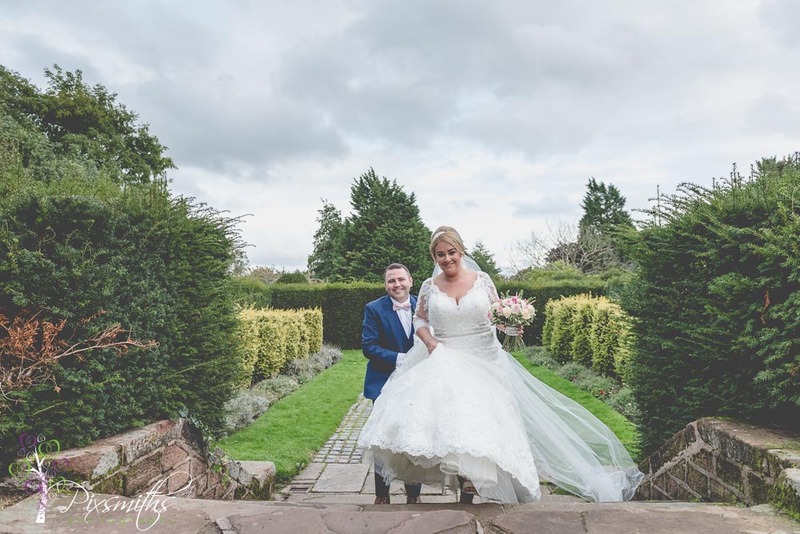 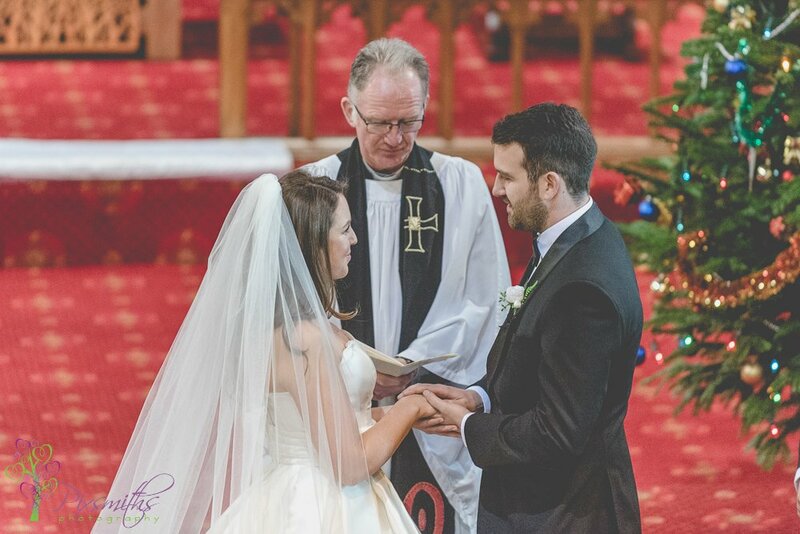 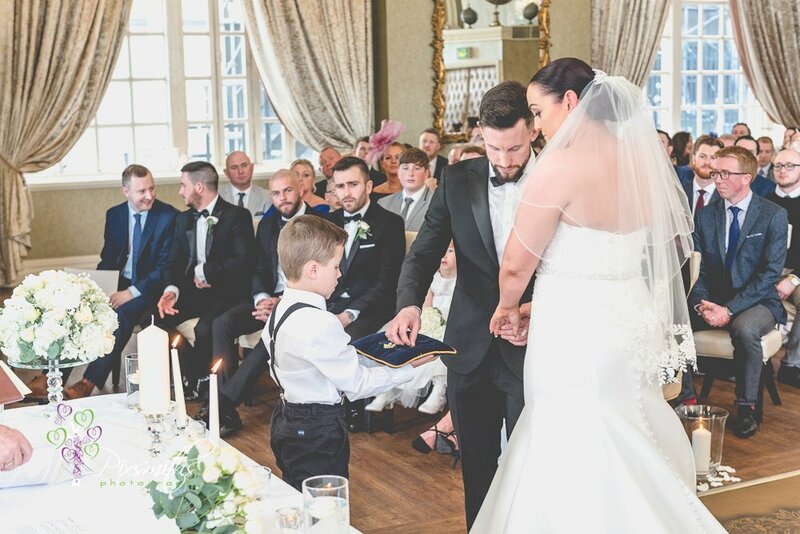 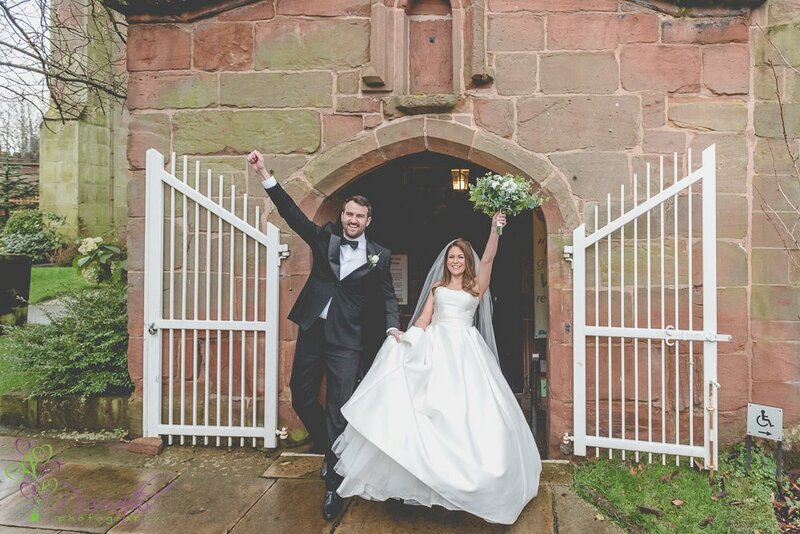 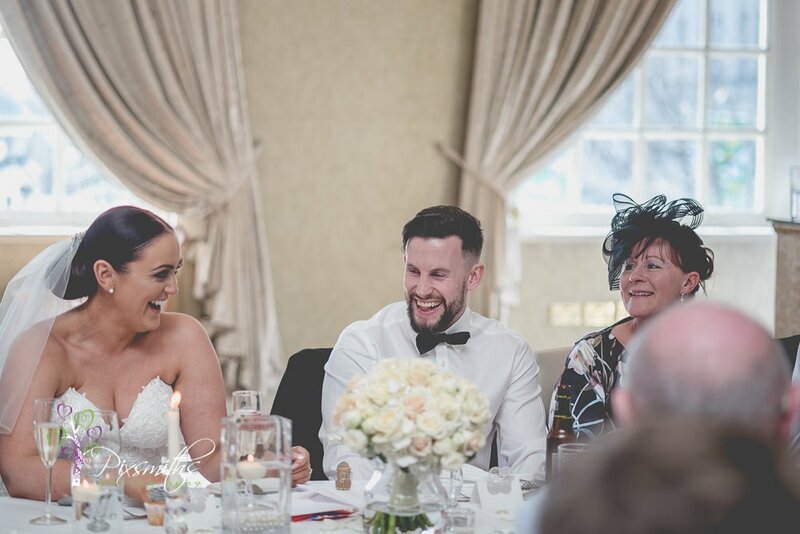 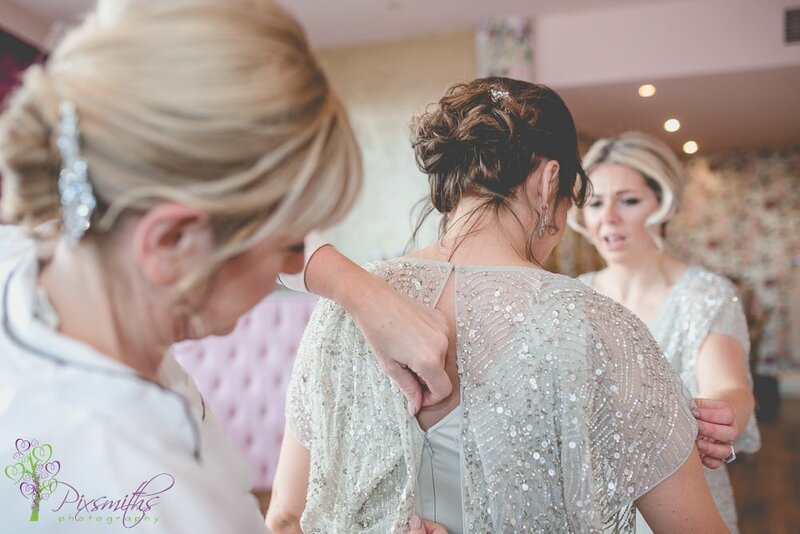 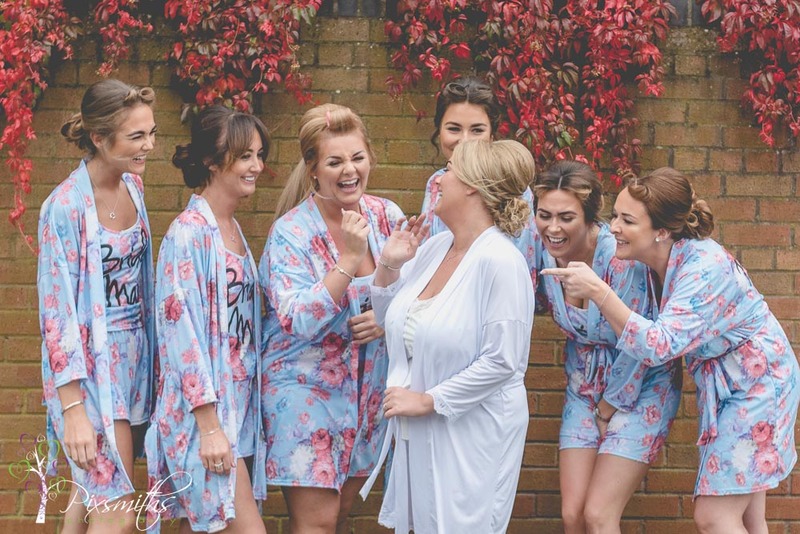 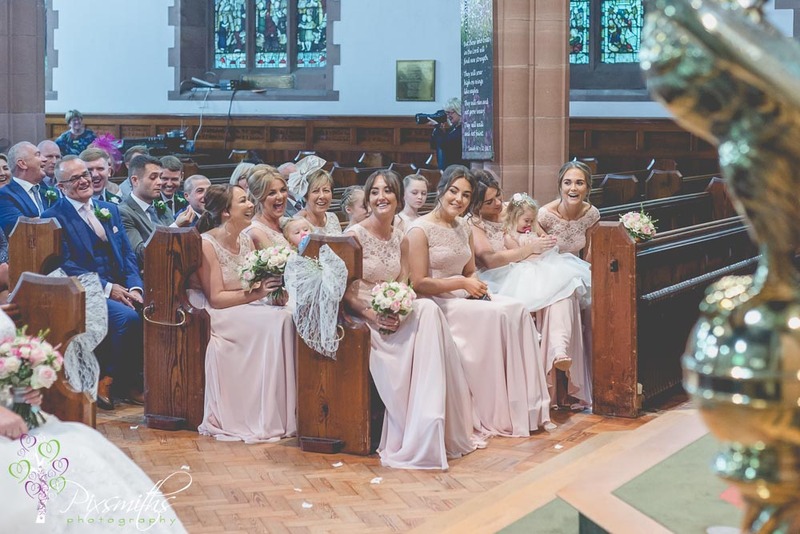 Her gorgeous lace embellished bridal gown was from Bethany Hannah Bridal in Cheshire – adore the sleeves and button detail Jamie scrubbed up well in his blue suit too. 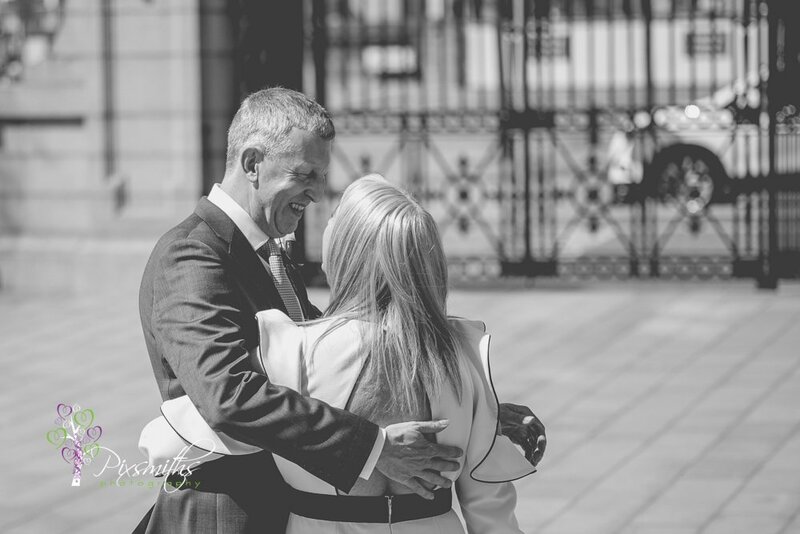 We had not previously met Claire and Jamie, but had good communication beforehand as to what was expected for the day. 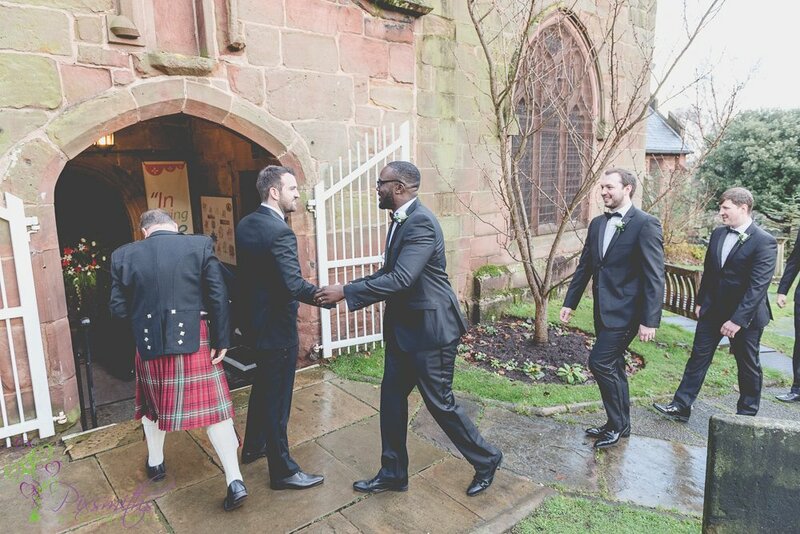 All was planned and ready to go. 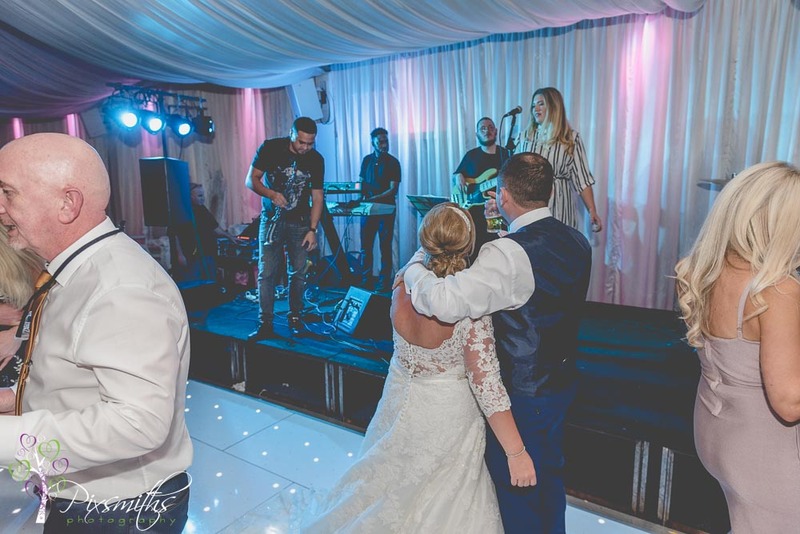 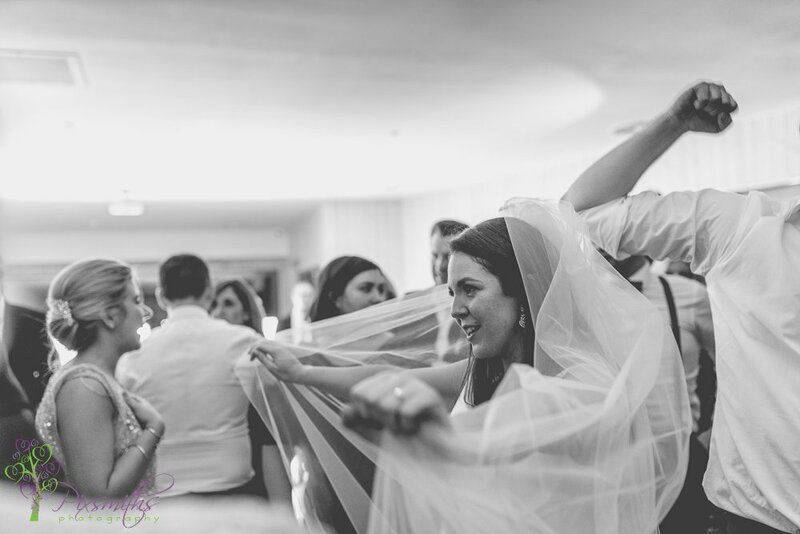 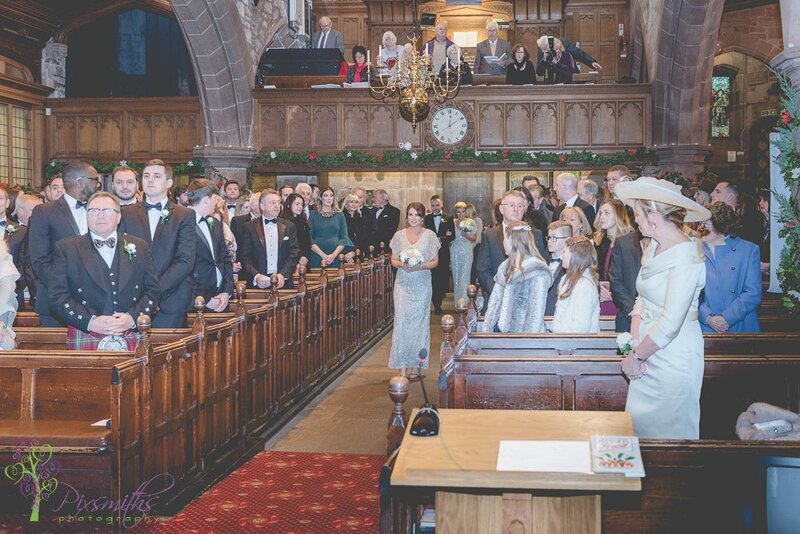 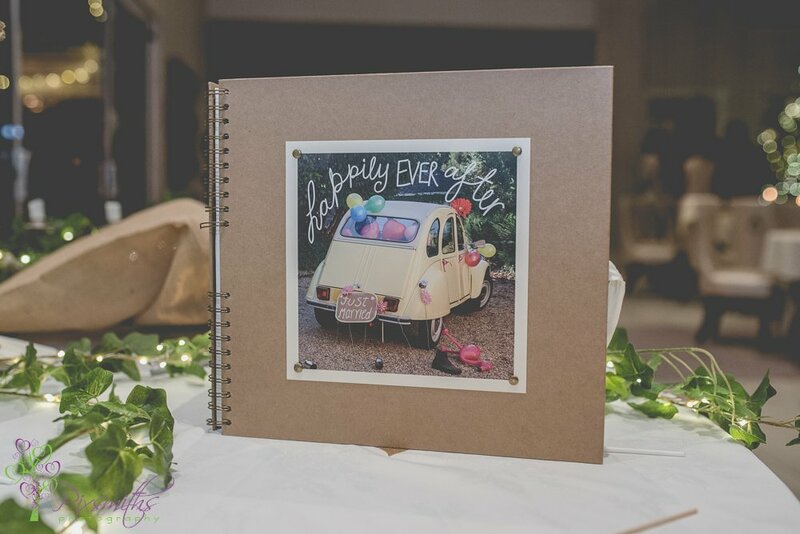 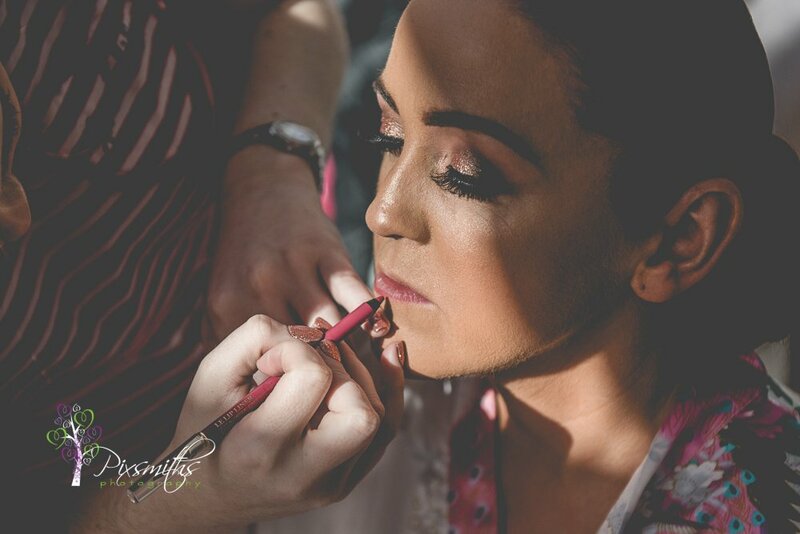 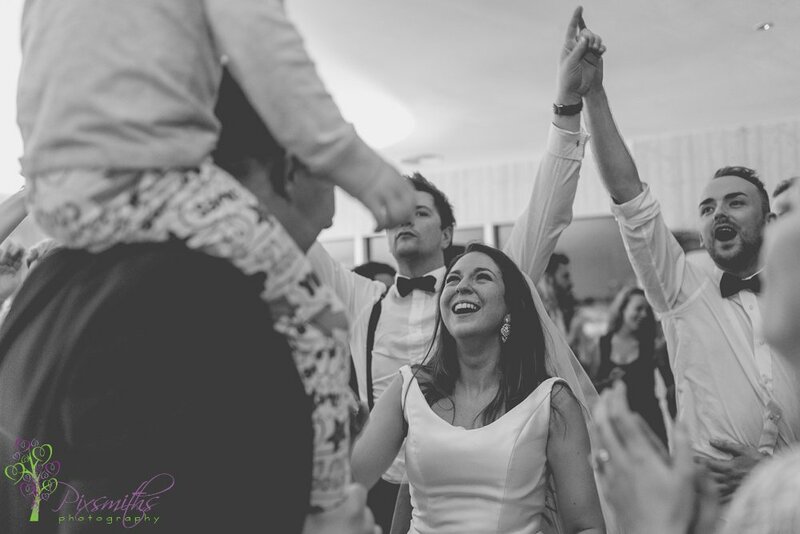 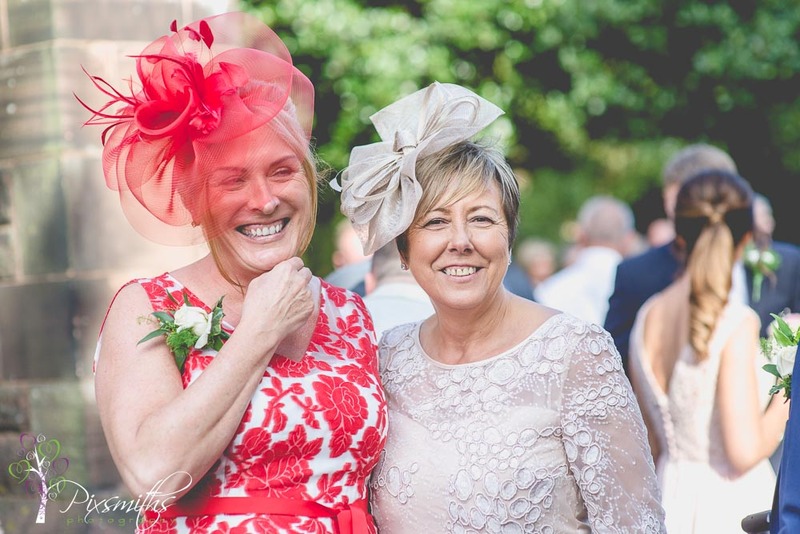 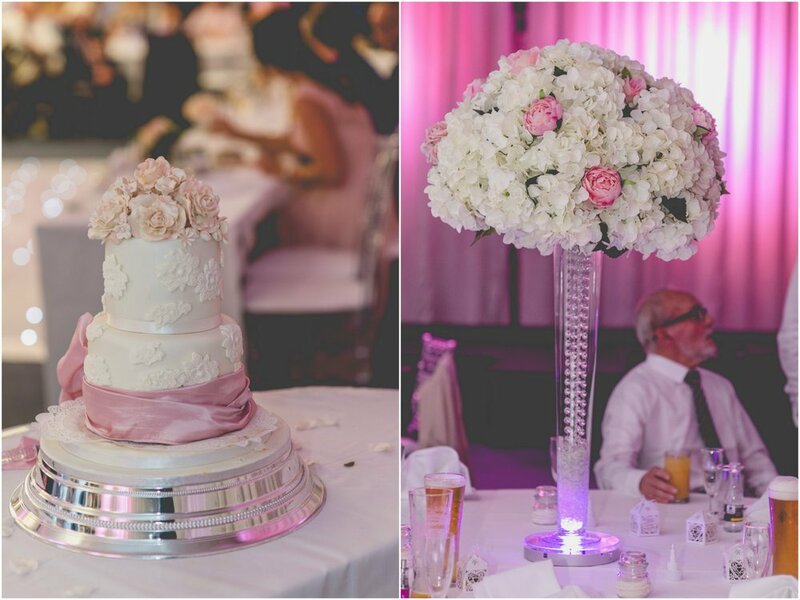 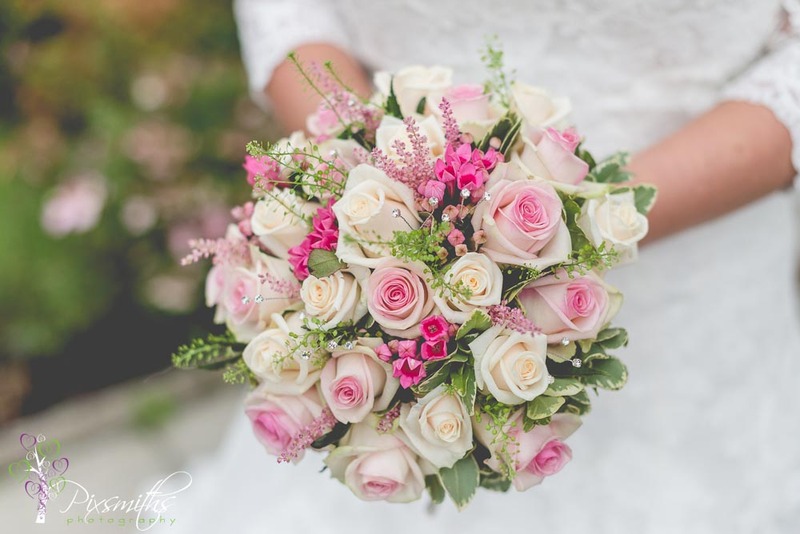 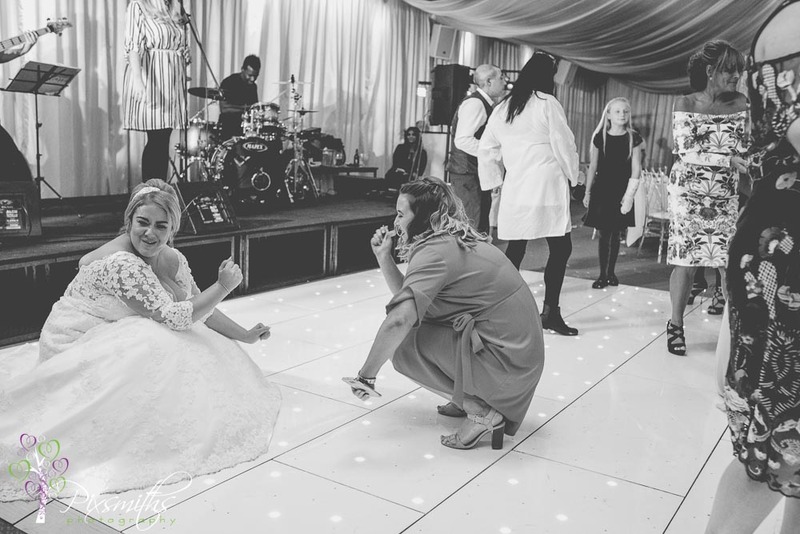 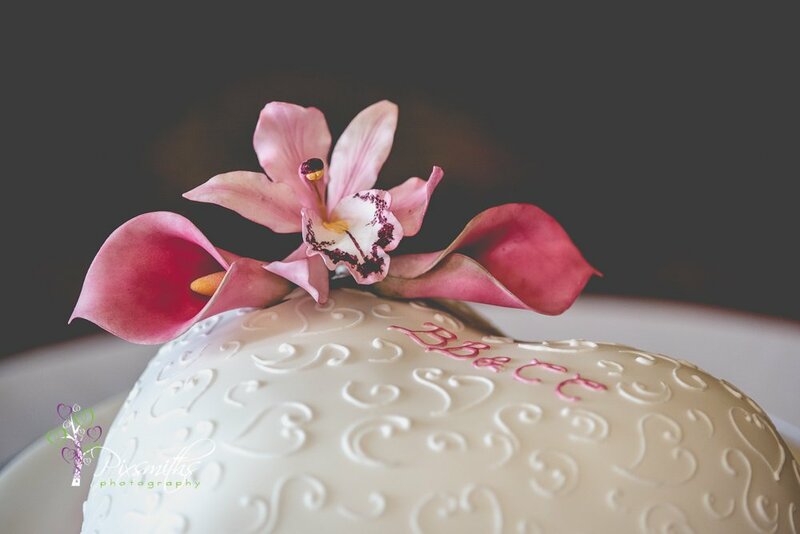 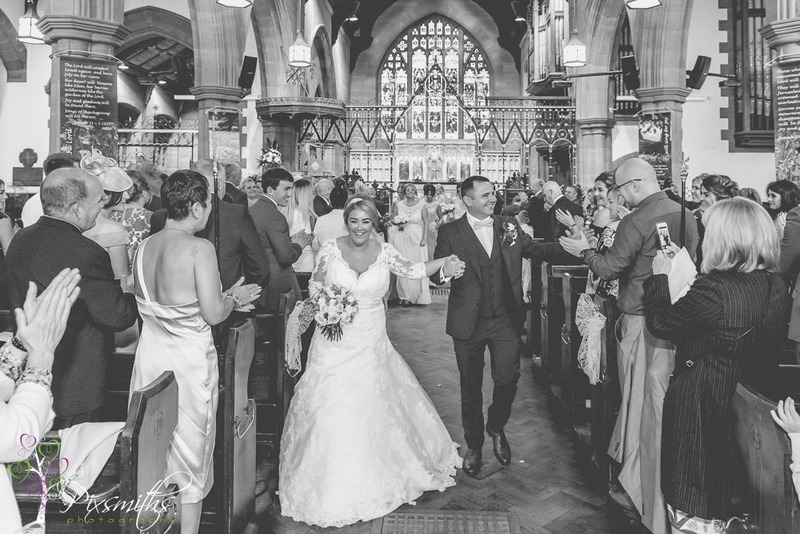 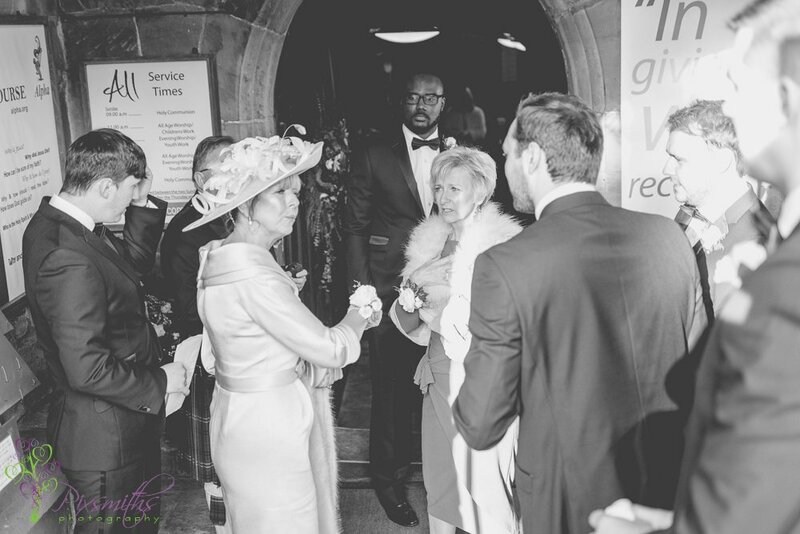 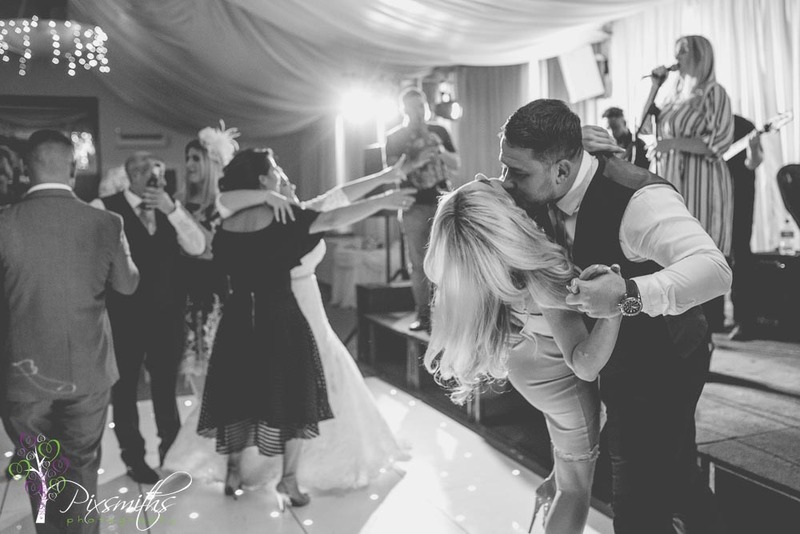 This was a wedding we had secured via Wedding wire – many brides are using lead directories these days. 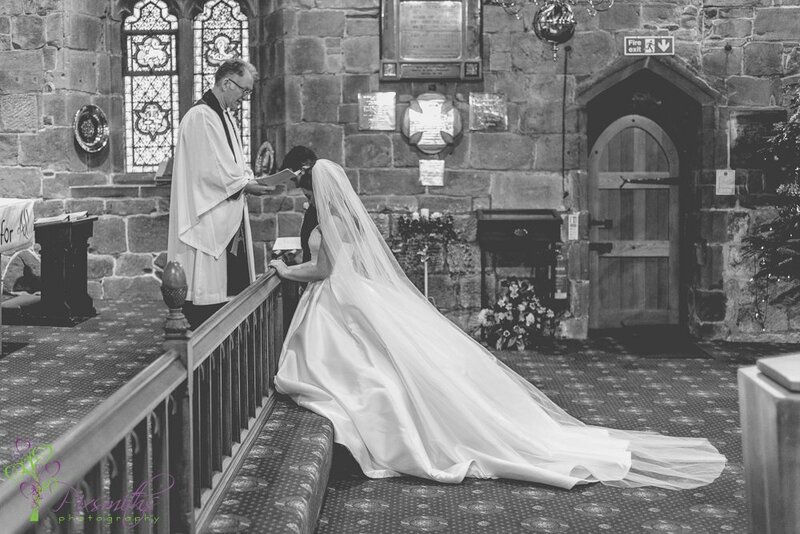 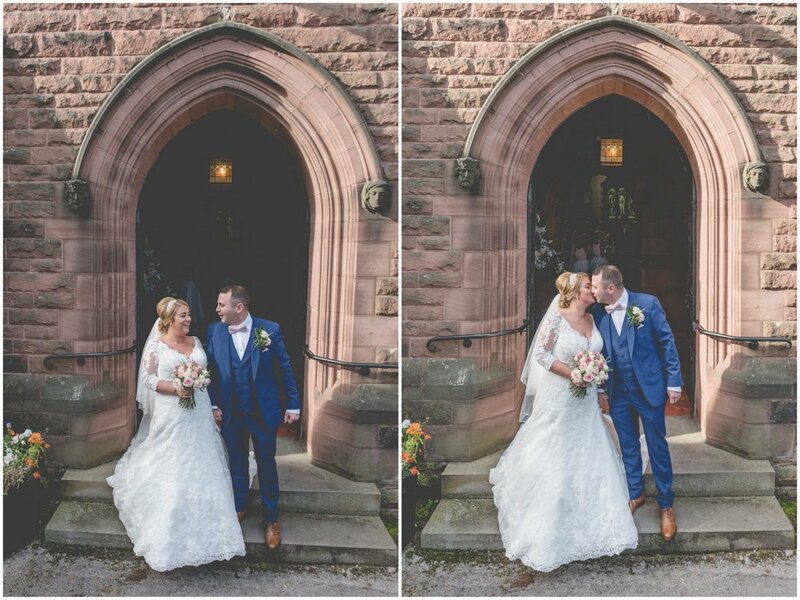 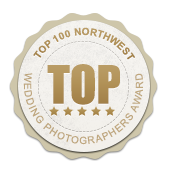 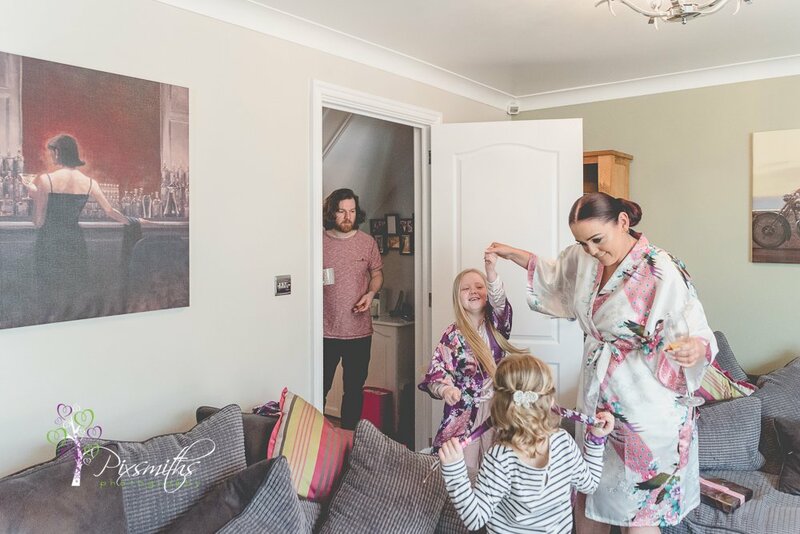 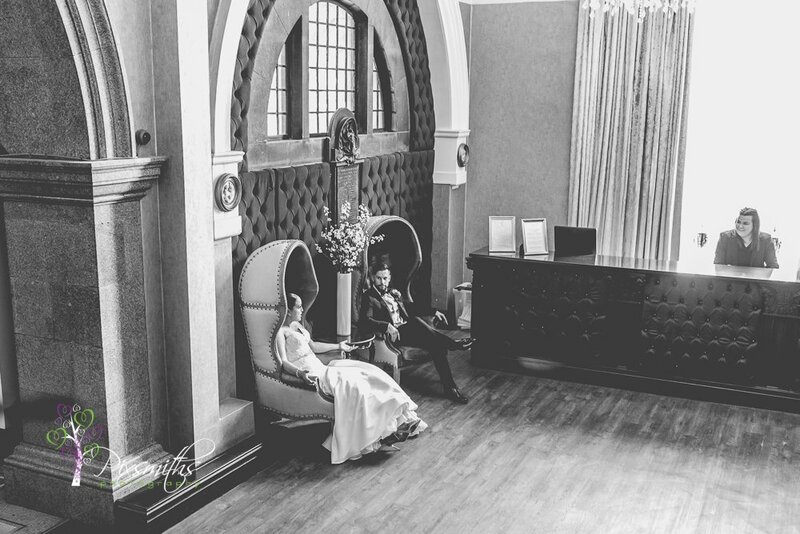 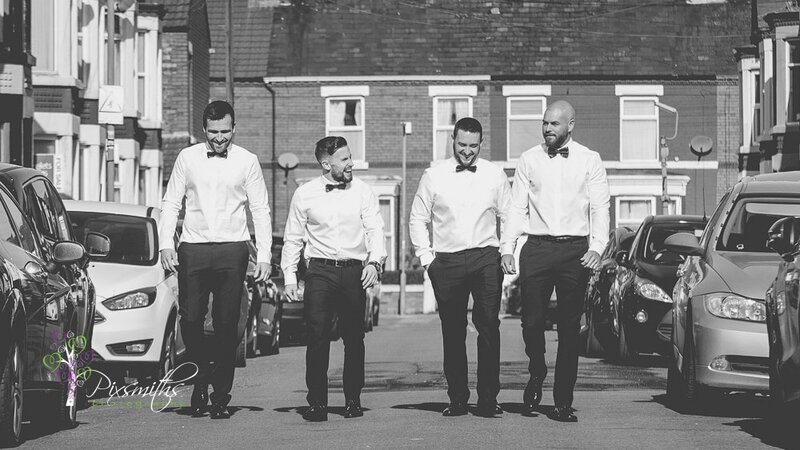 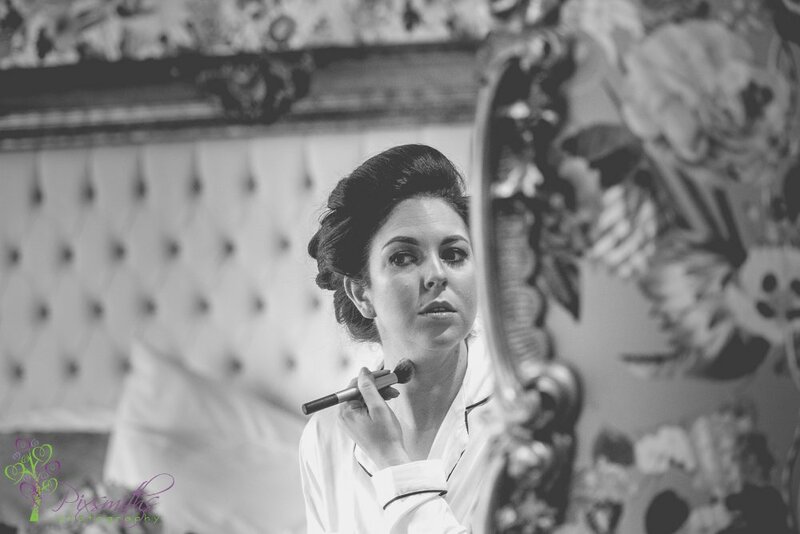 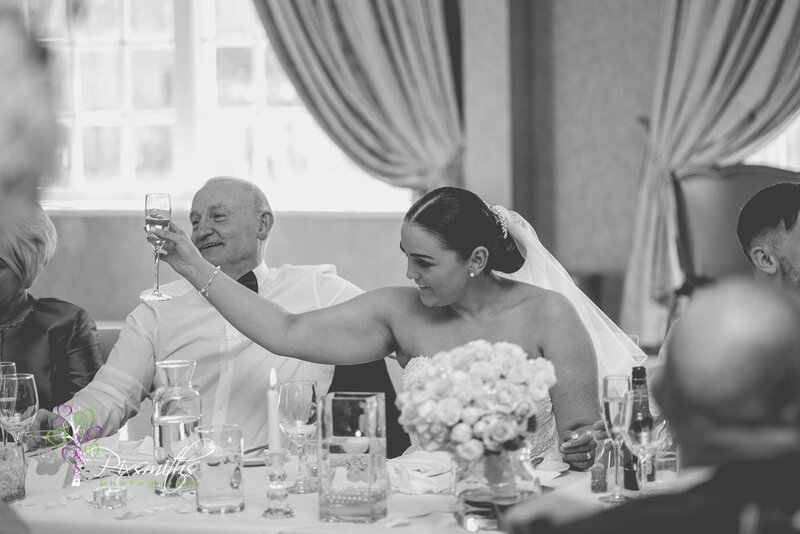 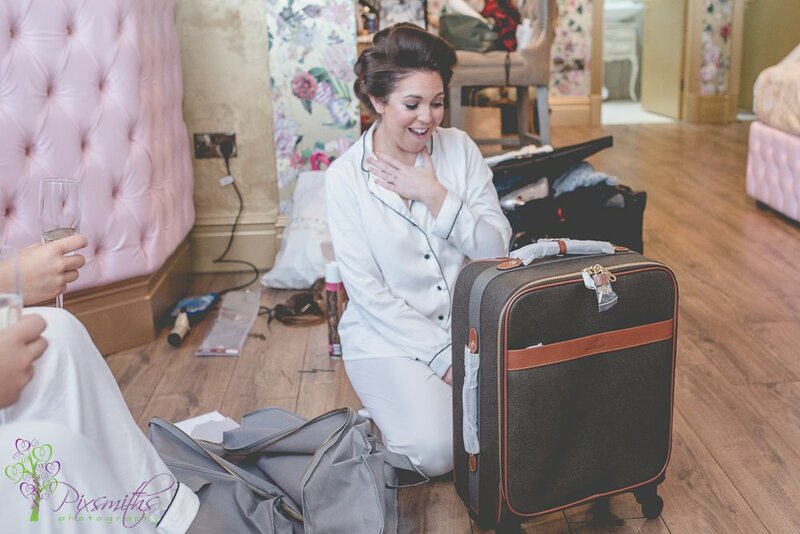 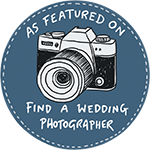 We would always advise to check photographer’s portfolio and are happy this is what Claire and Jamie did when they booked us. 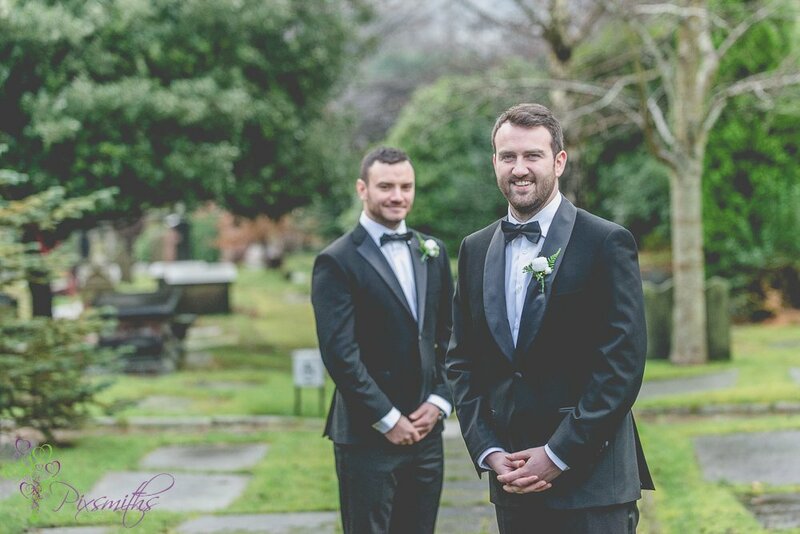 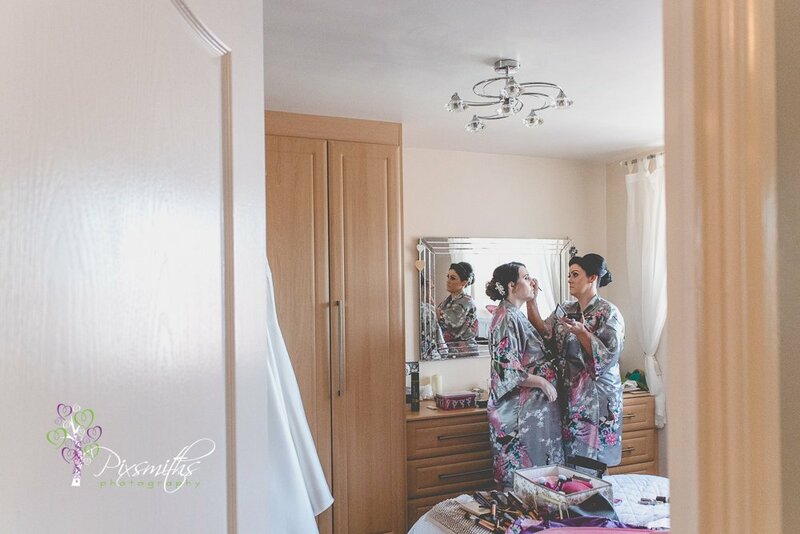 A very cold but dry day for this Liverpool wedding photography. 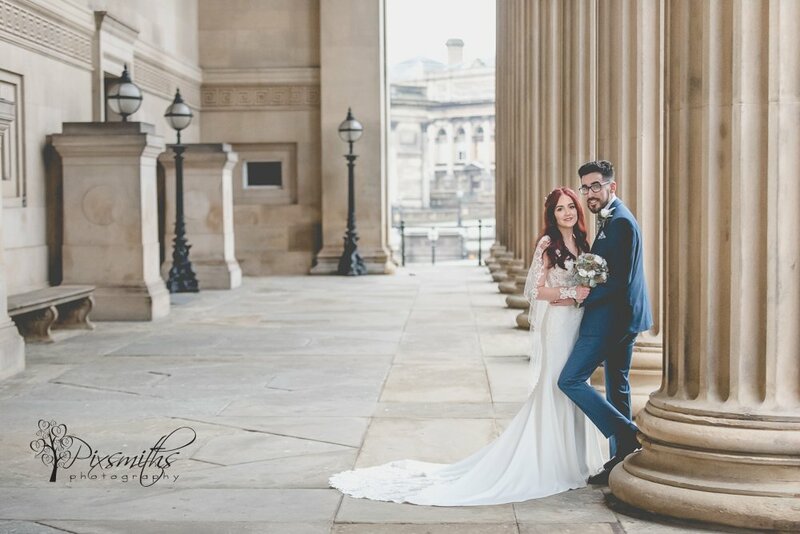 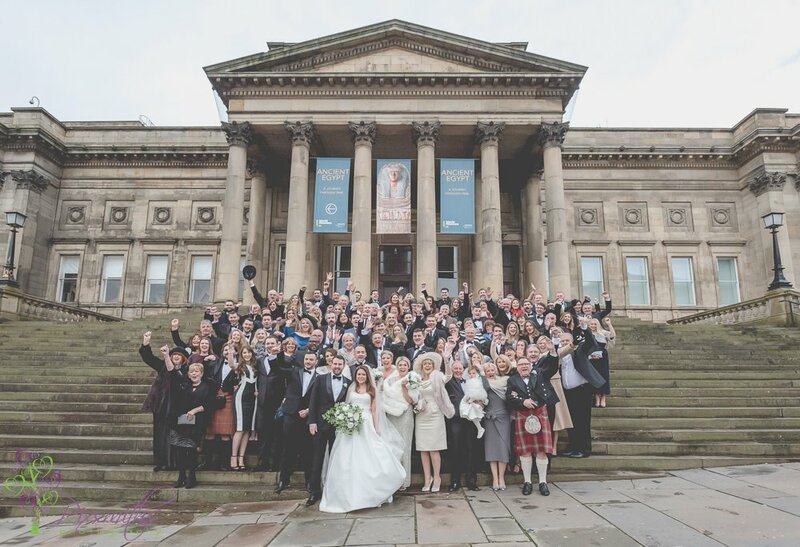 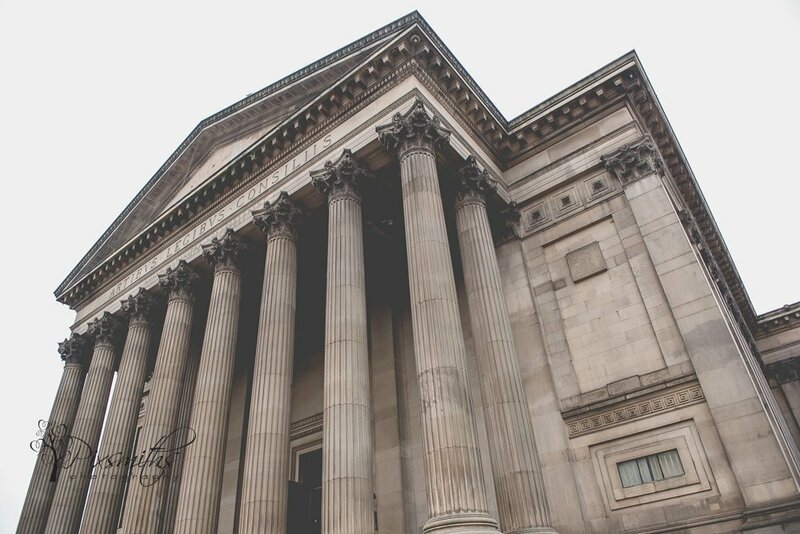 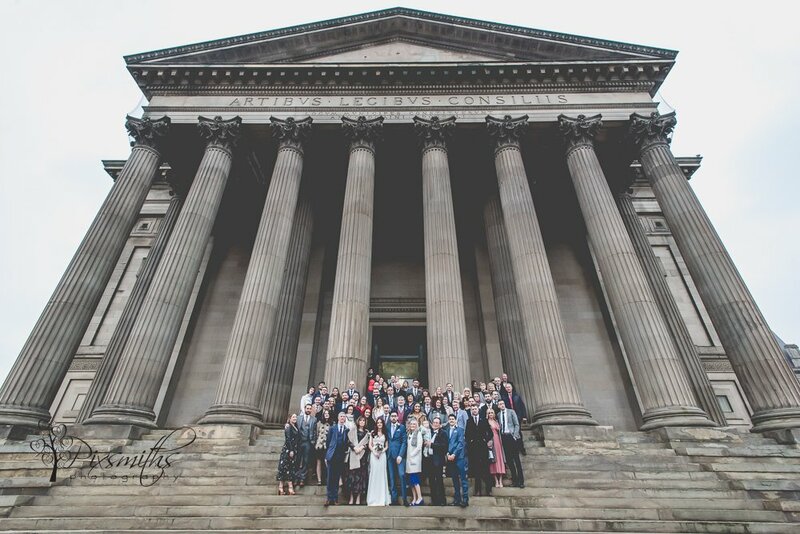 The wedding ceremony took place at the architectural masterpiece of St George’s Hall in Liverpool. 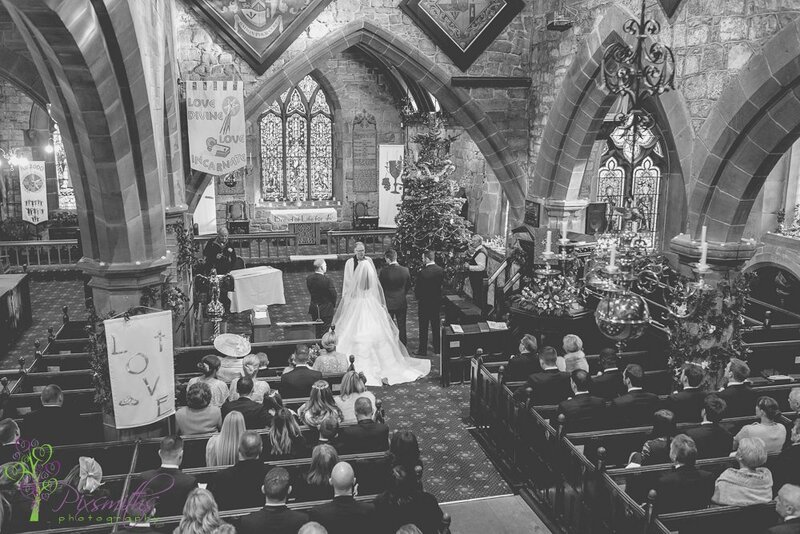 A latish ceremony for a January, so after the 3pm ceremony and light fading as well as being so cold it we quickly got through the few groups as requested. 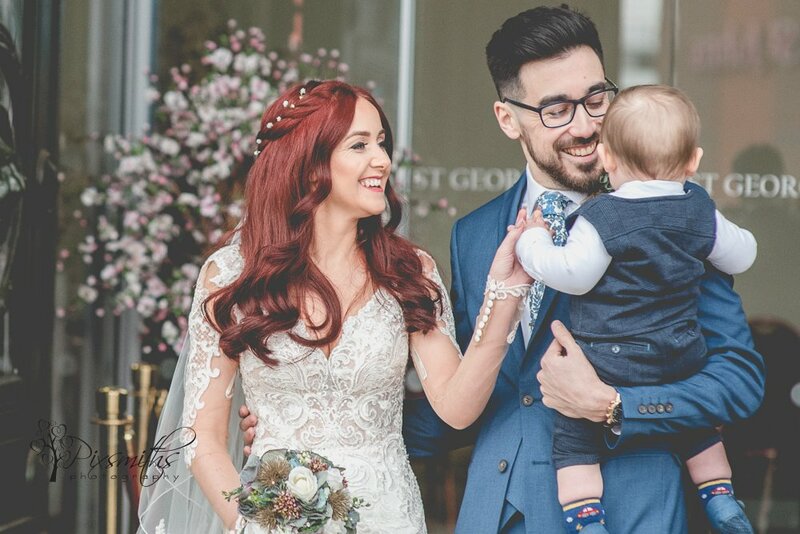 Such happy smiles as they exited with baby Jackson, what a cute family! 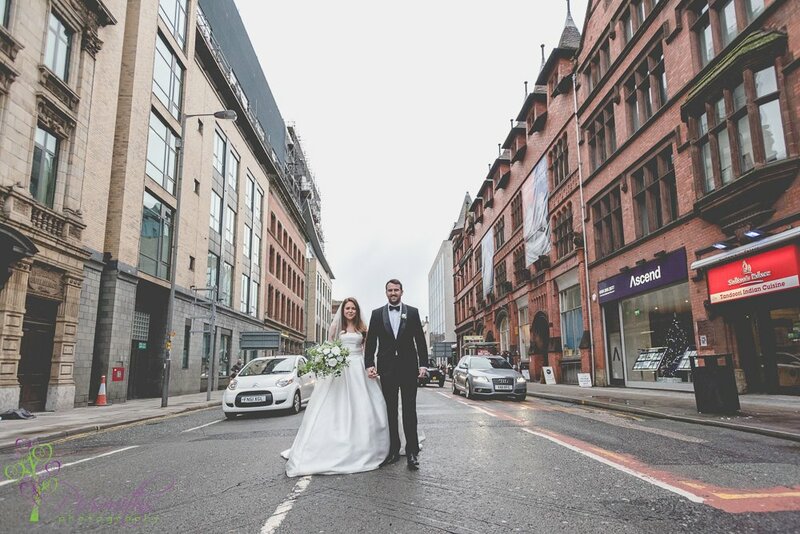 Off went the newlywed to their reception and we followed soon after in a taxi. 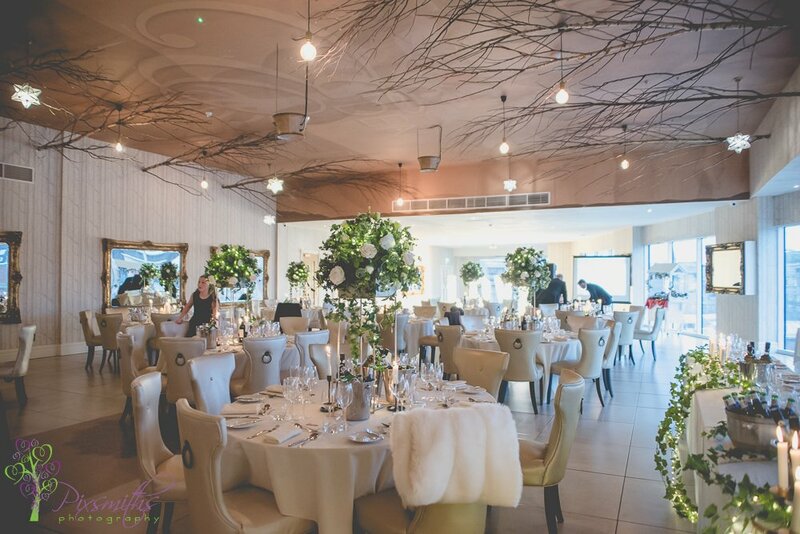 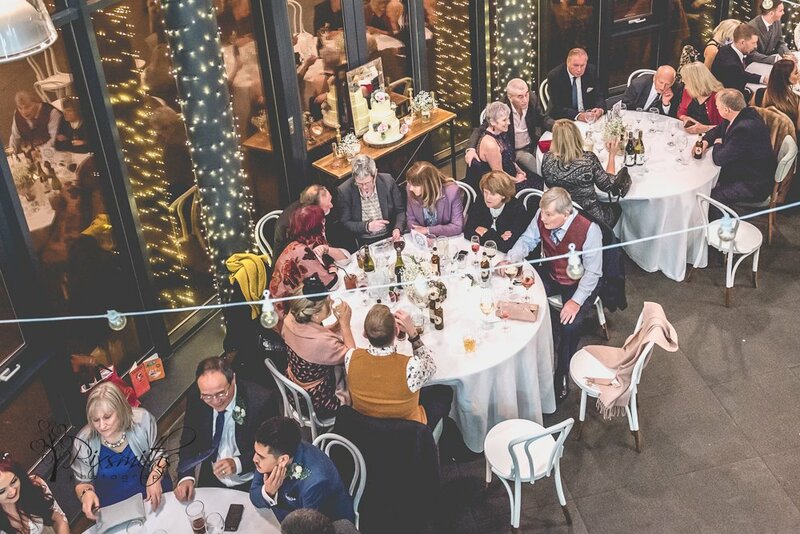 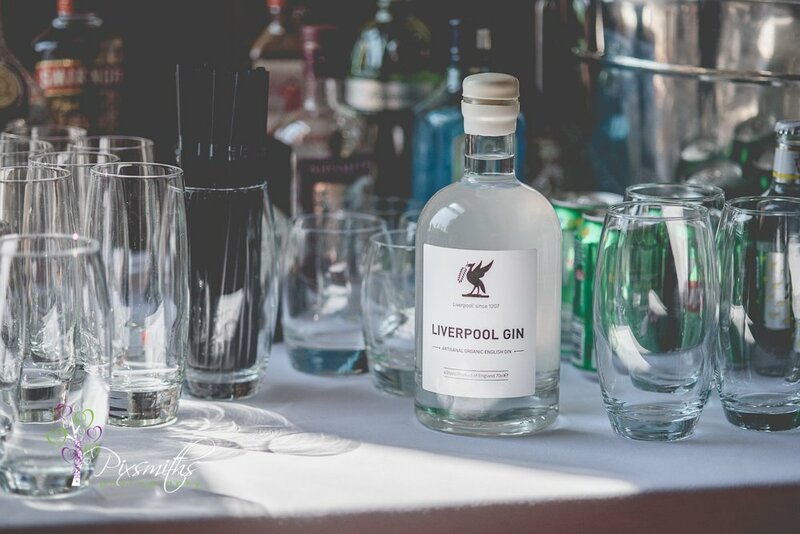 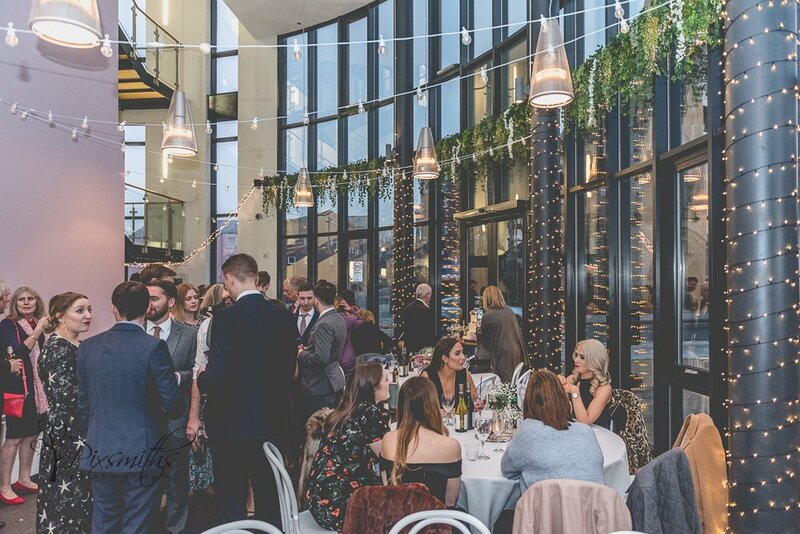 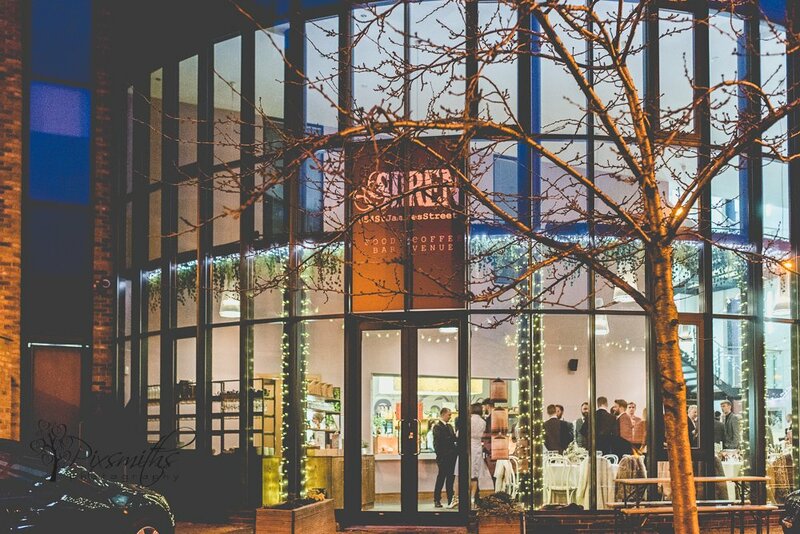 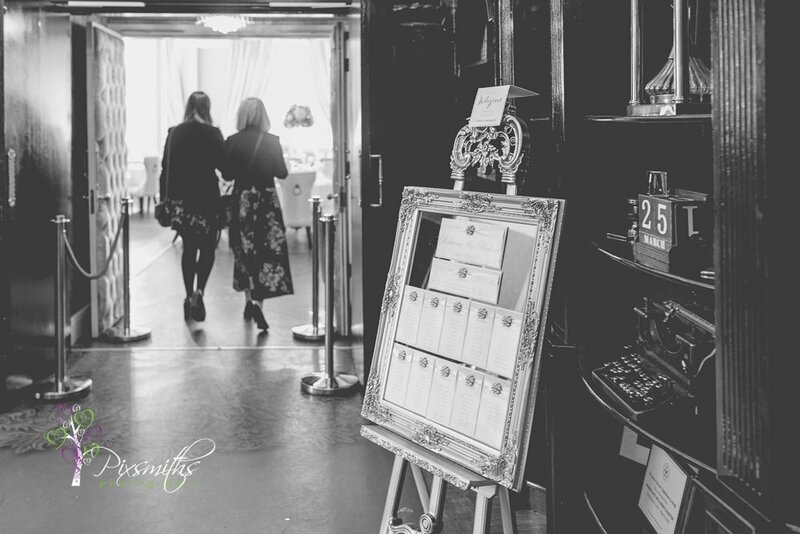 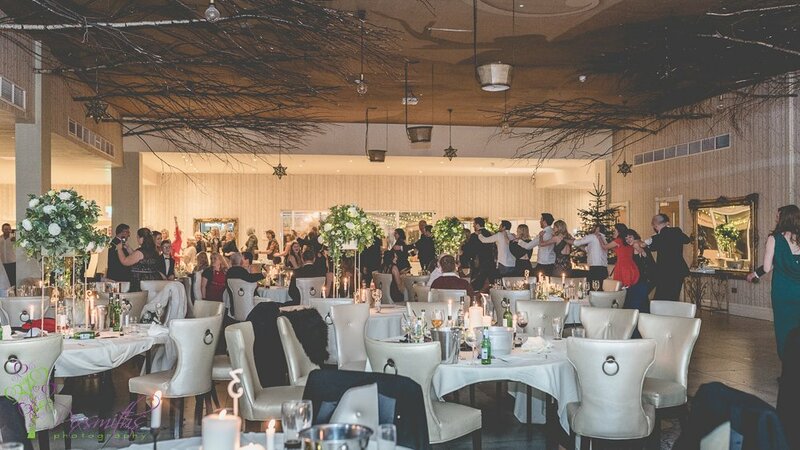 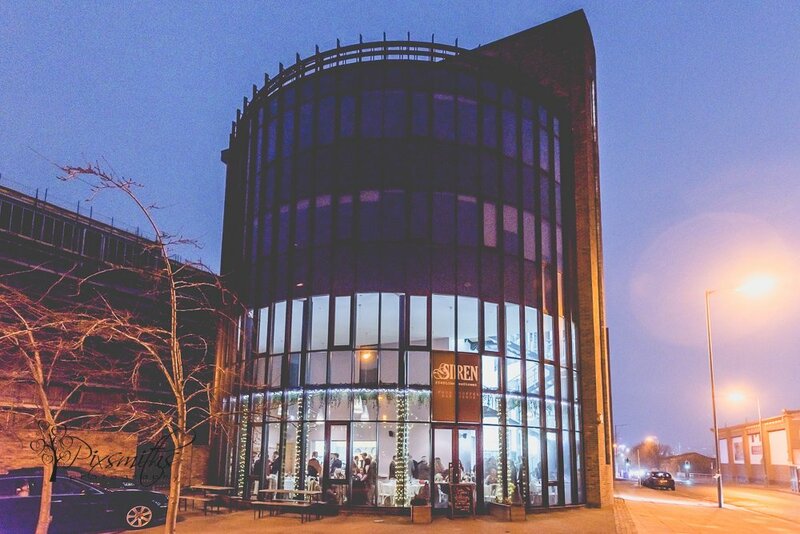 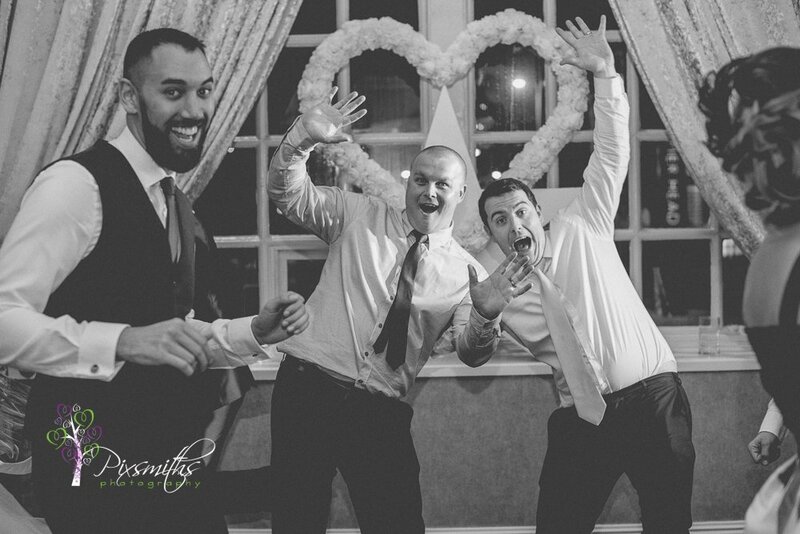 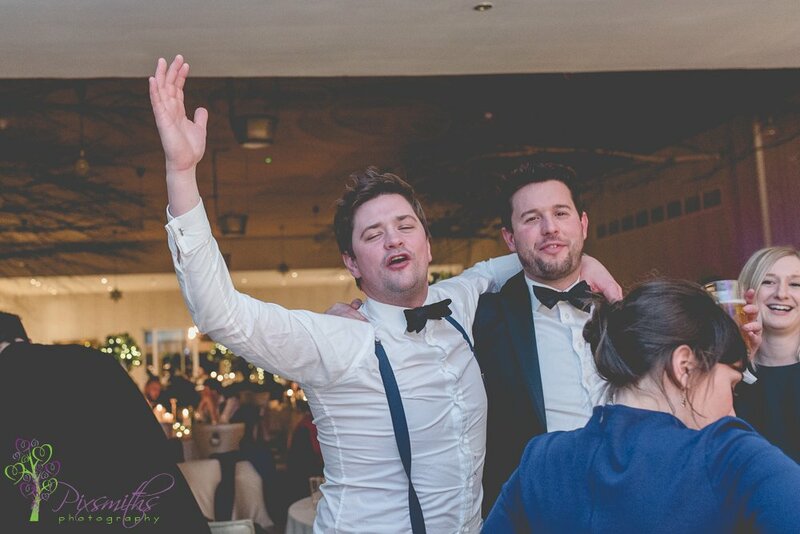 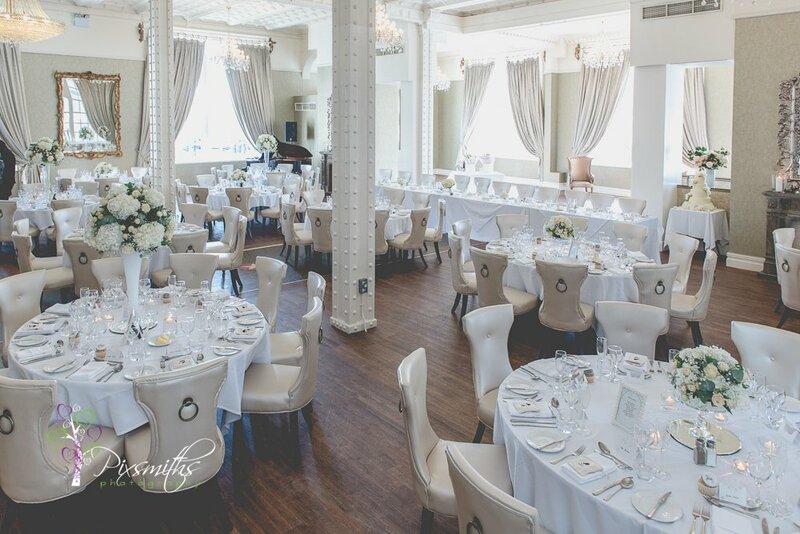 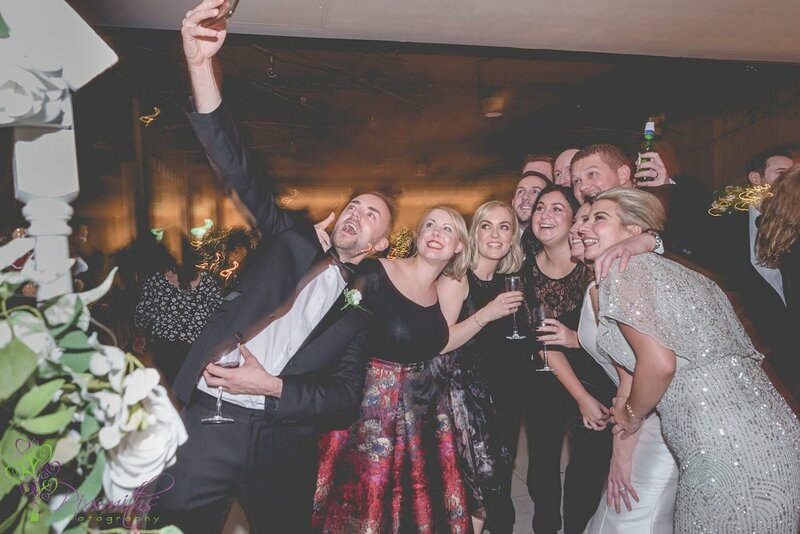 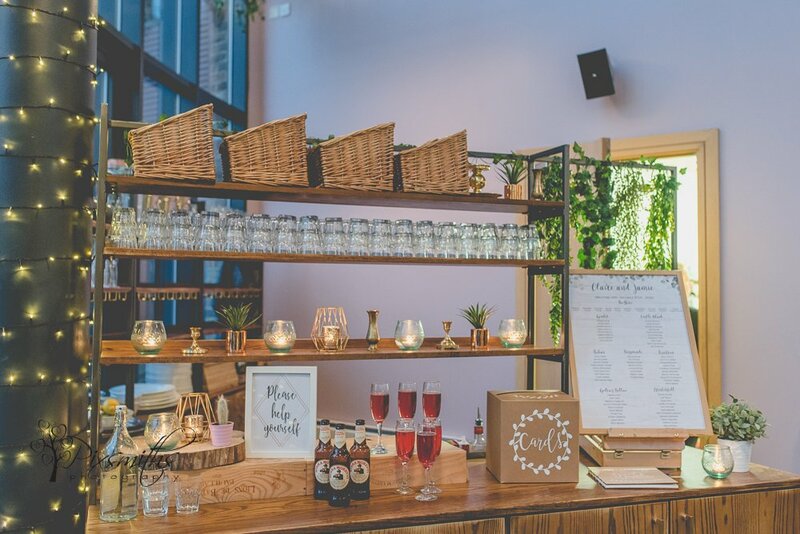 The reception took place at Siren, in the Baltic triangle area of Liverpool. 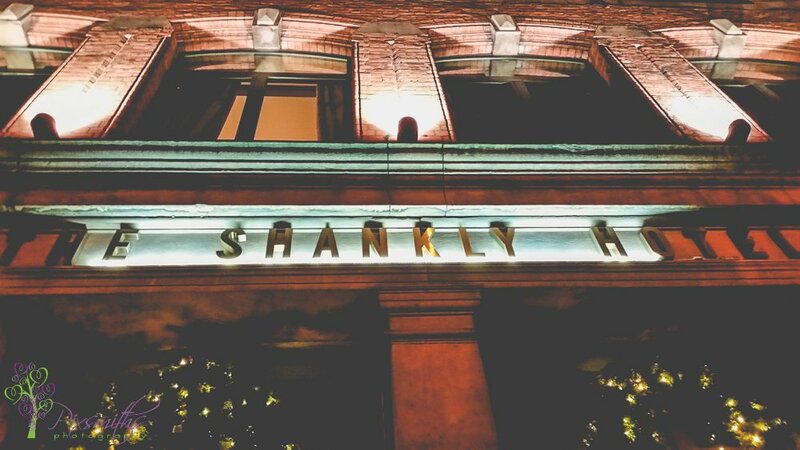 A new Liverpool venue for us and what a little gem it is. 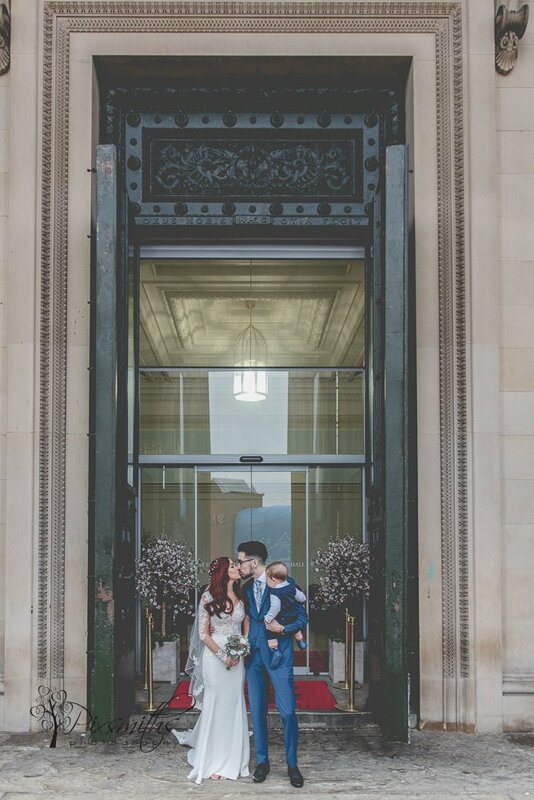 I hope we are back at this venue again. 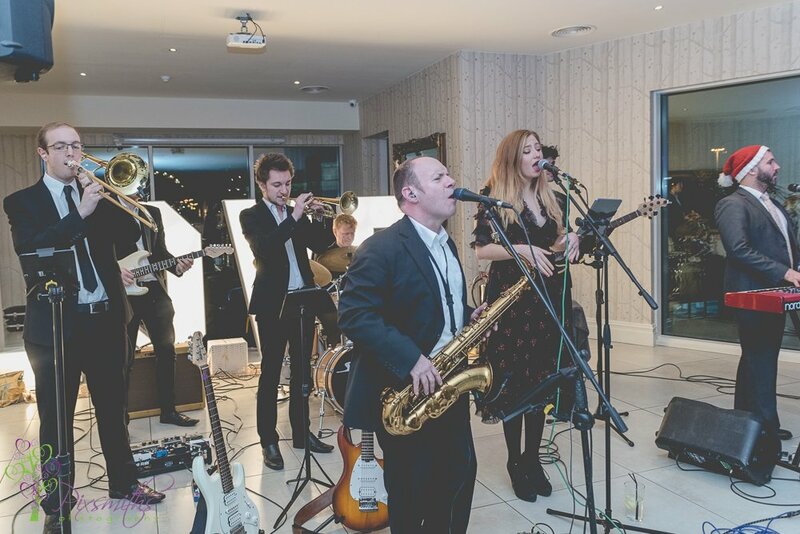 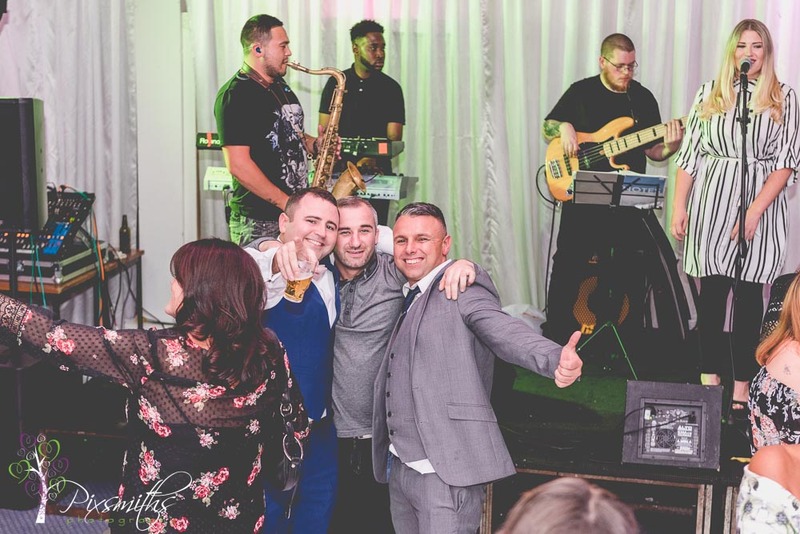 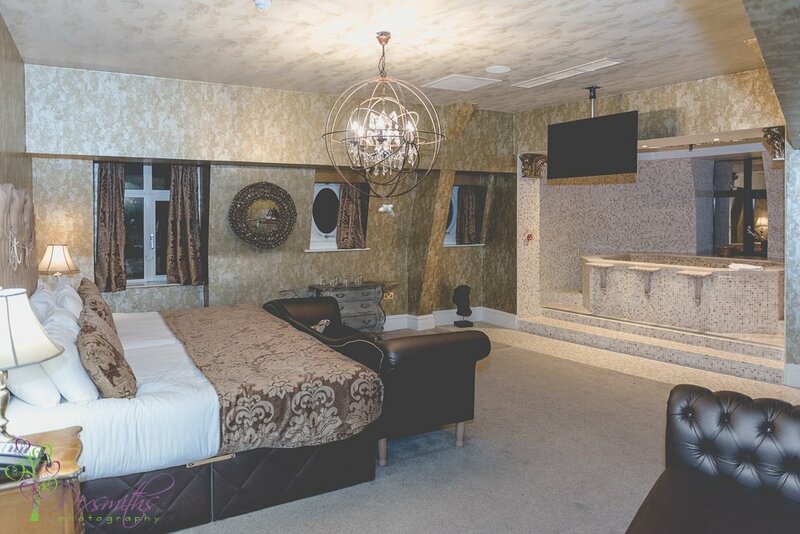 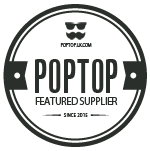 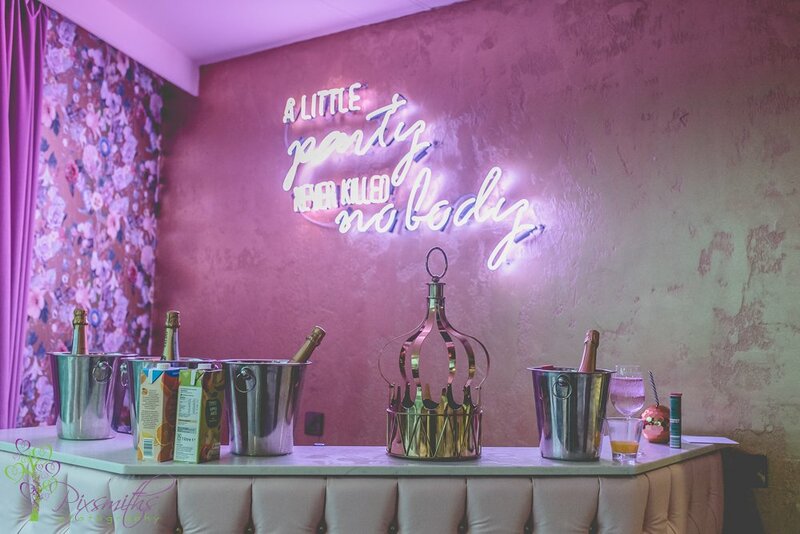 Siren can be booked for exclusive use, making it a great party venue. 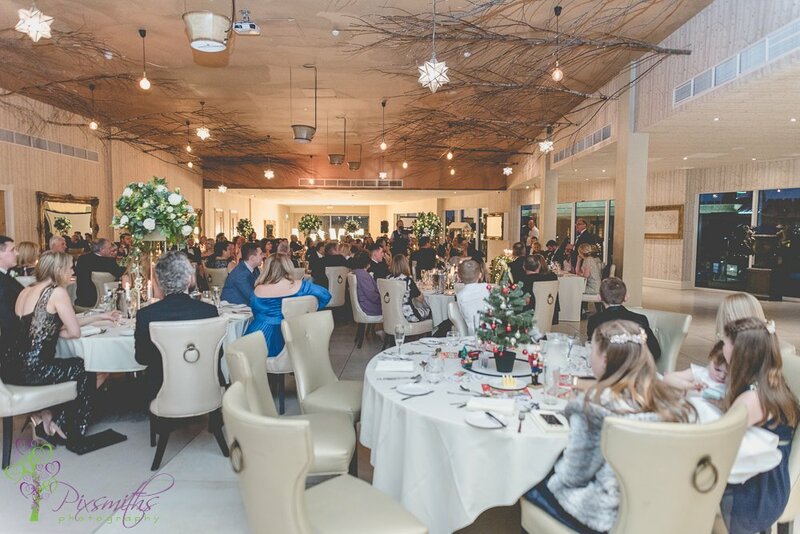 The building is adorned with twinkly lights inside creating a wonderful and warm ambience. 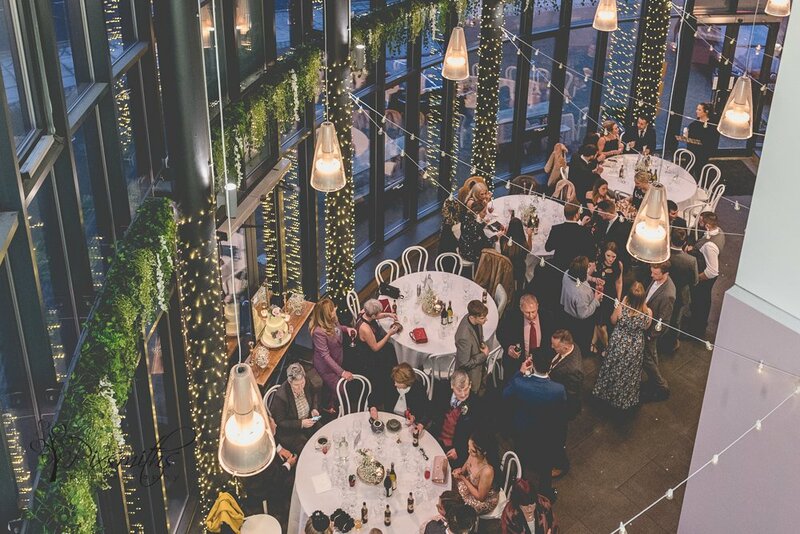 There is a roof terrace – but with the cold opted not to go up. 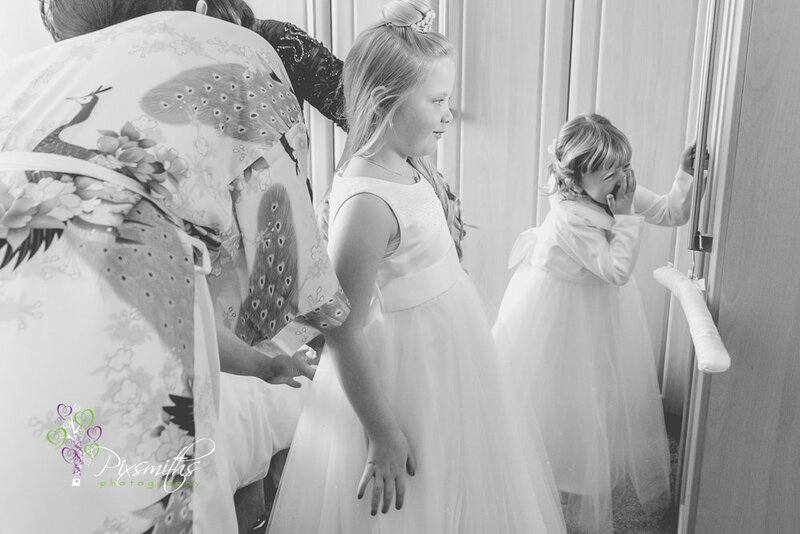 It was a good plan to get all family shots after the ceremony and then people enjoy the reception. 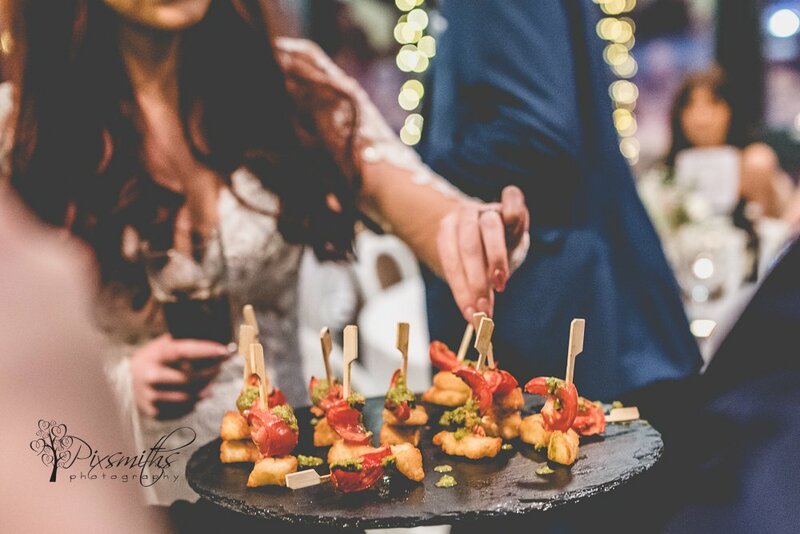 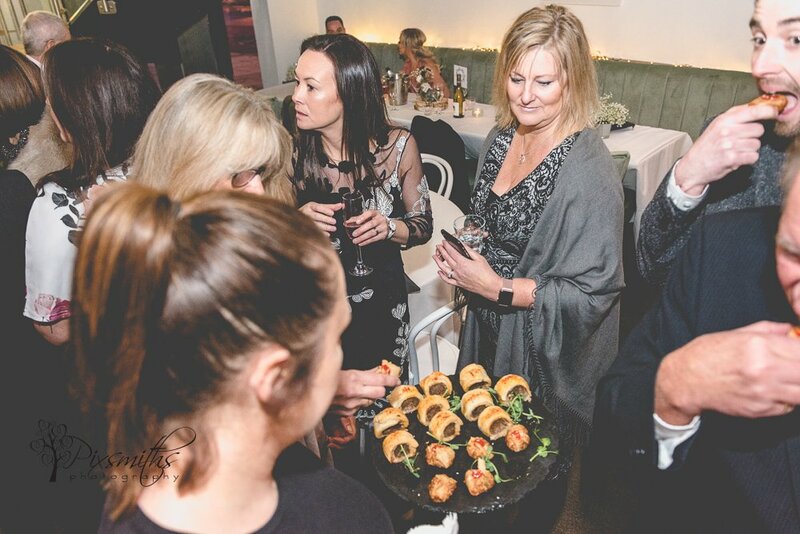 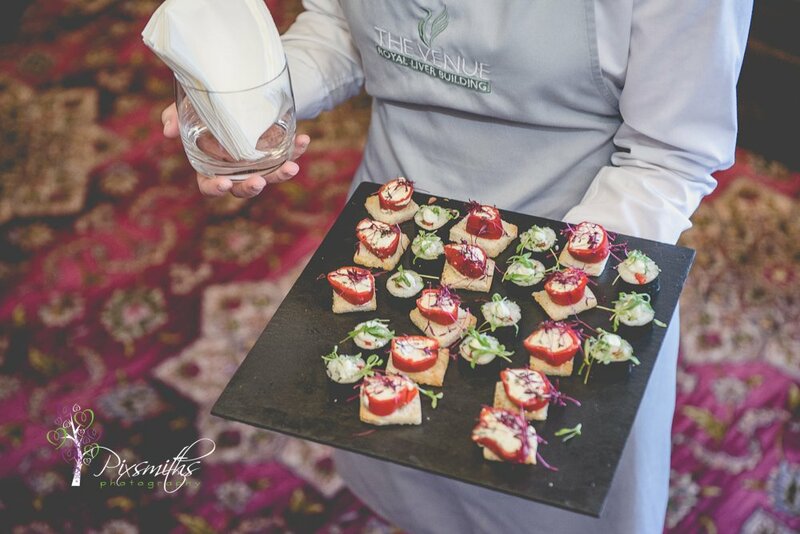 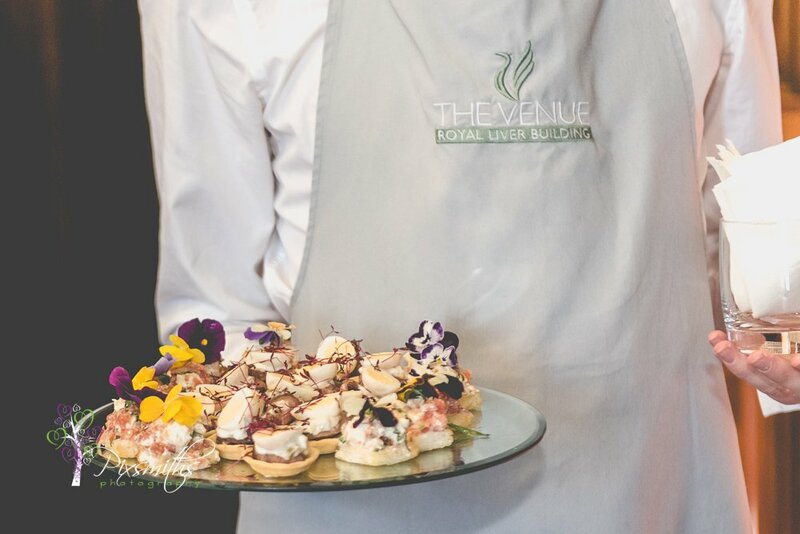 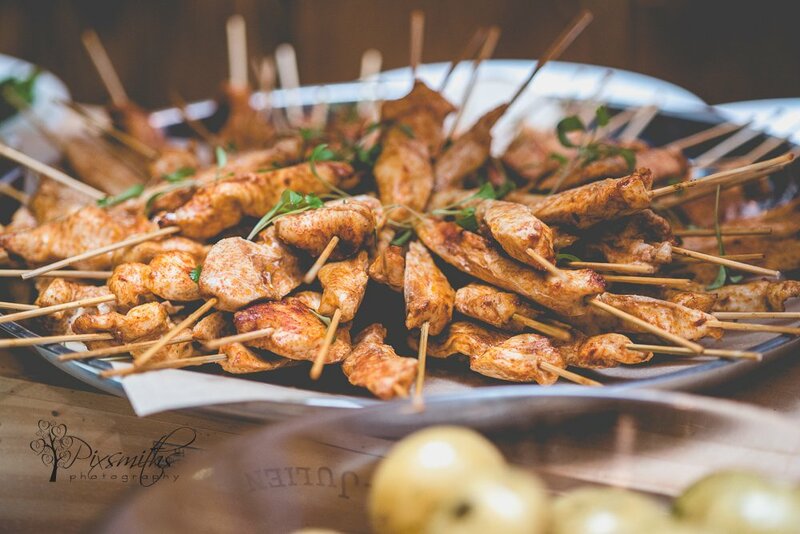 The canapés and food looked amazing, so well done to the caterers at Siren. 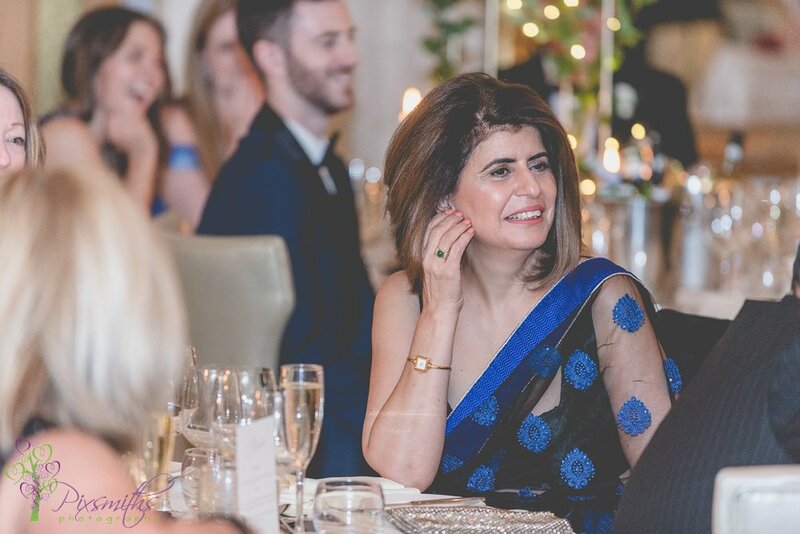 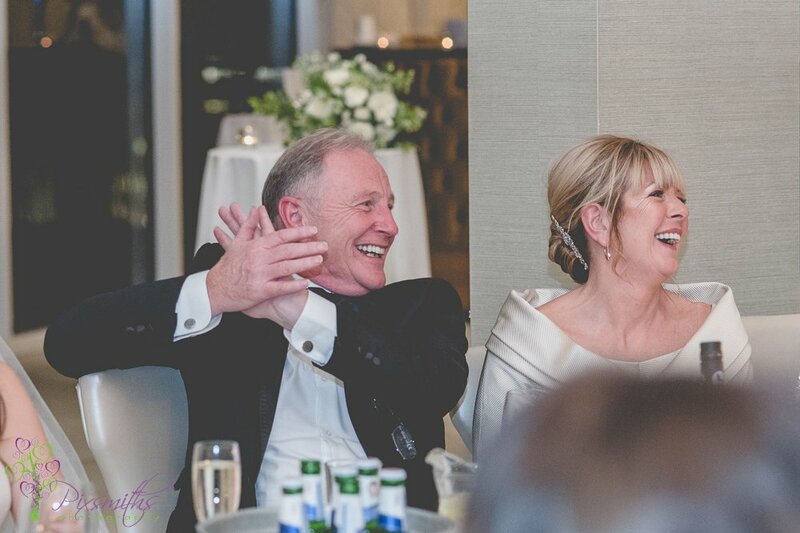 We enjoyed mingling with the guests, taking plenty of candid shots before they sat down for the meal. 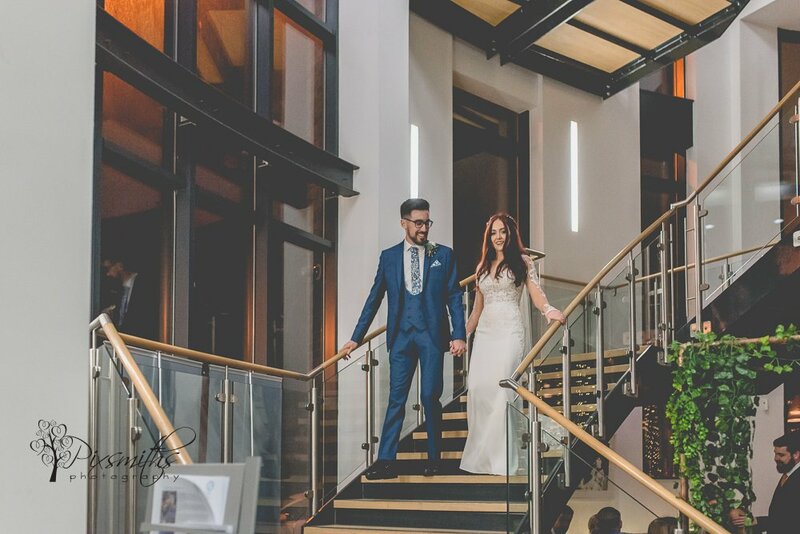 We left then for them to enjoy the evening reception there. 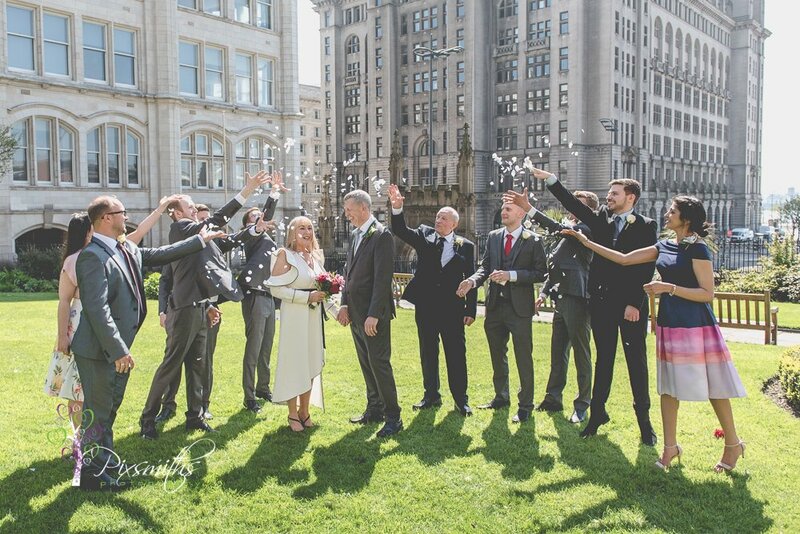 Rob & Rebecca’s wedding with Pearls, Dinosaurs and Sunny Skies! 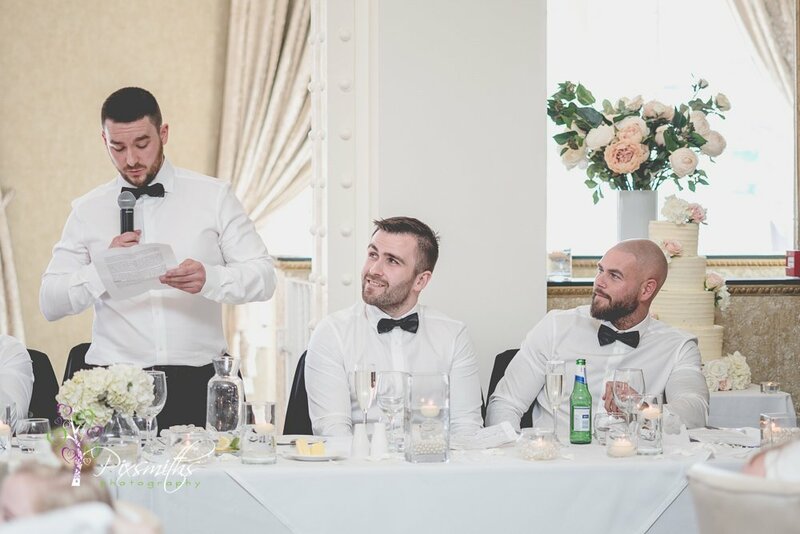 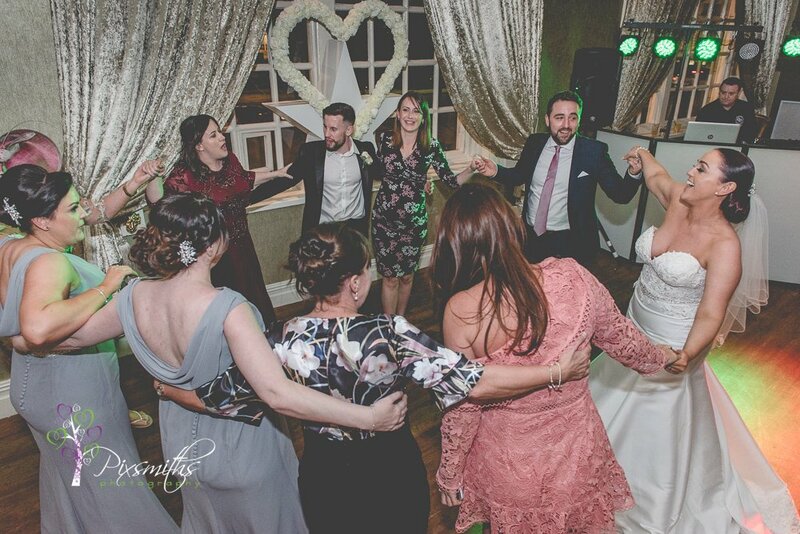 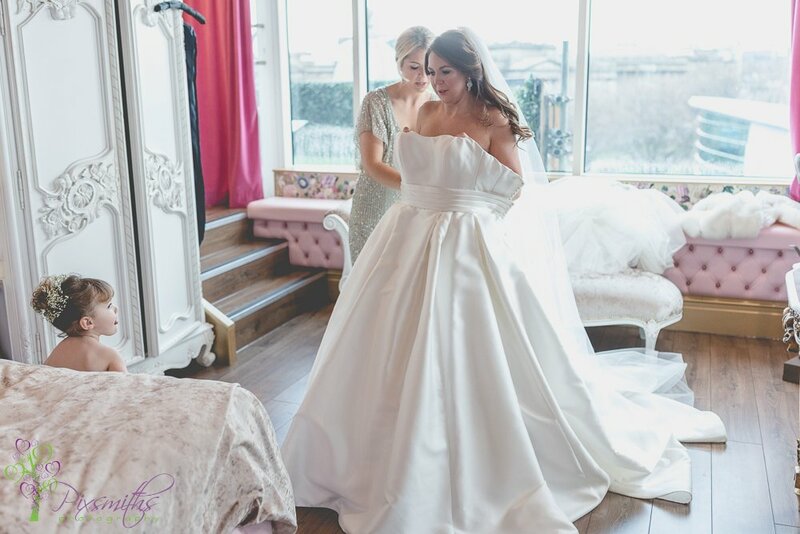 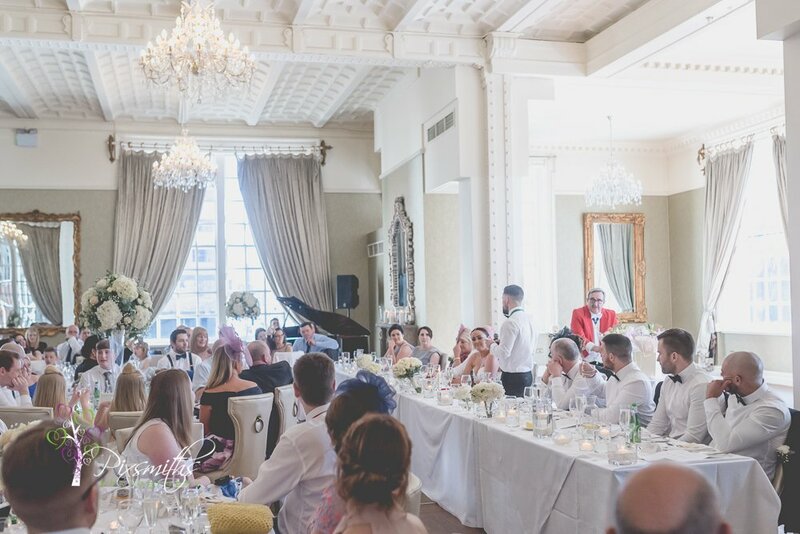 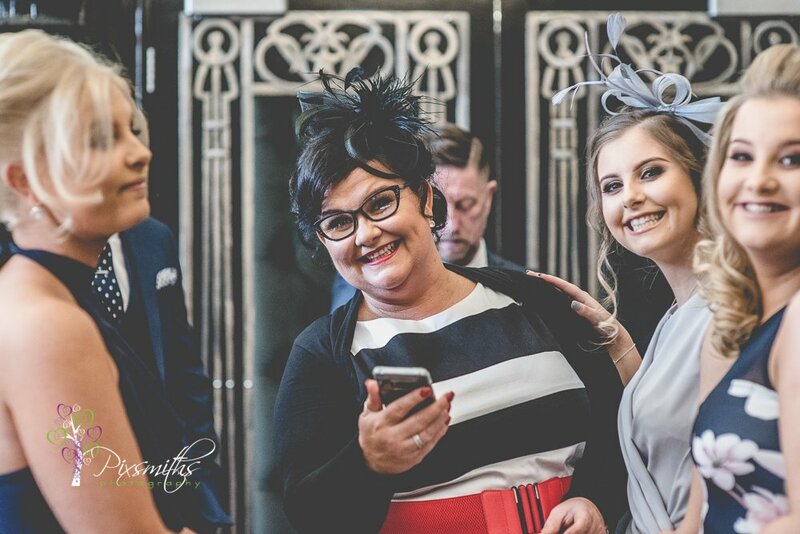 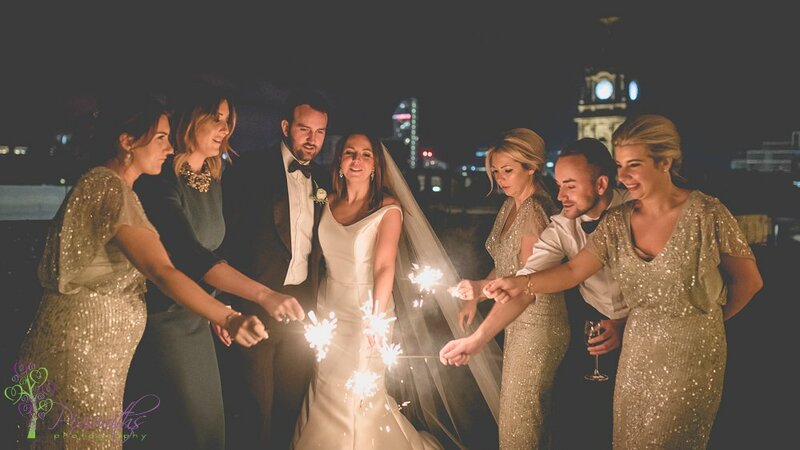 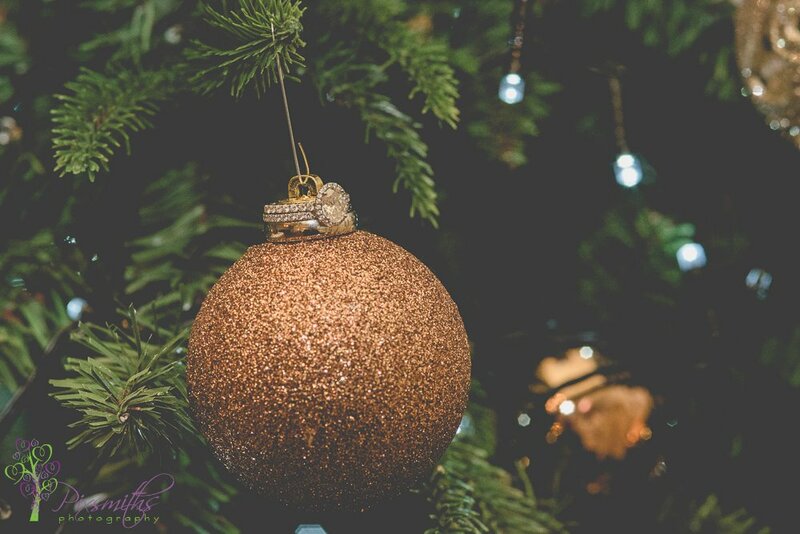 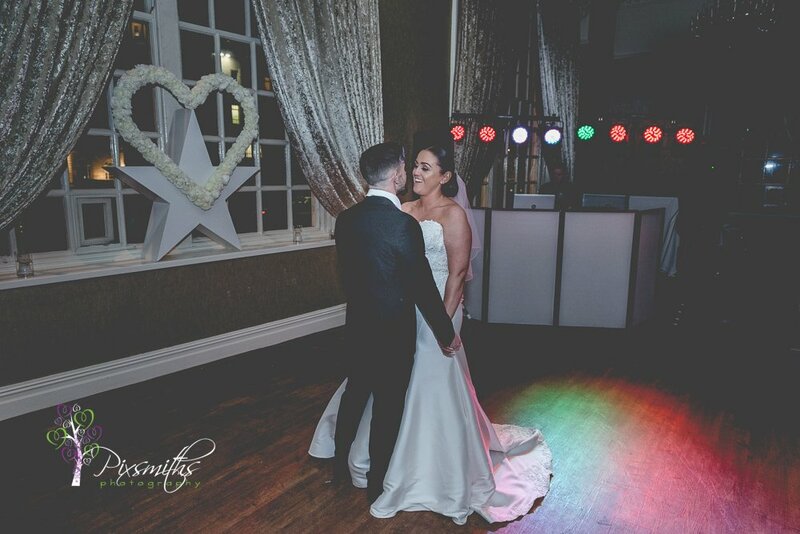 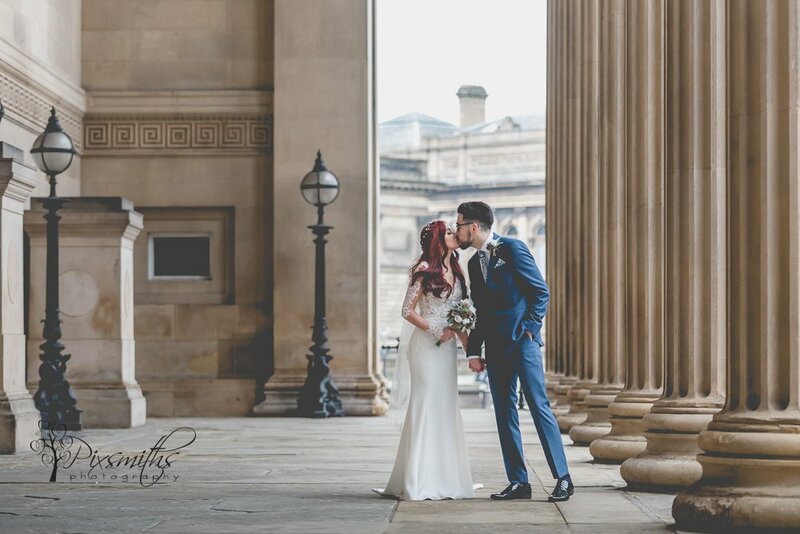 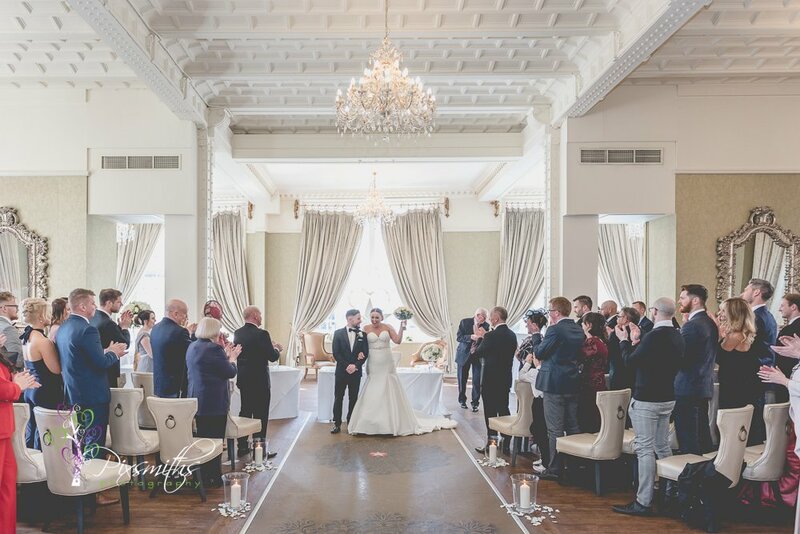 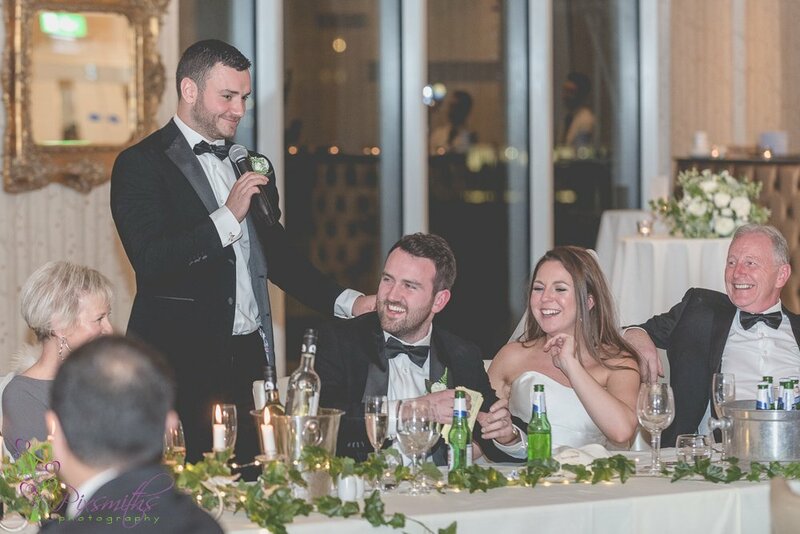 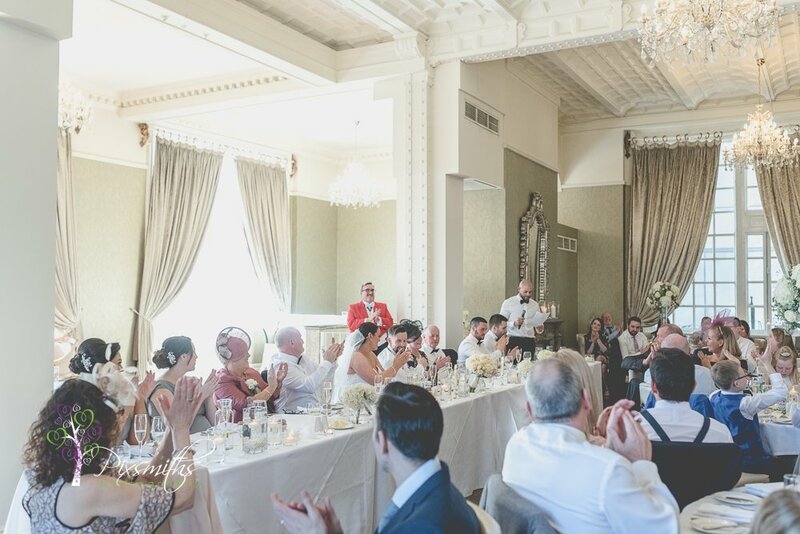 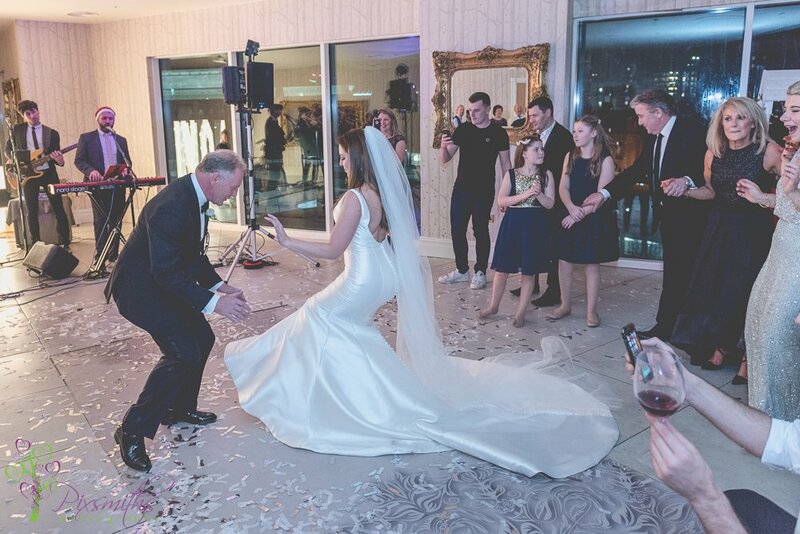 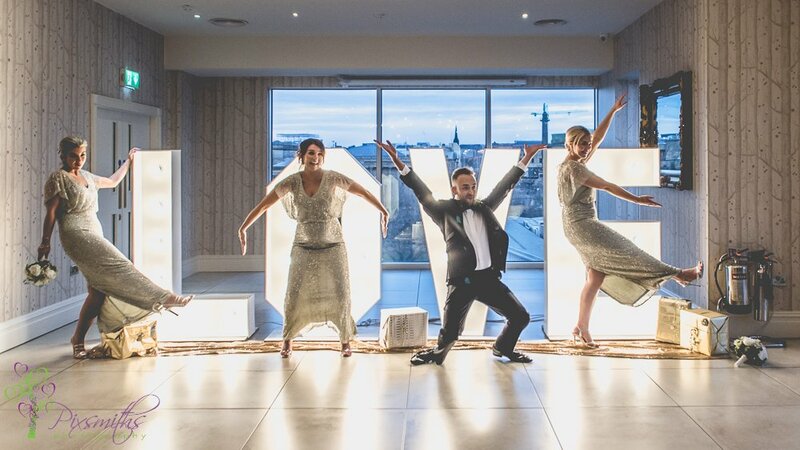 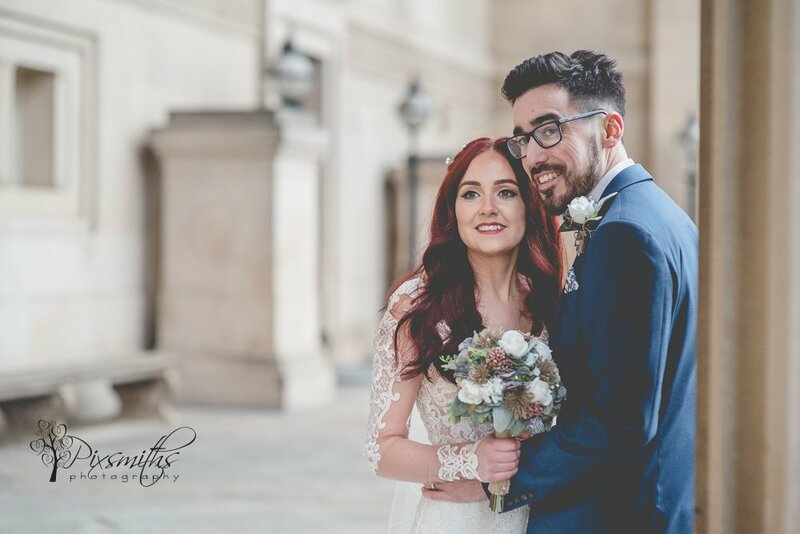 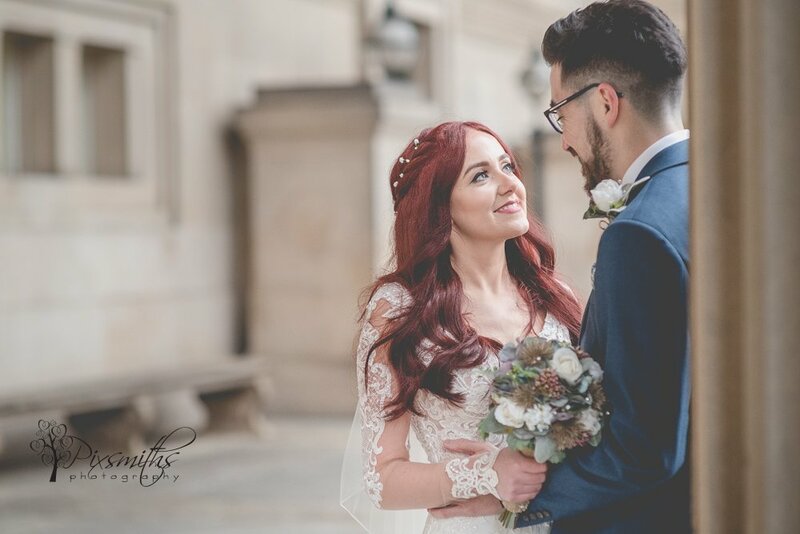 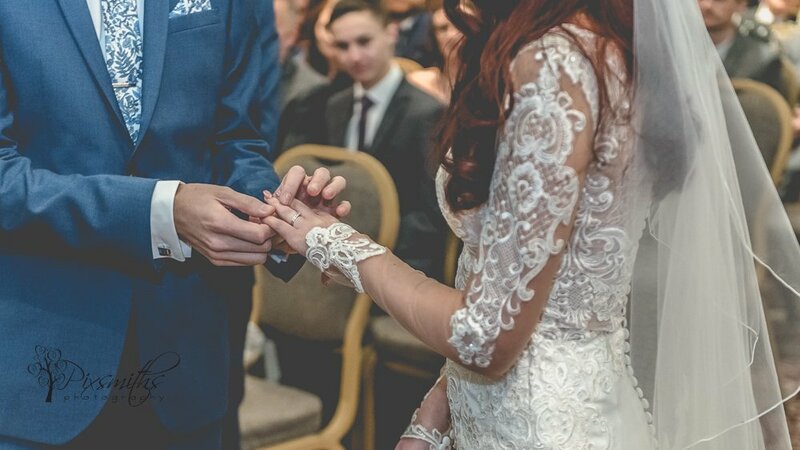 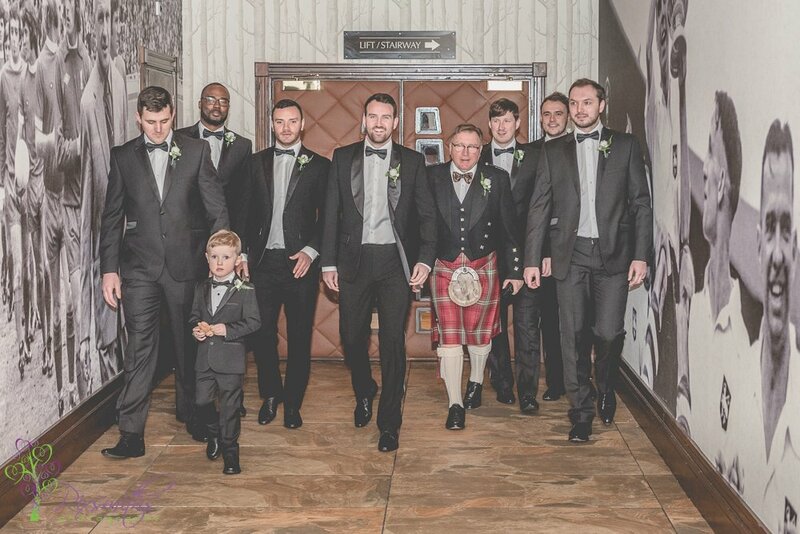 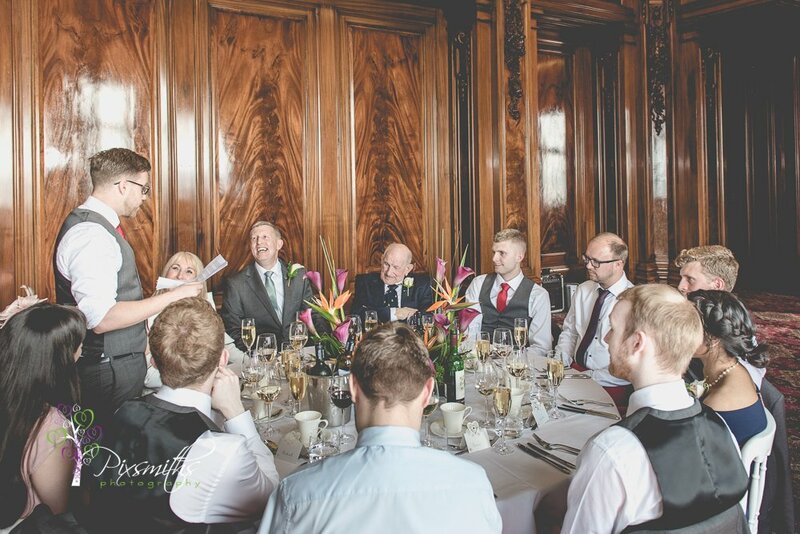 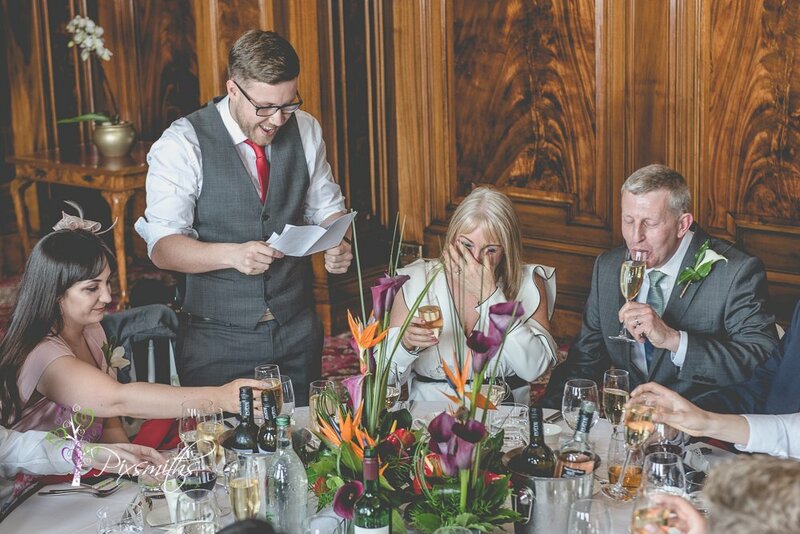 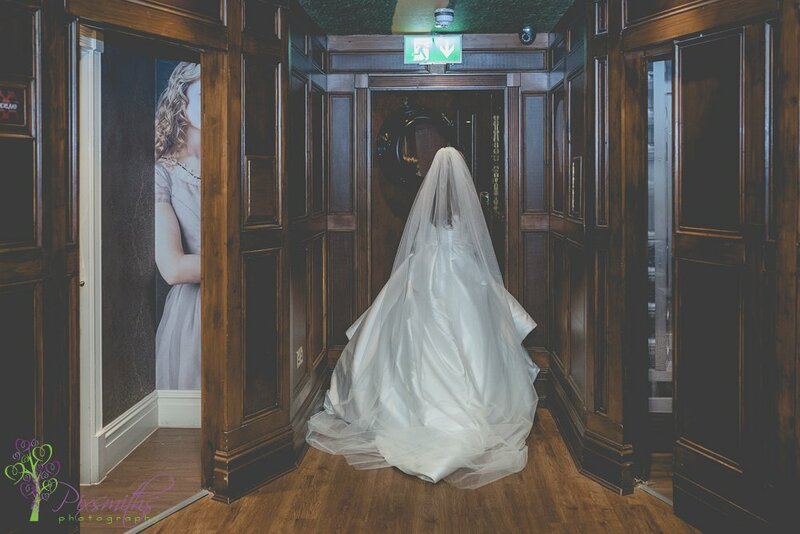 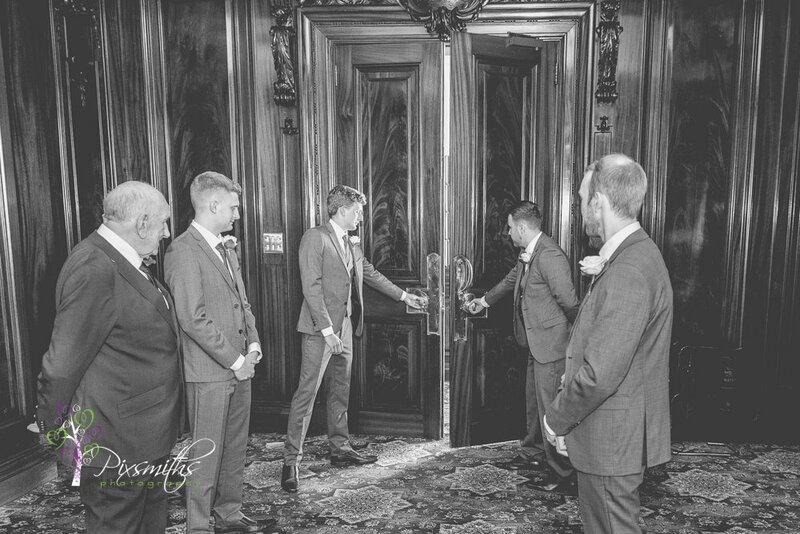 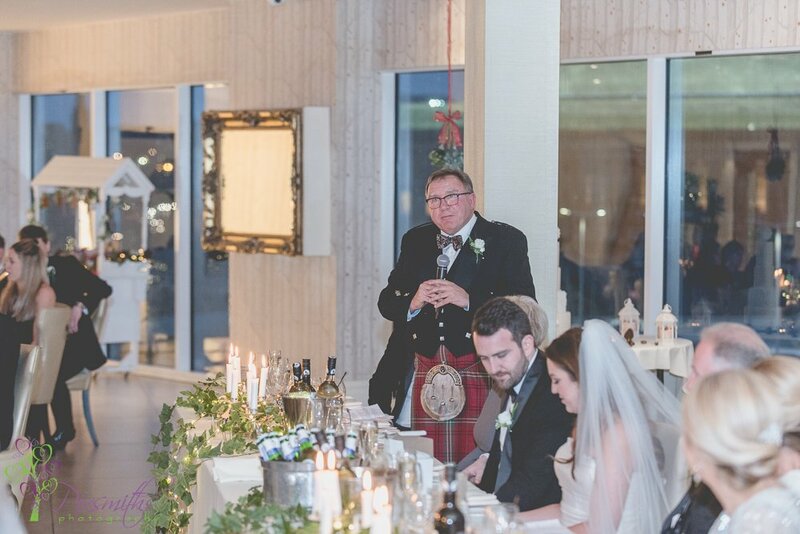 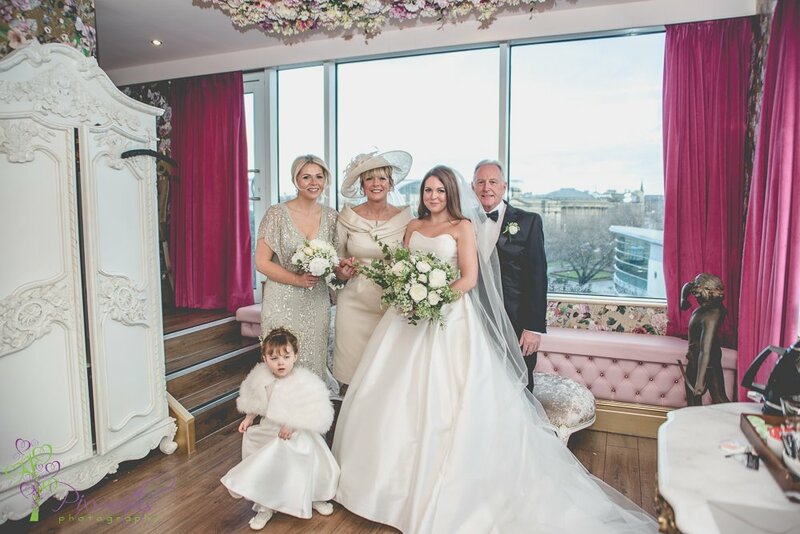 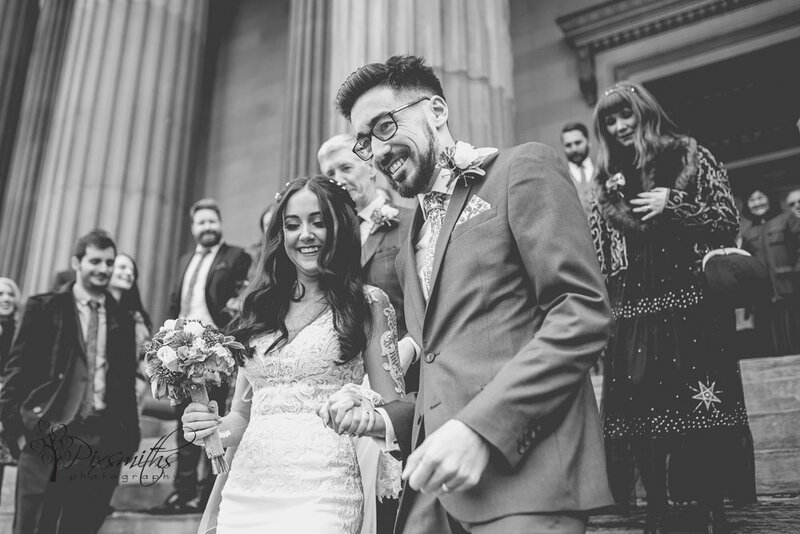 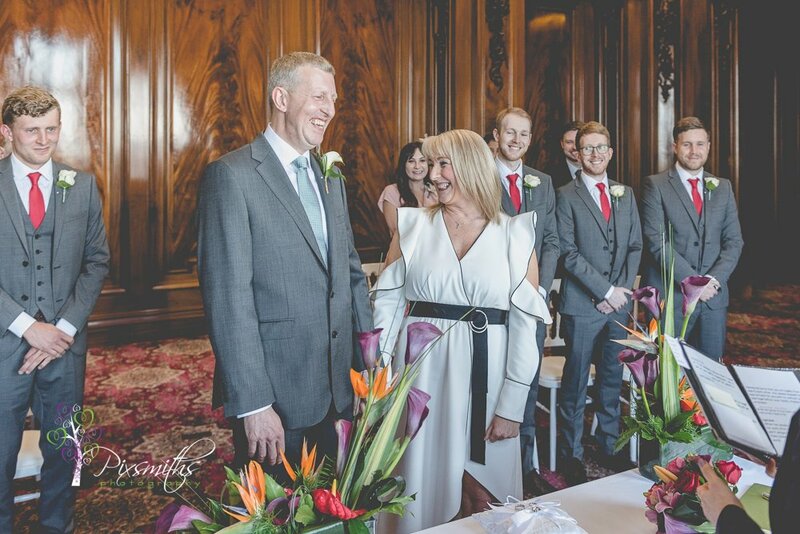 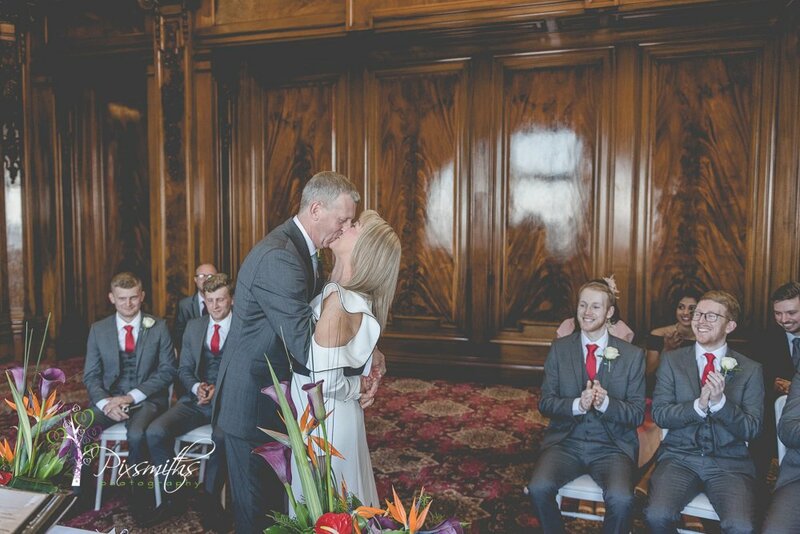 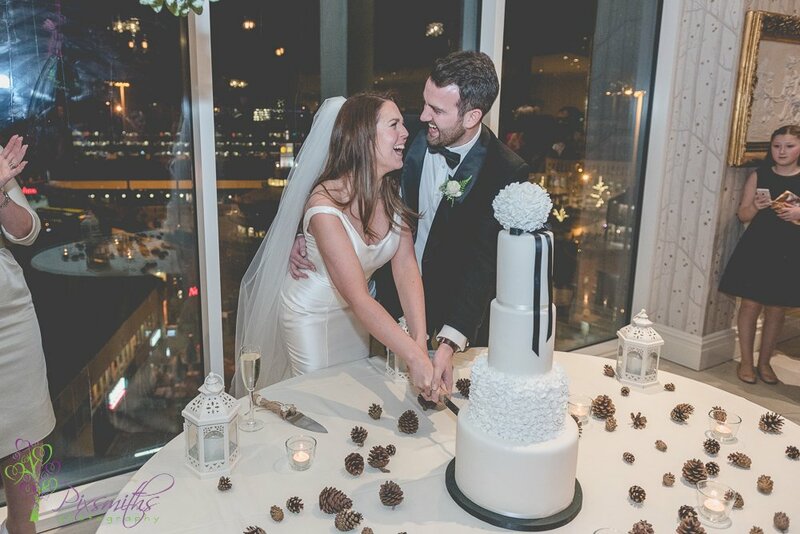 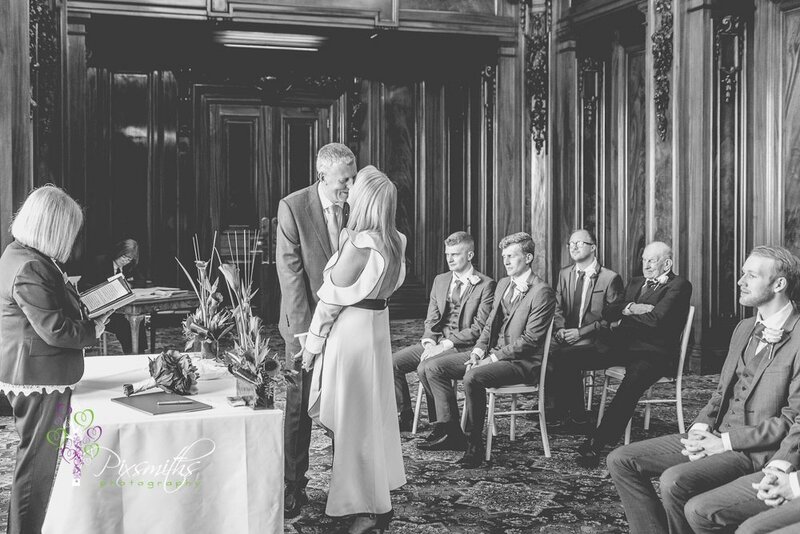 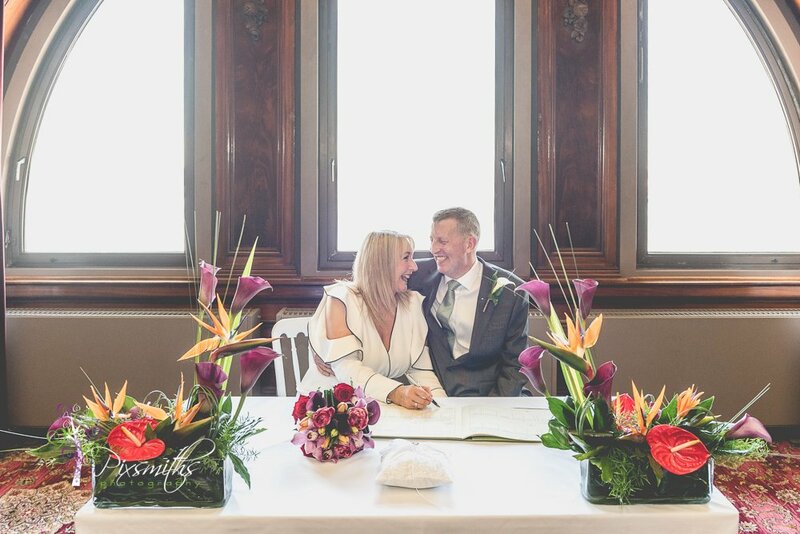 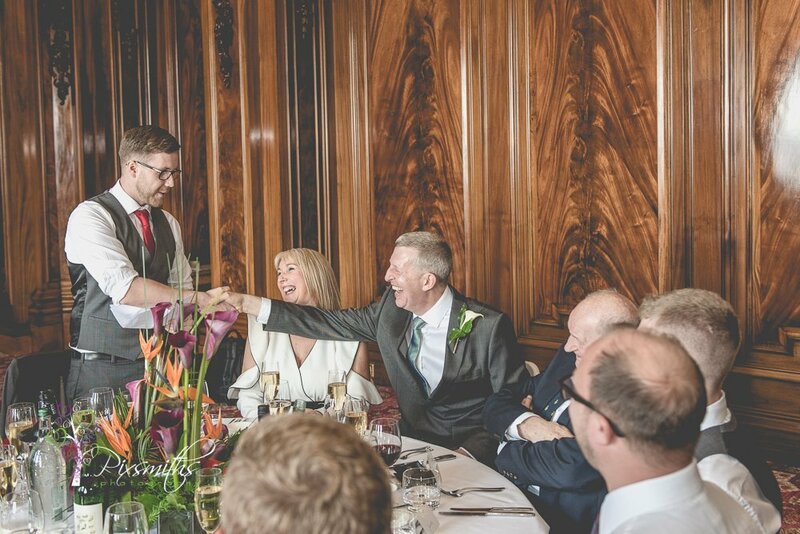 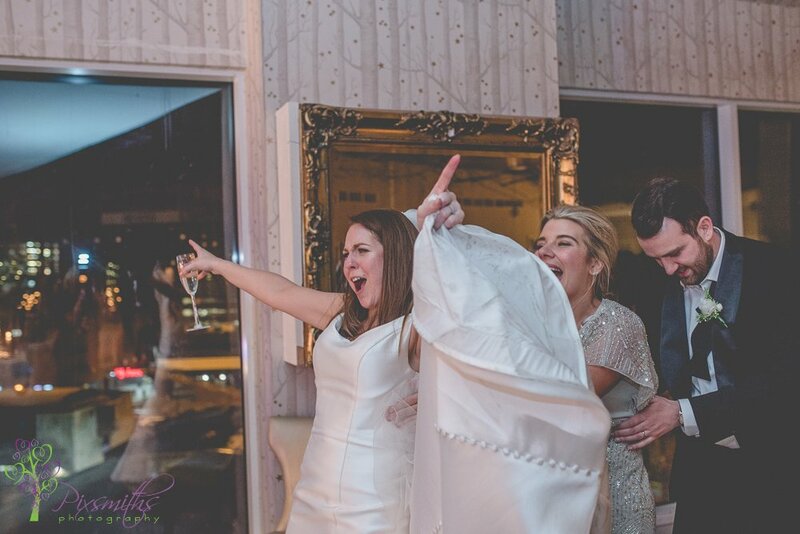 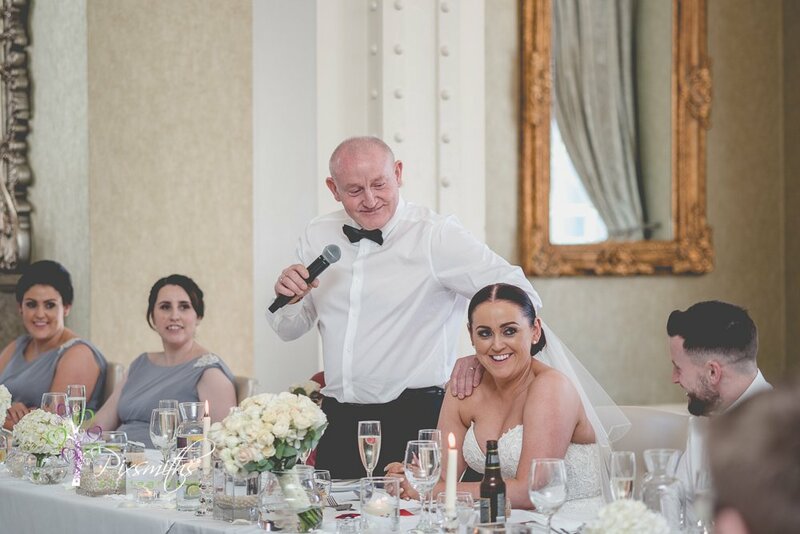 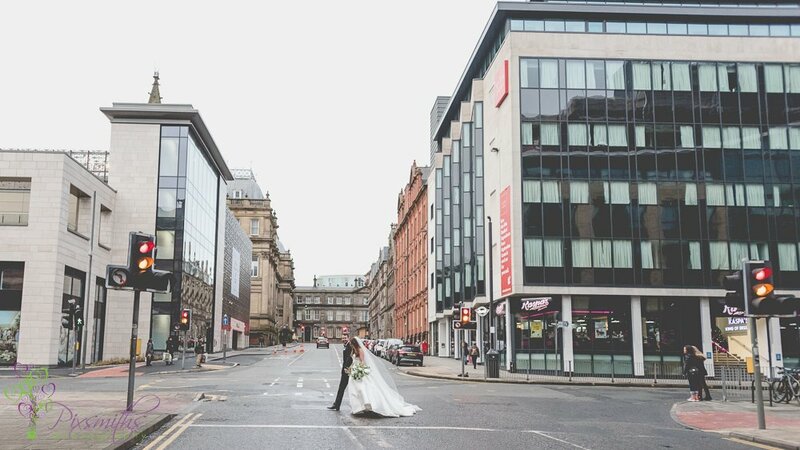 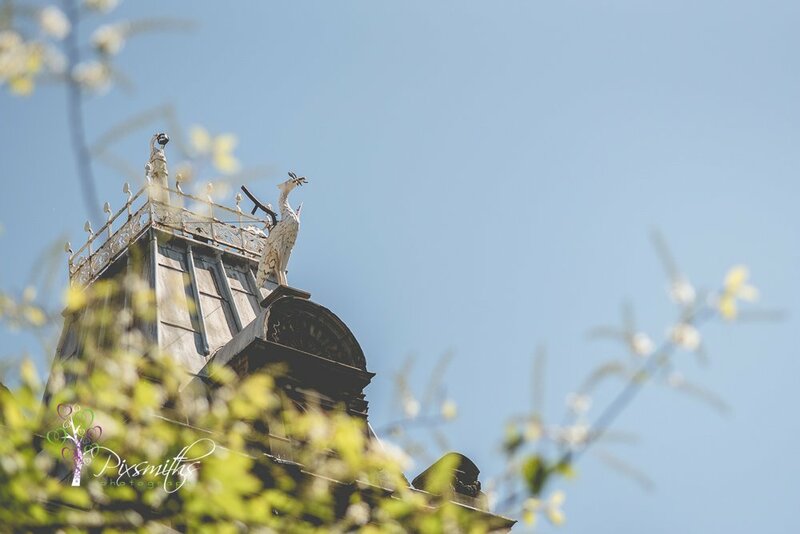 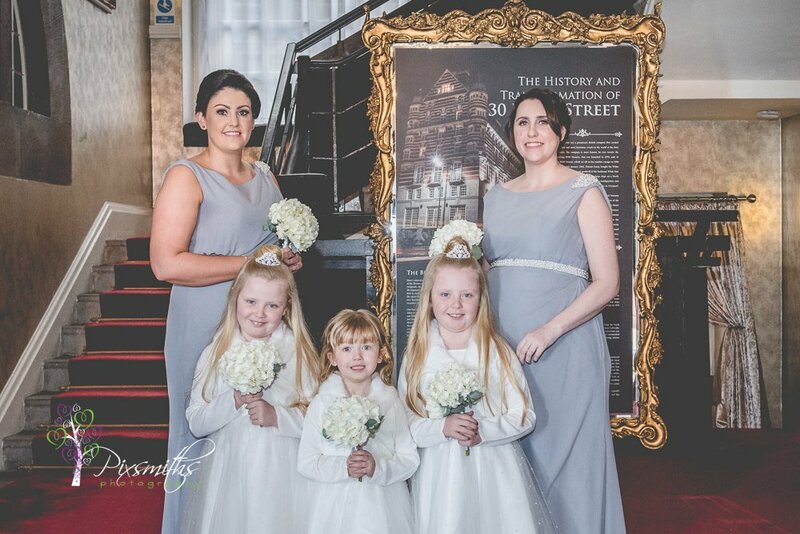 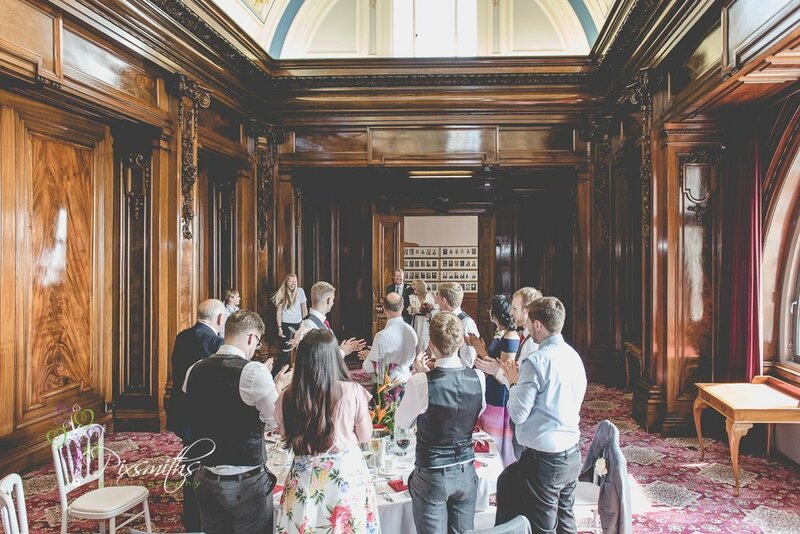 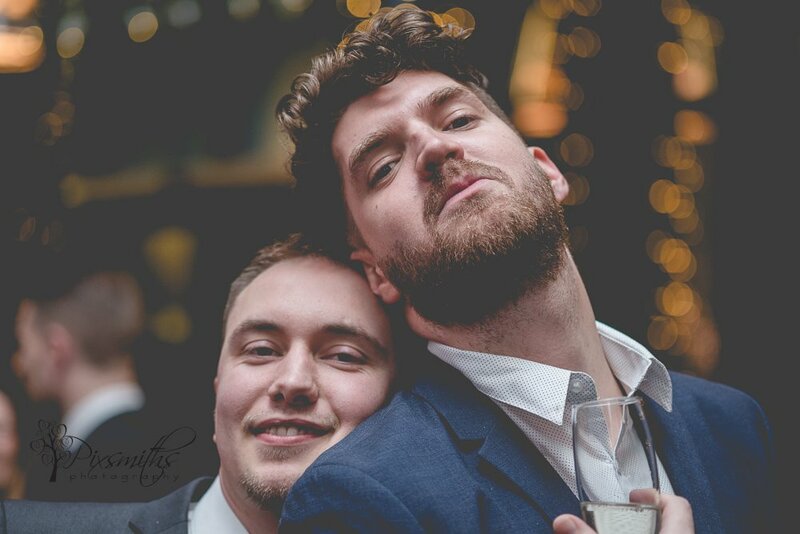 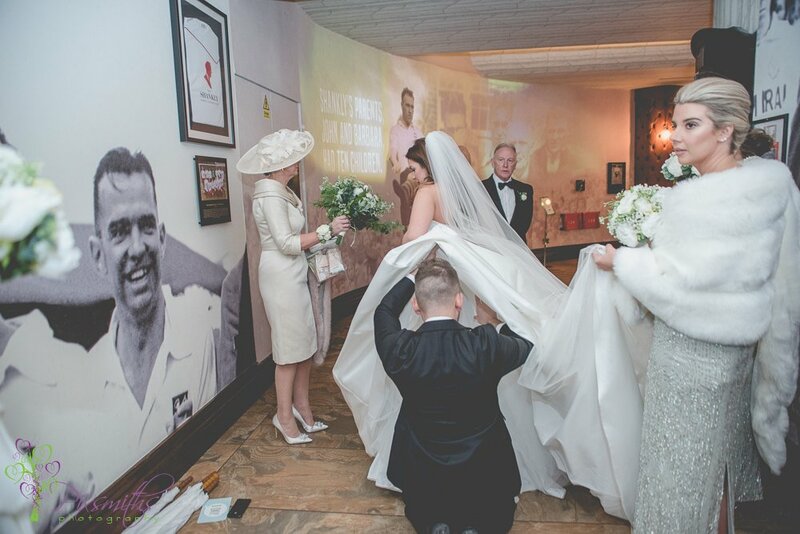 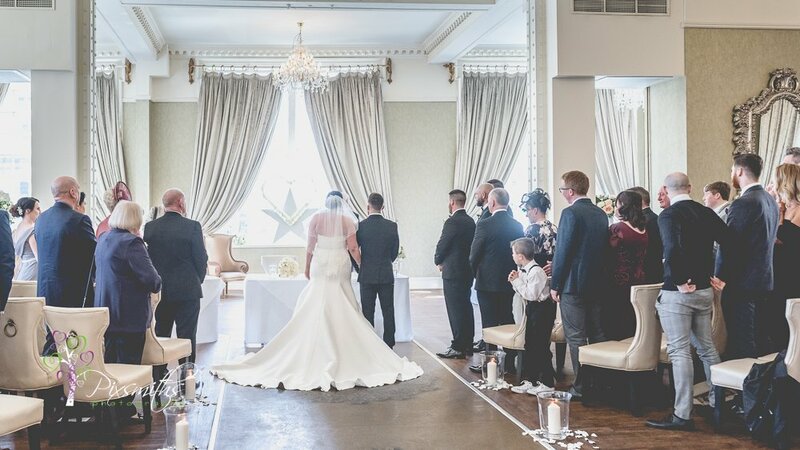 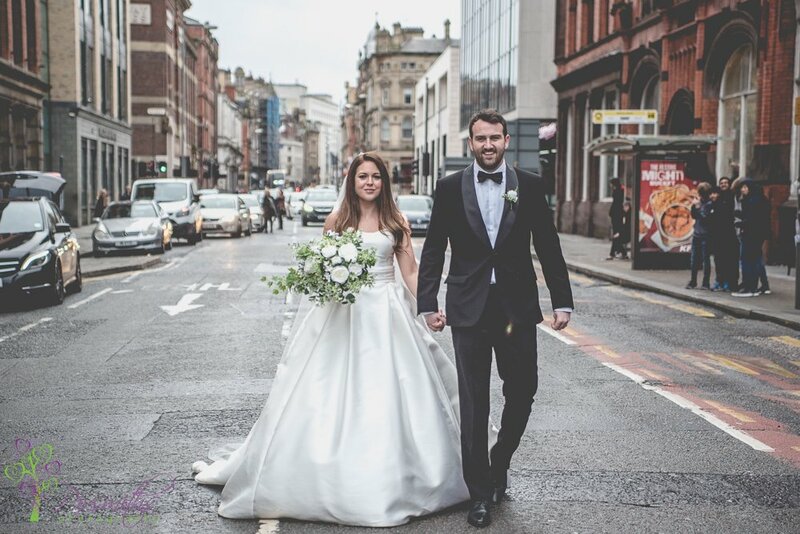 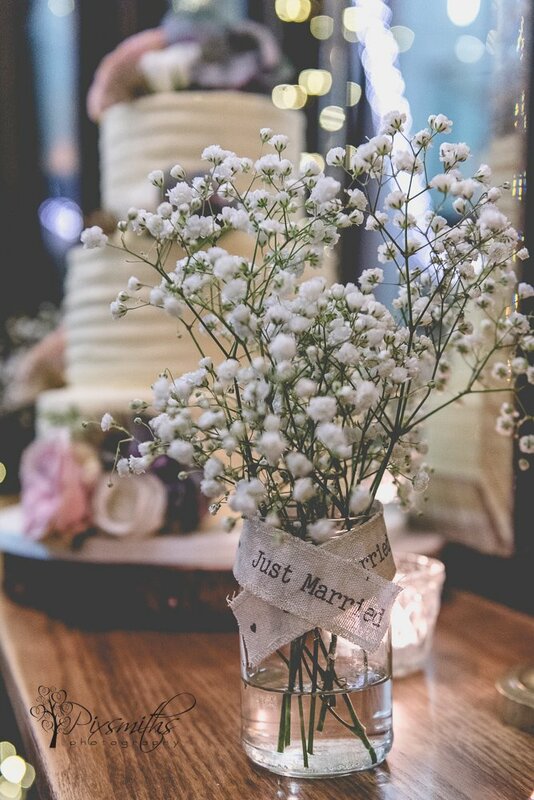 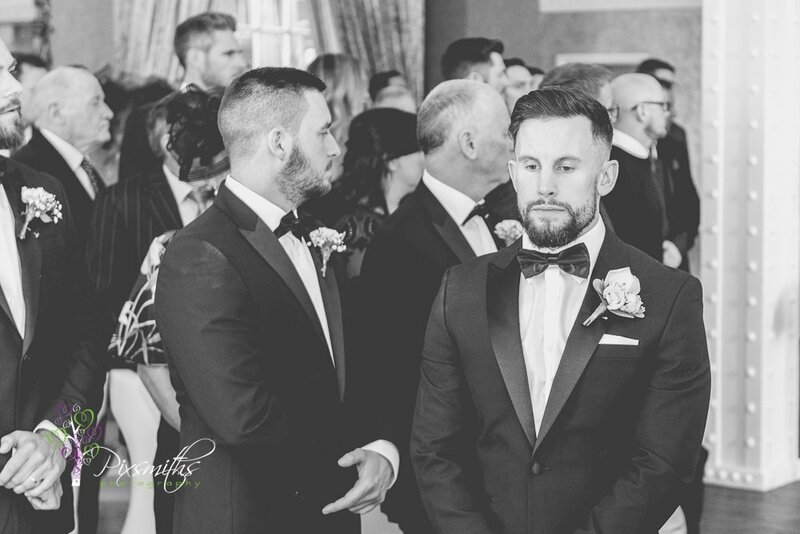 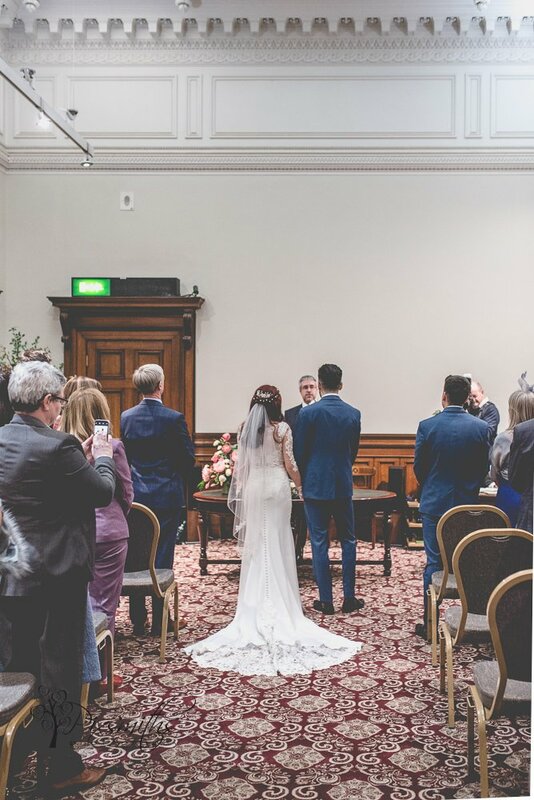 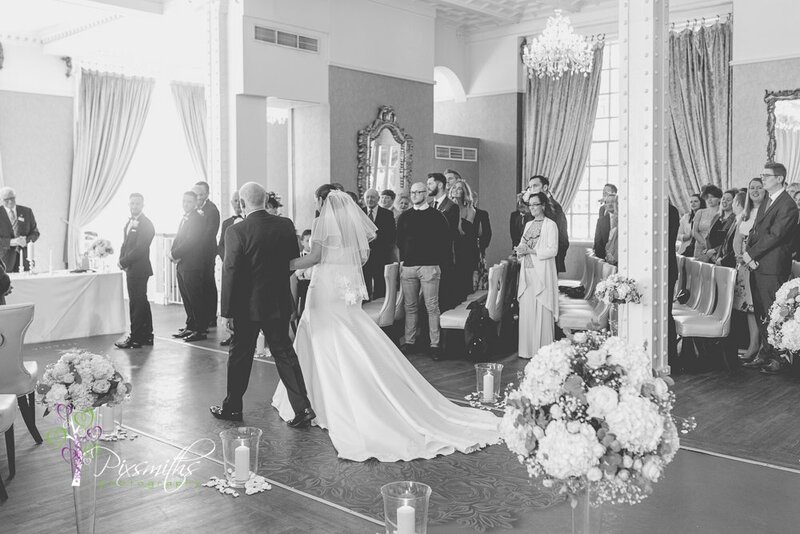 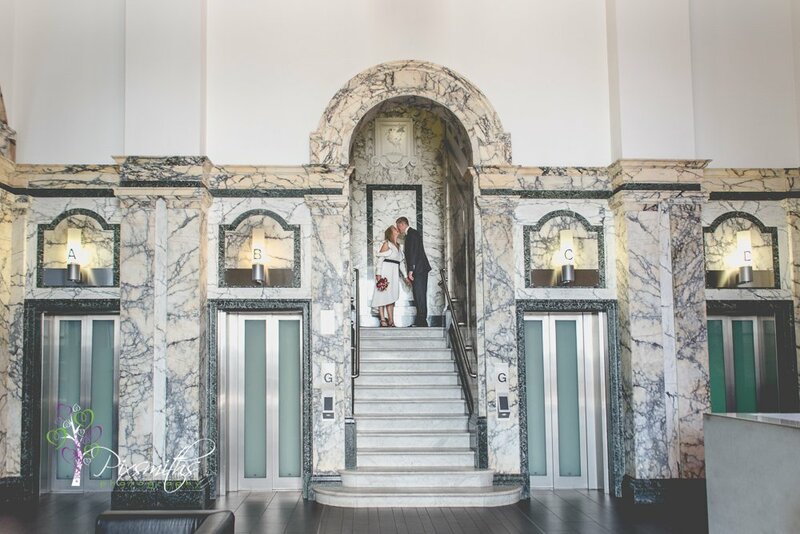 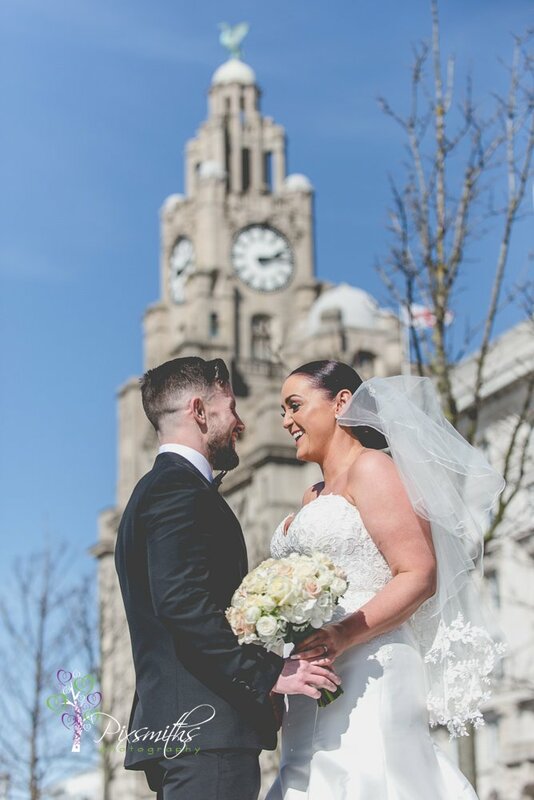 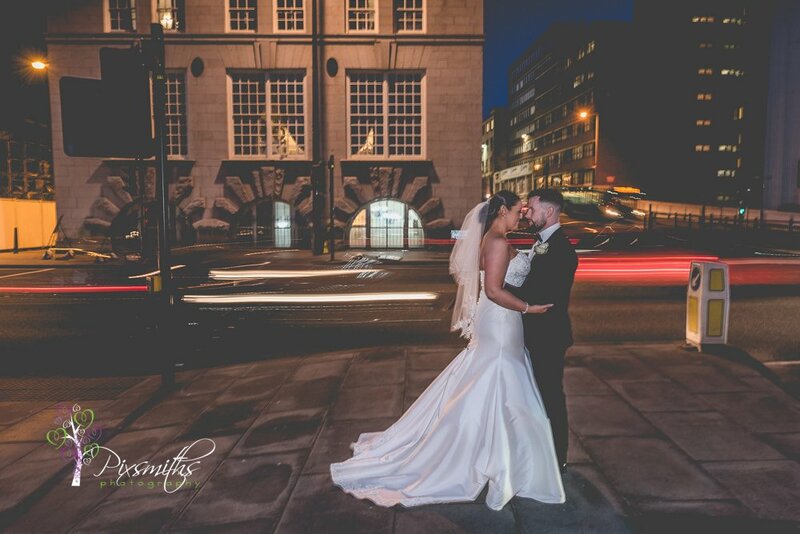 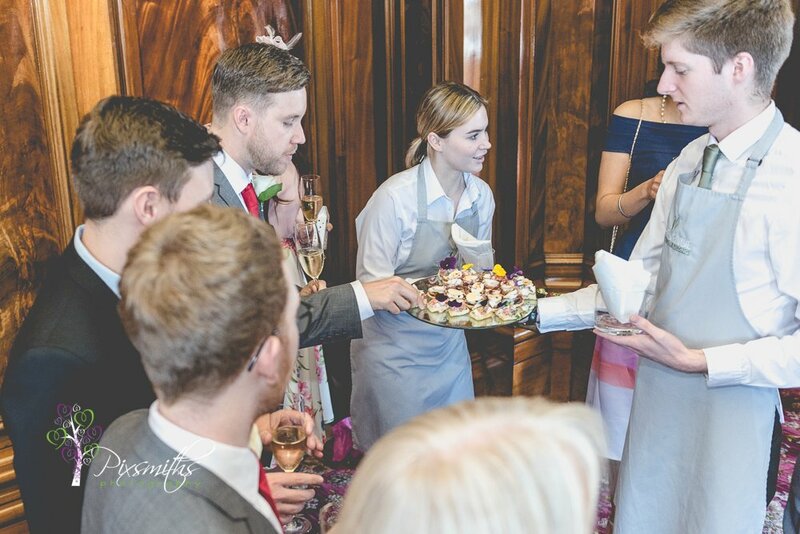 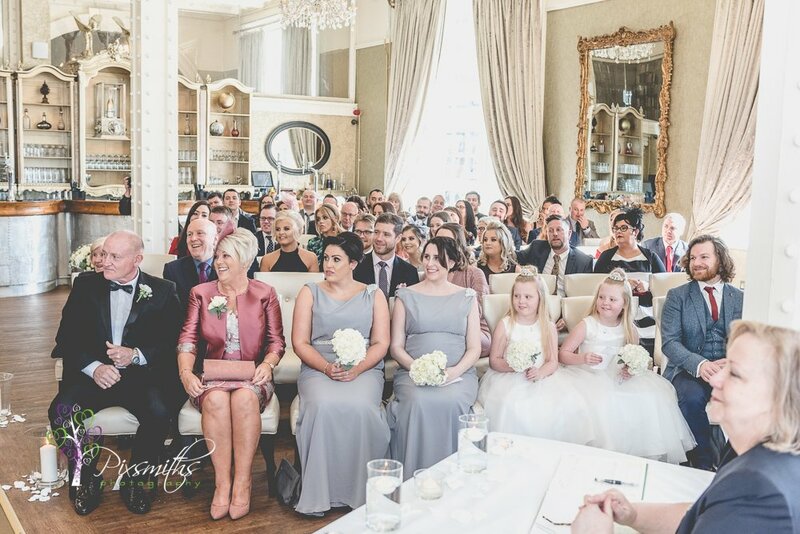 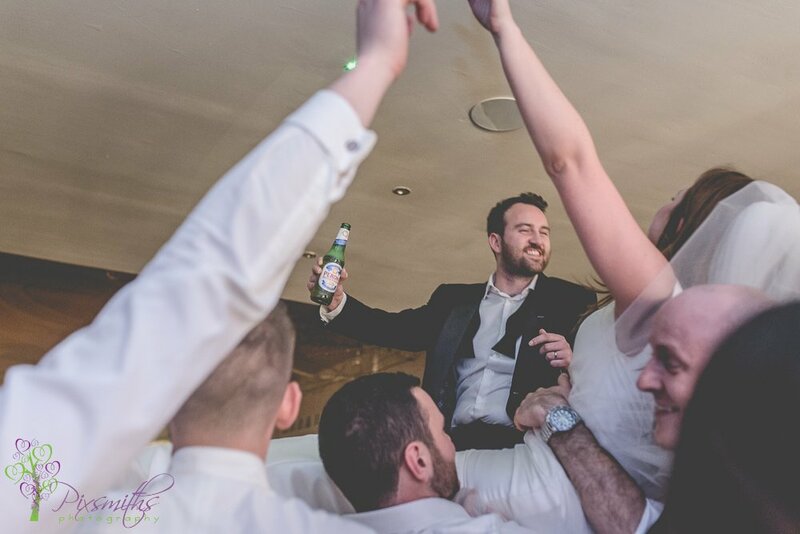 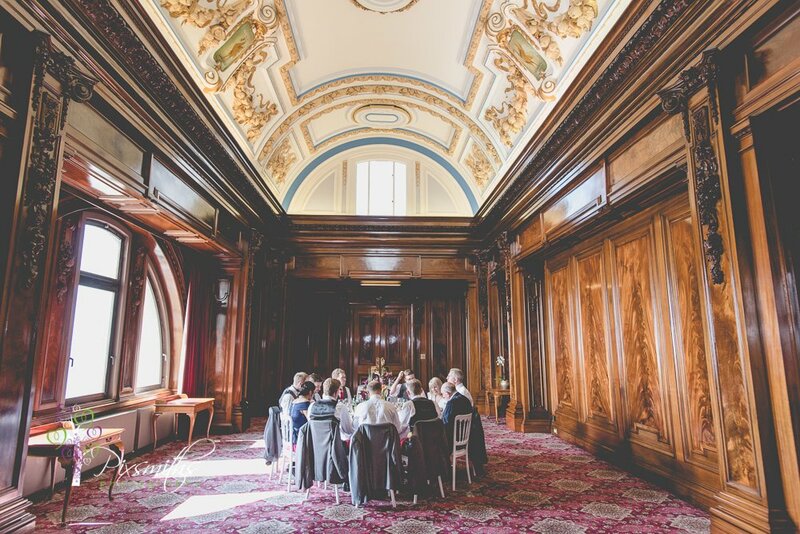 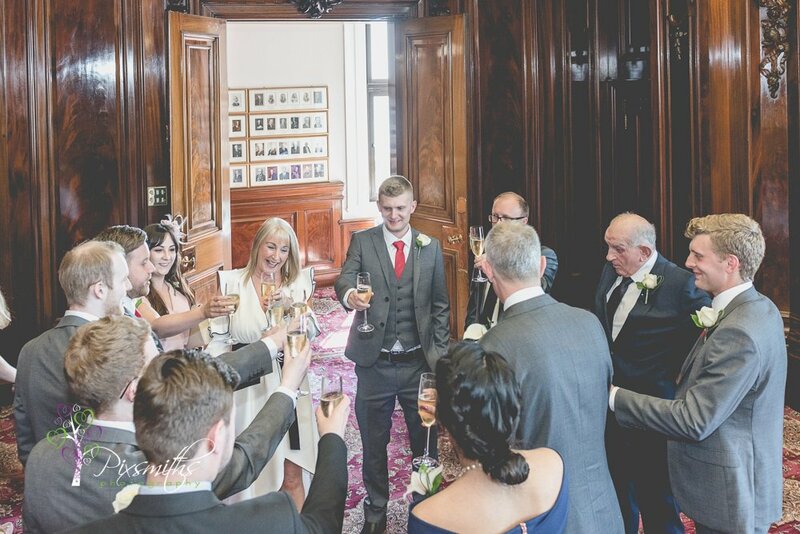 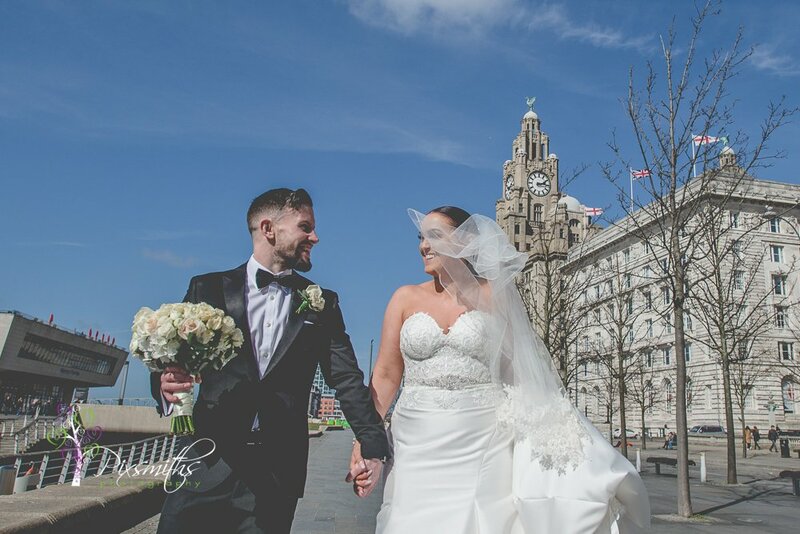 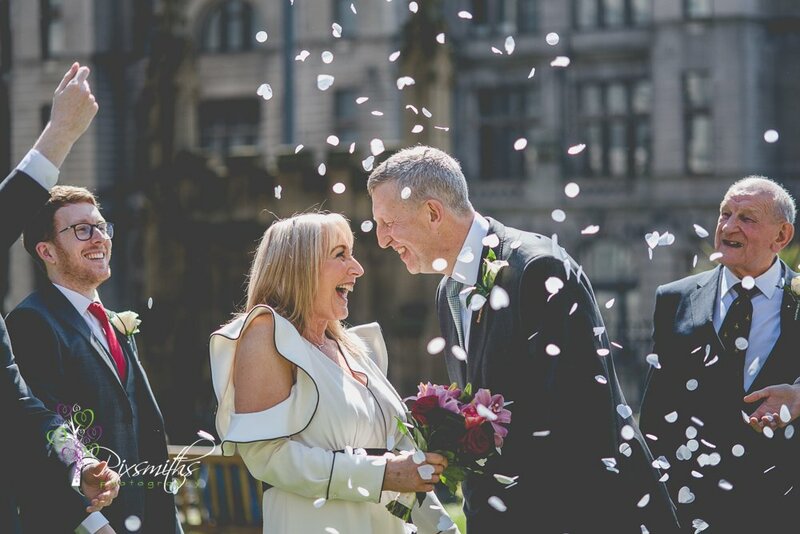 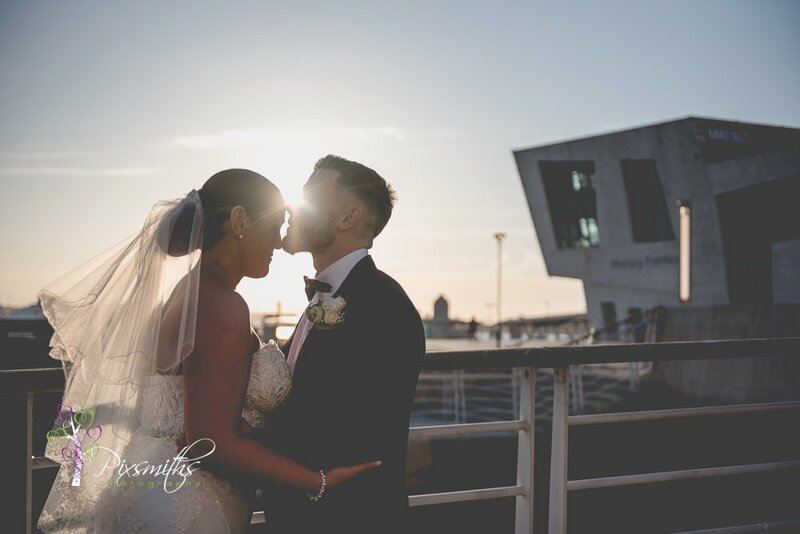 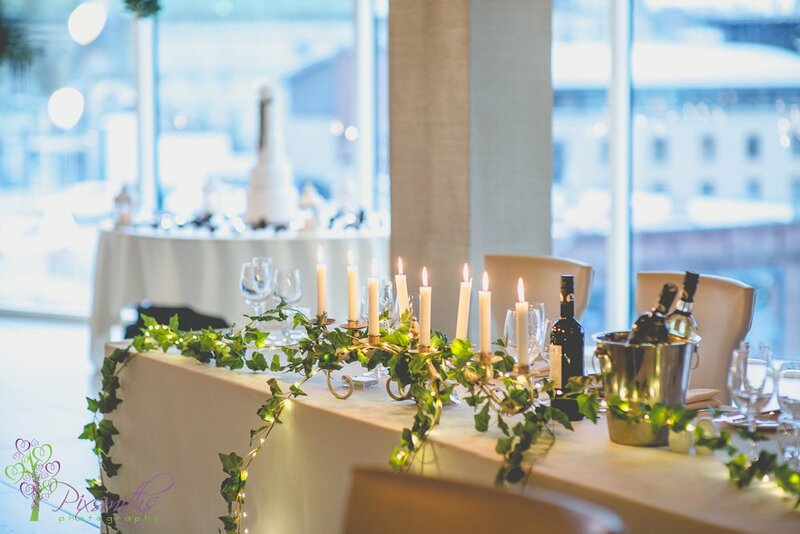 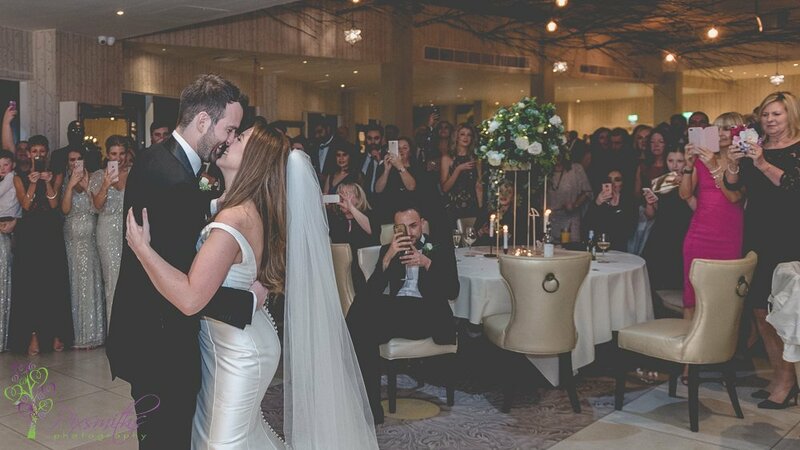 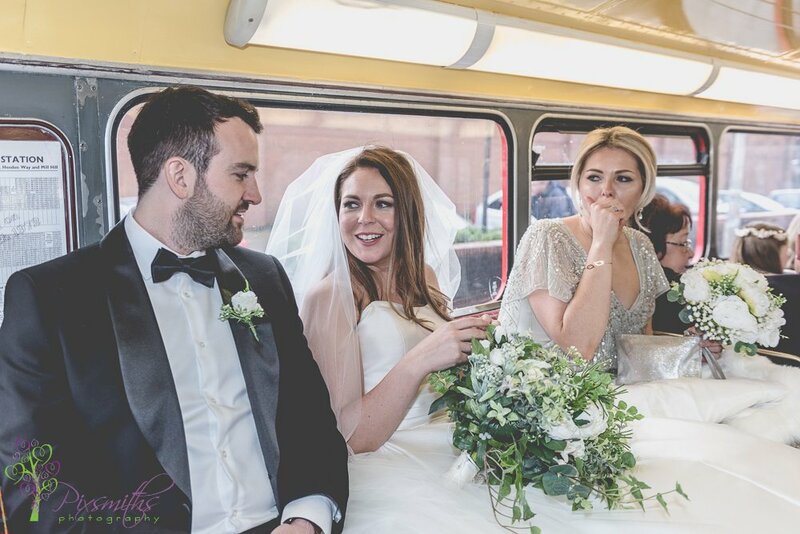 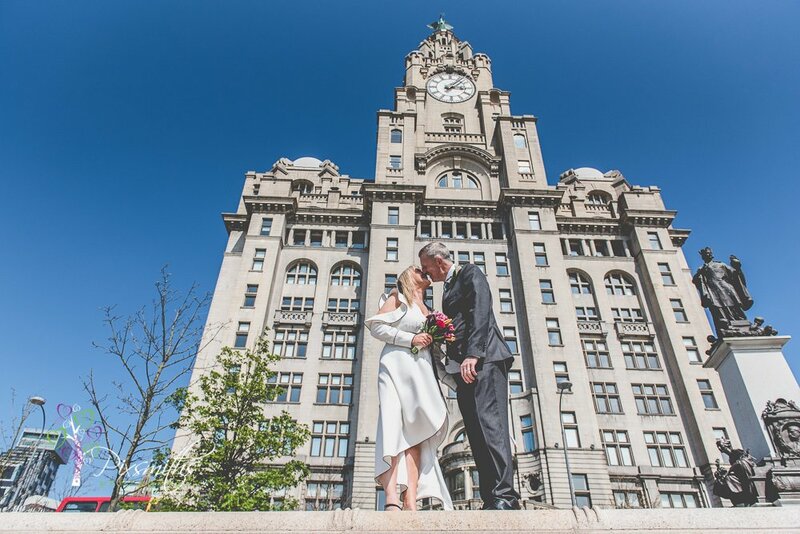 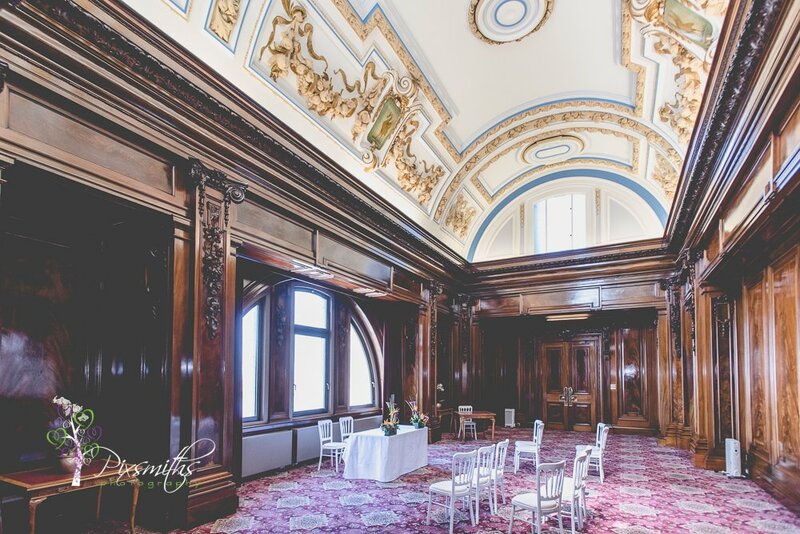 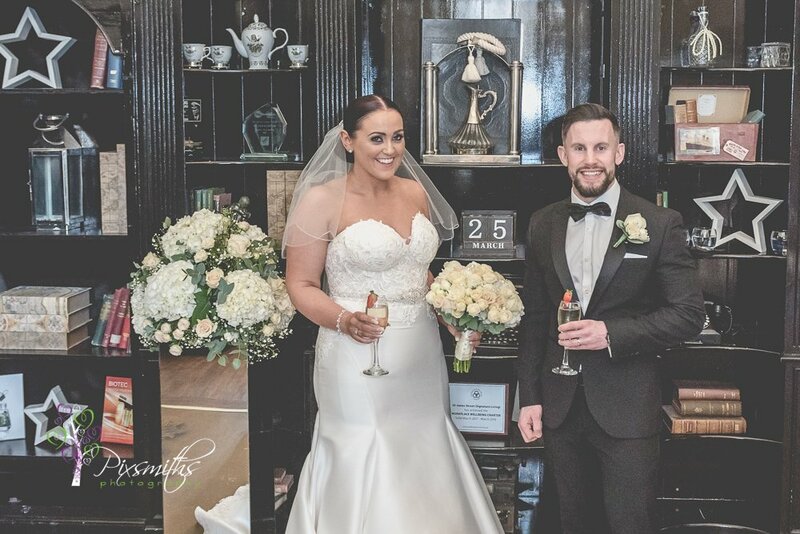 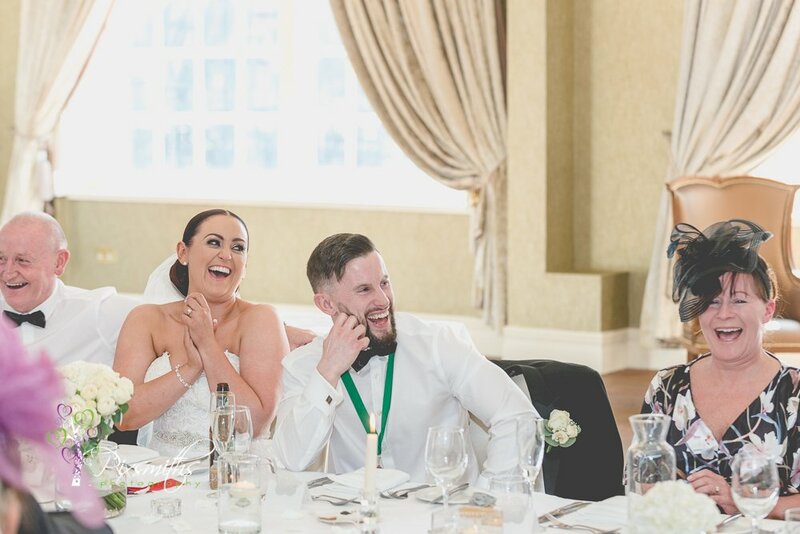 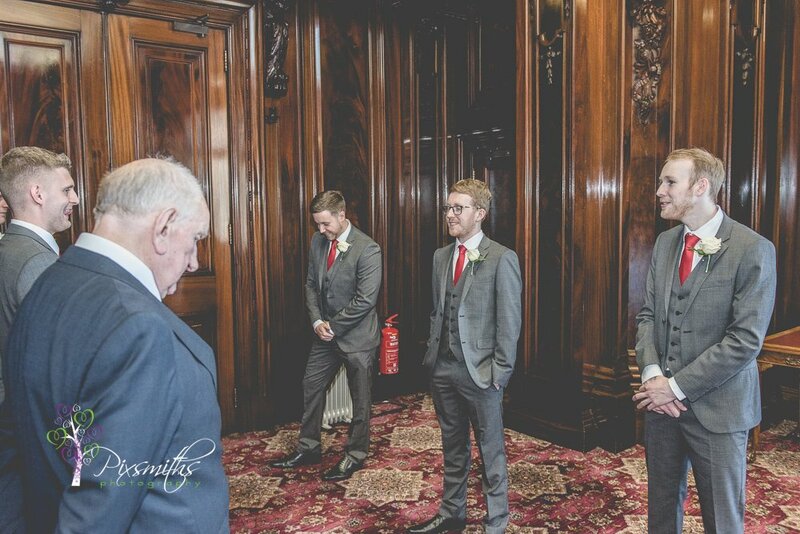 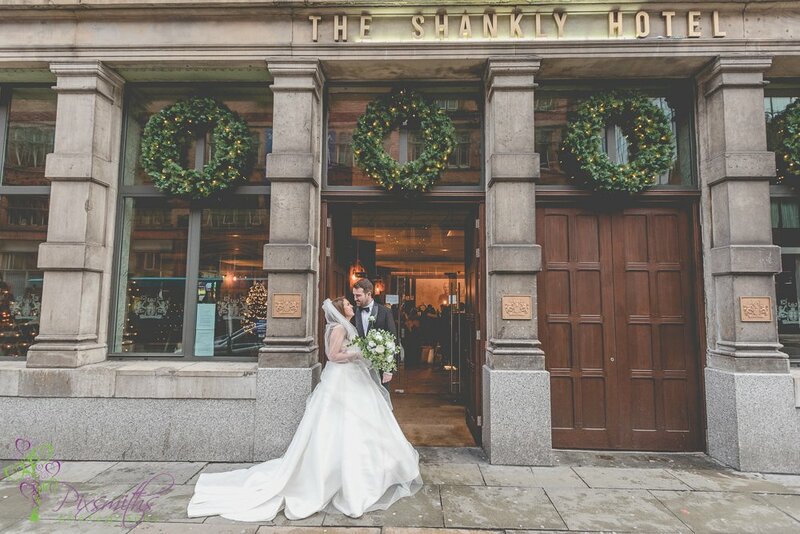 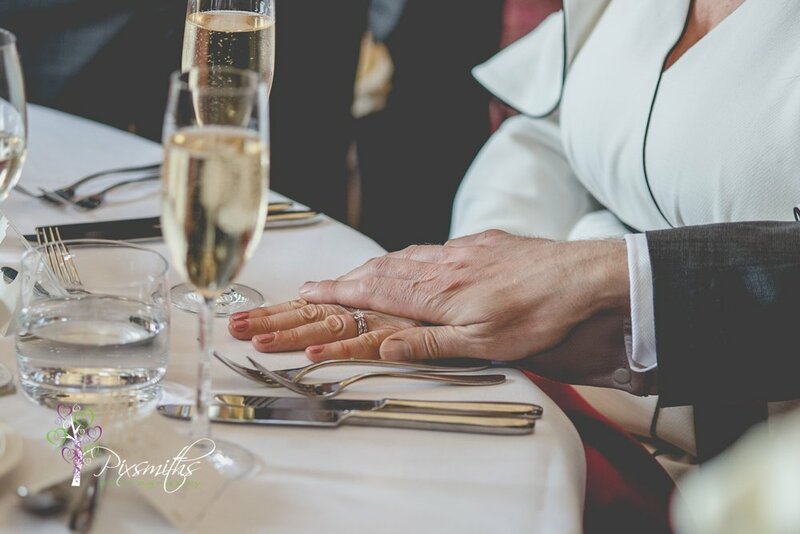 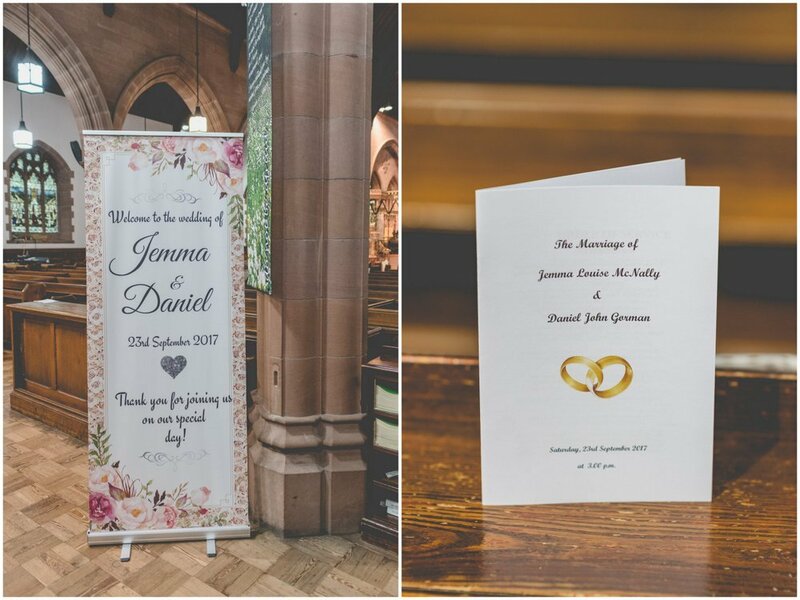 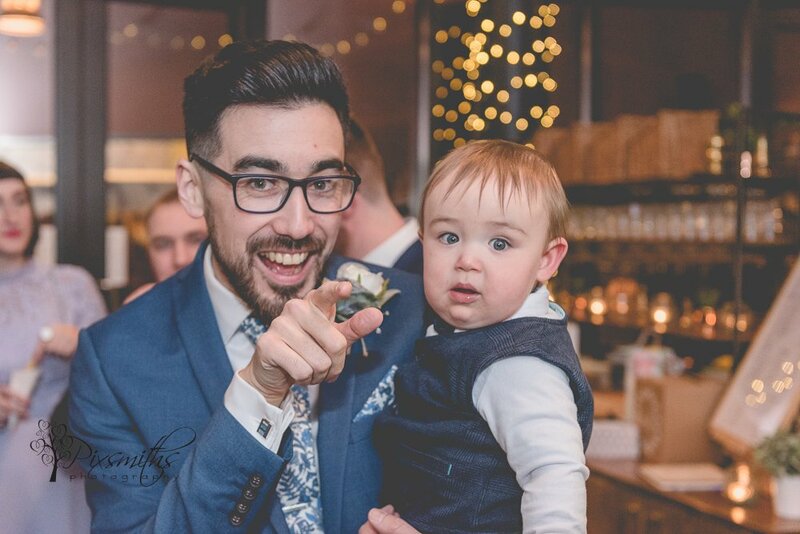 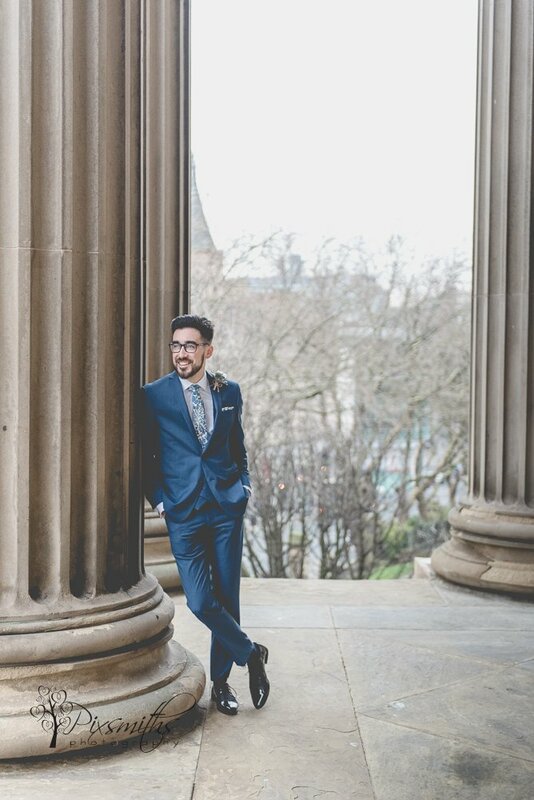 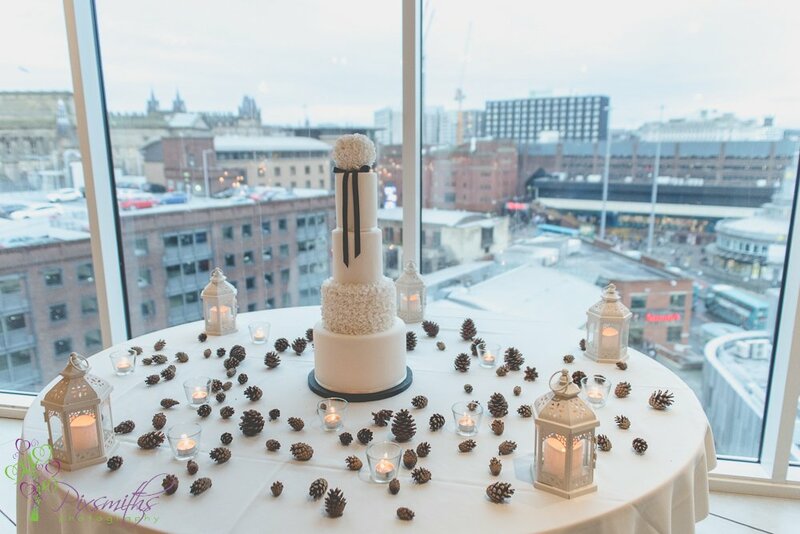 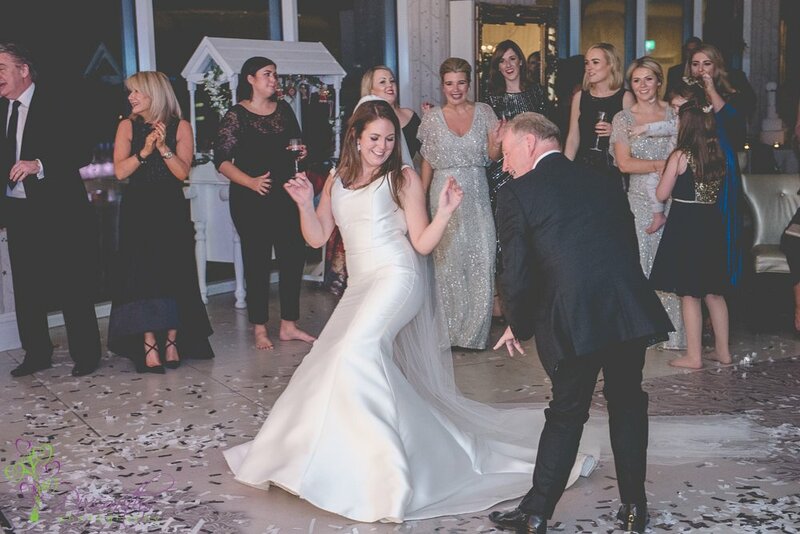 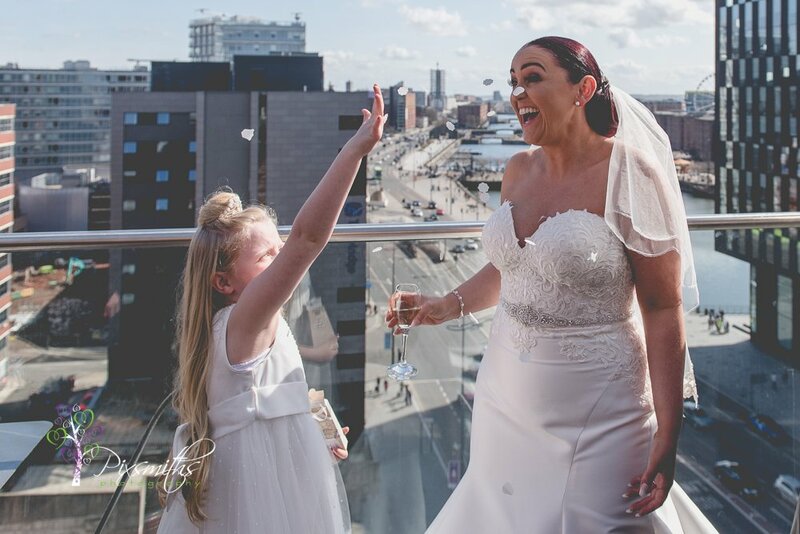 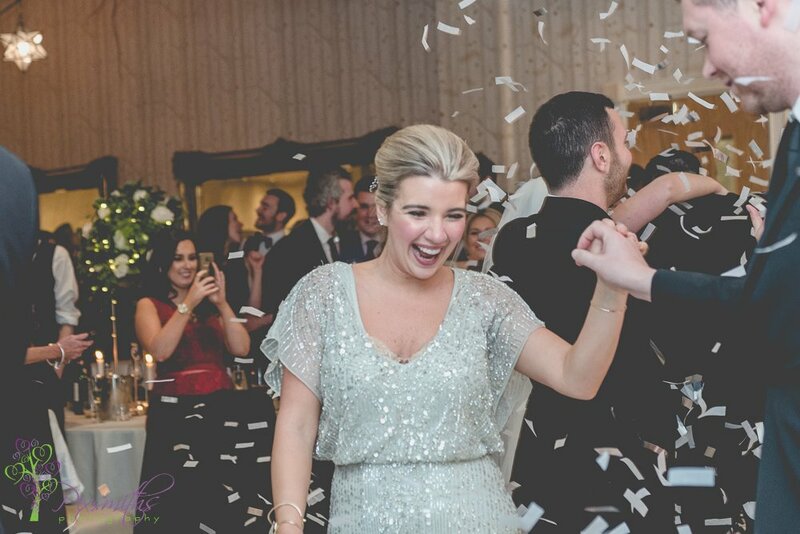 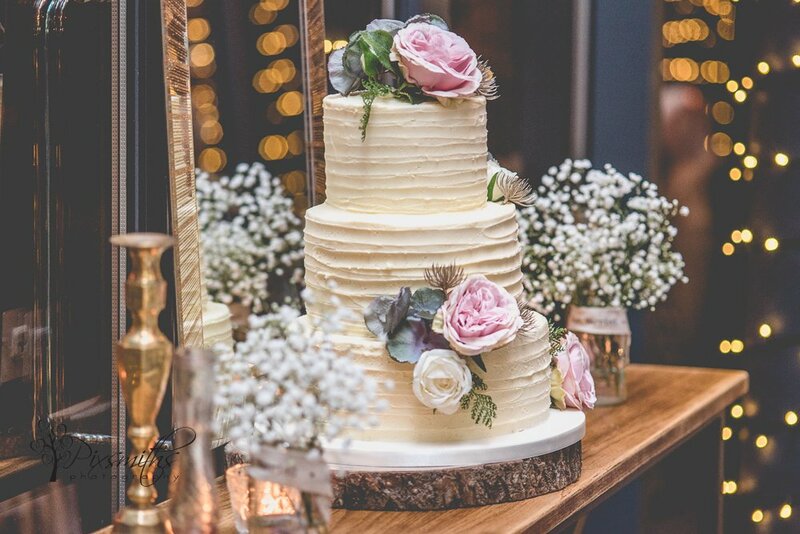 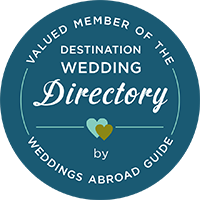 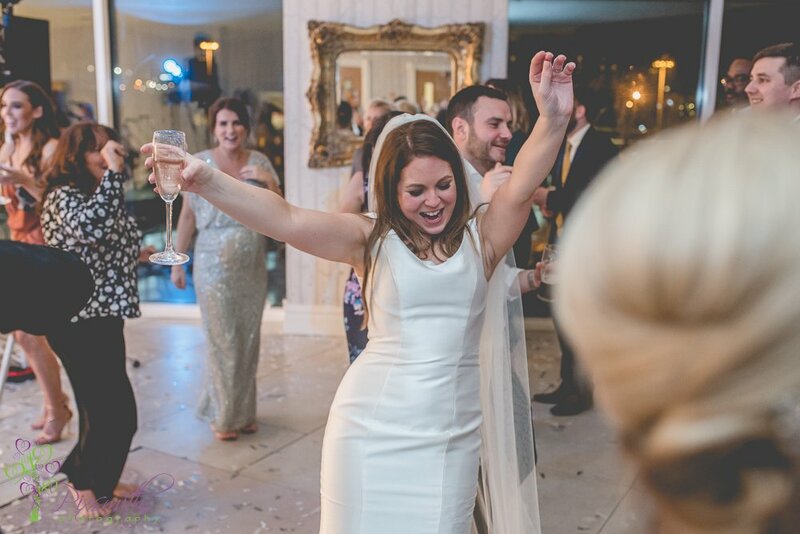 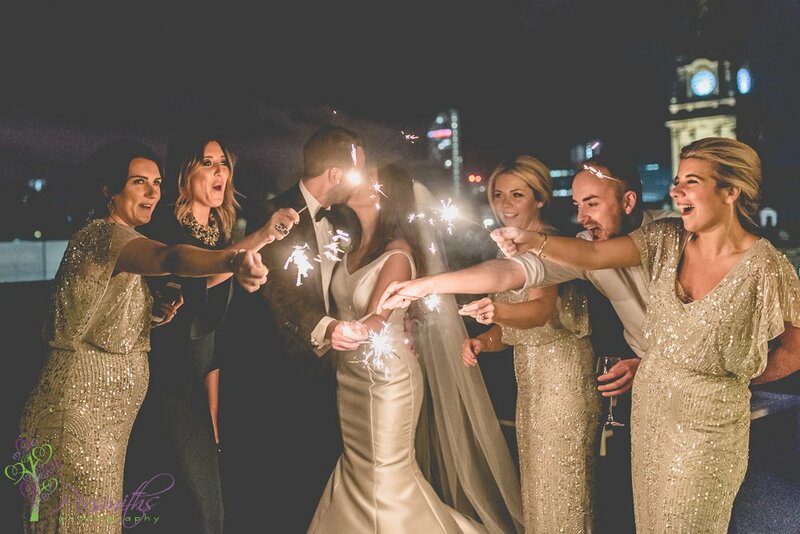 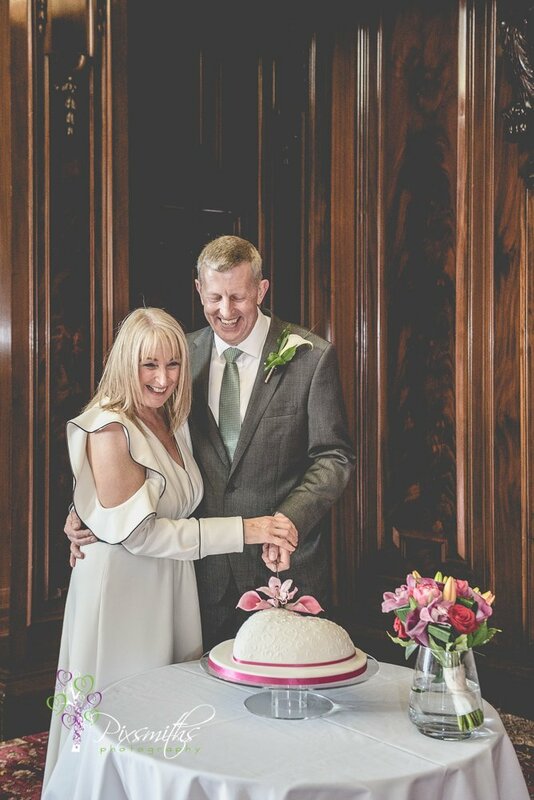 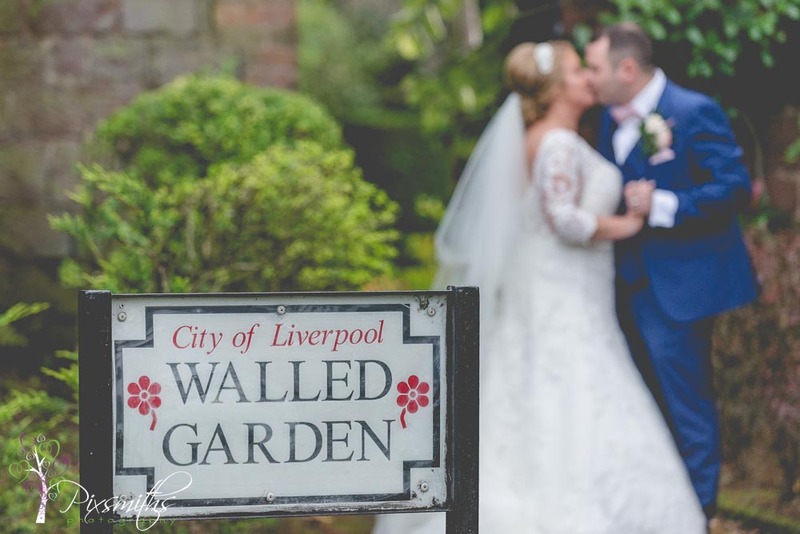 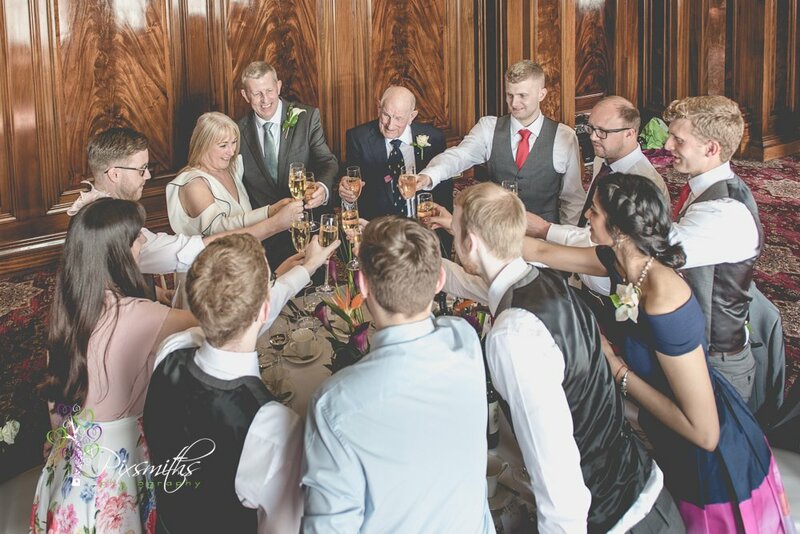 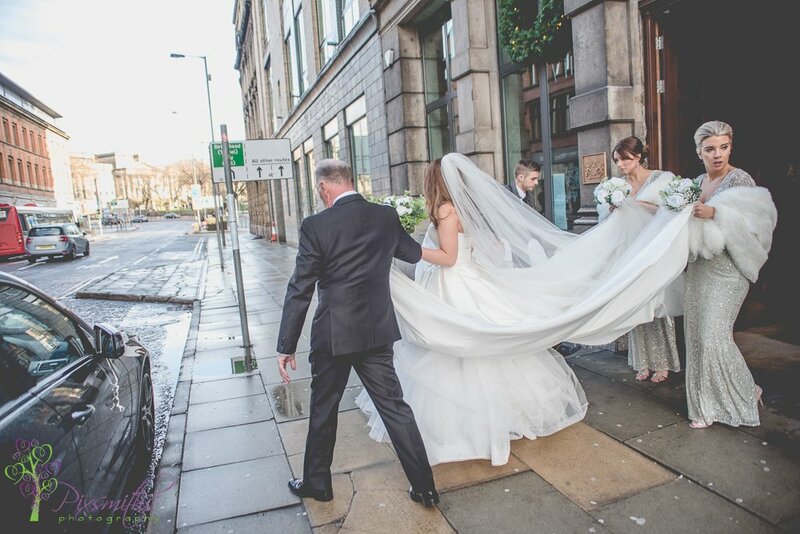 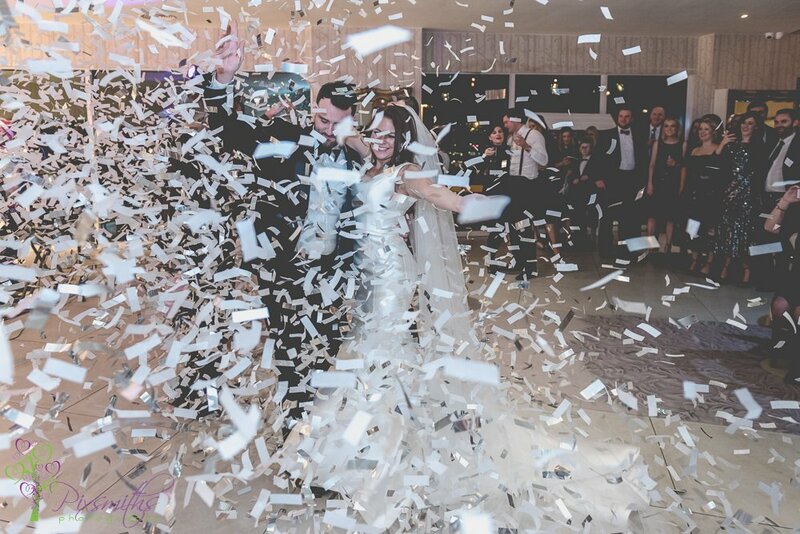 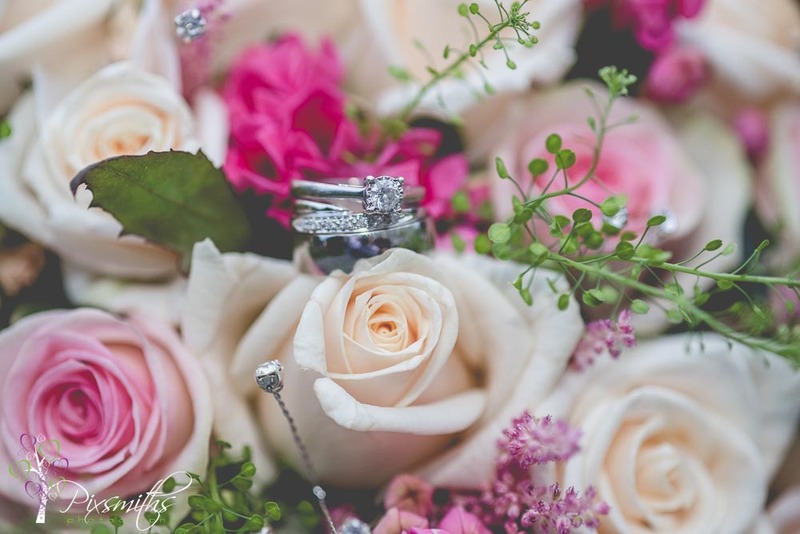 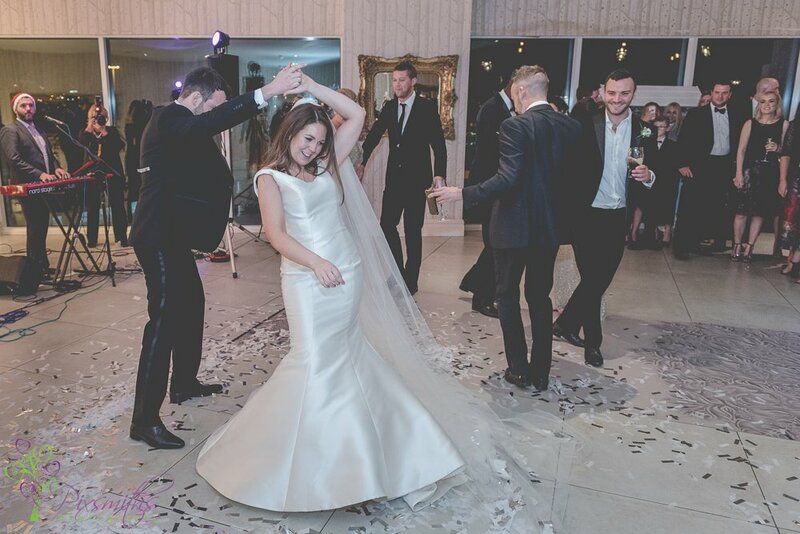 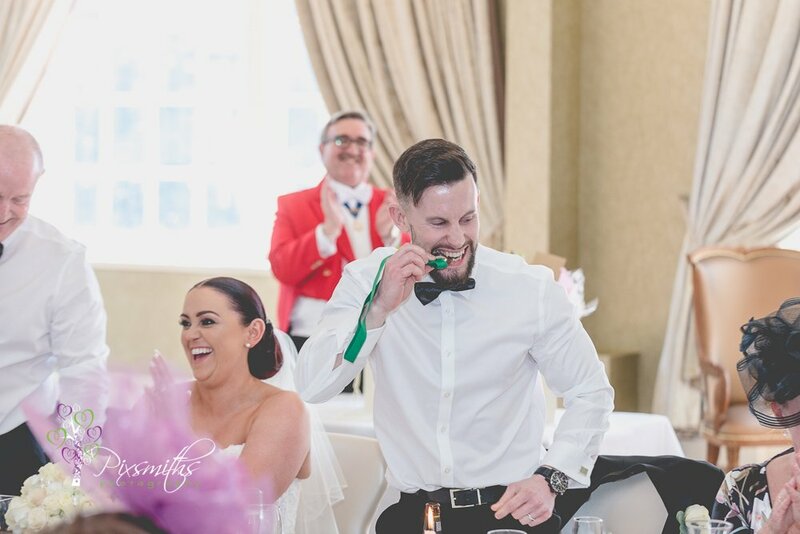 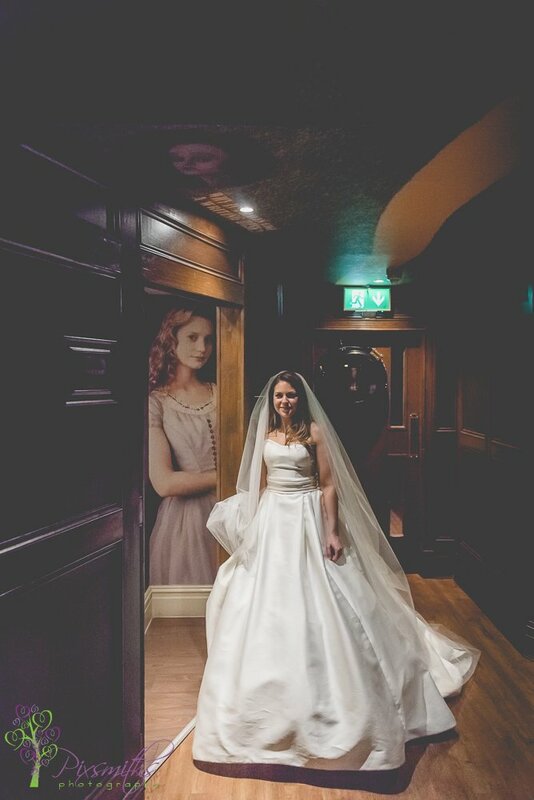 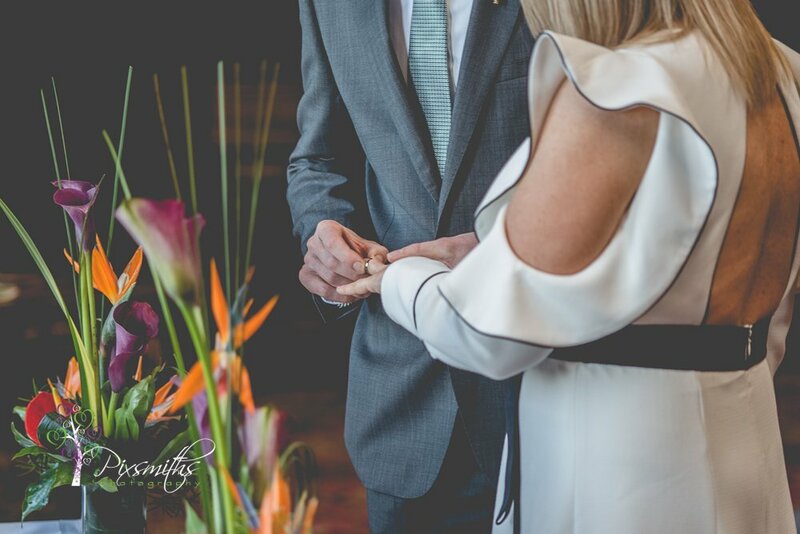 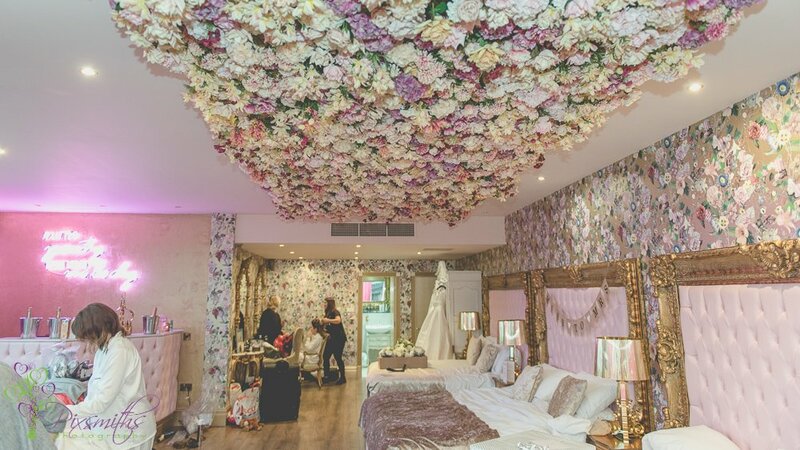 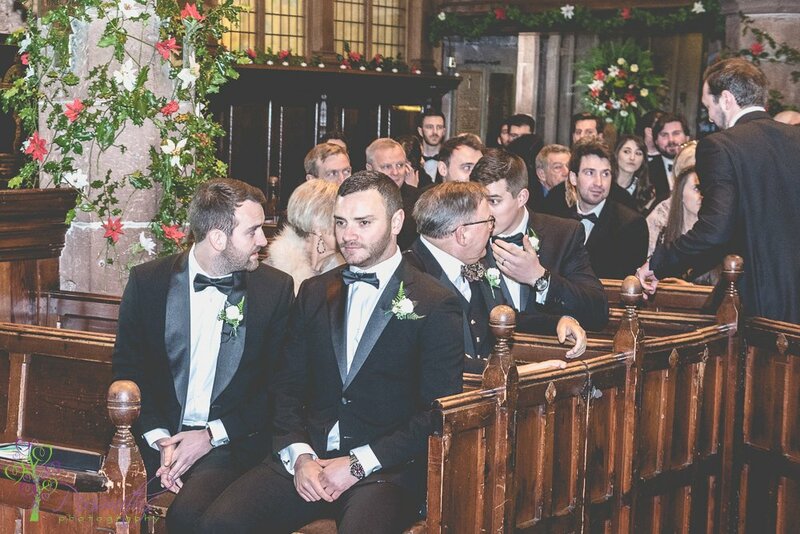 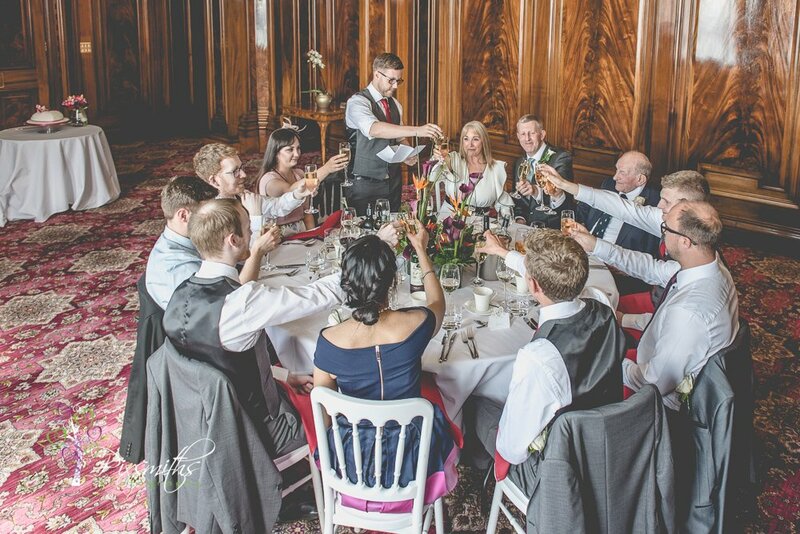 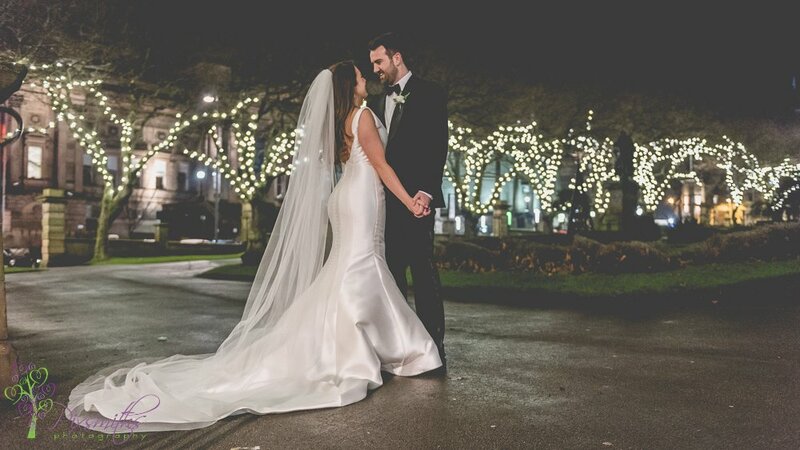 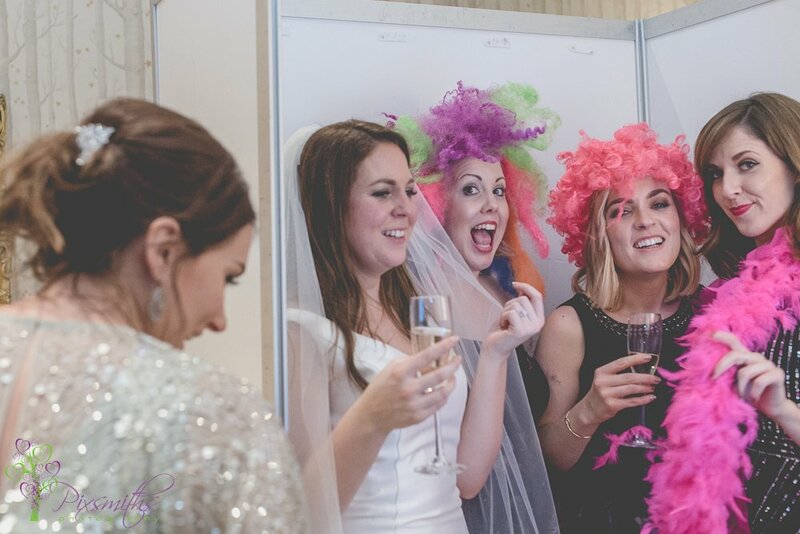 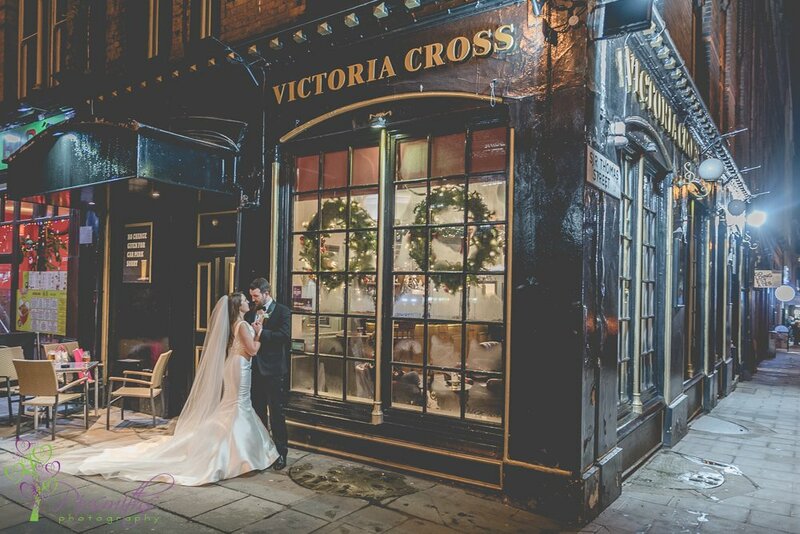 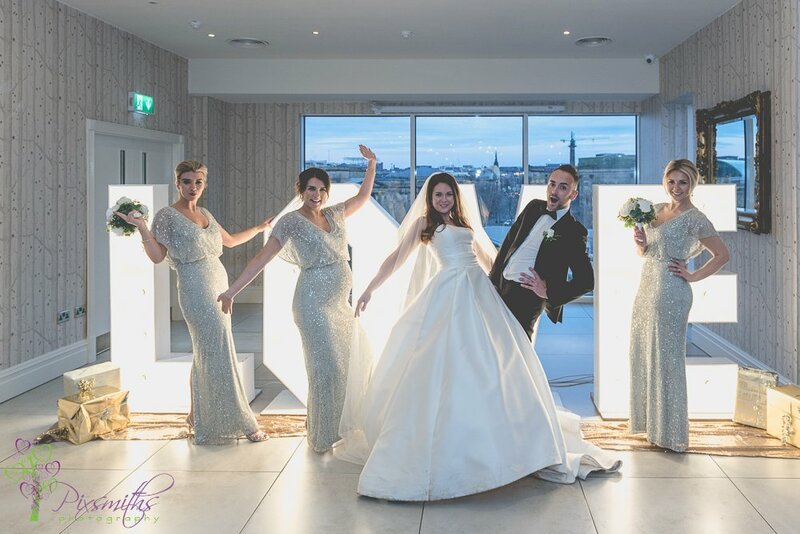 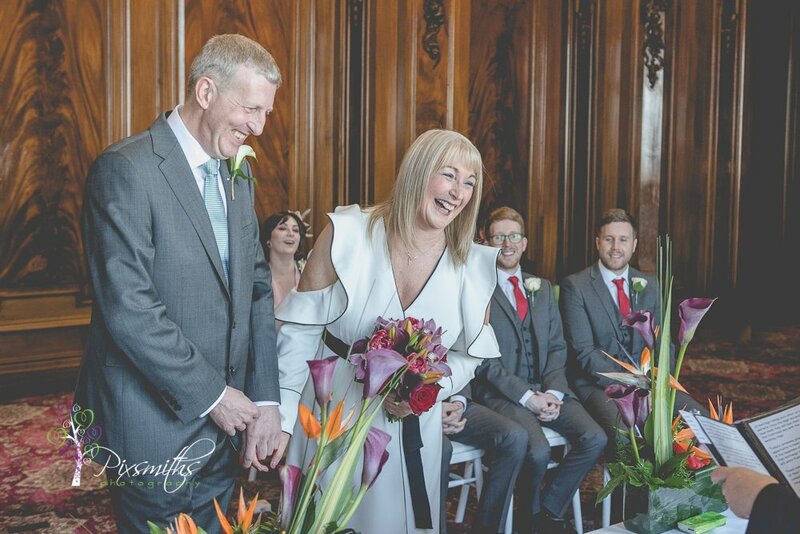 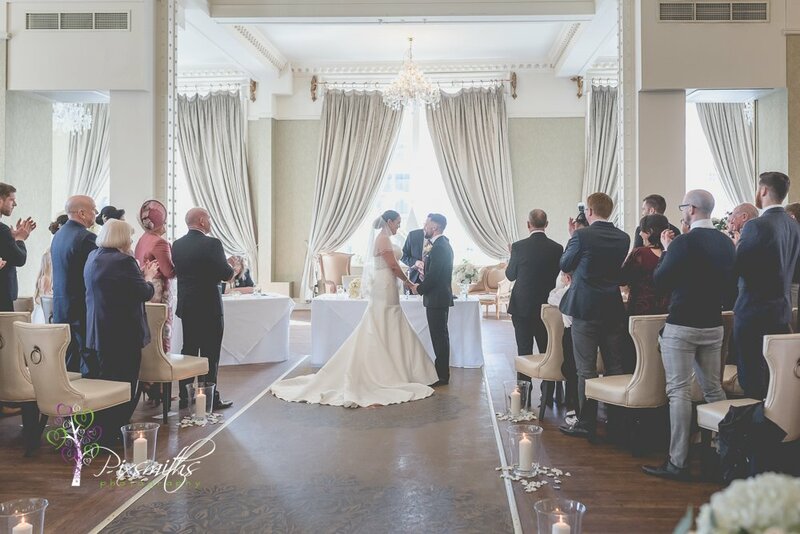 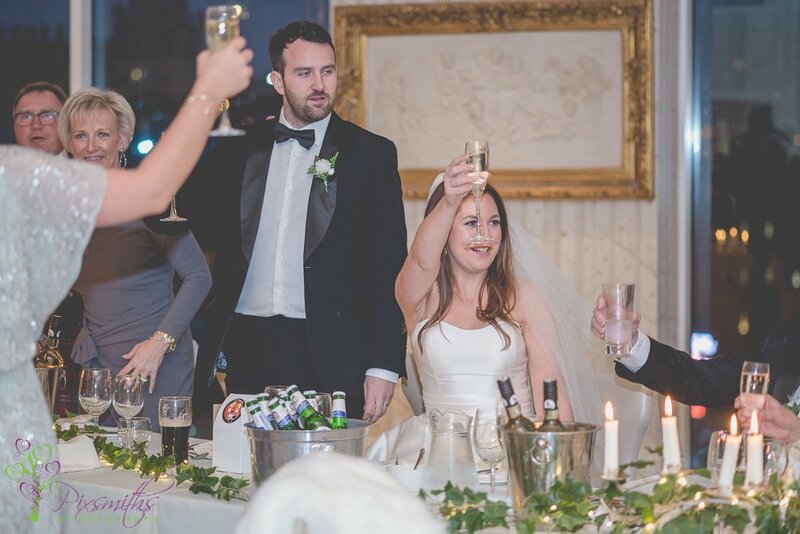 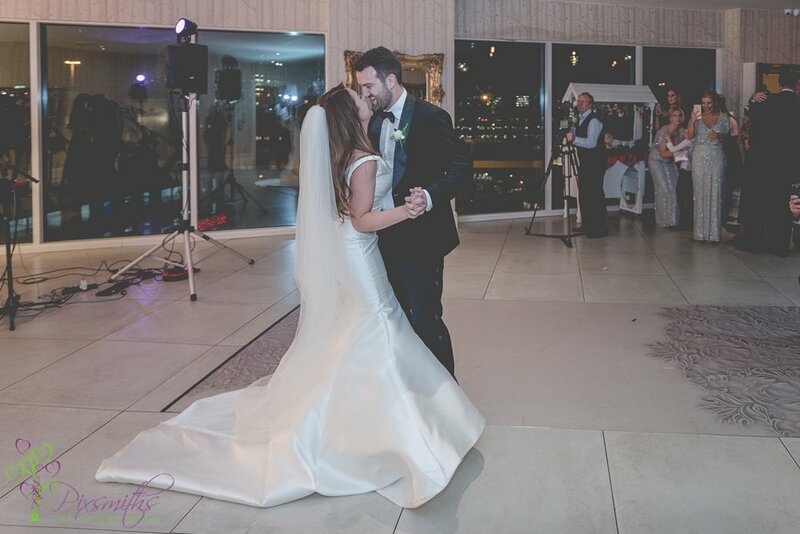 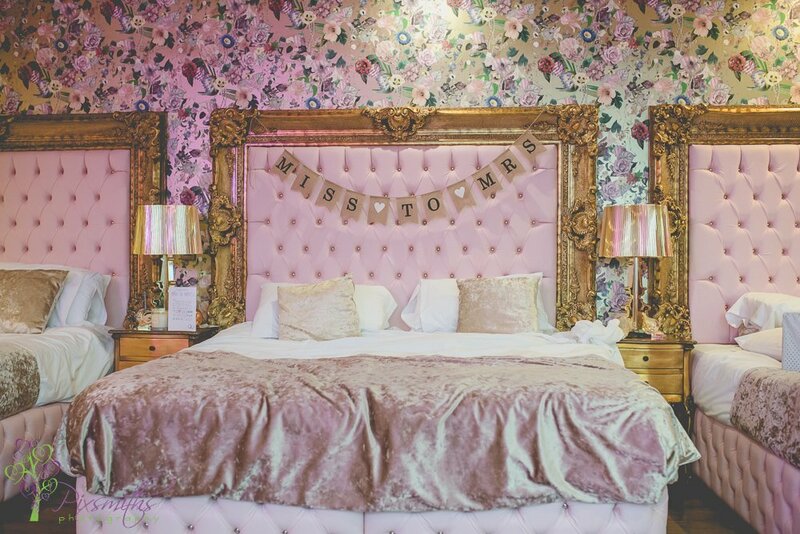 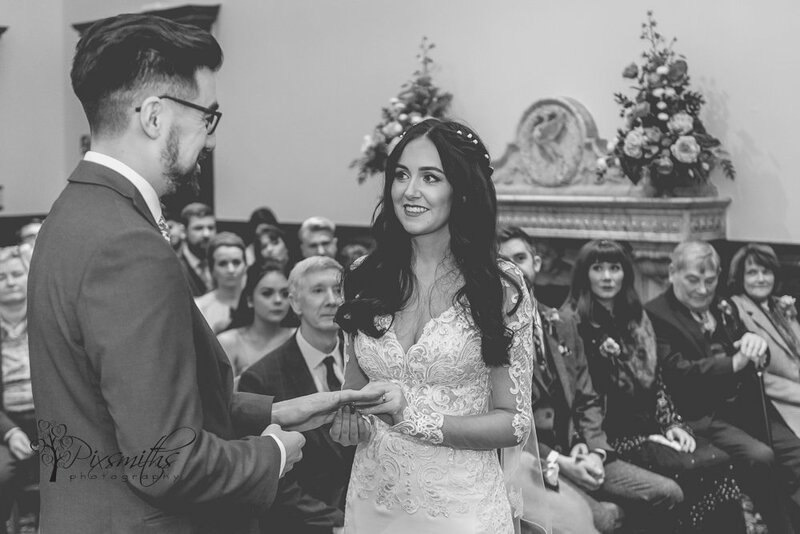 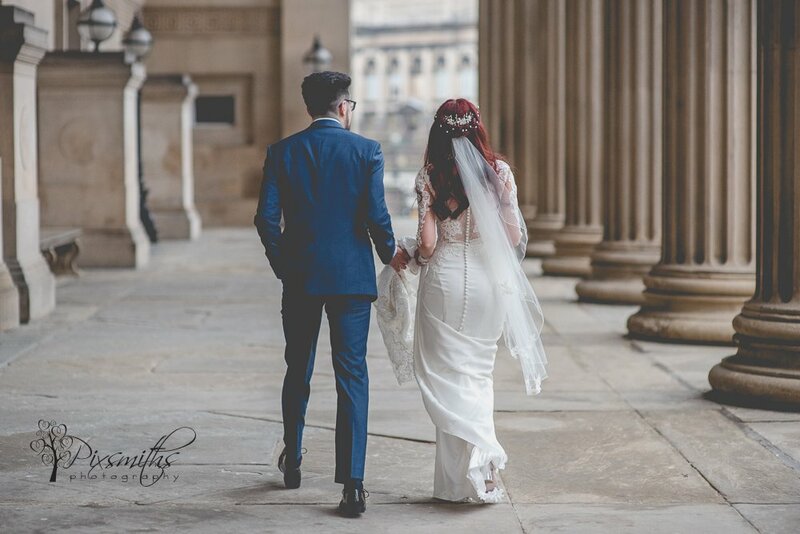 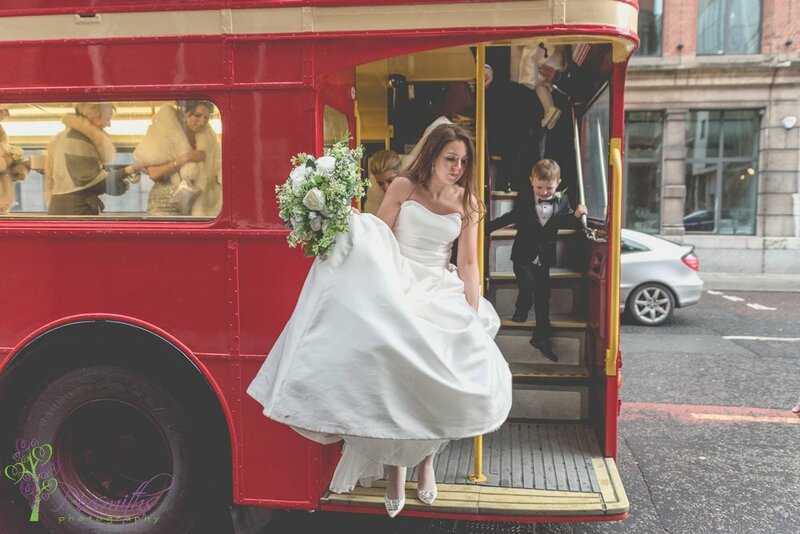 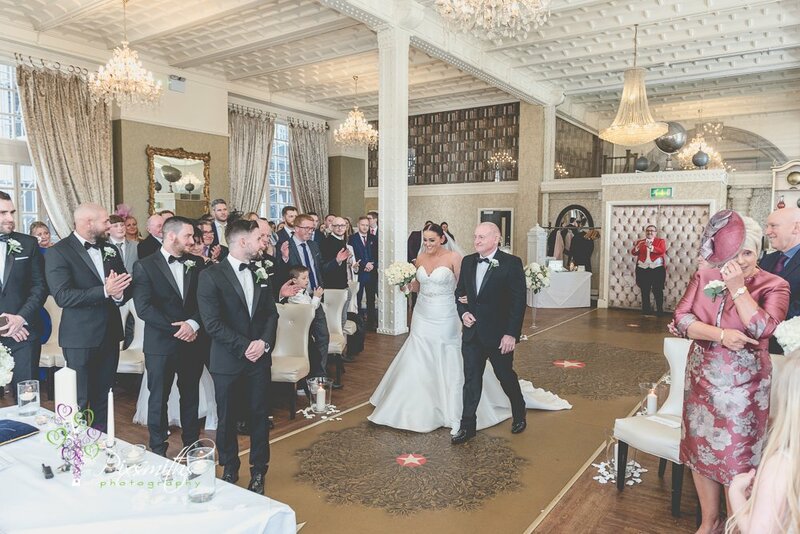 It seems we have spent the beginning of 2018 wedding season with Liverpool city centre weddings! 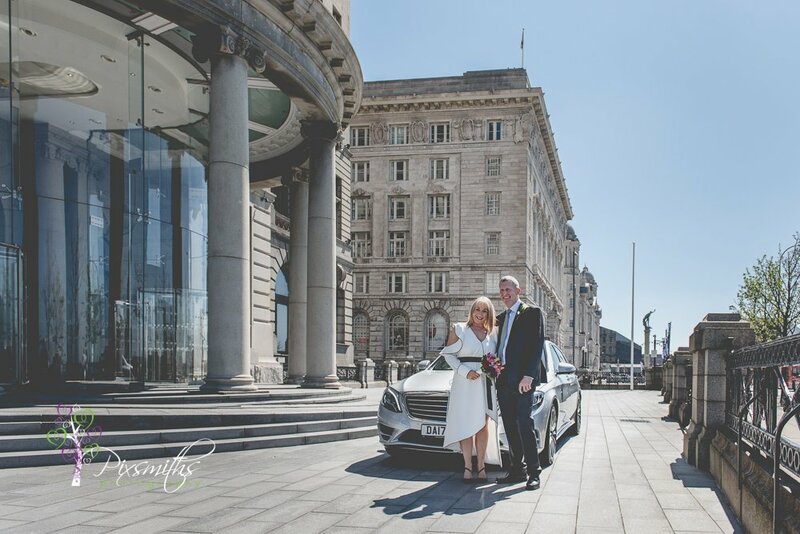 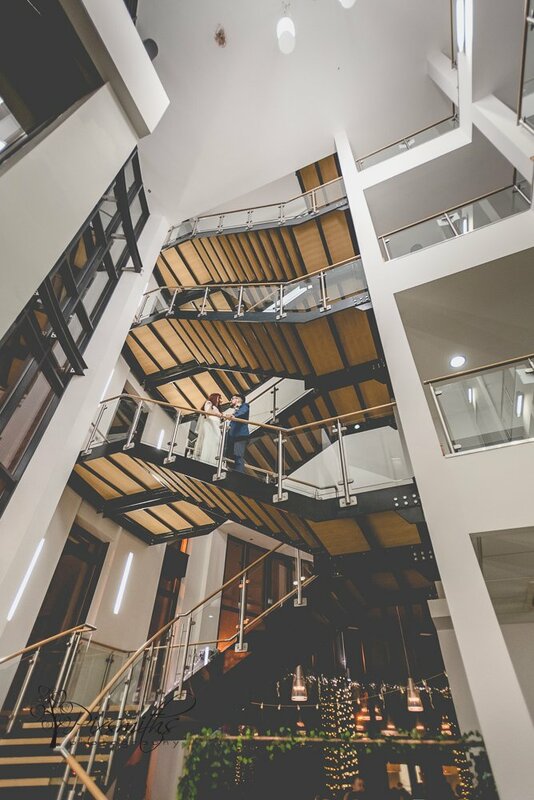 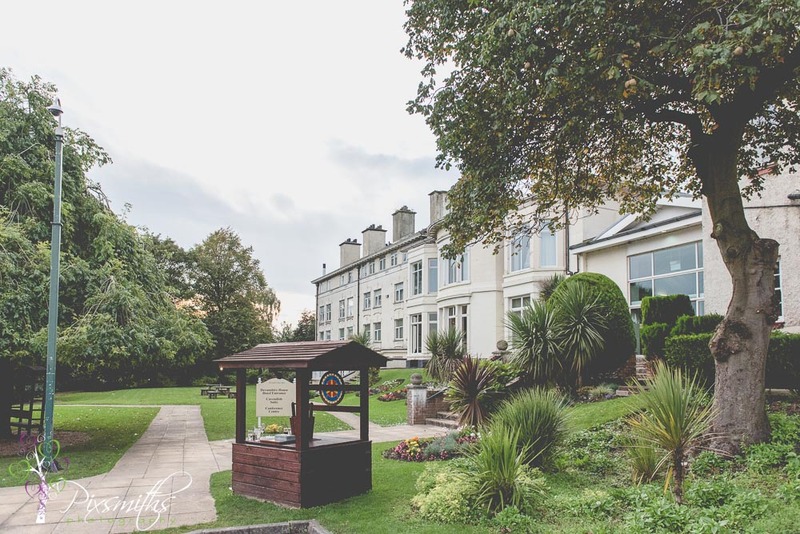 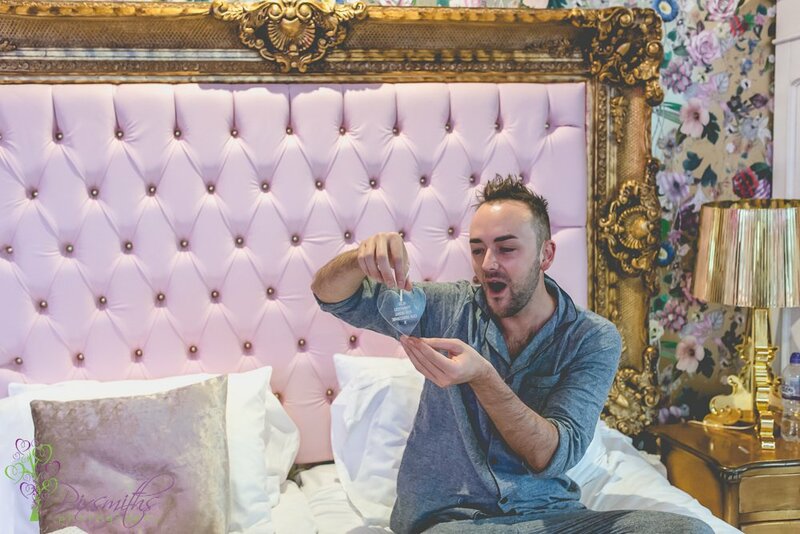 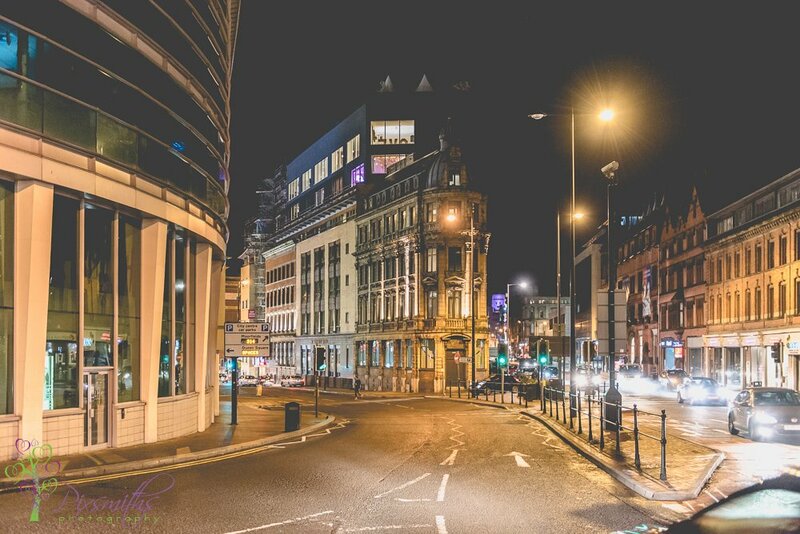 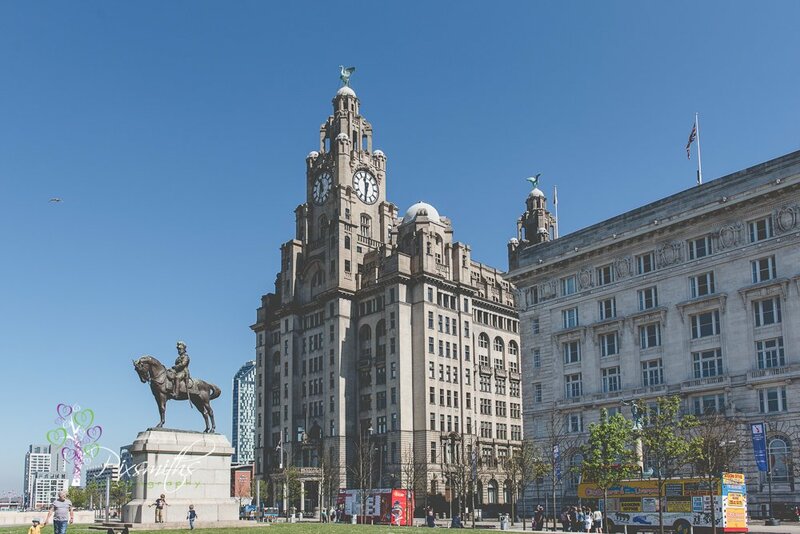 We were delighted to be back in Liverpool city centre at the iconic home of the Titanic 30 James St. A beautiful city centre hotel run by Signature living. 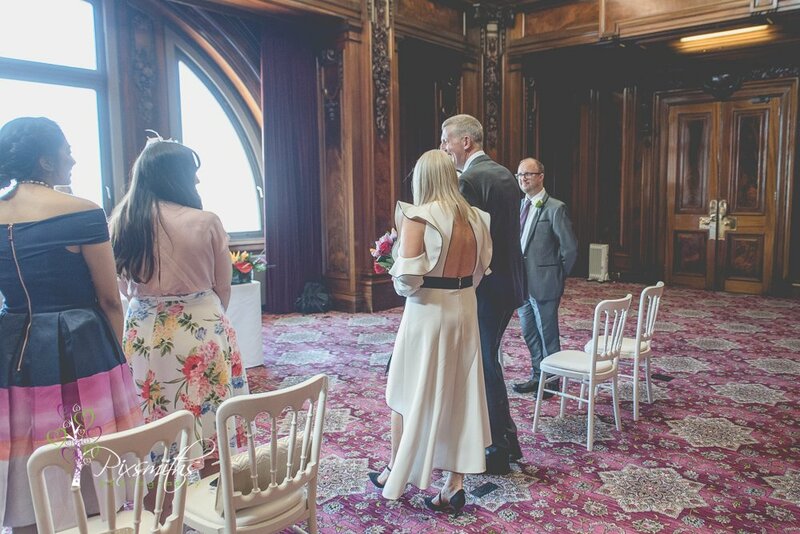 Rebecca the wedding co-coordinator runs a well oiled ship and things ran so smoothly. 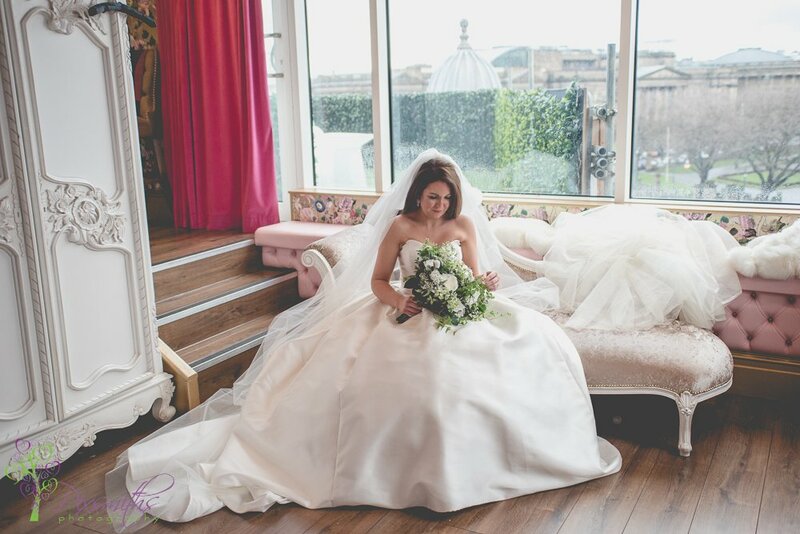 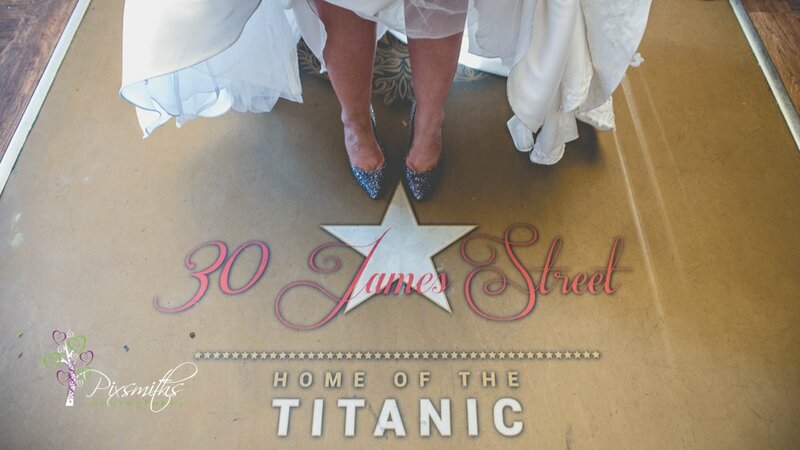 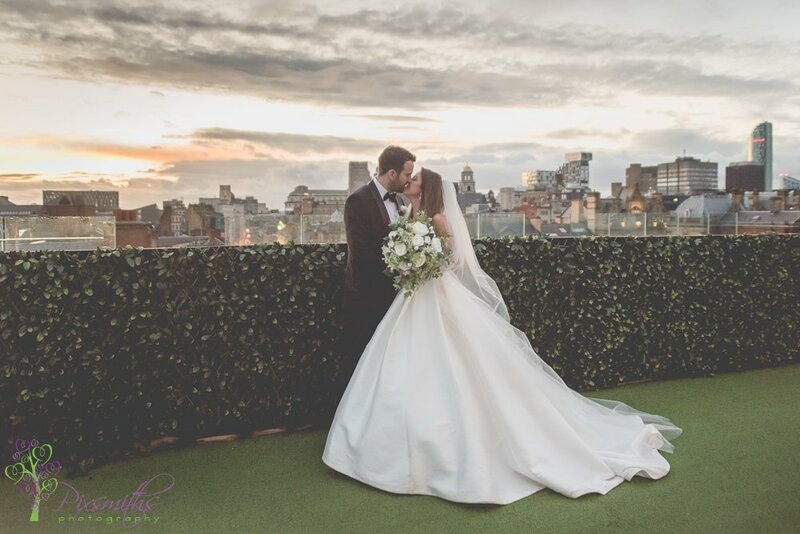 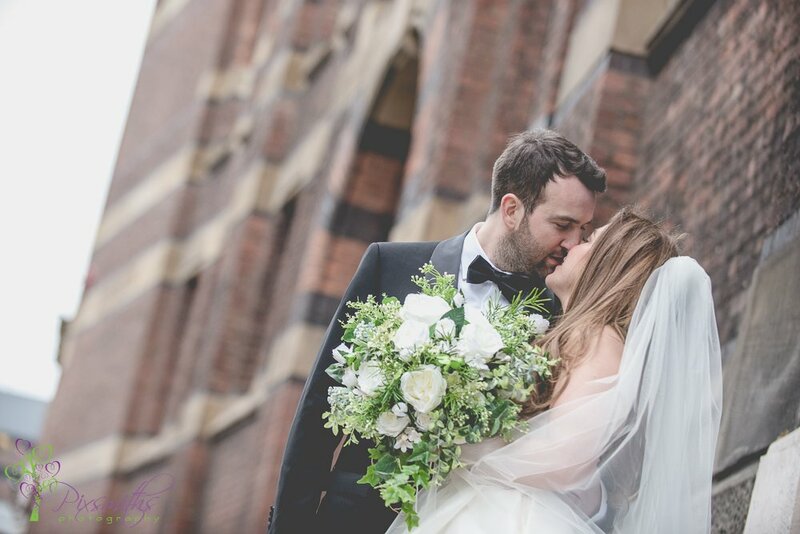 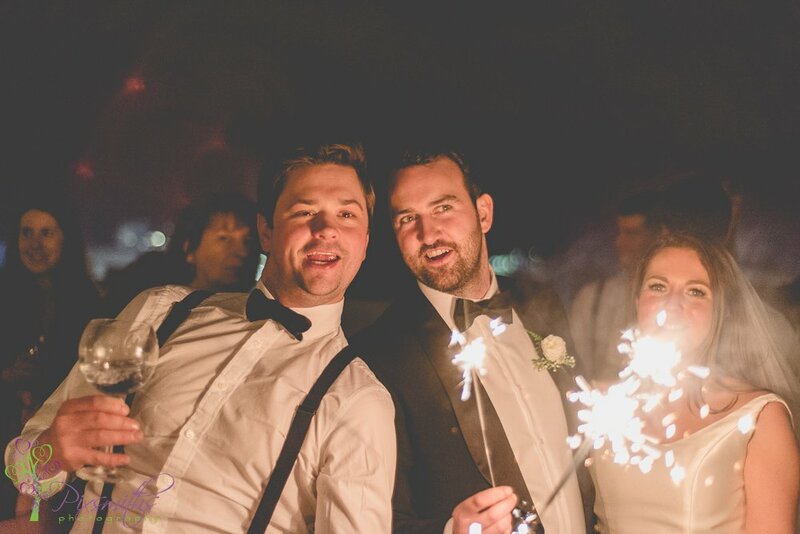 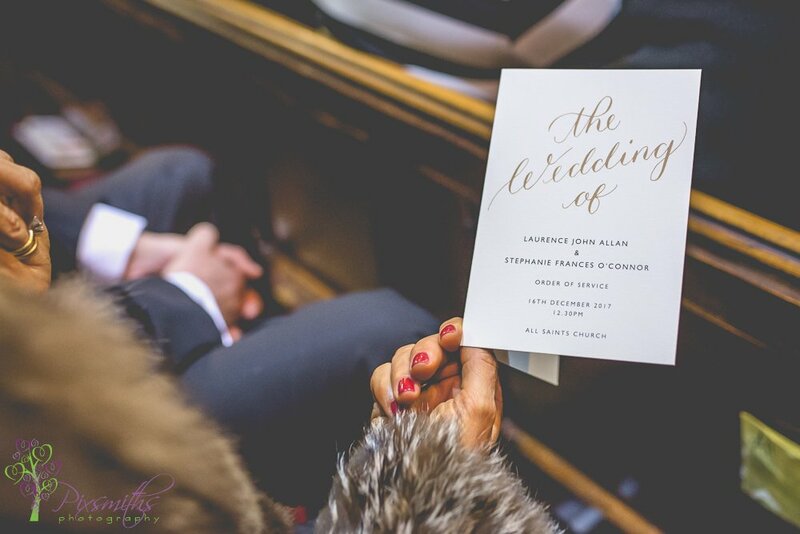 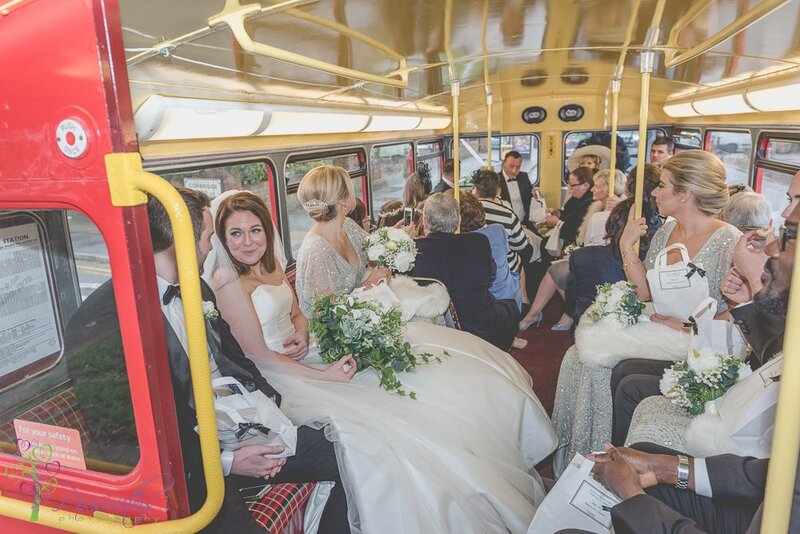 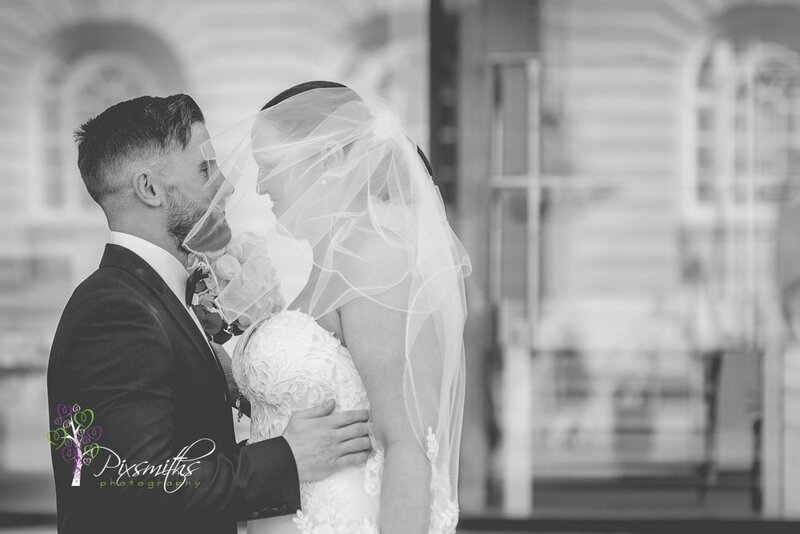 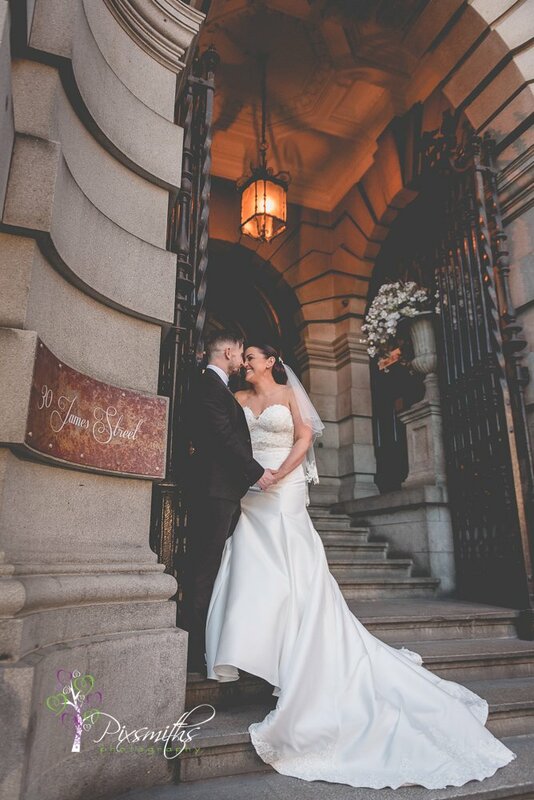 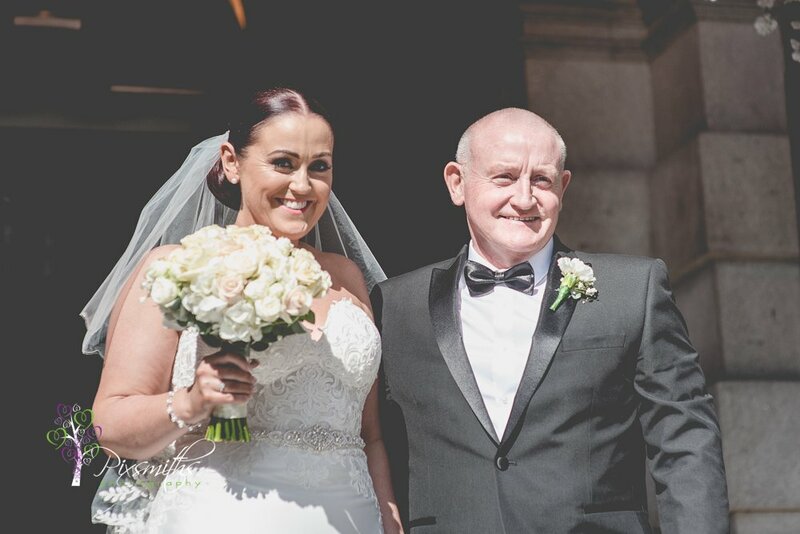 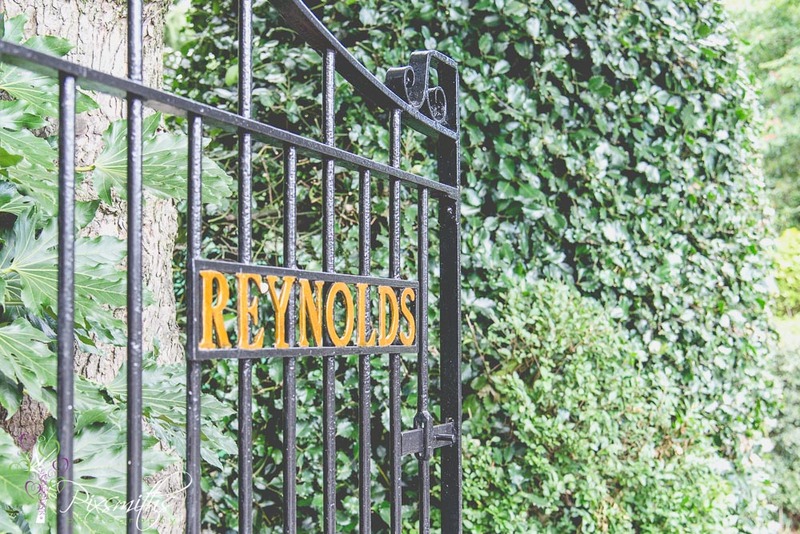 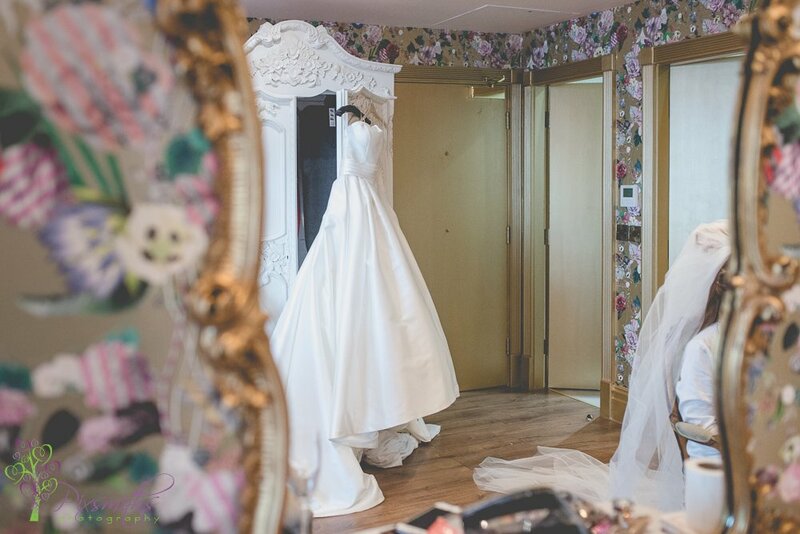 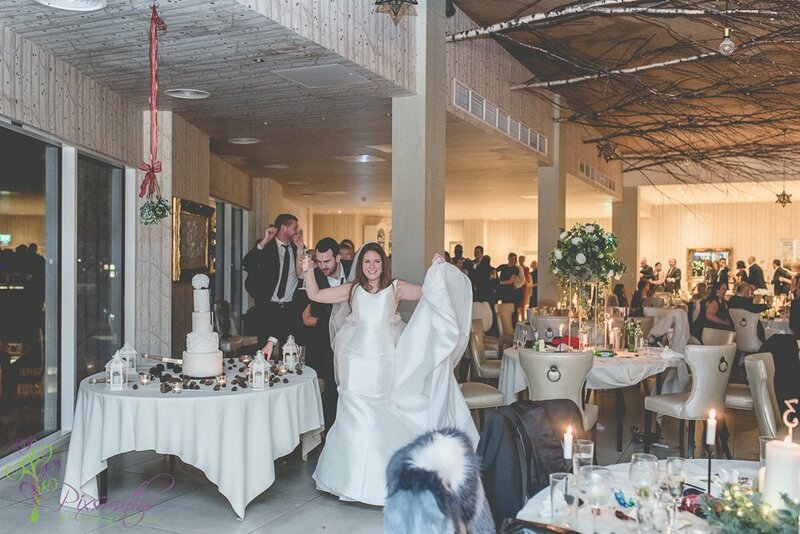 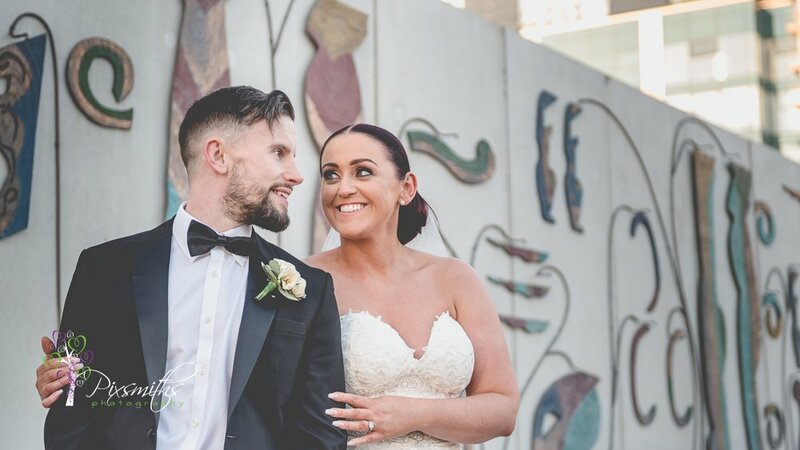 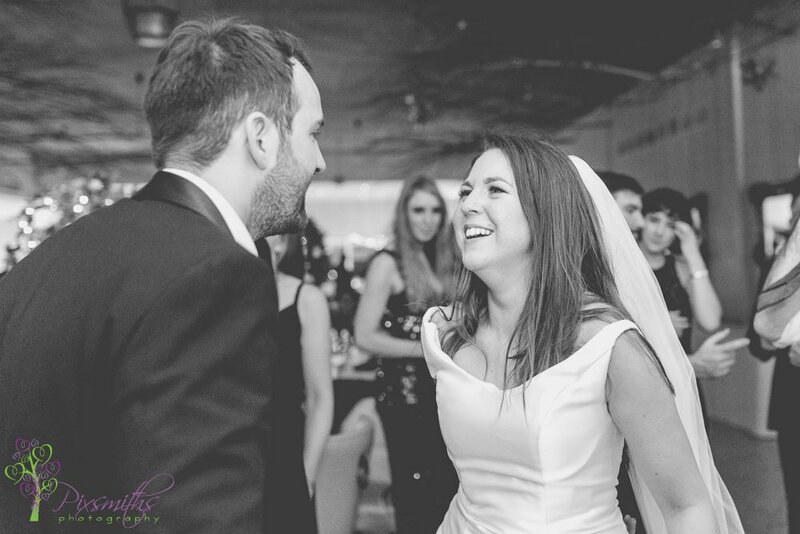 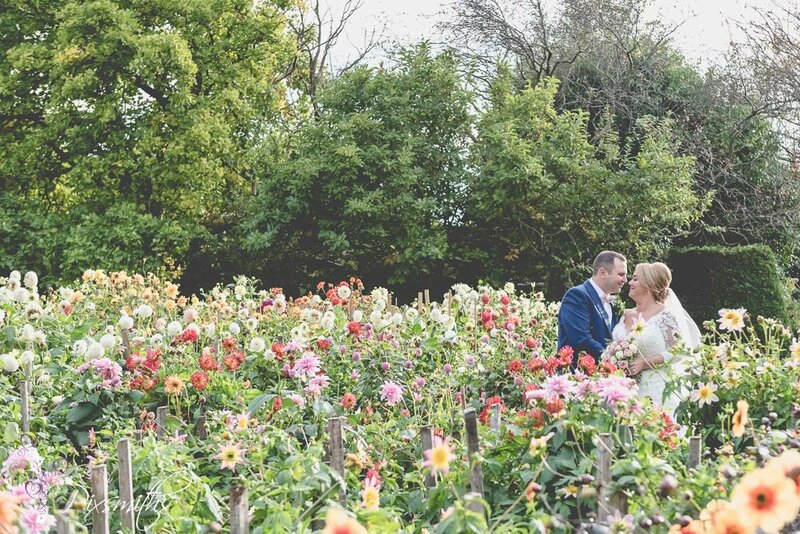 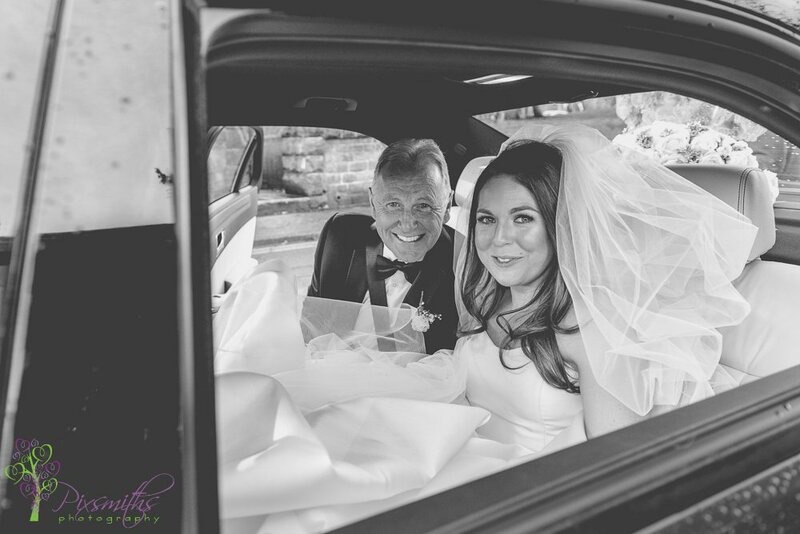 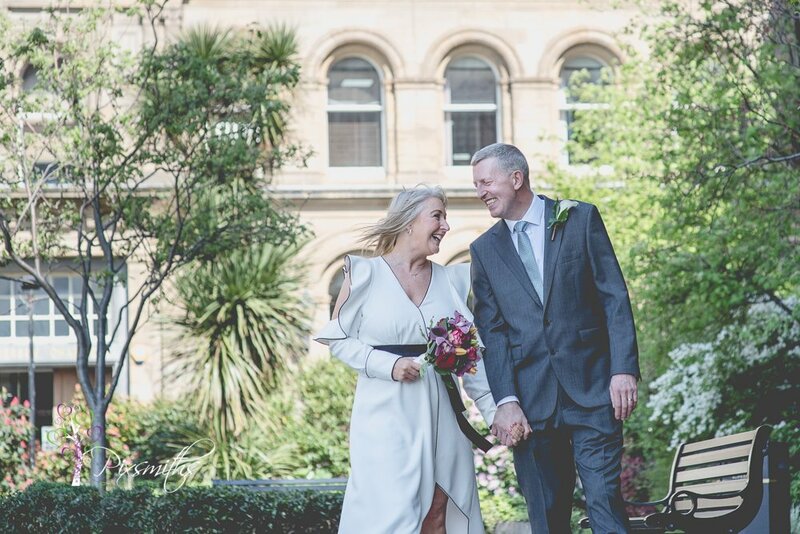 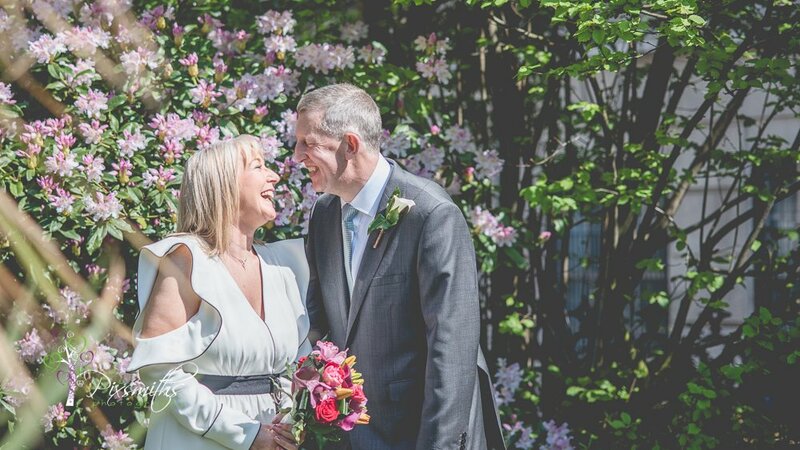 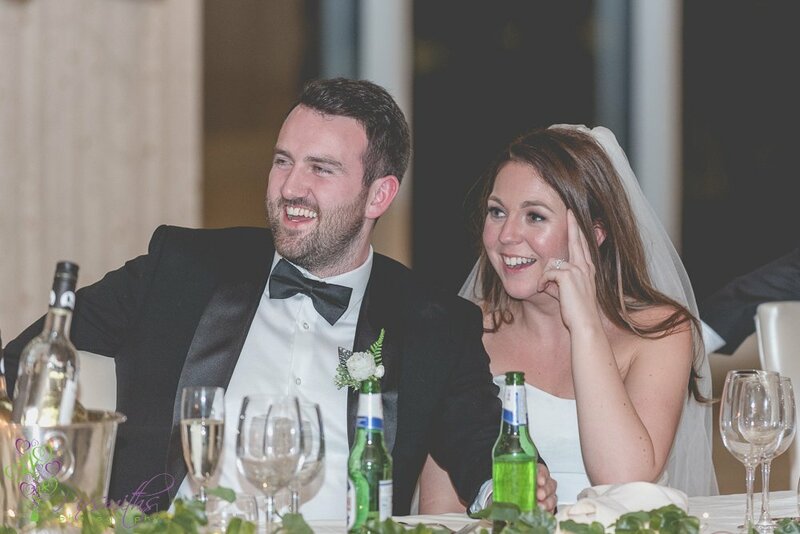 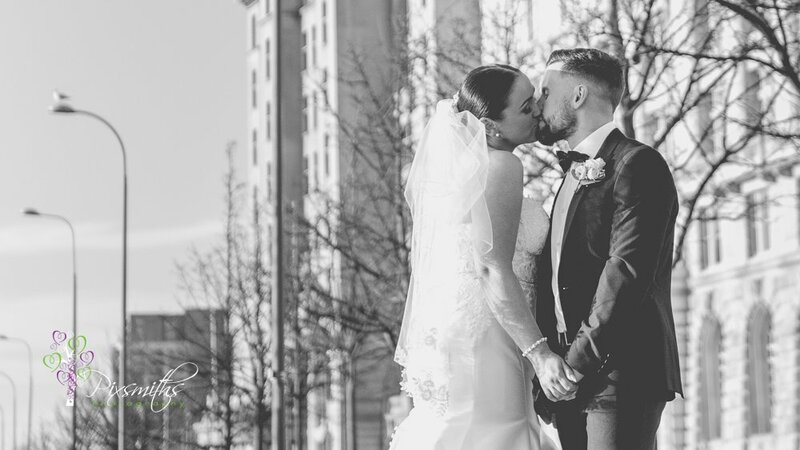 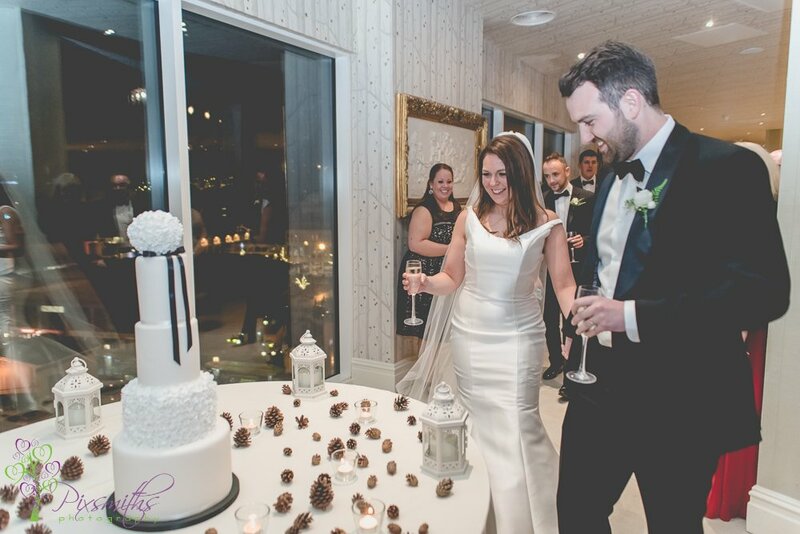 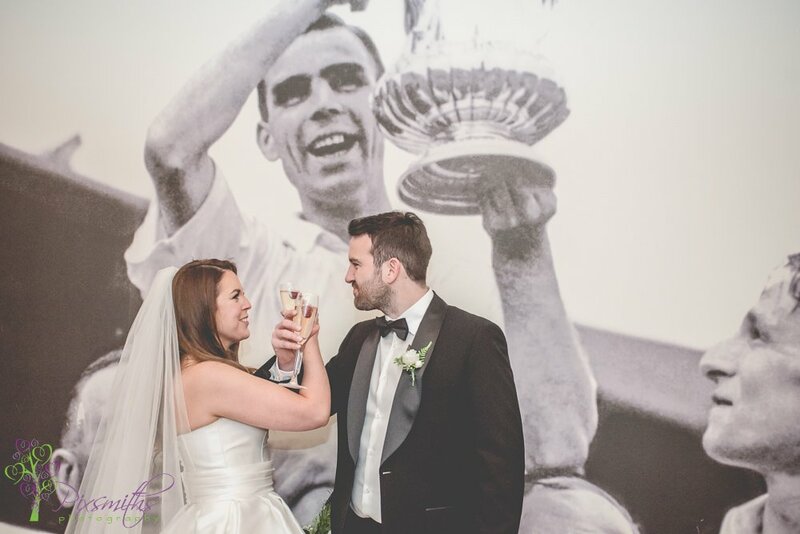 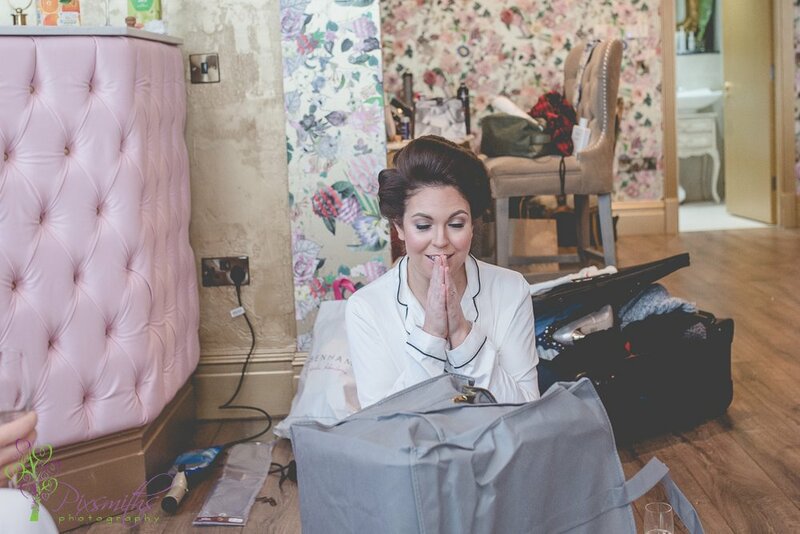 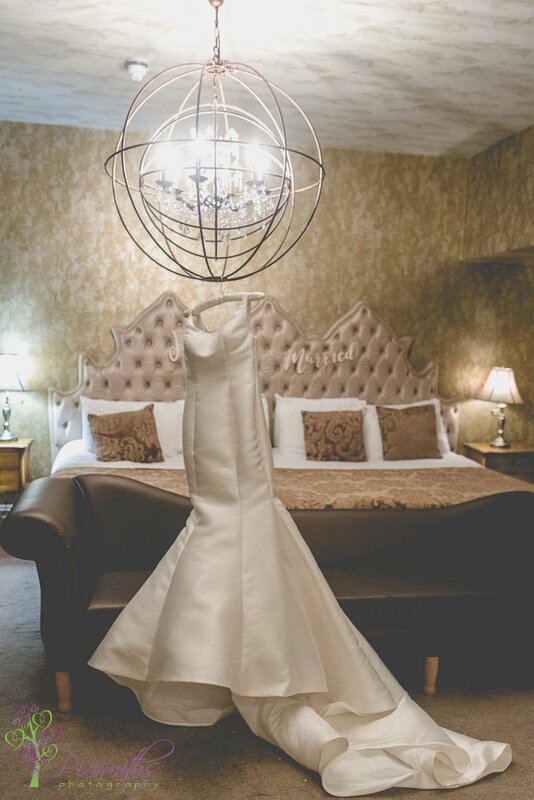 Rob and Rebecca live in the city and 30 James St was a favourite place for them – so perfect choice for their day. 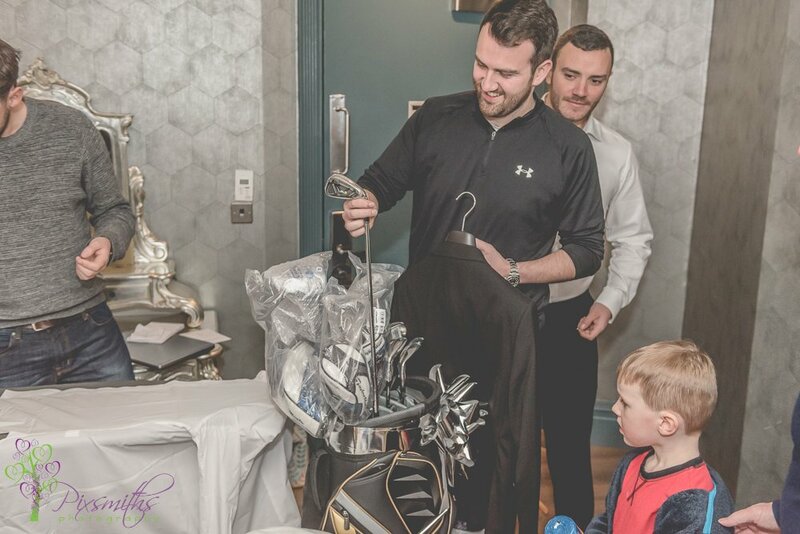 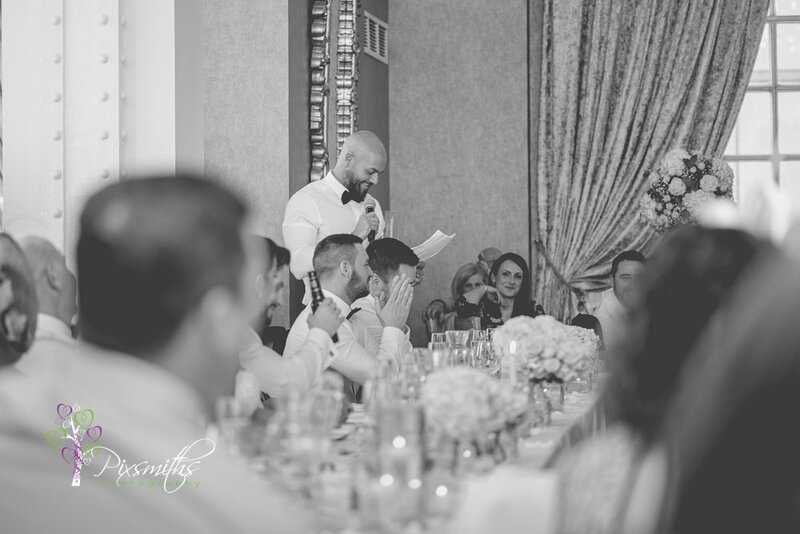 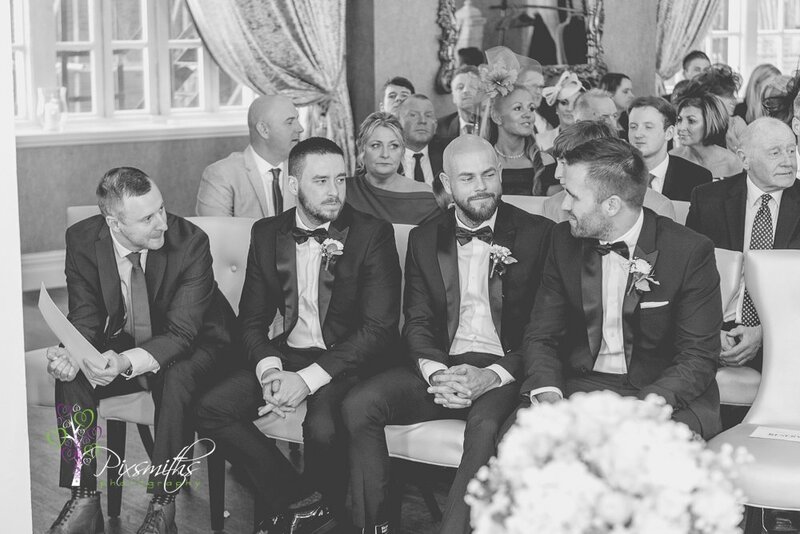 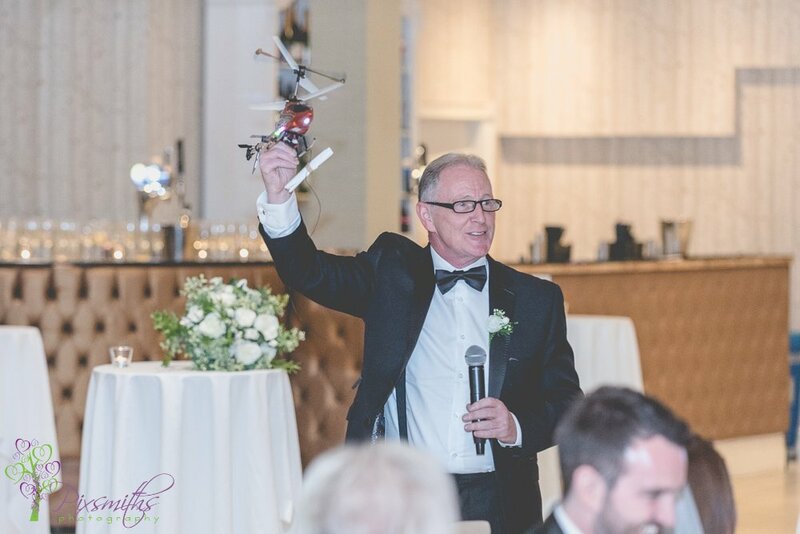 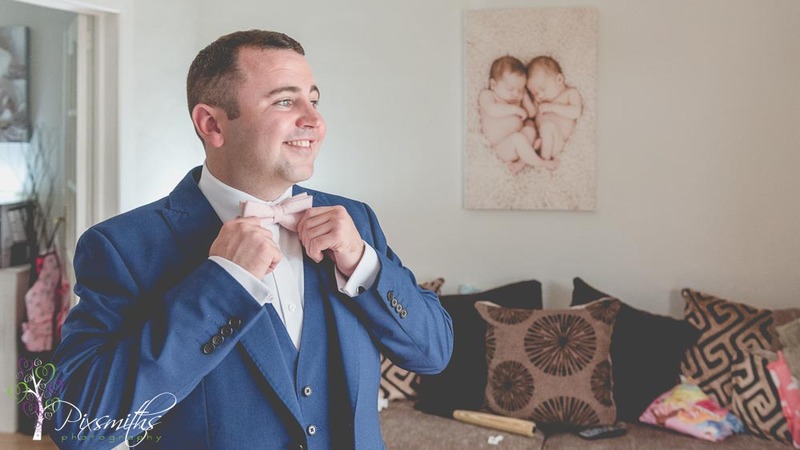 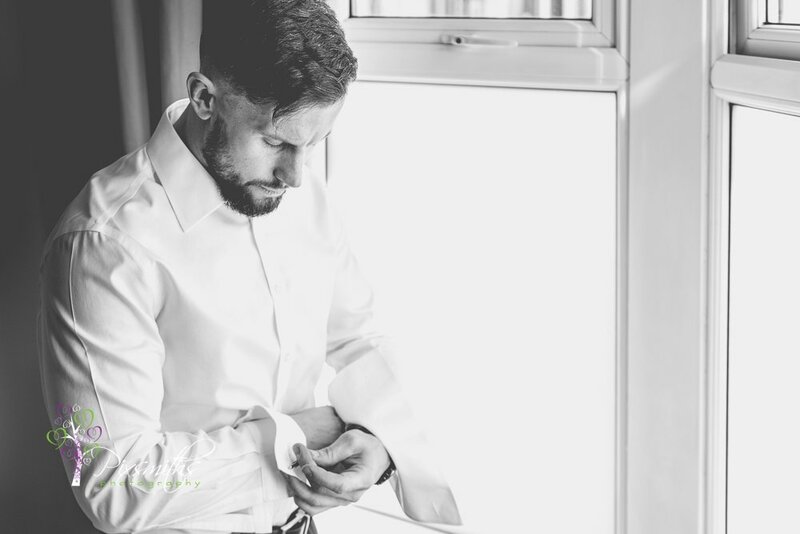 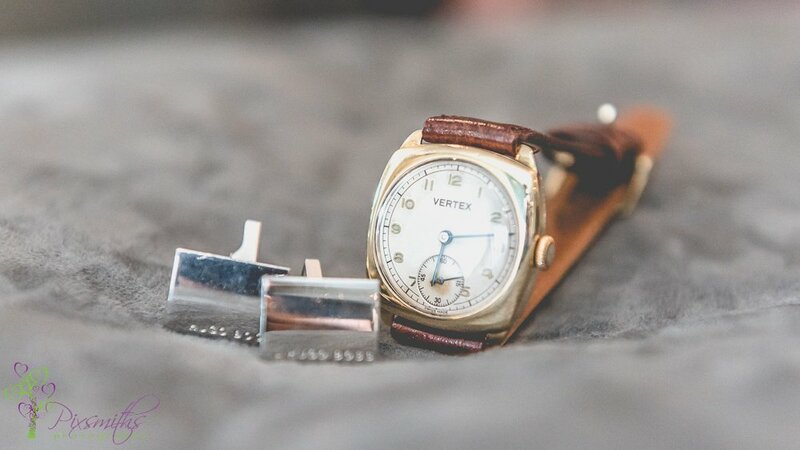 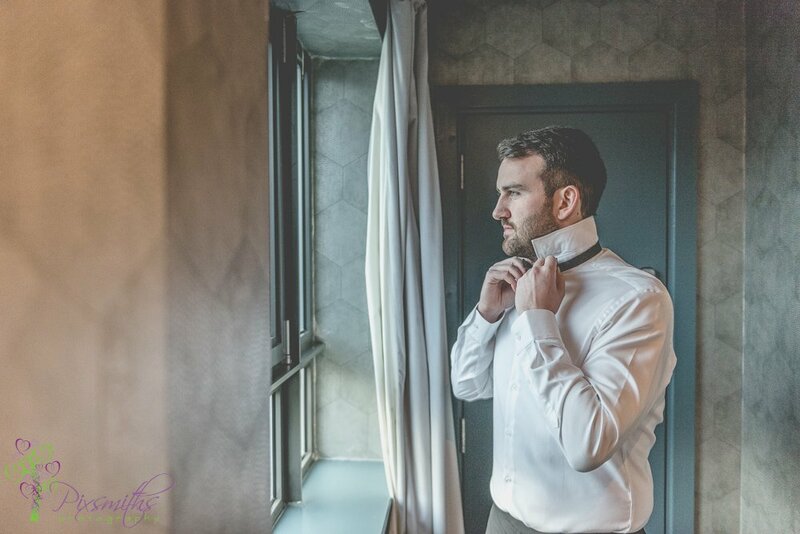 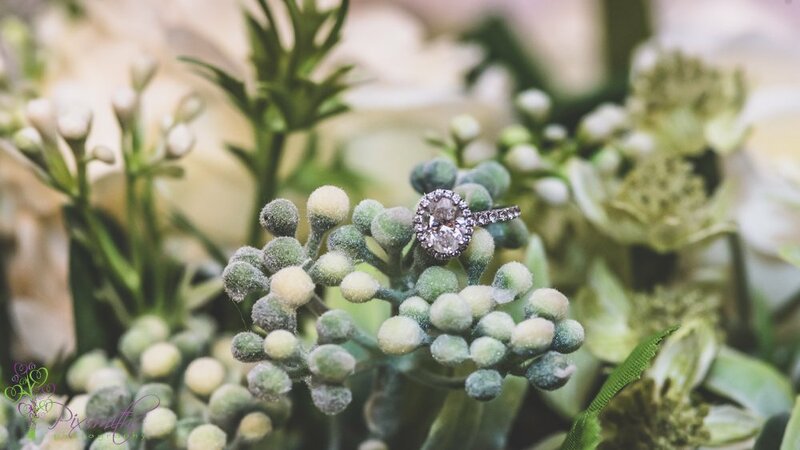 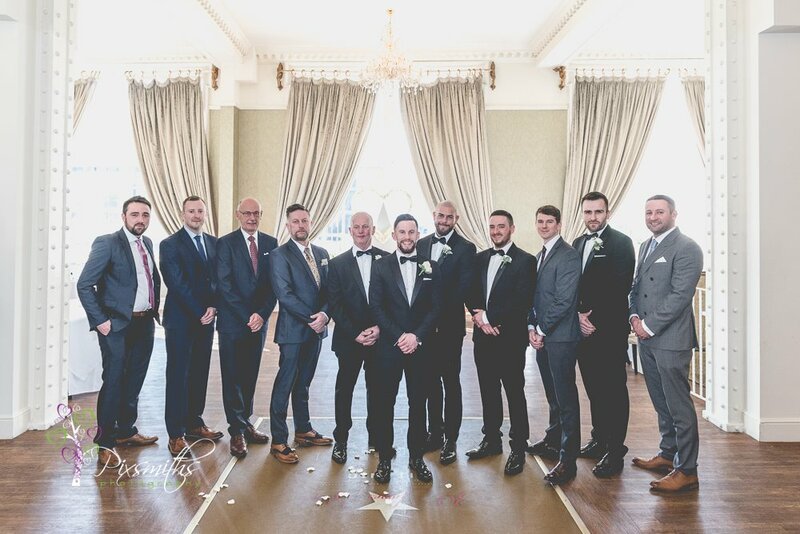 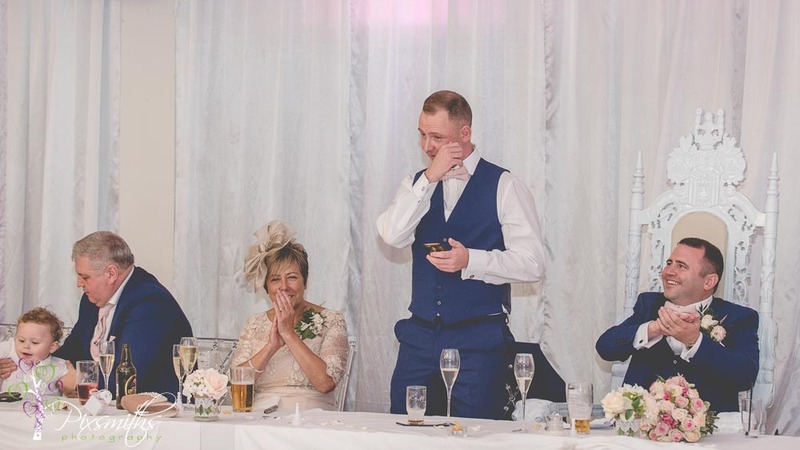 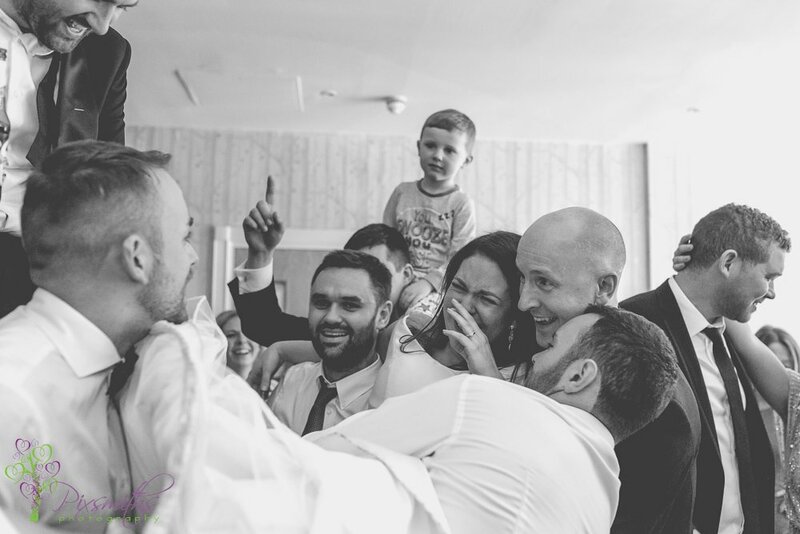 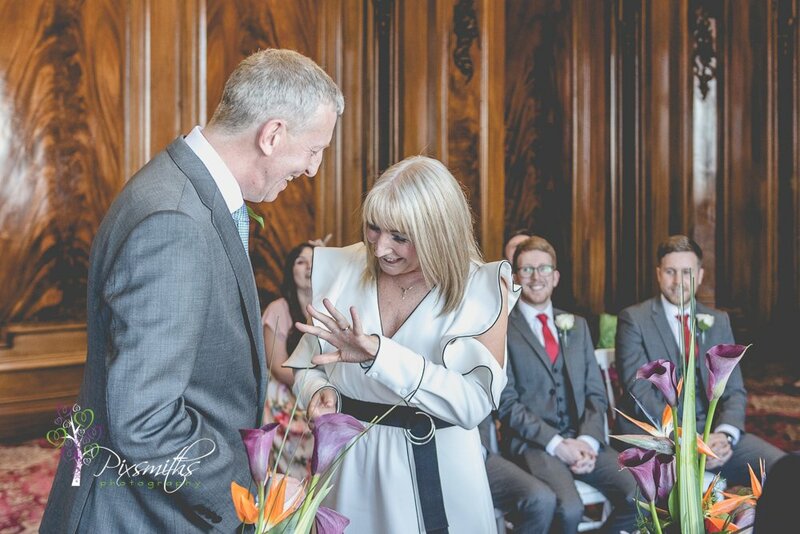 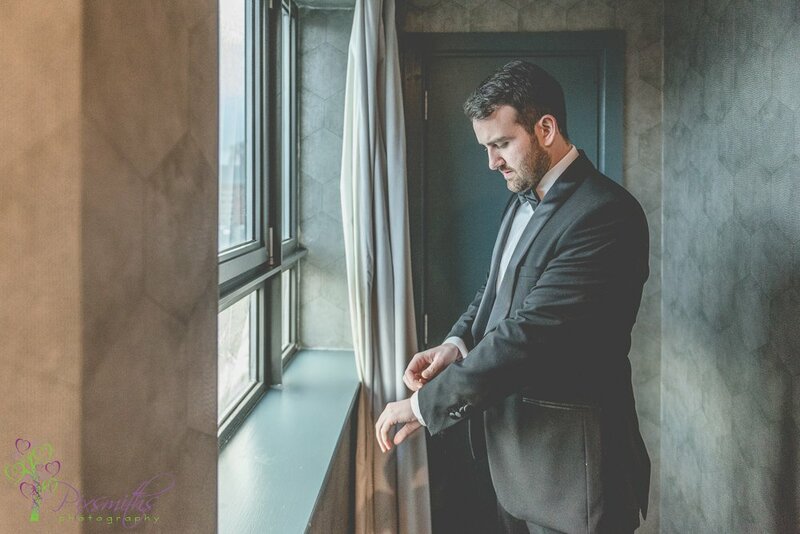 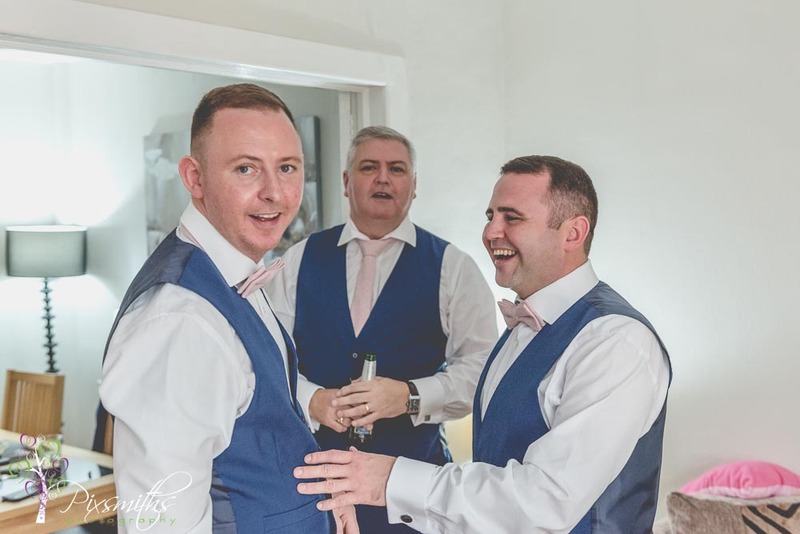 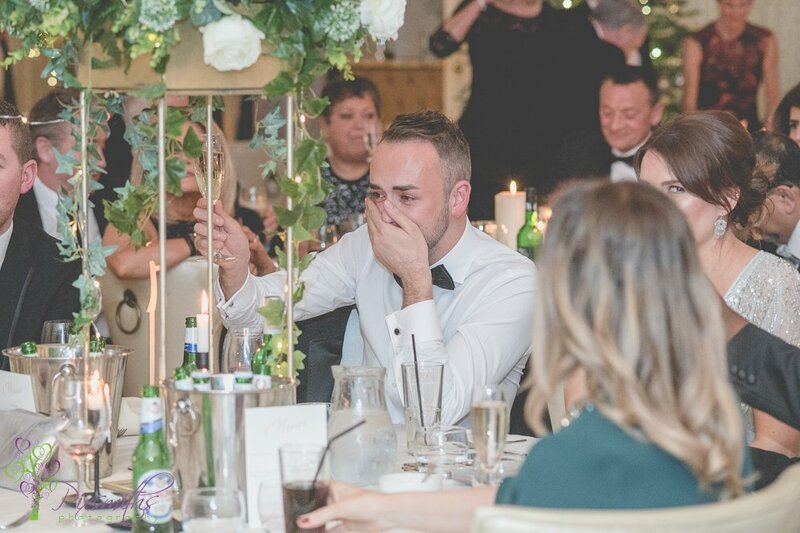 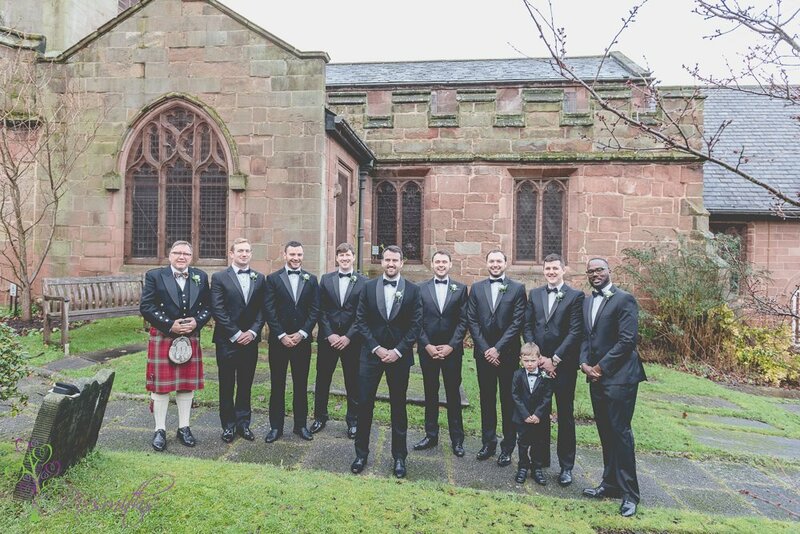 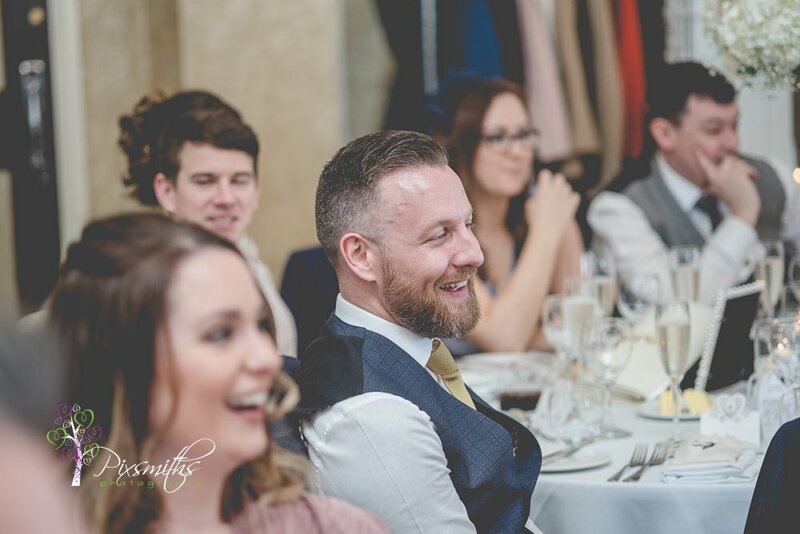 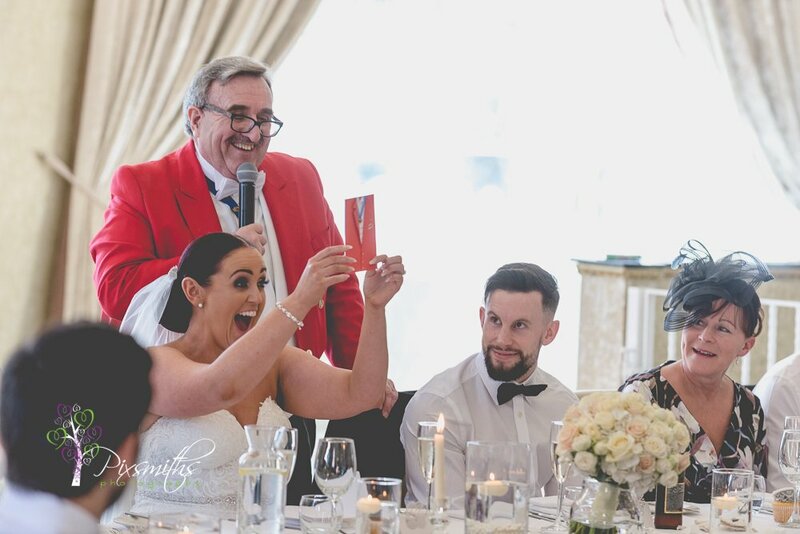 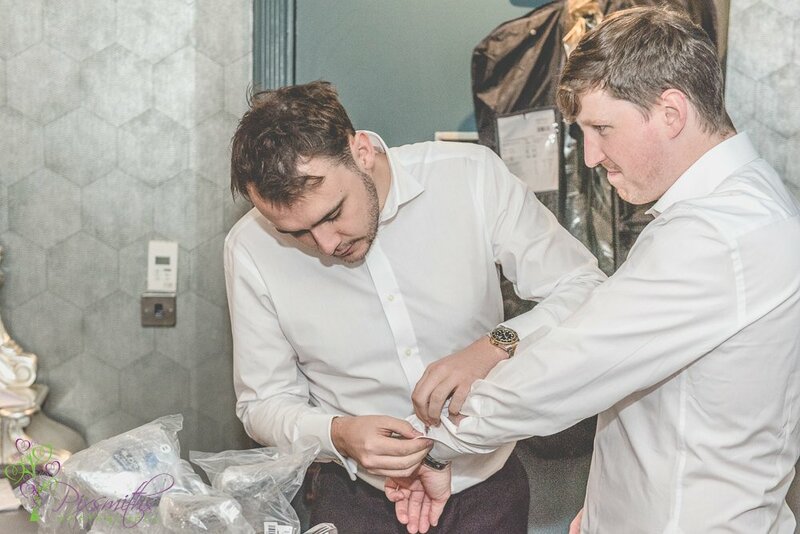 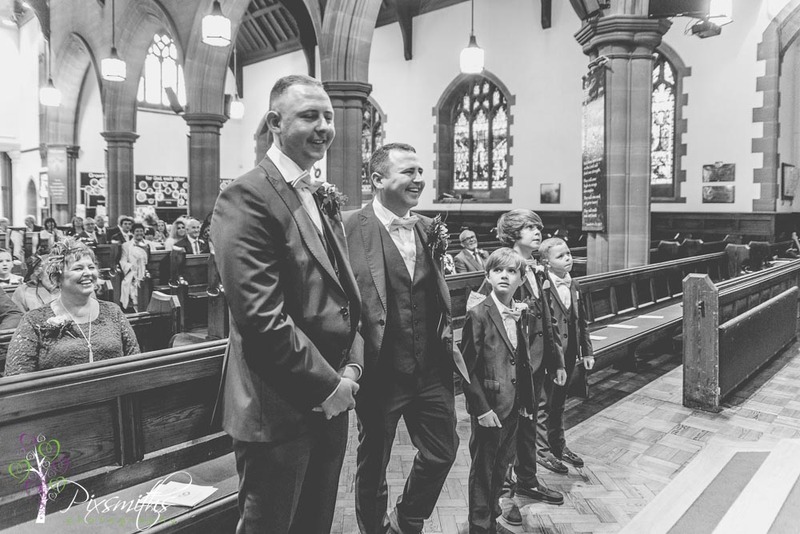 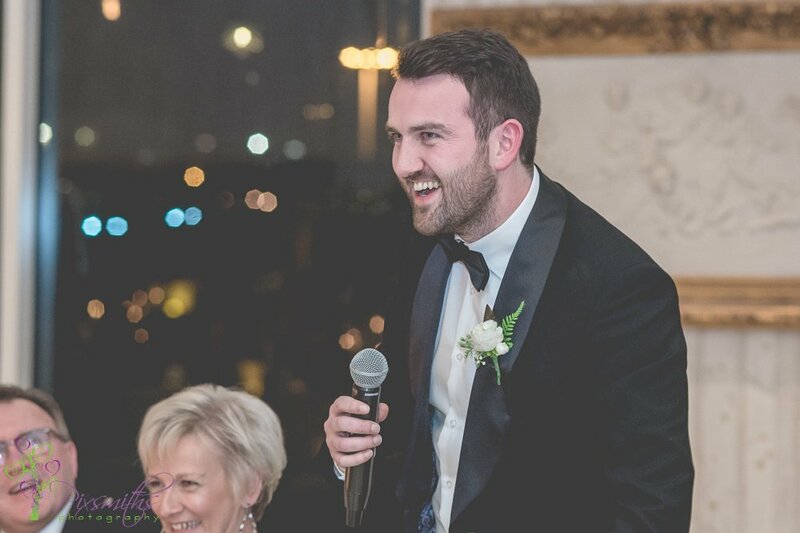 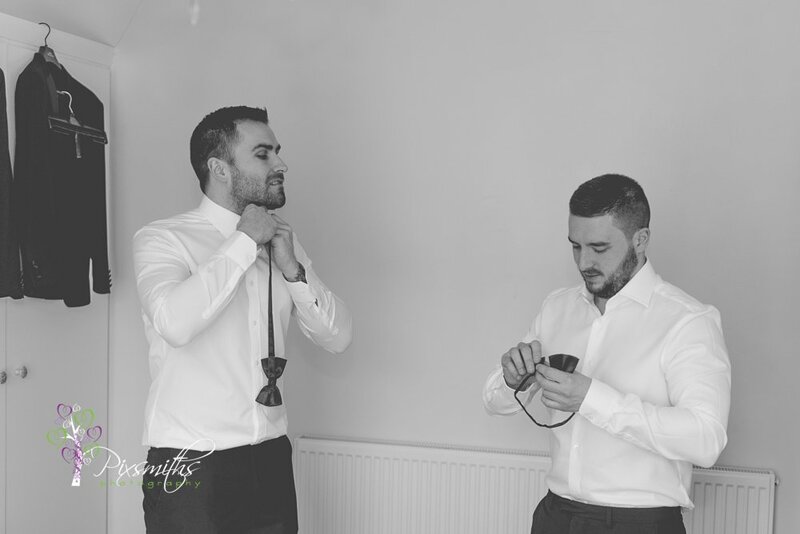 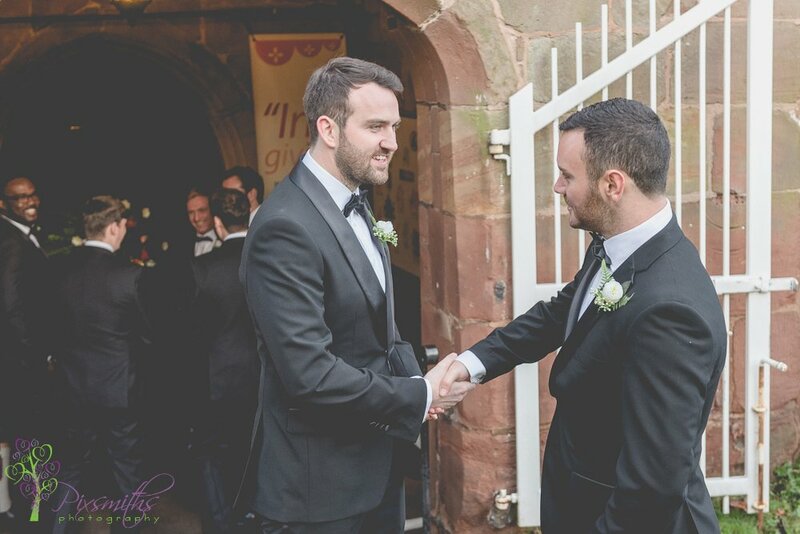 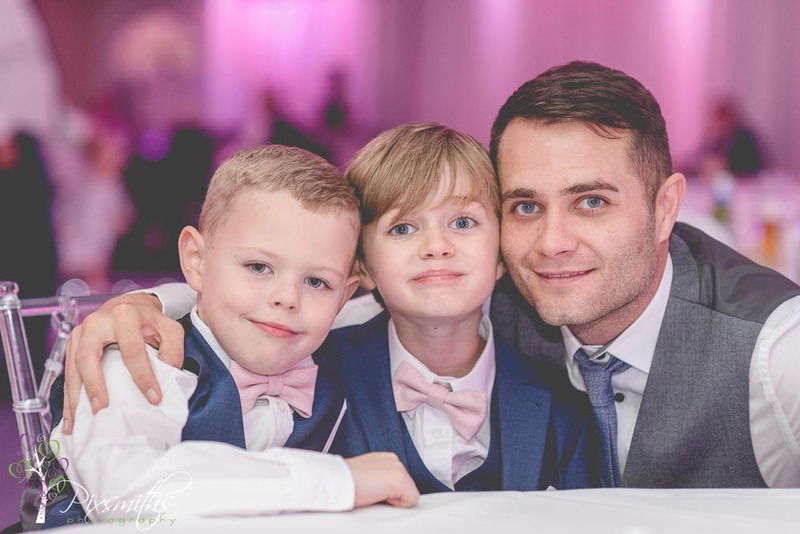 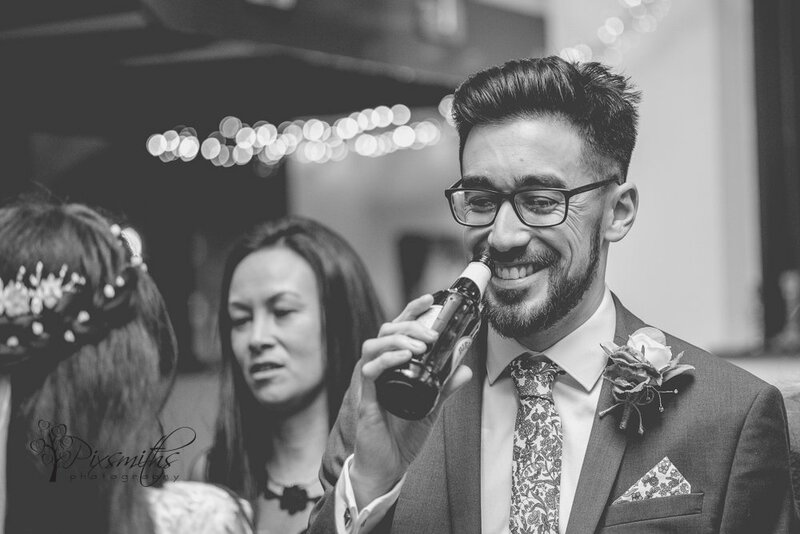 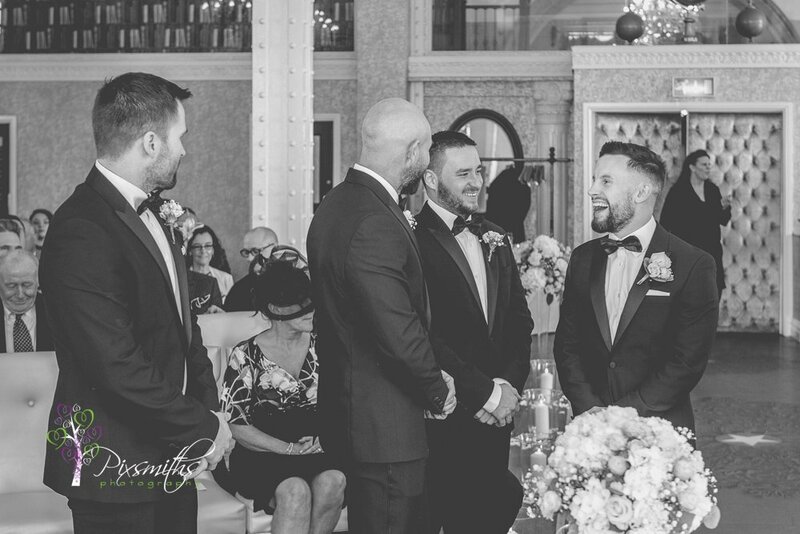 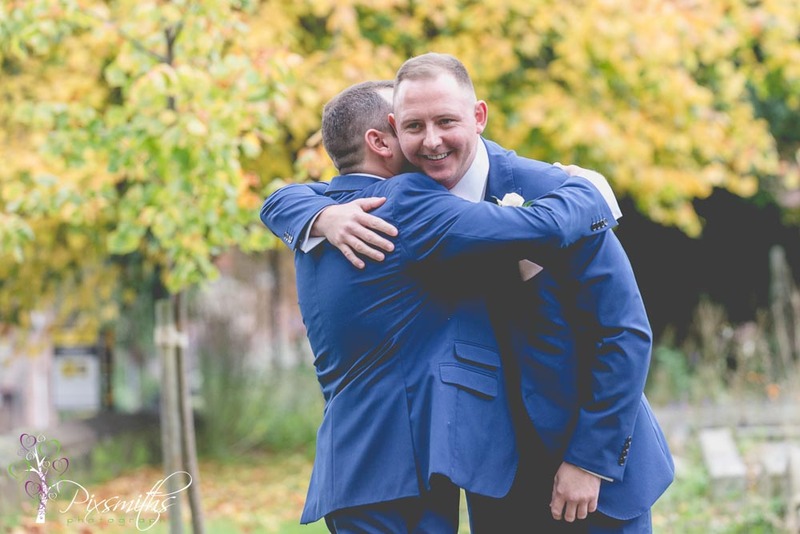 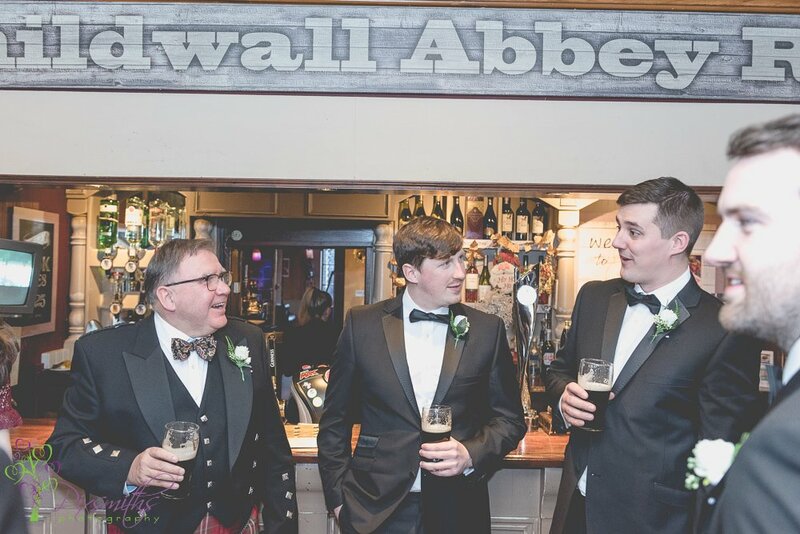 Work colleagues is where the friendship and then romance started – can’t get much more romantic than a proposal in New York and letting your bride choose a ring on 5th Avenue – like your style Rob! 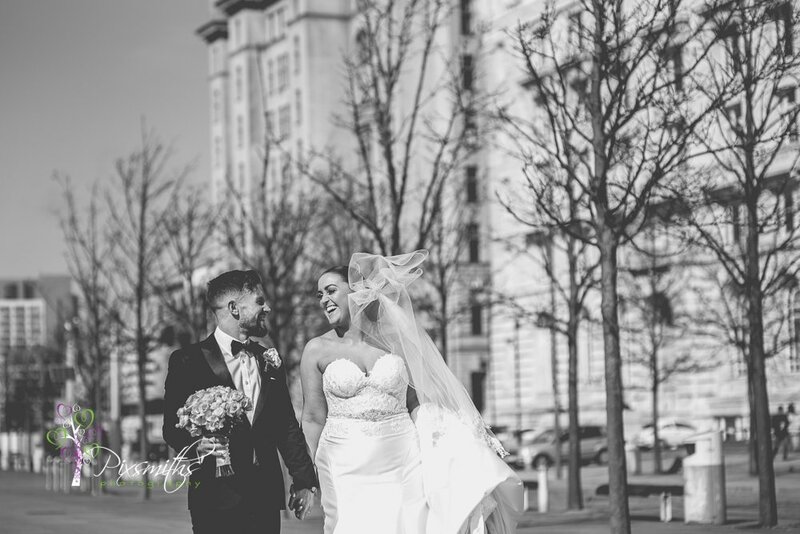 Fast forward from all the planning and the day was here, a bright but cool day in March. 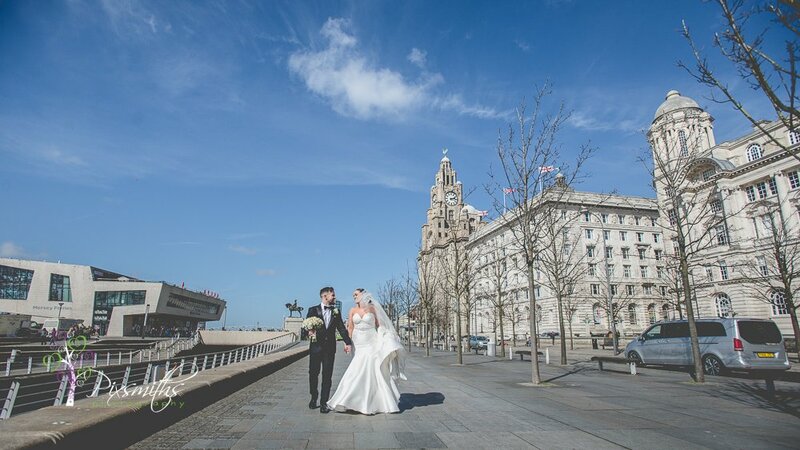 We survived running around Liverpool covering Bride and Groom preps with closed roads for the Liverpool half marathon. 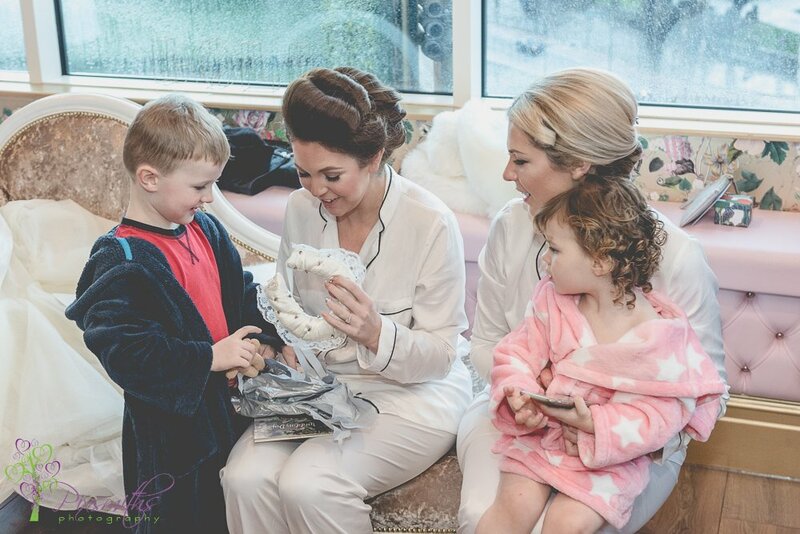 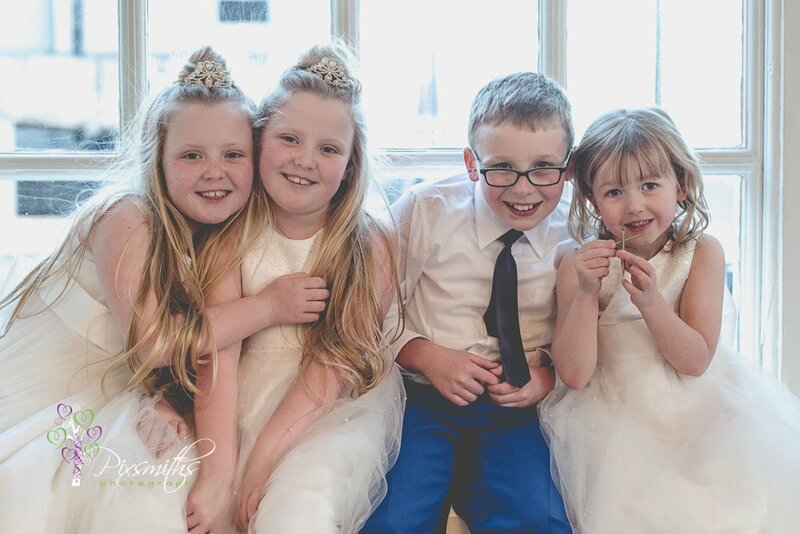 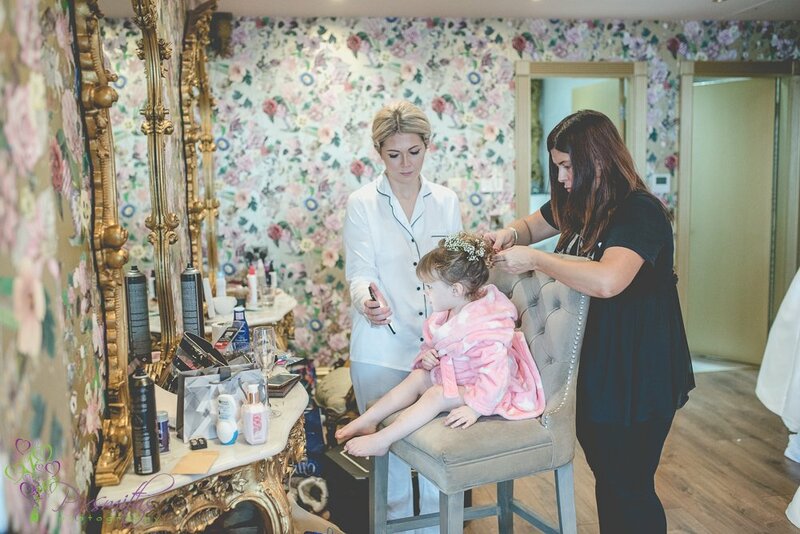 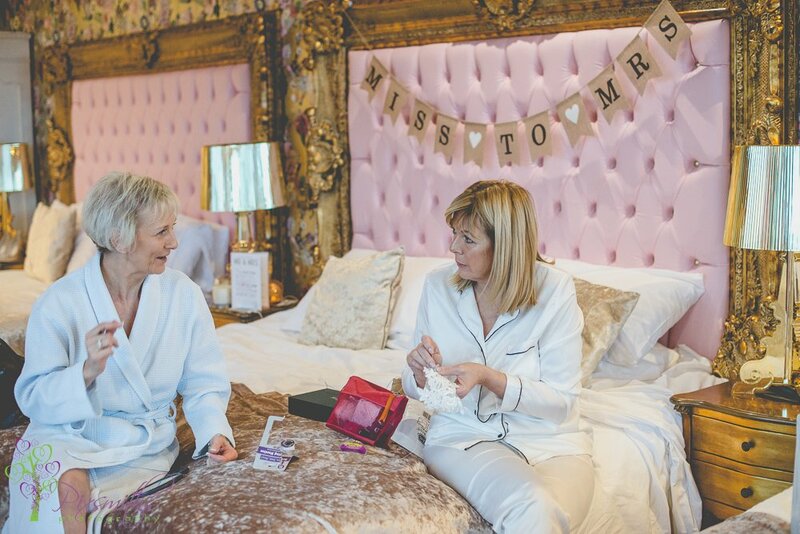 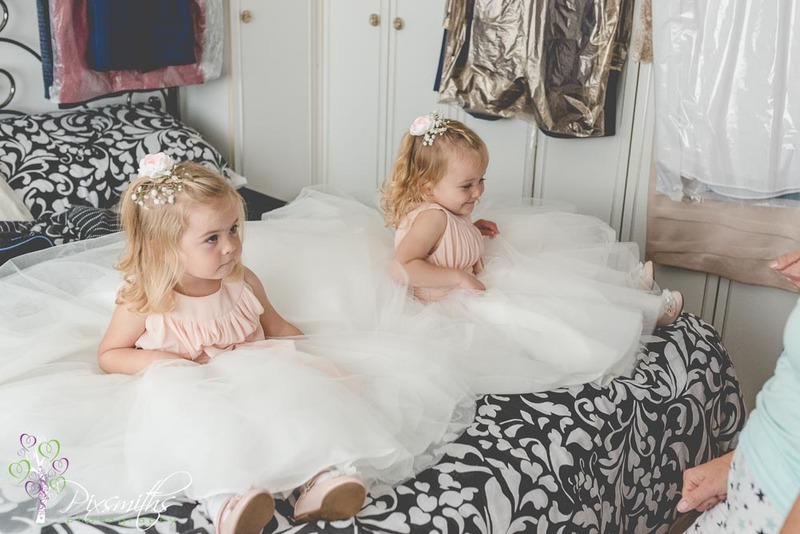 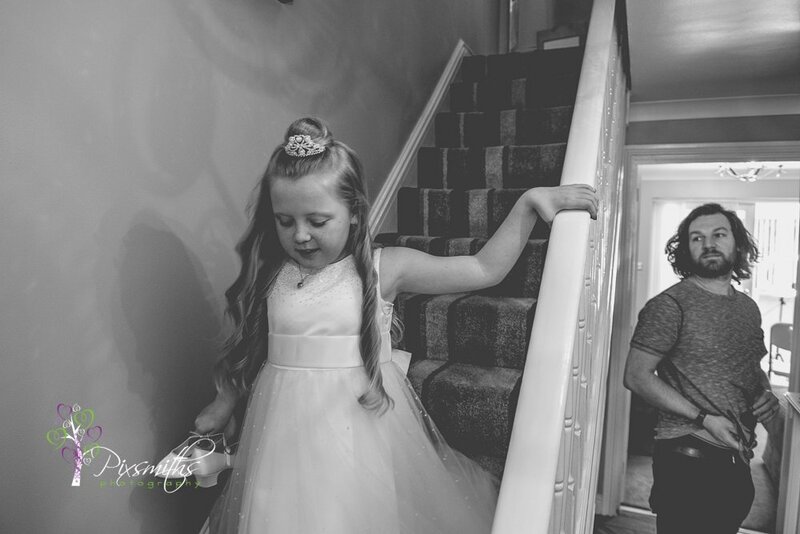 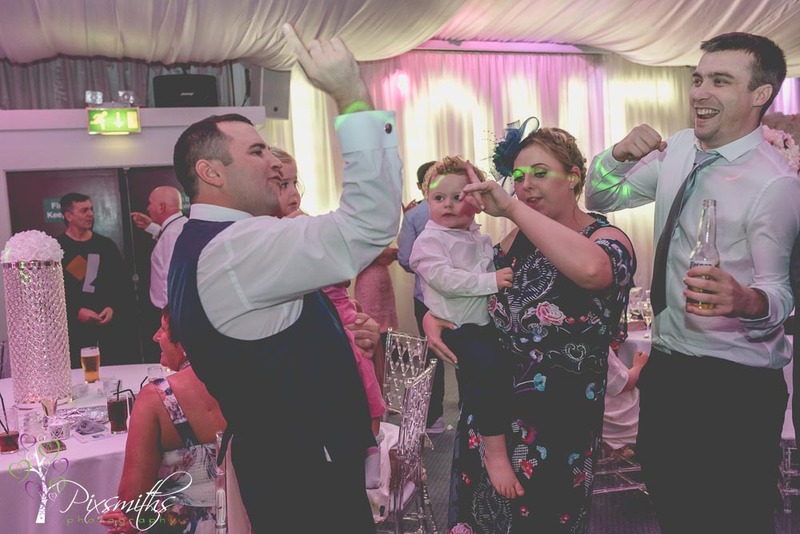 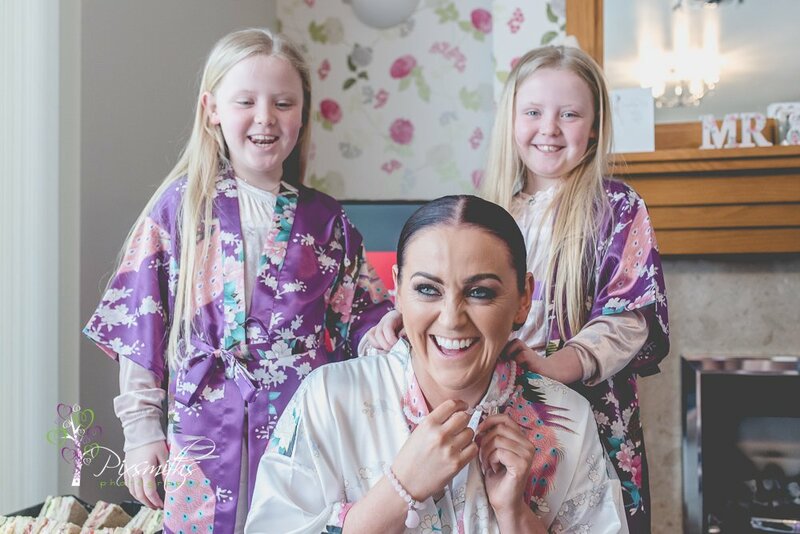 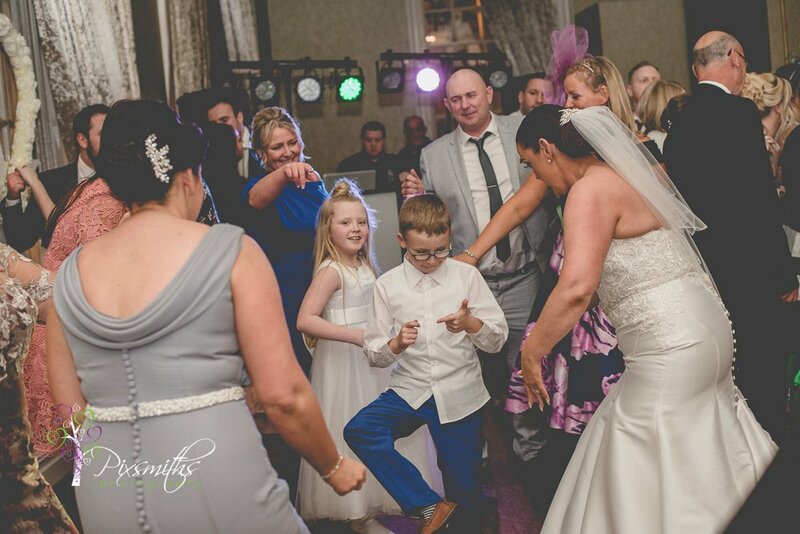 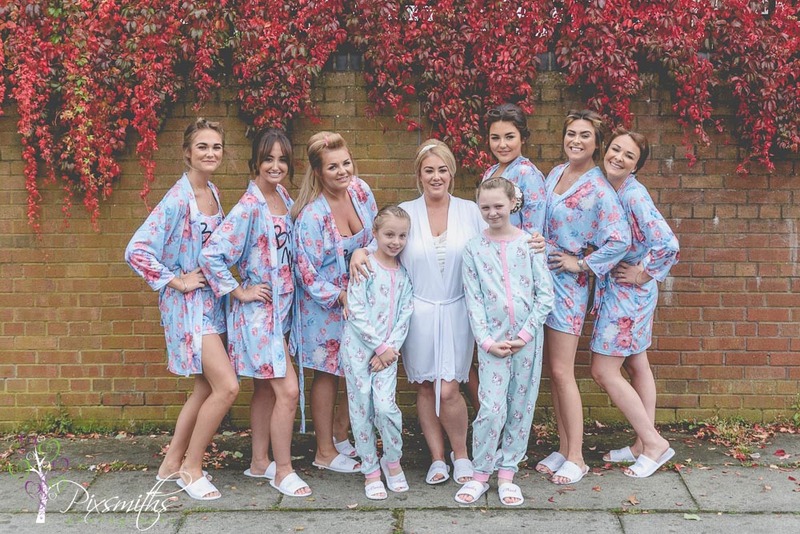 Rebecca was chilled out being pampered and enjoying trying out the new floss dance with her flower girls and page boy. 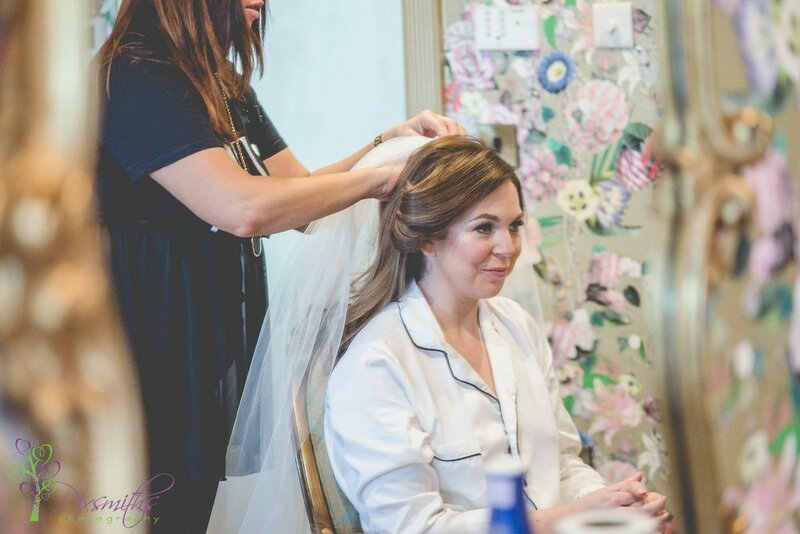 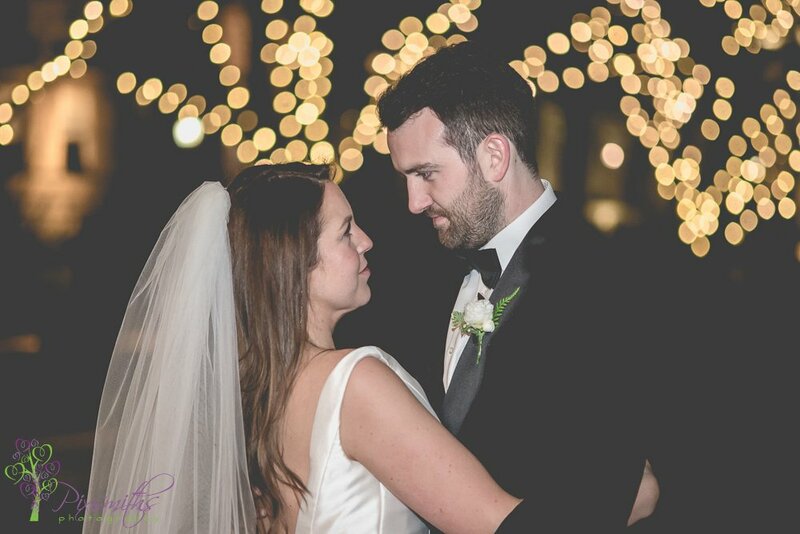 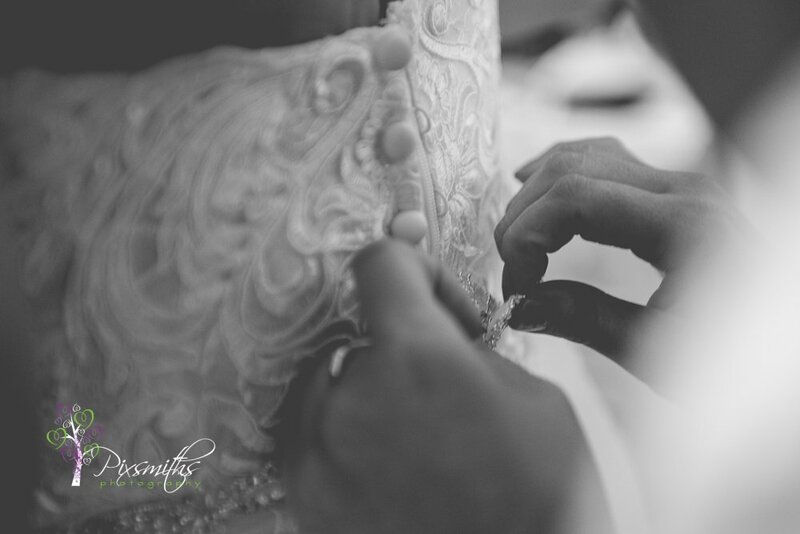 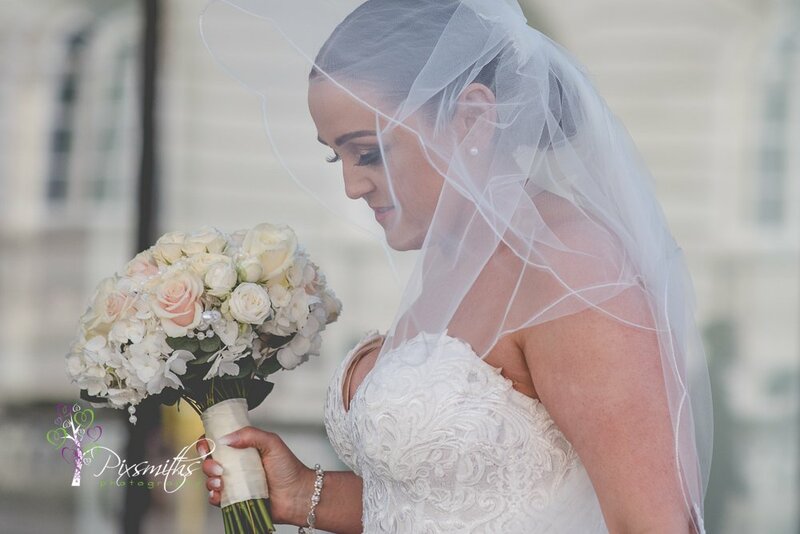 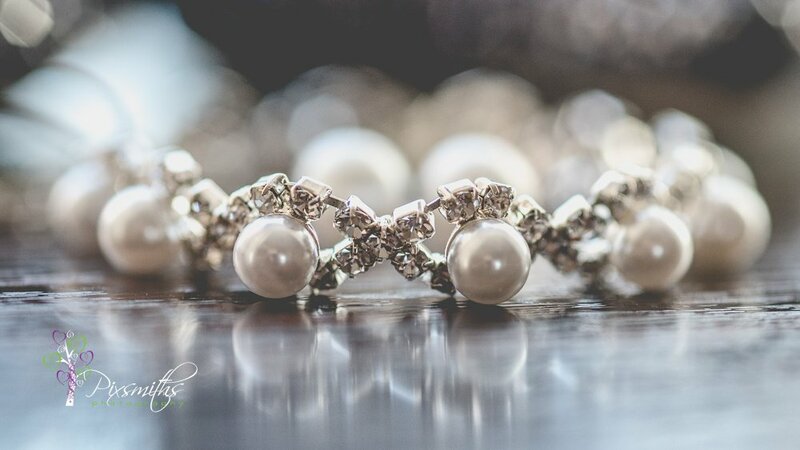 Rebecca’s details were elegant pearls in her headpiece, bracelet and earings. 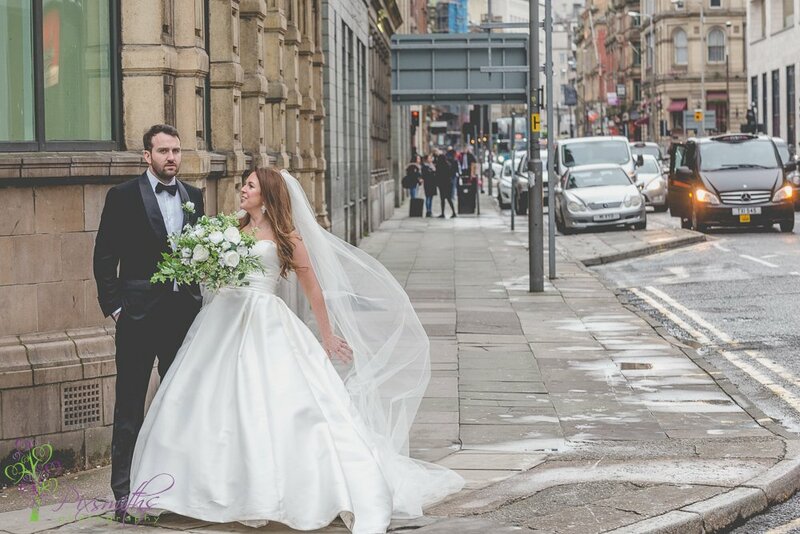 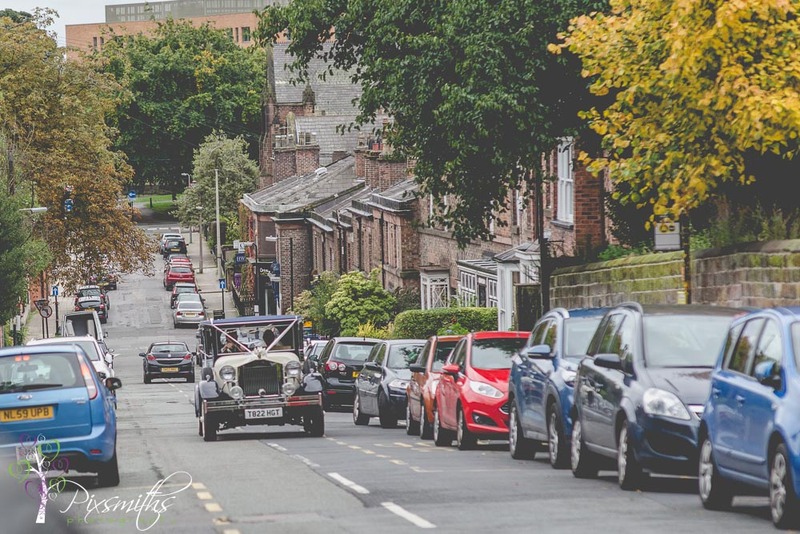 Getting to 30 James St for the Liverpool city centre wedding ceremony was relatively easier than the preps. 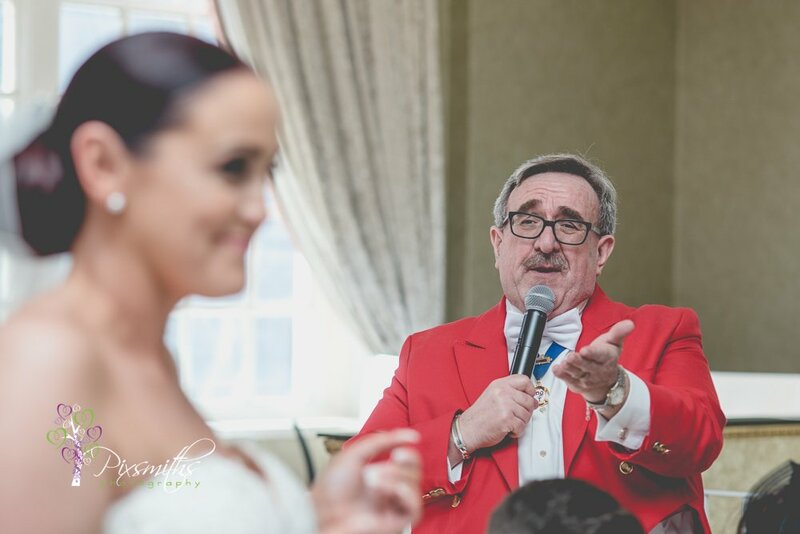 With the co-ordinator organising her team and the toastmaster organising the guests all went smoothly for Rebecca’s arrival and entrance for a waiting, slightly nervous Rob. 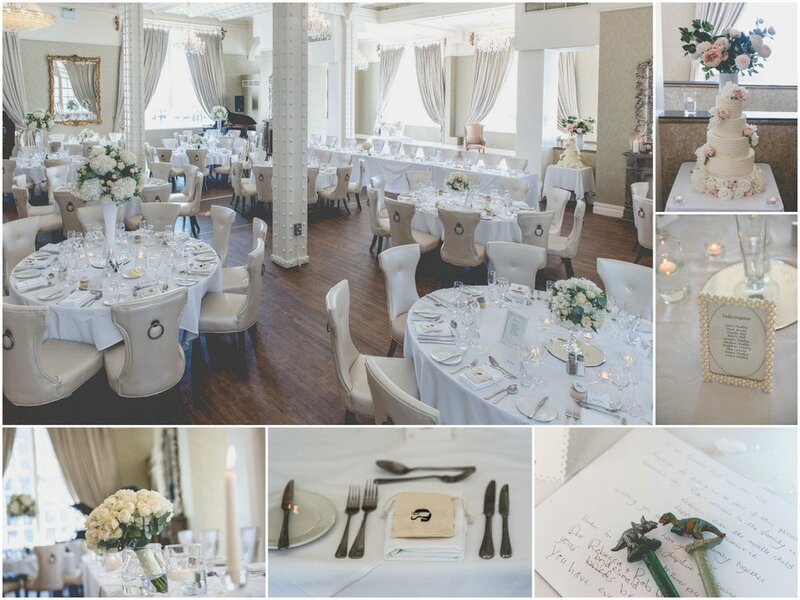 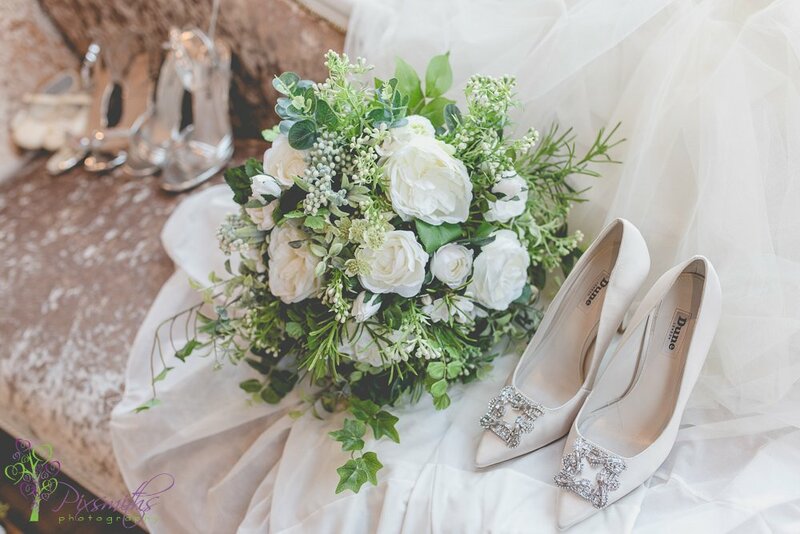 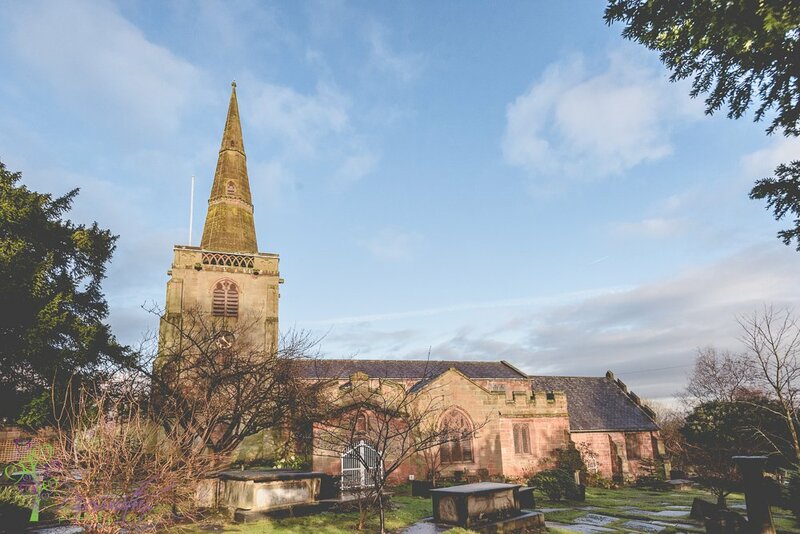 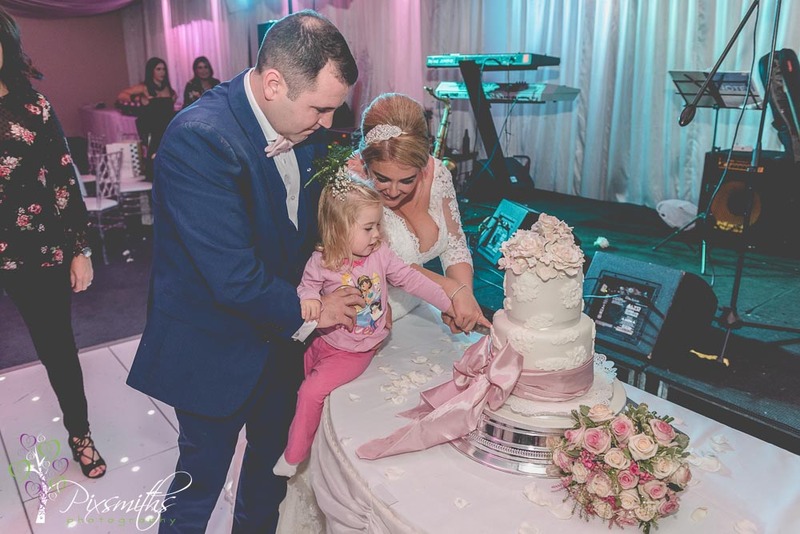 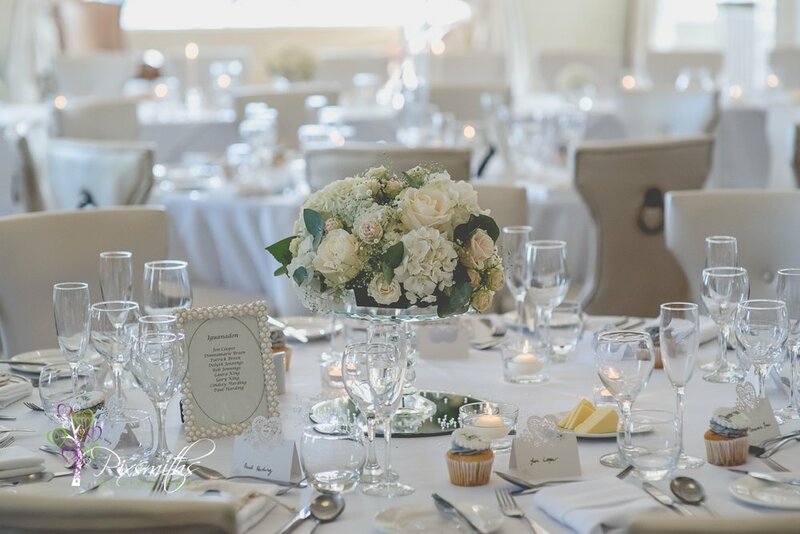 The venue was beautifully decorated with white, cream and green flowers and the aisle lined with candles and the iconic white star emblem on the floor. 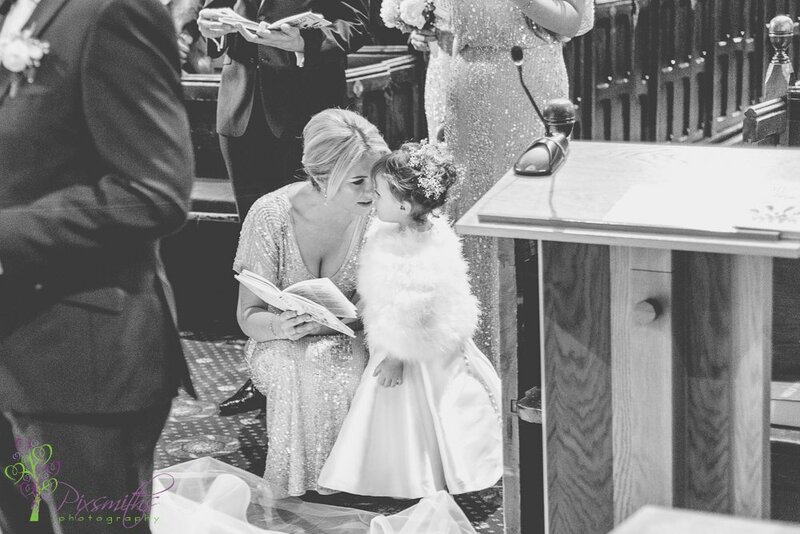 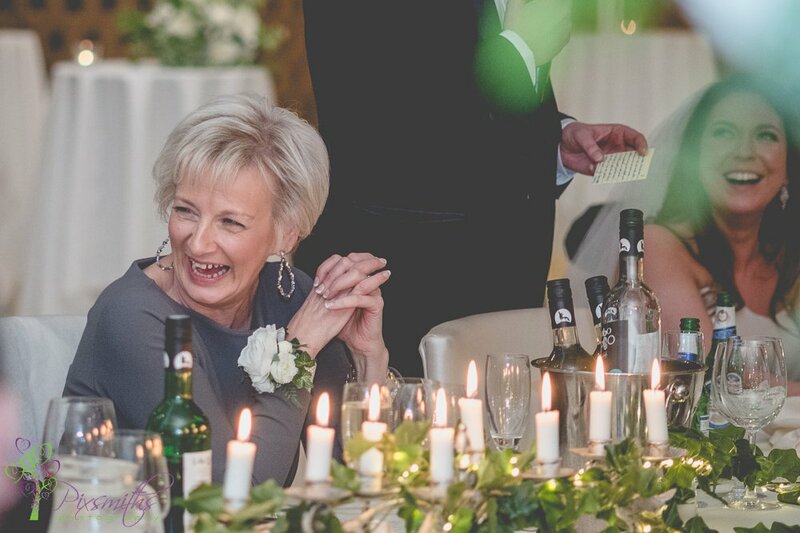 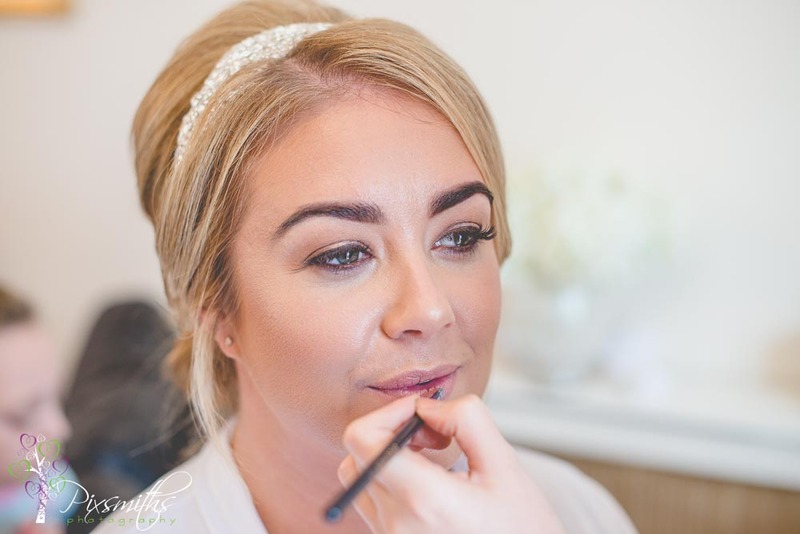 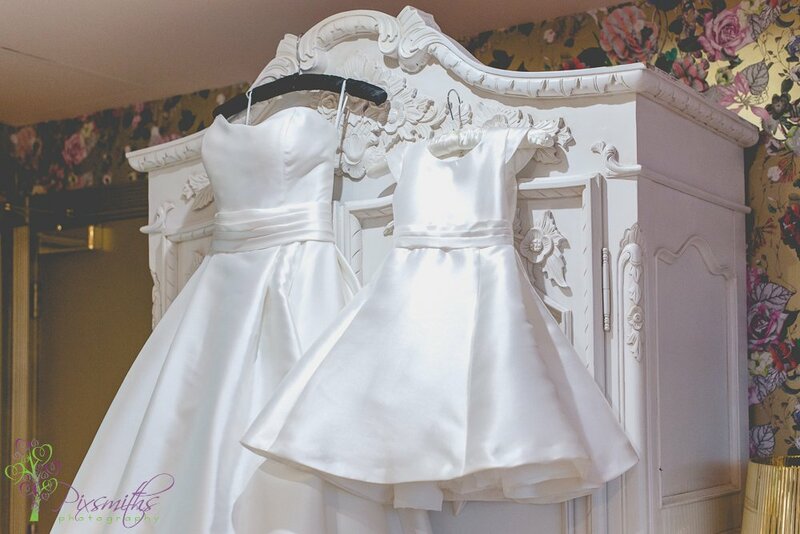 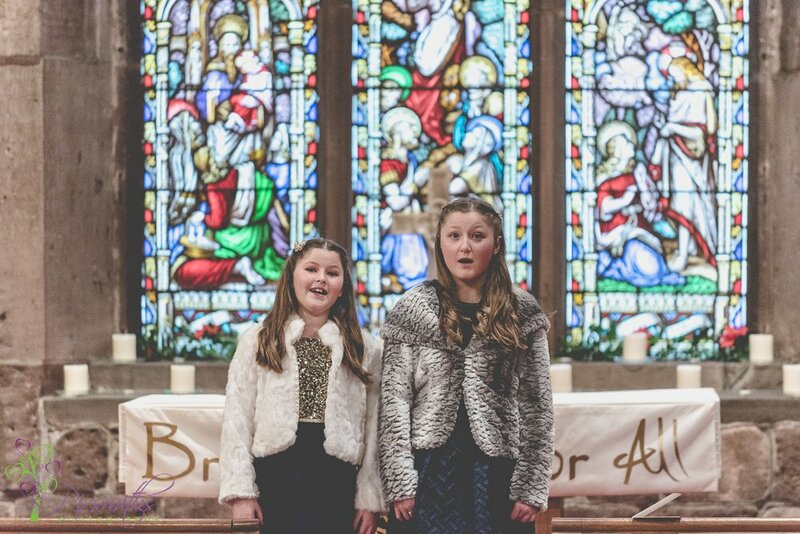 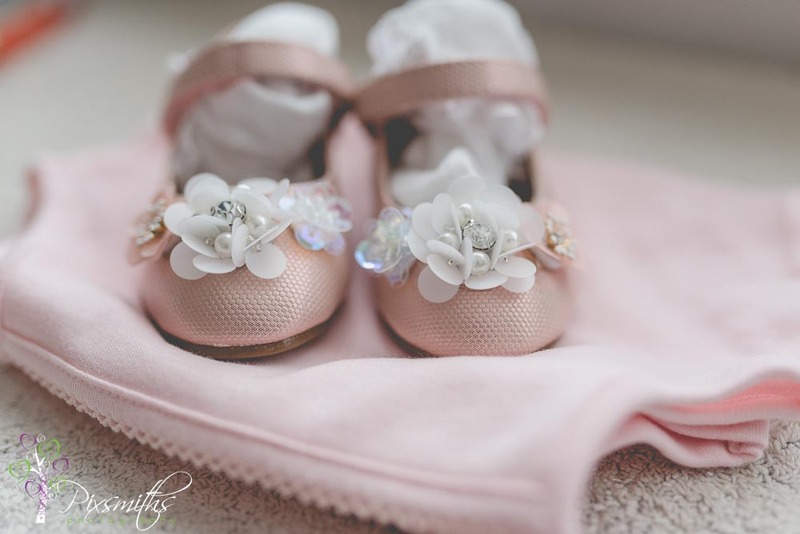 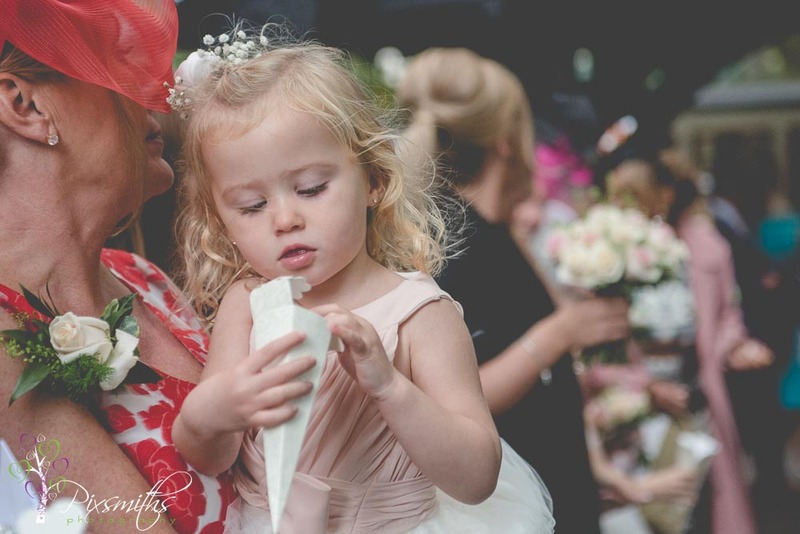 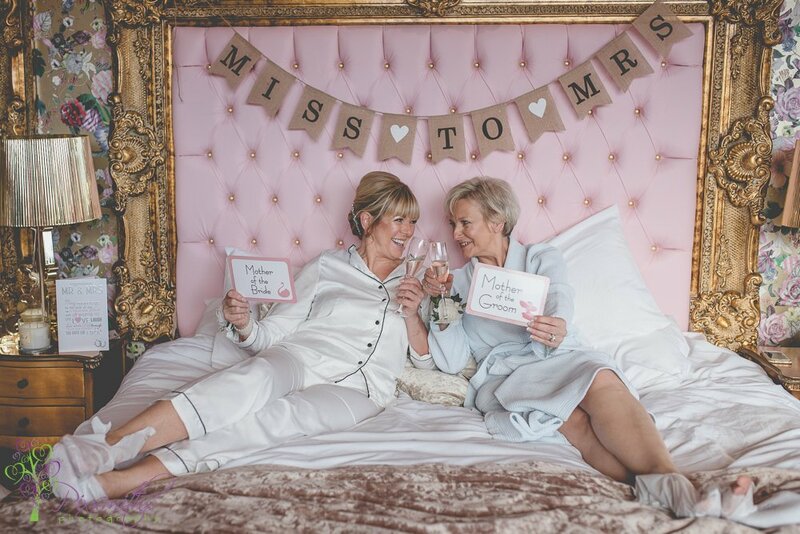 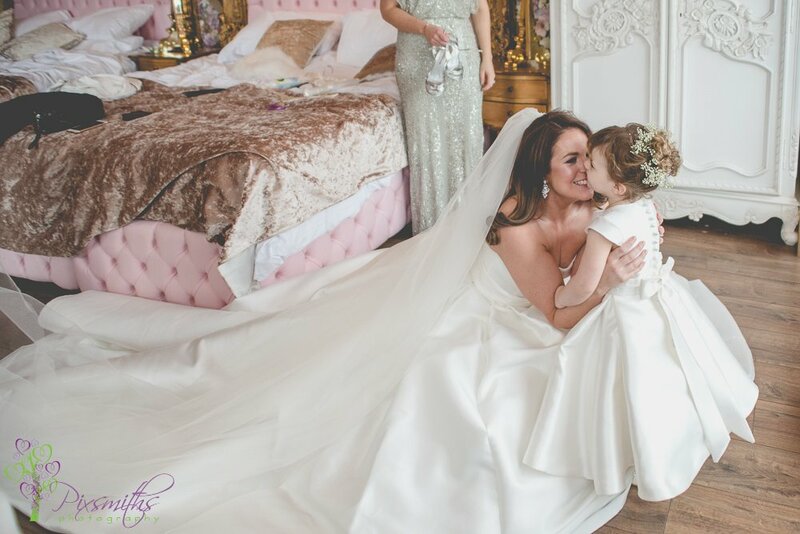 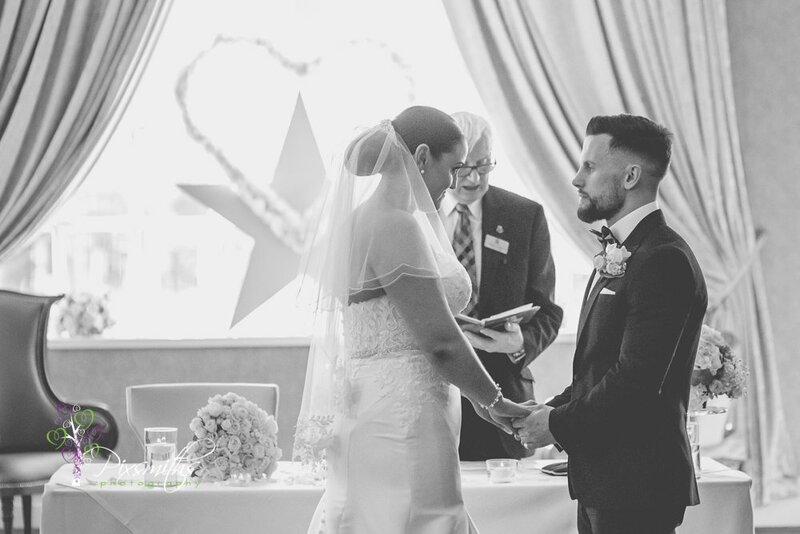 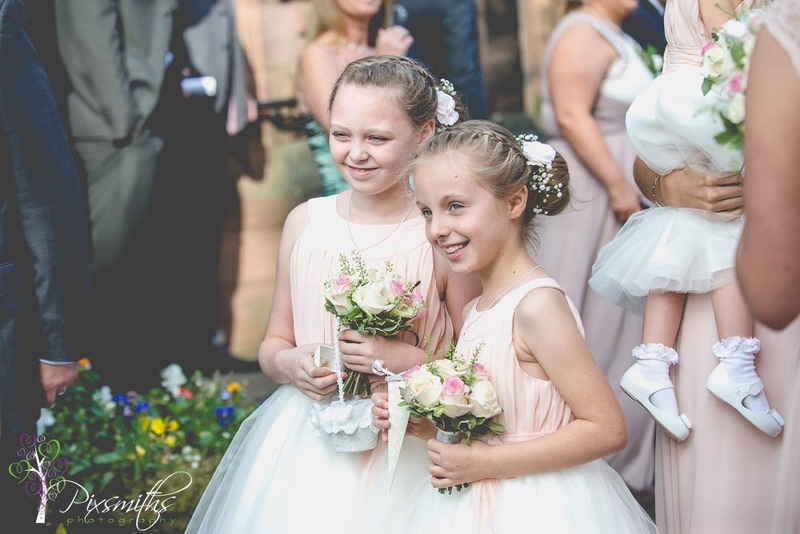 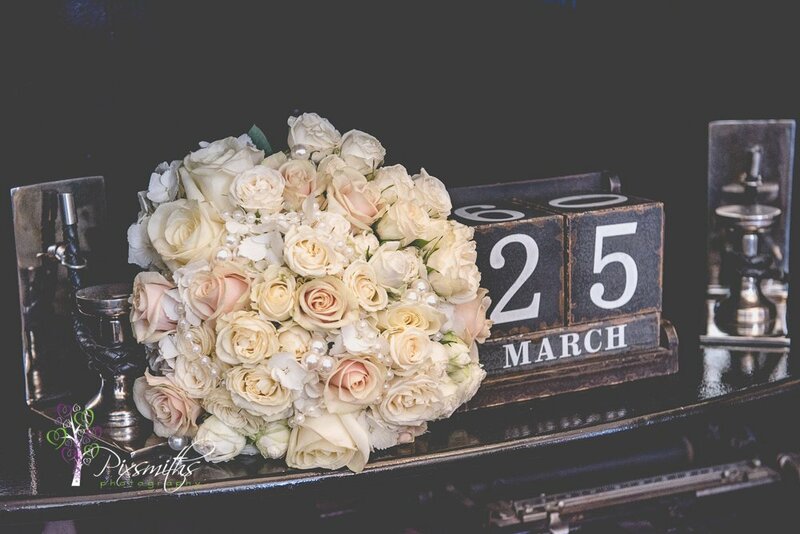 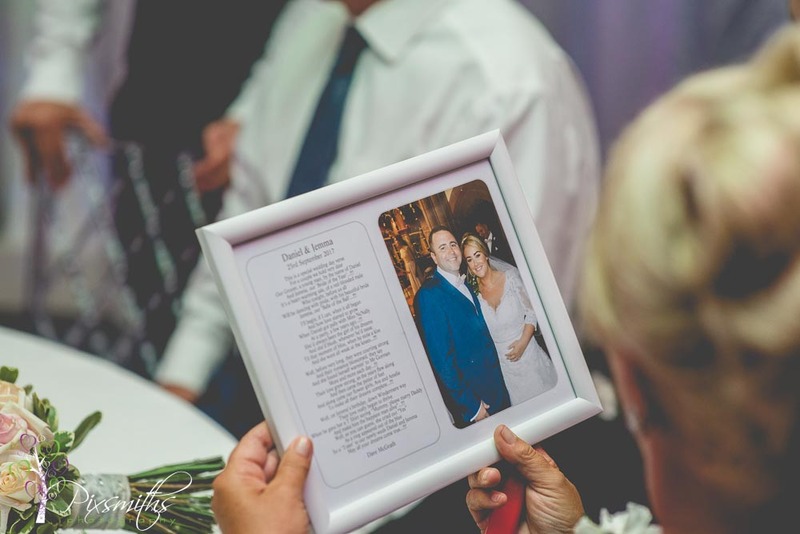 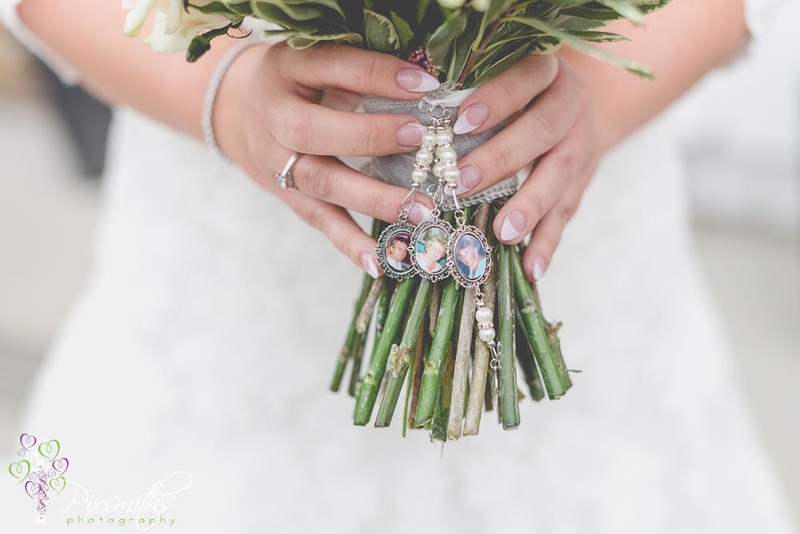 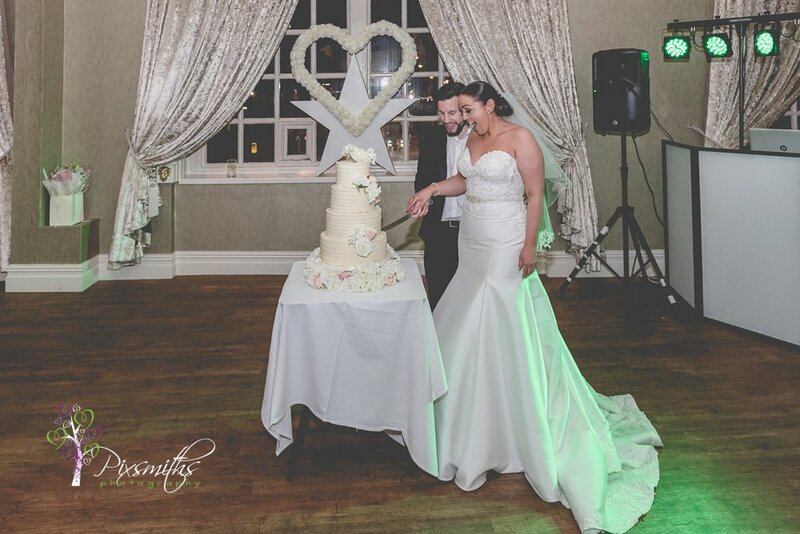 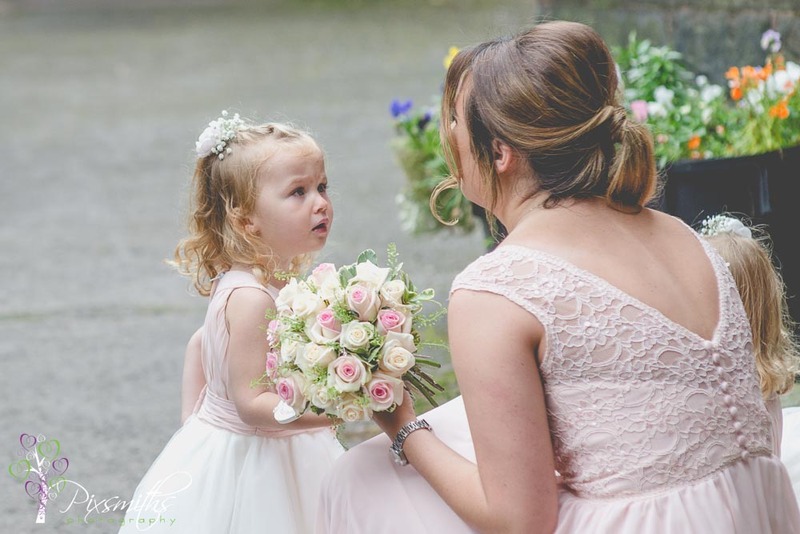 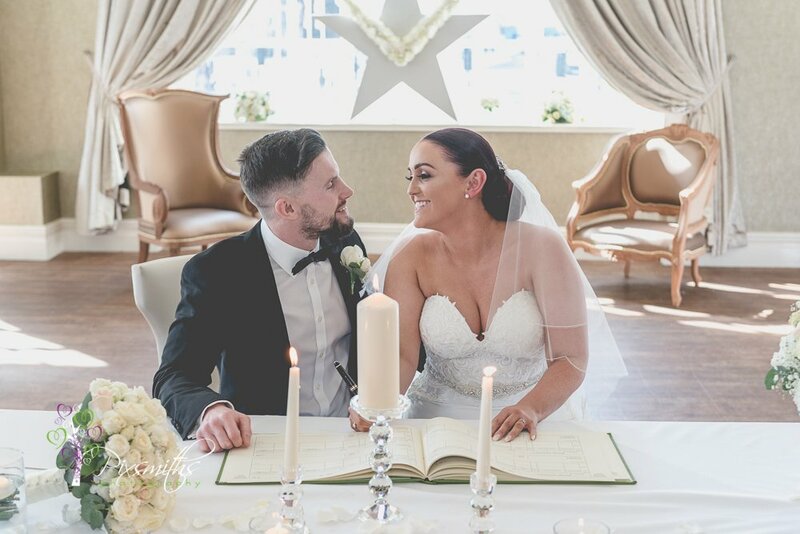 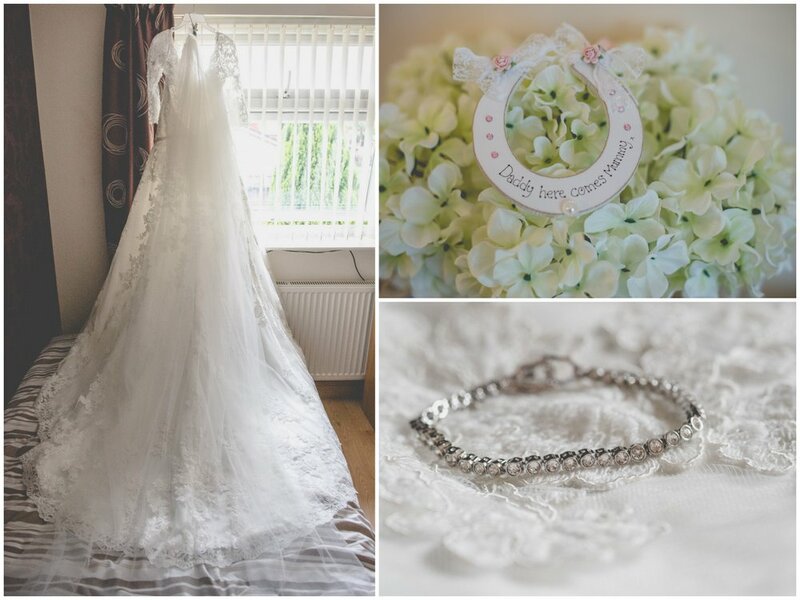 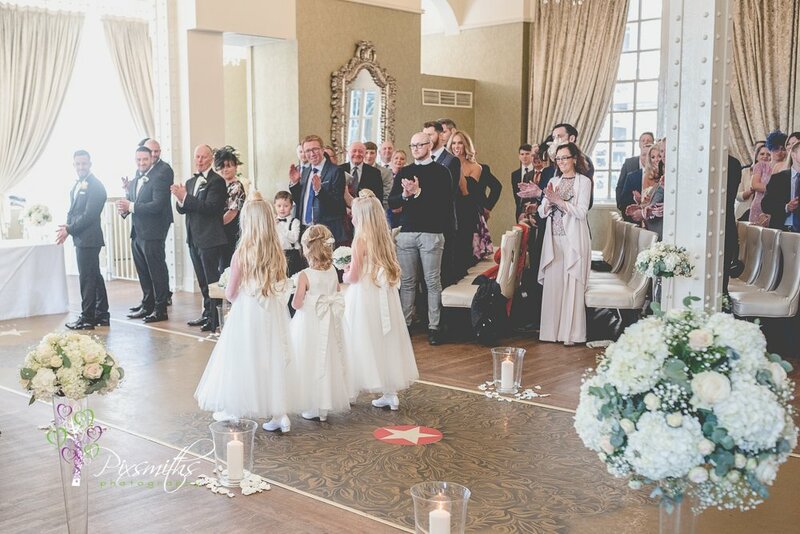 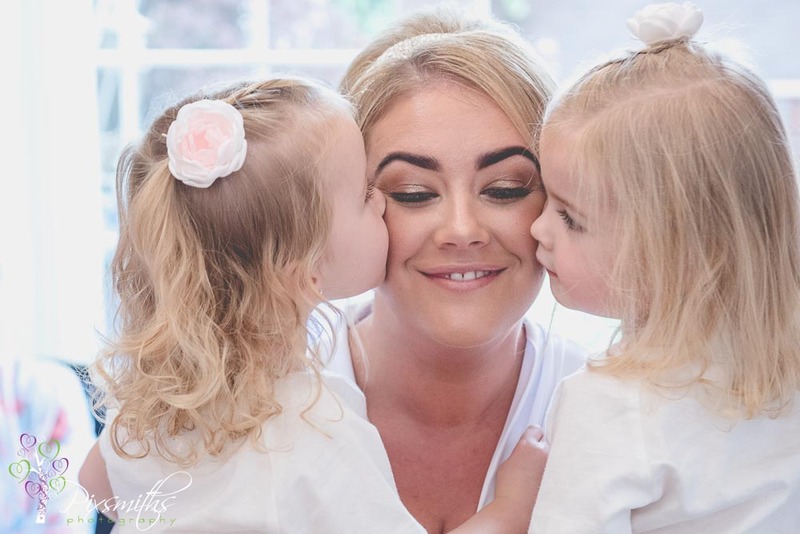 The white star and ivory heart frame made for an elegant backdrop – supplied by Penelope Petal. 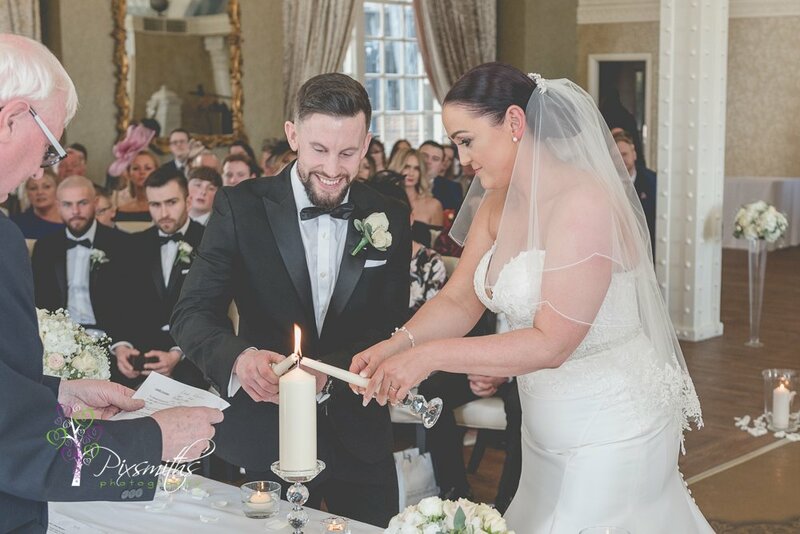 A well thought out ceremony with the two mothers lighting candles that Rob and Rebecca would use to light their larger central one. 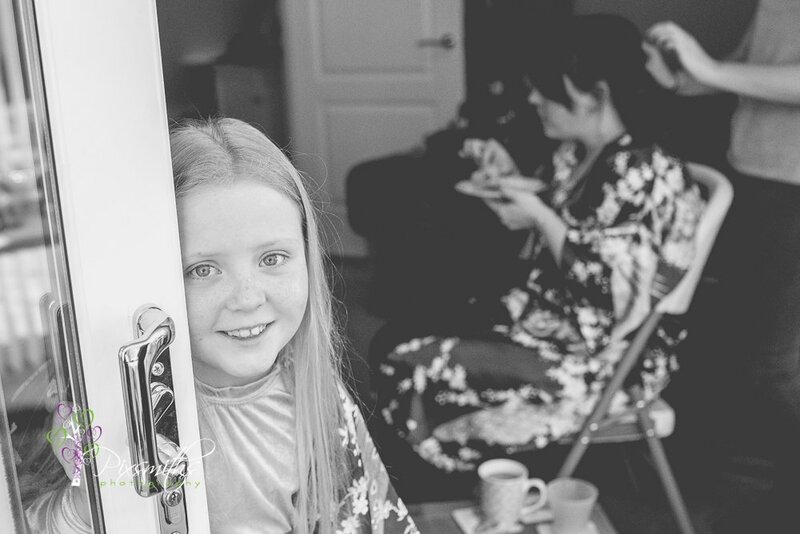 Close friends read poems – fittingly for Rebecca’s love of dinosaurs one was the dinosaur poem. 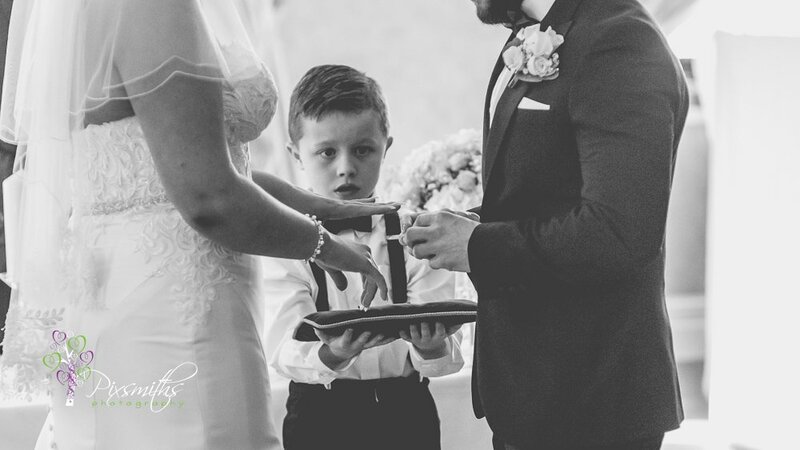 Rebecca’s nephew carefully carried handed over the rings, the look of concentration of his face as he watched was a picture! 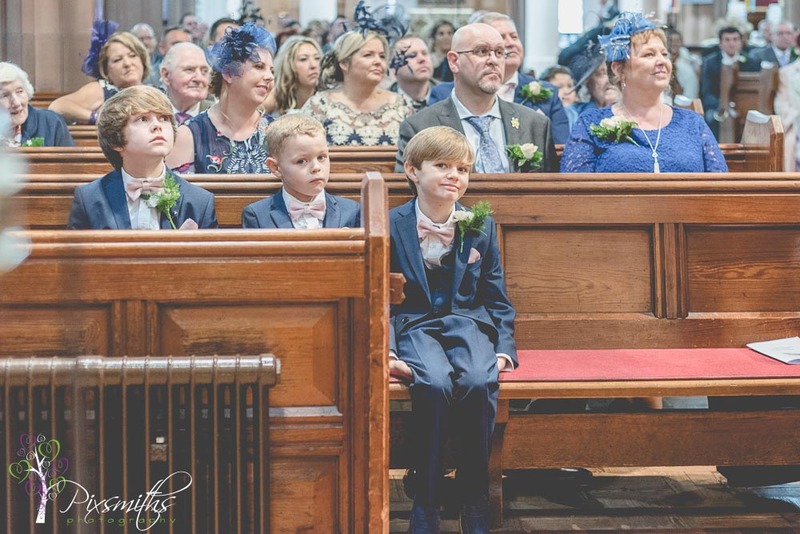 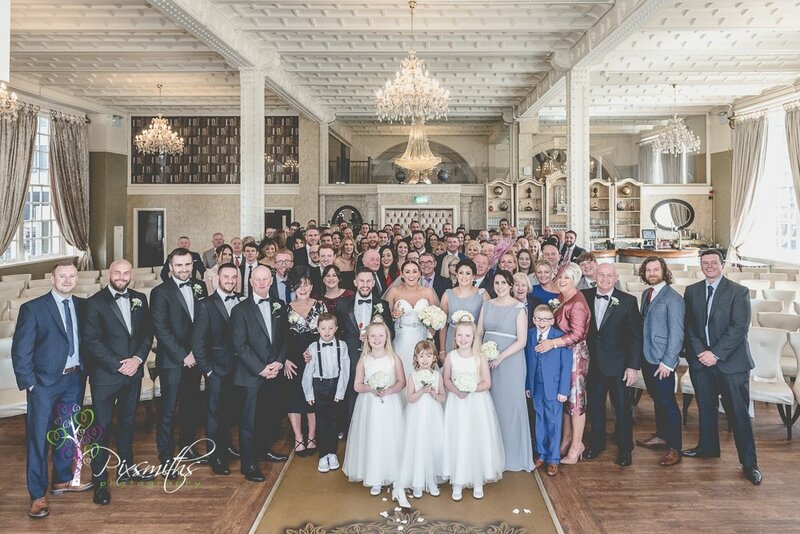 With over a hundred guests and very harsh sunlight on the steps it was more practical to do the large group indoors followed by a few family formals. 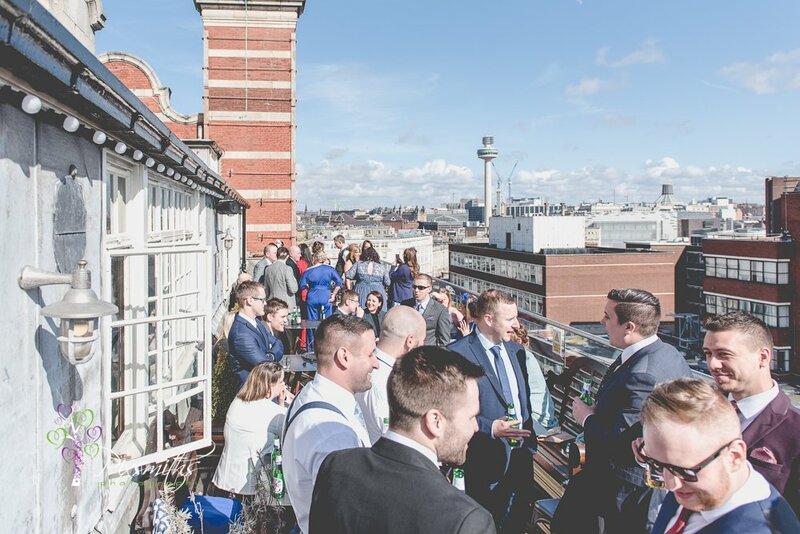 With reception drinks being upstairs in the Carpathian lounge, to allow for room turnaround, it makes sense to let people go when their groups are finished with. 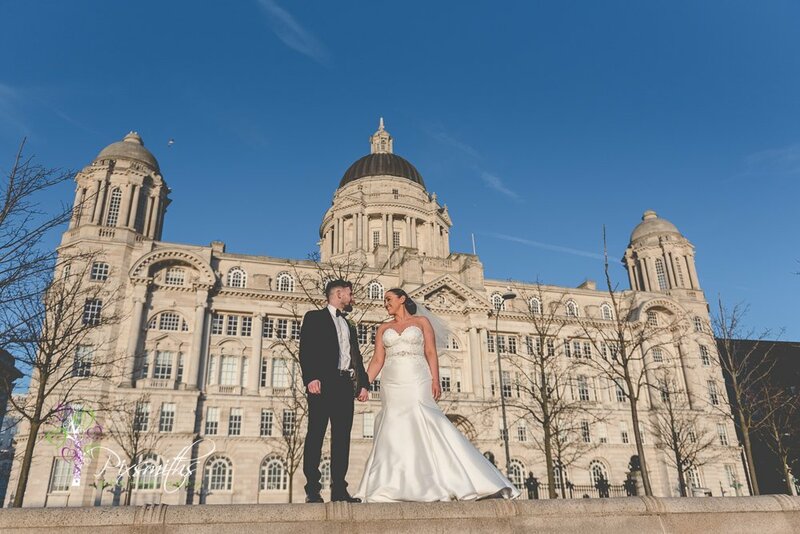 Rob and Rebecca love the city scene so Liverpool city centre portraits were our next port of call. 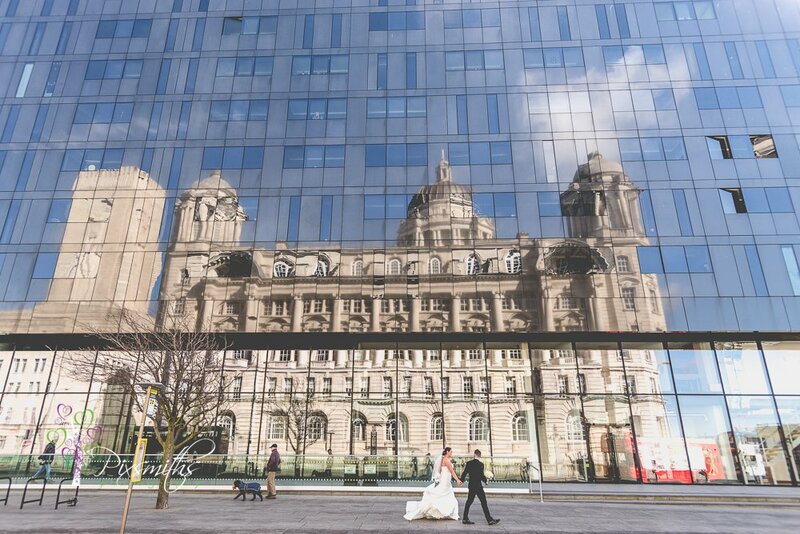 The Three Graces were splendidly lit up in the bright sunshine for some gorgeous backdrops and a bus driver very kindly drove around the block so we could capture a memorable reflection in Mann Island buildings. 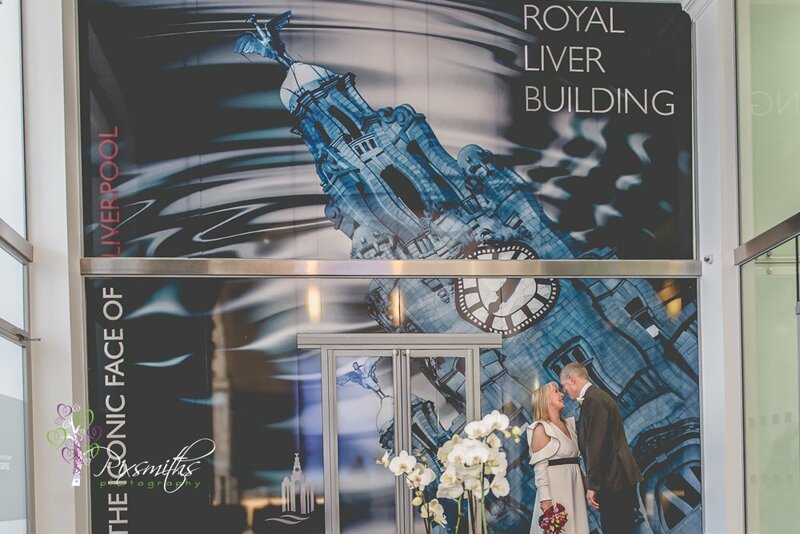 How amazing are the liverpudlians! 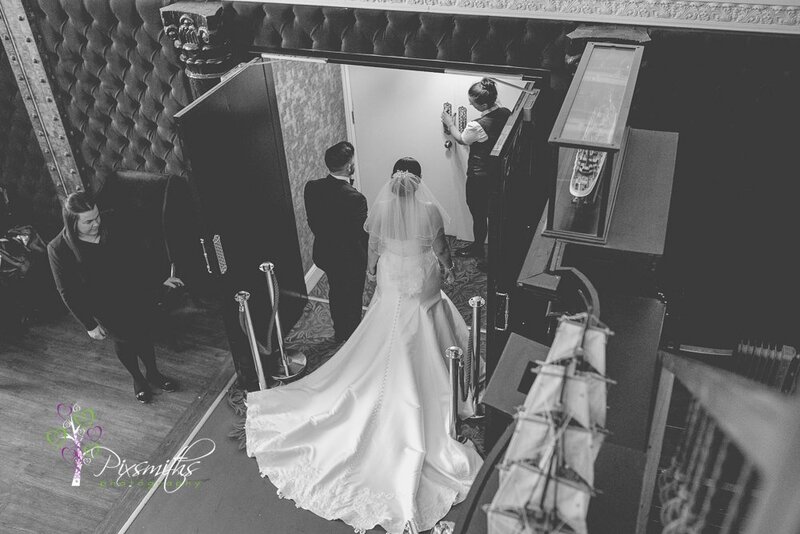 Soon it was time to head back to join the guests for some mingling time before the speeches and grab a few shots on the balcony with the dock views. 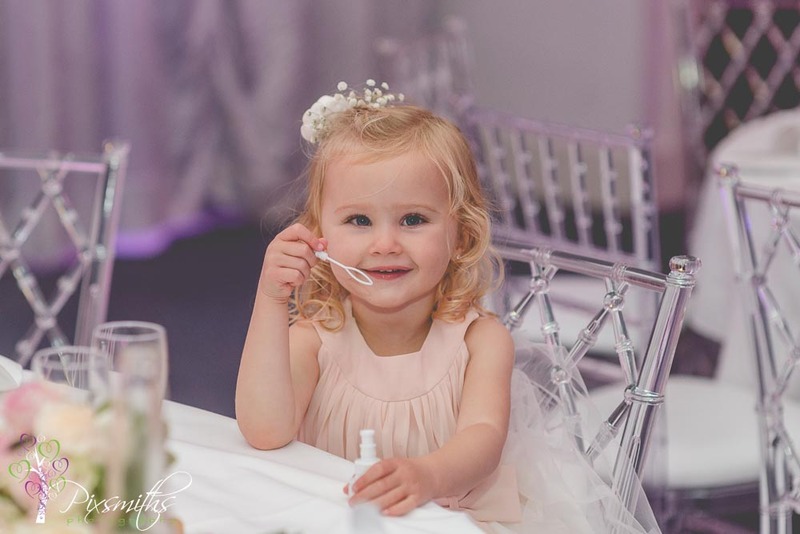 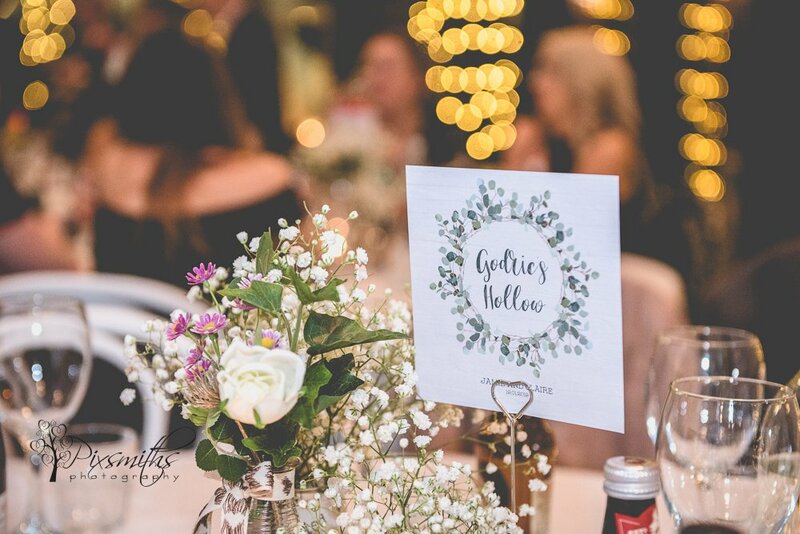 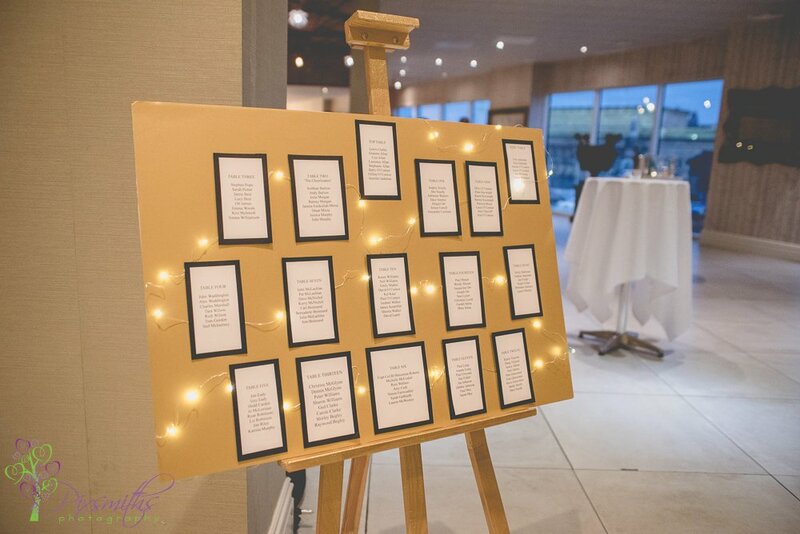 The reception are looked fabulous the tables had favours of cupcakes, the table names were dinosaurs and names or guests pettily set out in a pearl encrusted frame on each table. 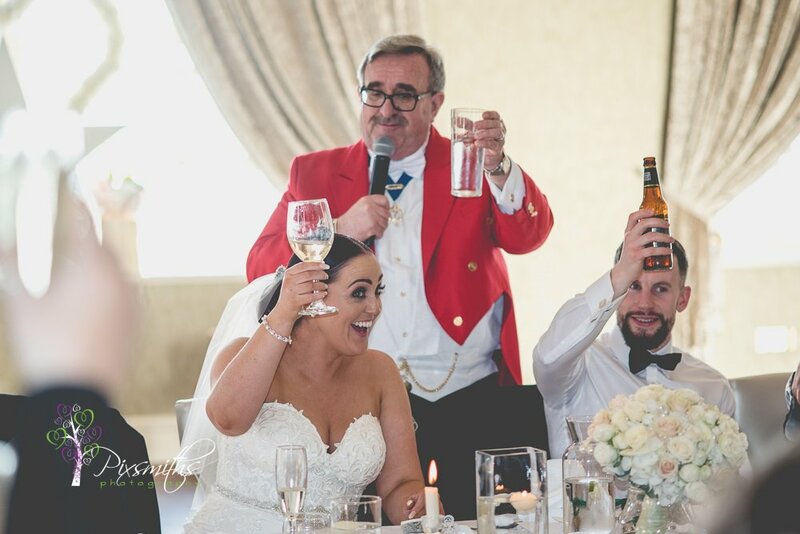 With father of bride, groom three best men, toastmaster and bride speeches we were well entertained before the meal was served. 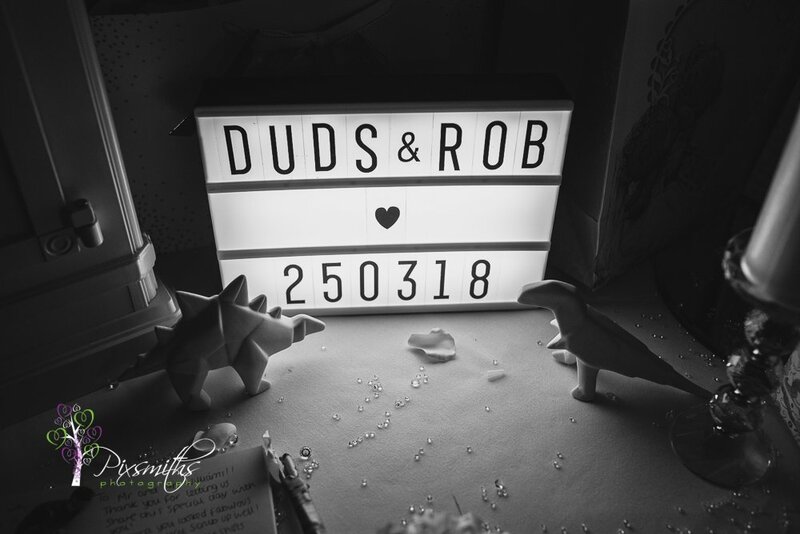 A neat touch were the dinosaur pens ( a gift from two friends) for the guest signing book. 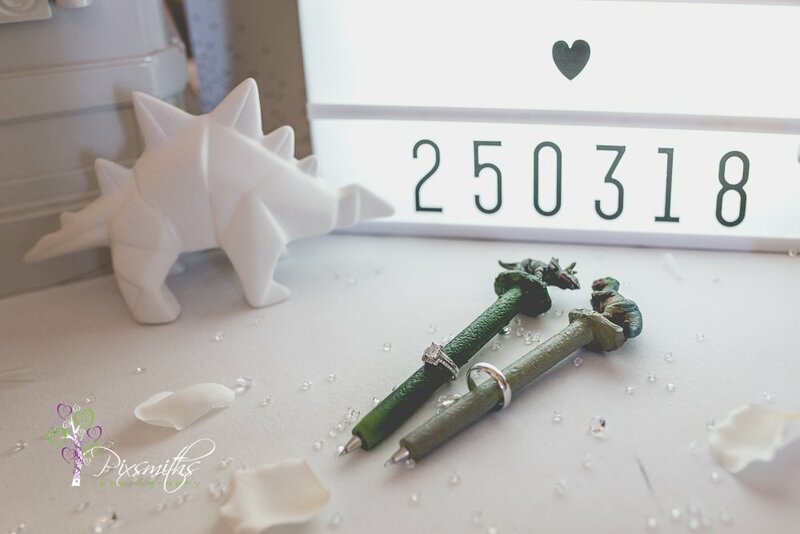 Together with the light up box with their names and date, teh pens made for a unique wedding ring shot. 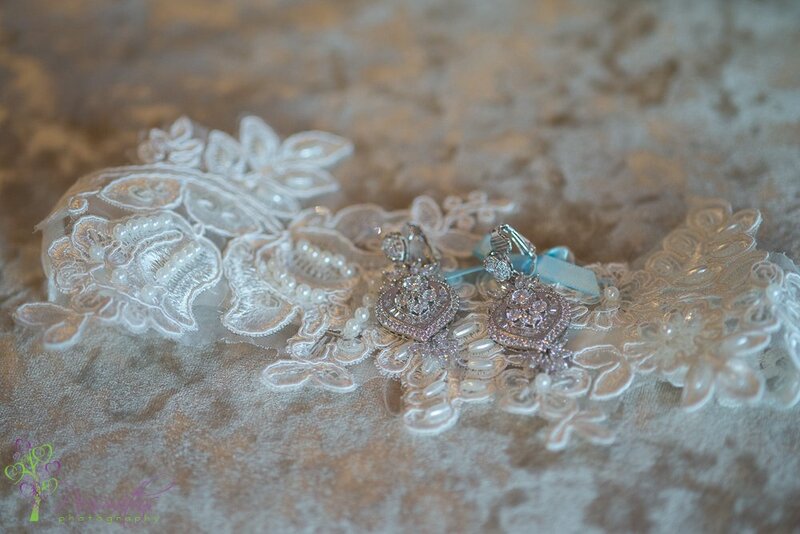 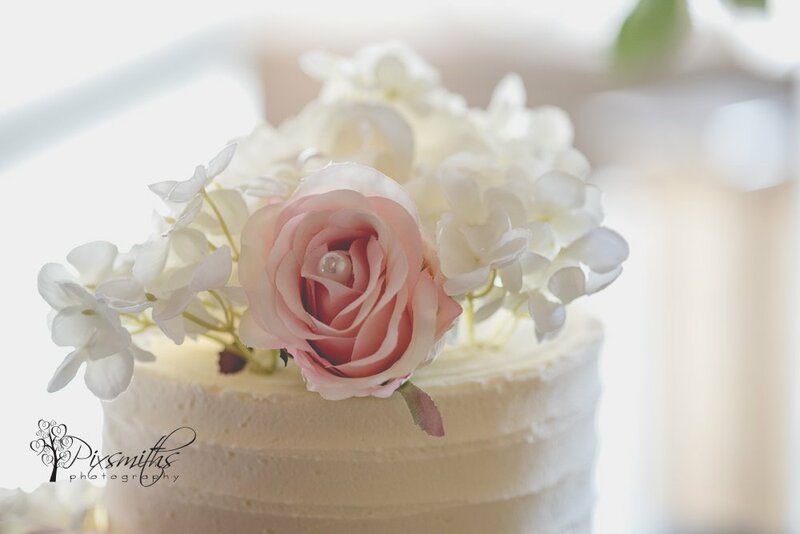 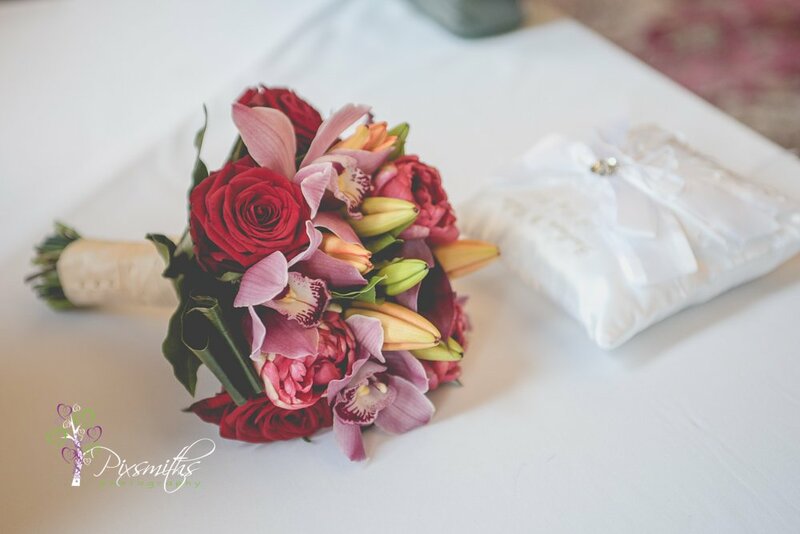 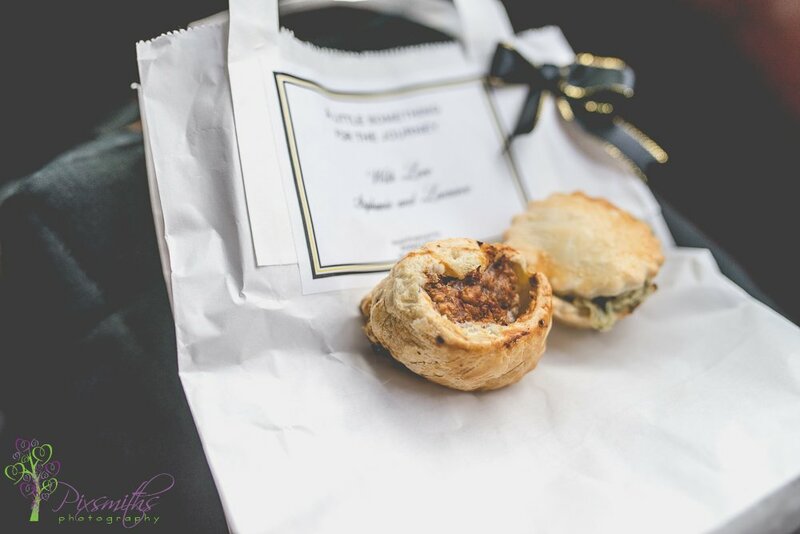 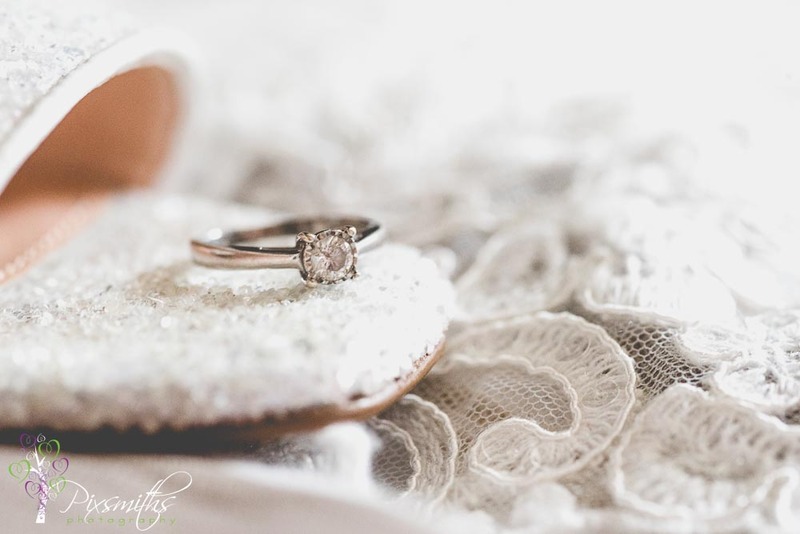 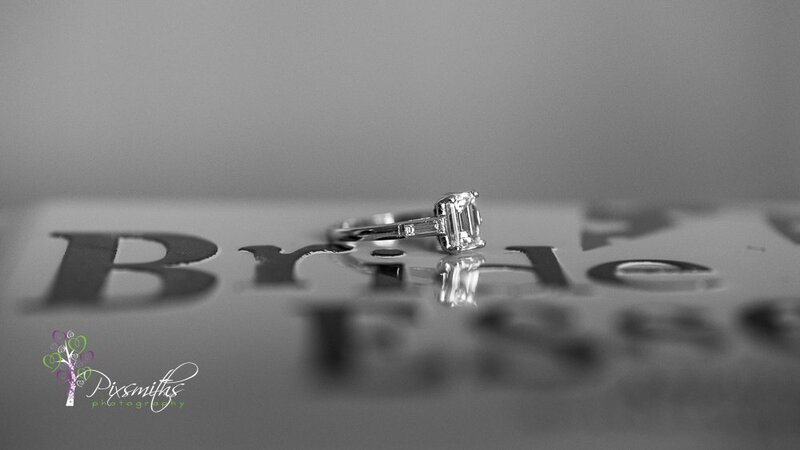 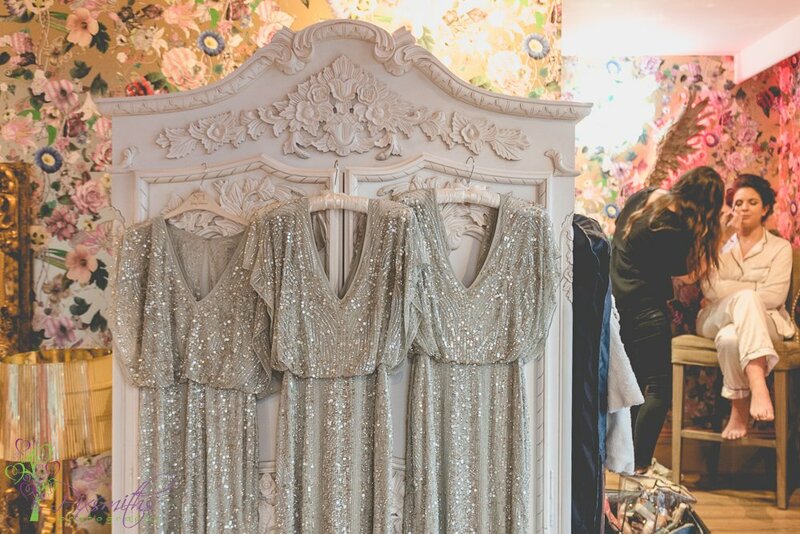 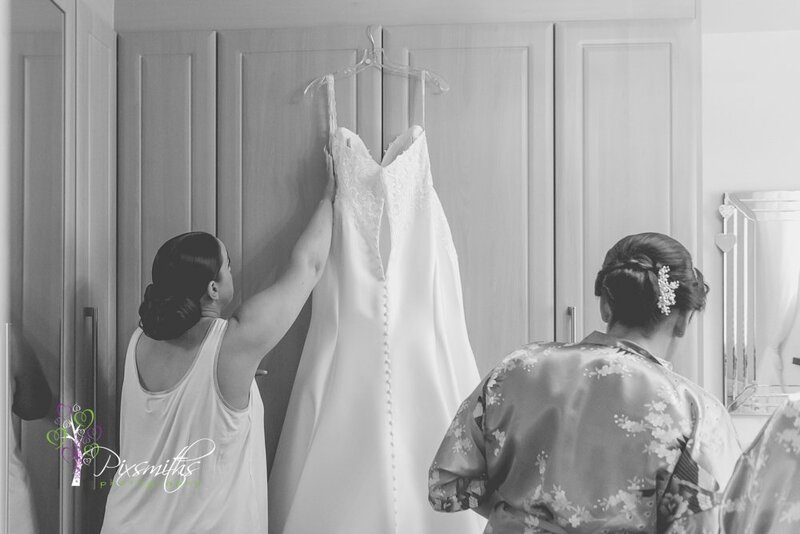 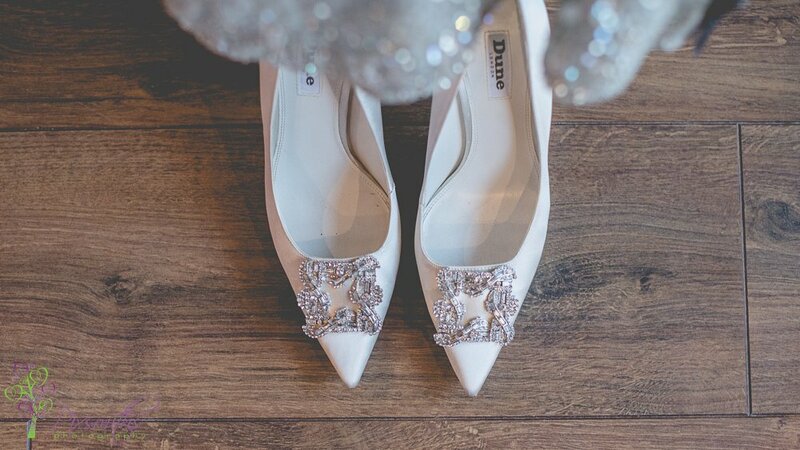 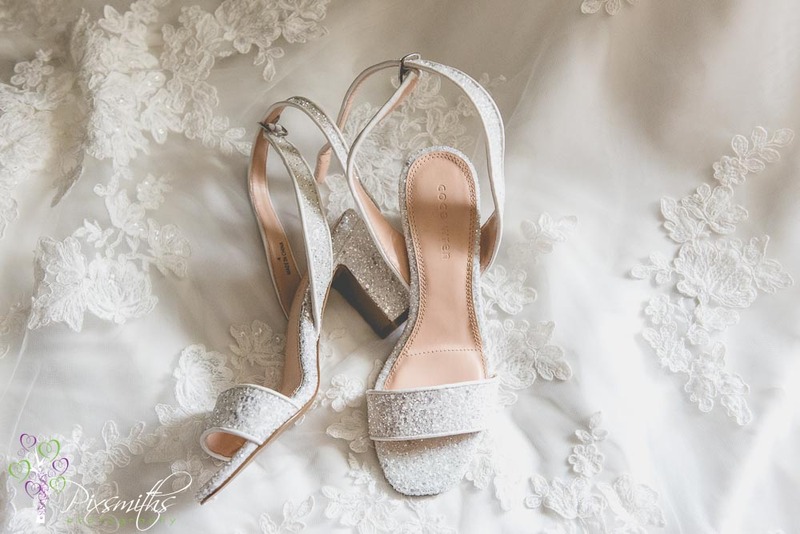 We love to incorporate a feature from teh wedding details. 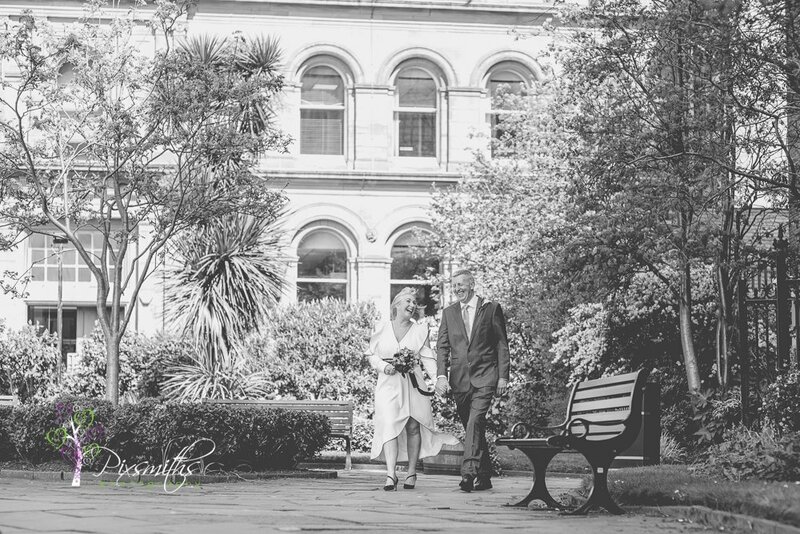 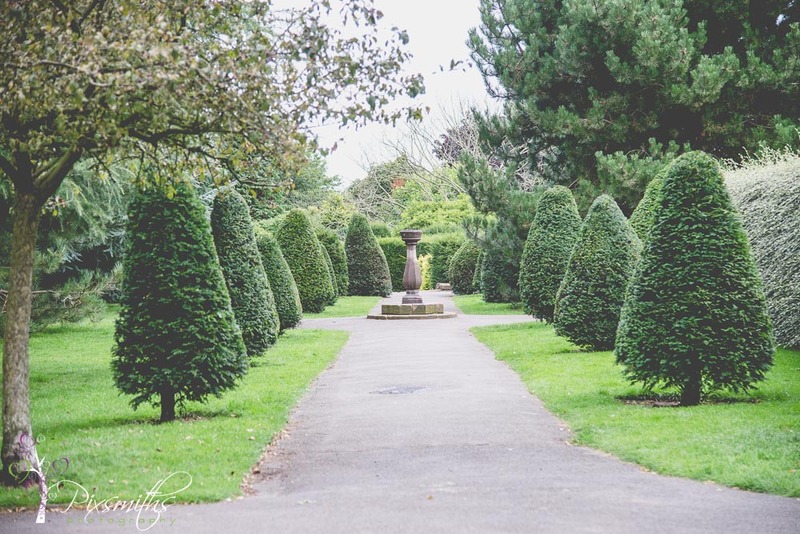 A stroll for some fresh air and a few more city centre portraits and then party time! 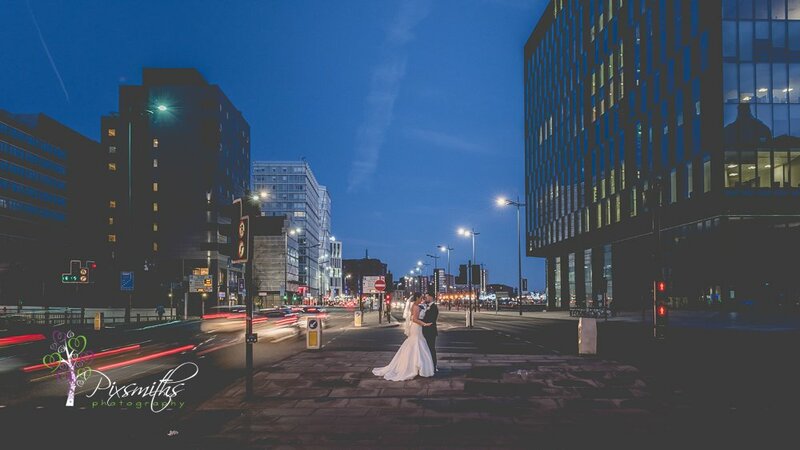 …well except for popping out to capture some light trails that Rob and Rebecca had requested at our initial meeting. 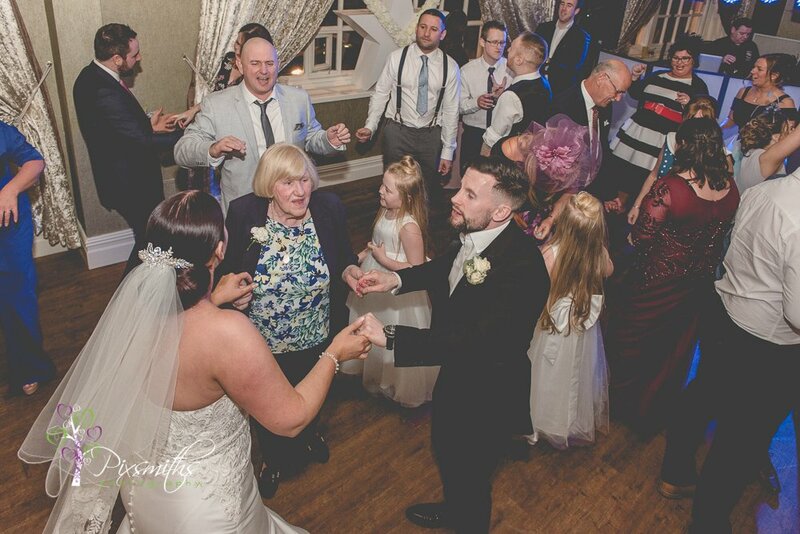 Great to see the dance floor busy and guests trying out the new Floss dance! 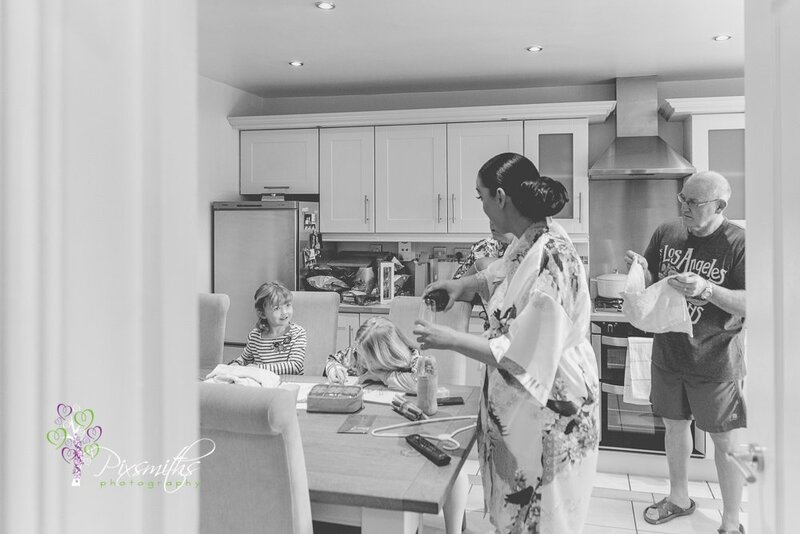 Rowing boat trip in the lake district and Daniel asks Jemma to get something out of a bag. 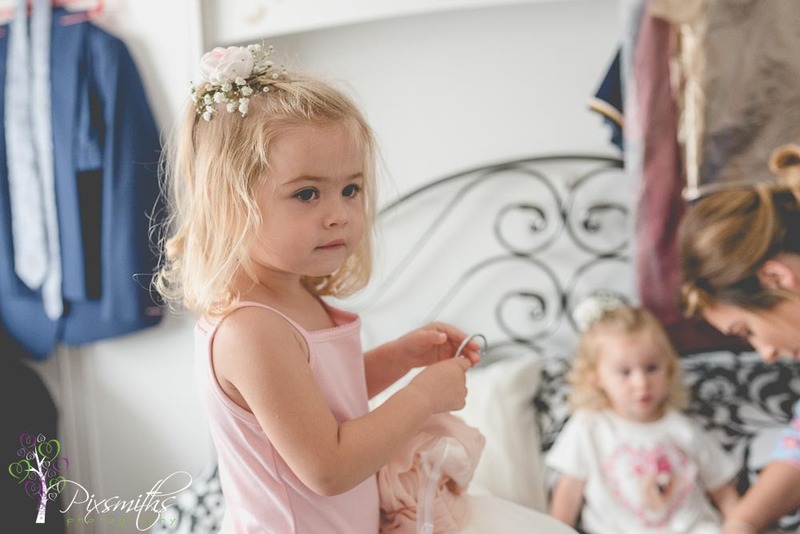 T-shirt from the twins saying “Mummy will you marry Daddy“? 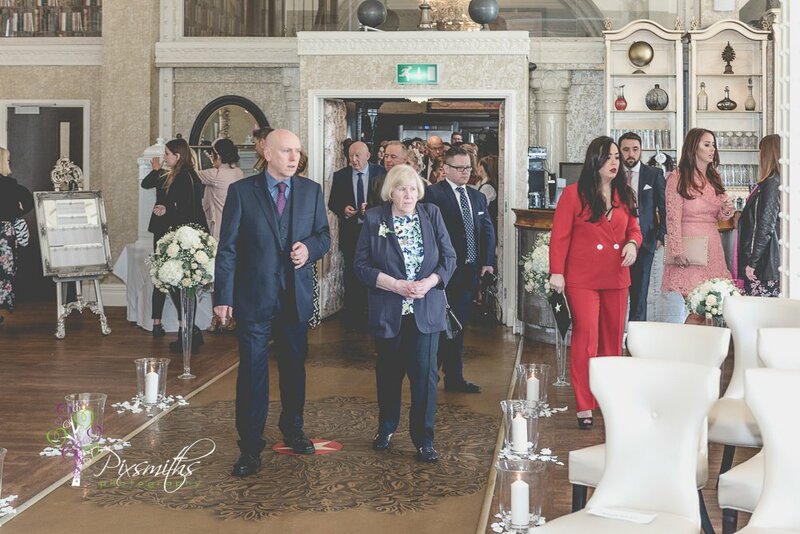 Soon all the guests were spilling outside to enjoy the sunshine. 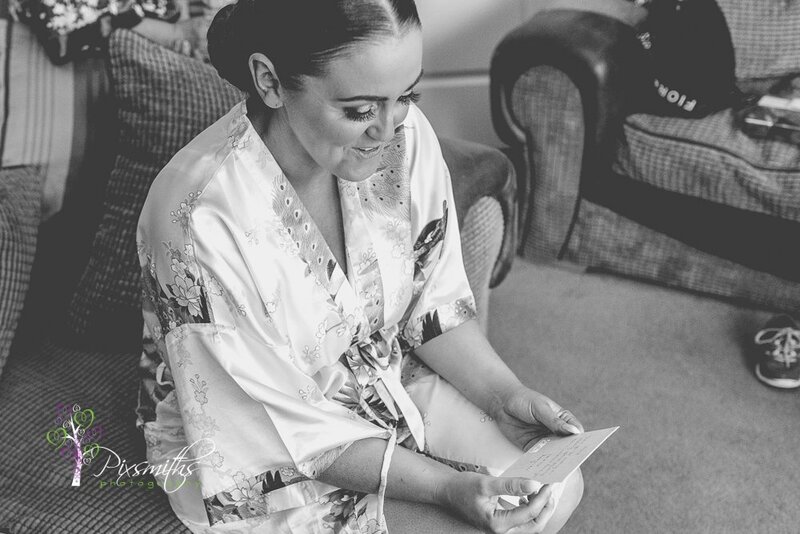 and to capture some gorgeous relaxed portraits for them. 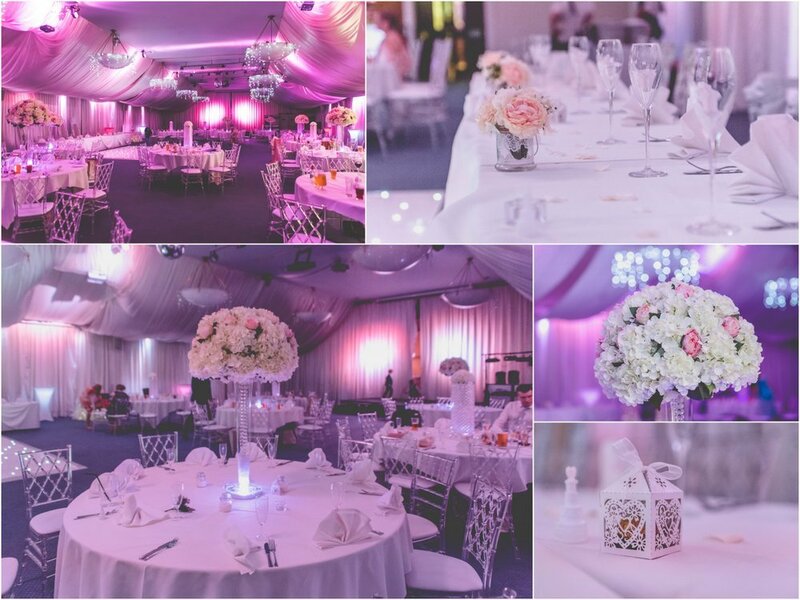 The room had lots of ambience with its purple/pink up lighting. 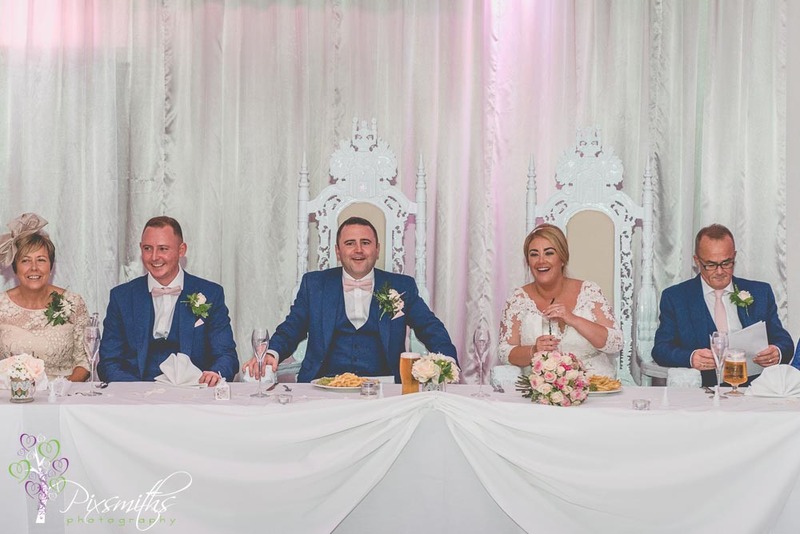 Jemma and Daniel looked like Royalty on their top table thrones too!